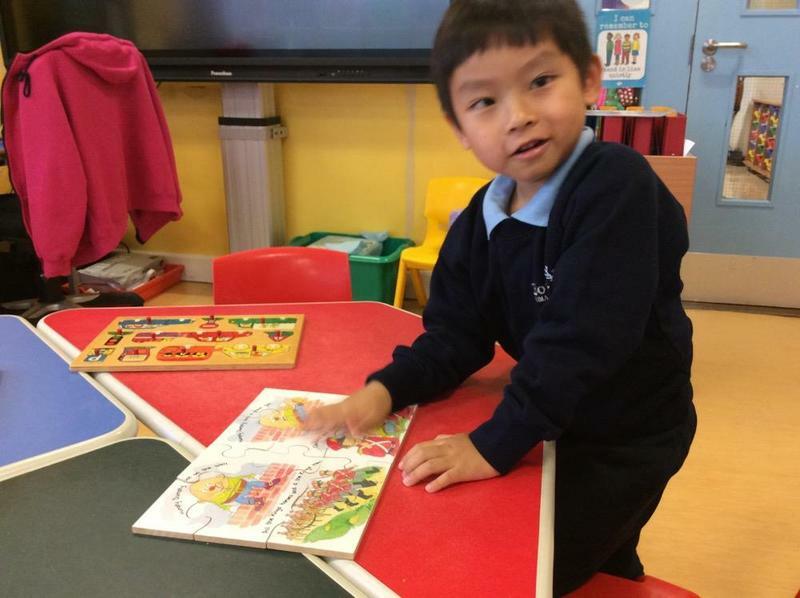 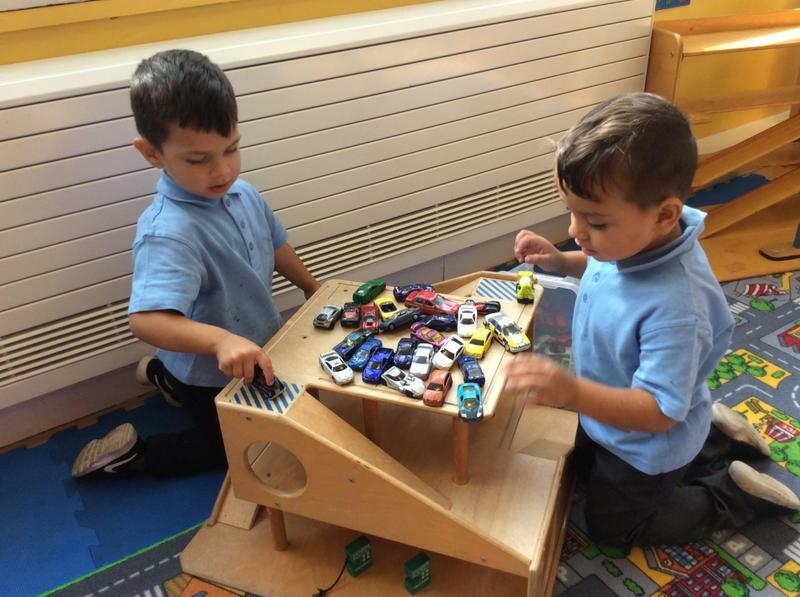 Welcome to a new year in nursery! 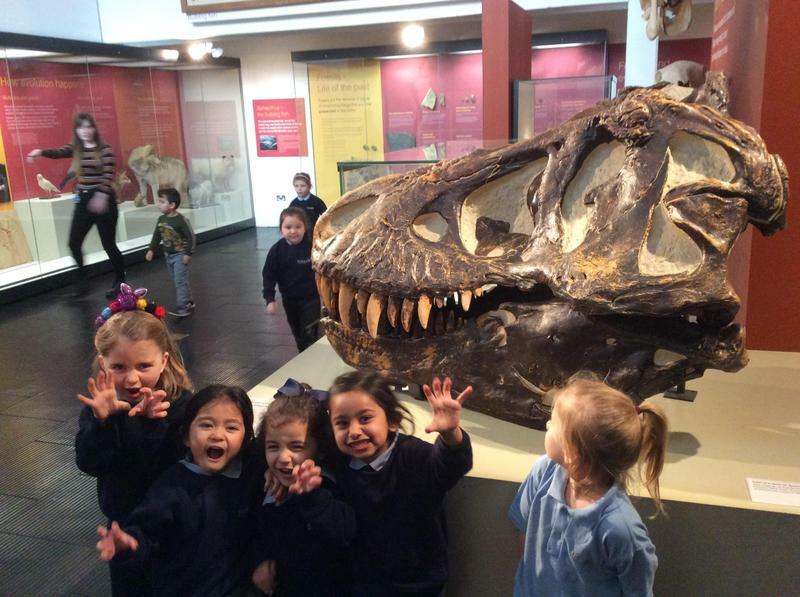 We have a fun filled and exciting year ahead of us, packed full of activites, visitors and trips. 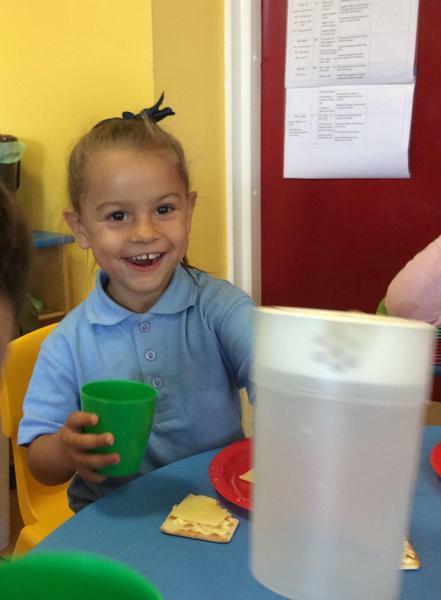 Keep checking our page for updates and photographs. 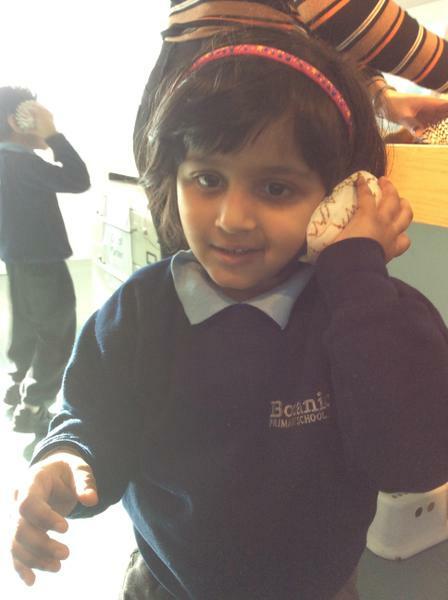 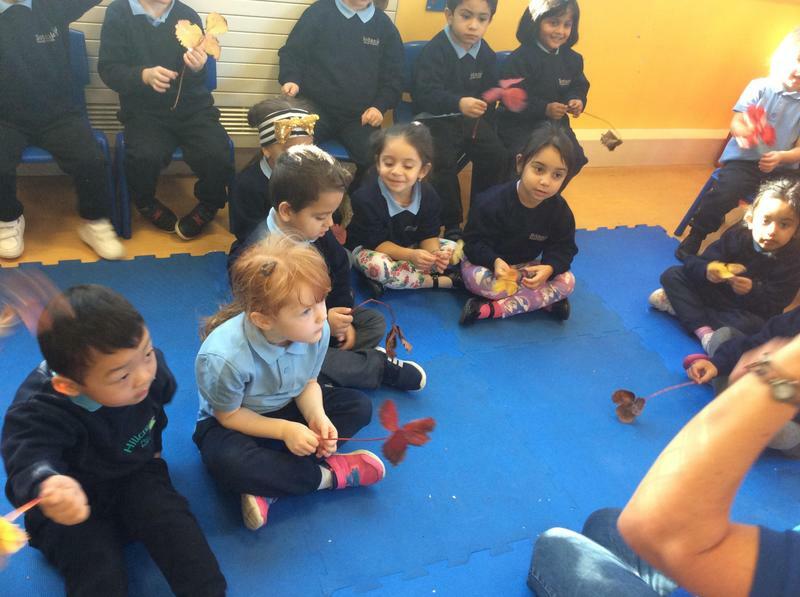 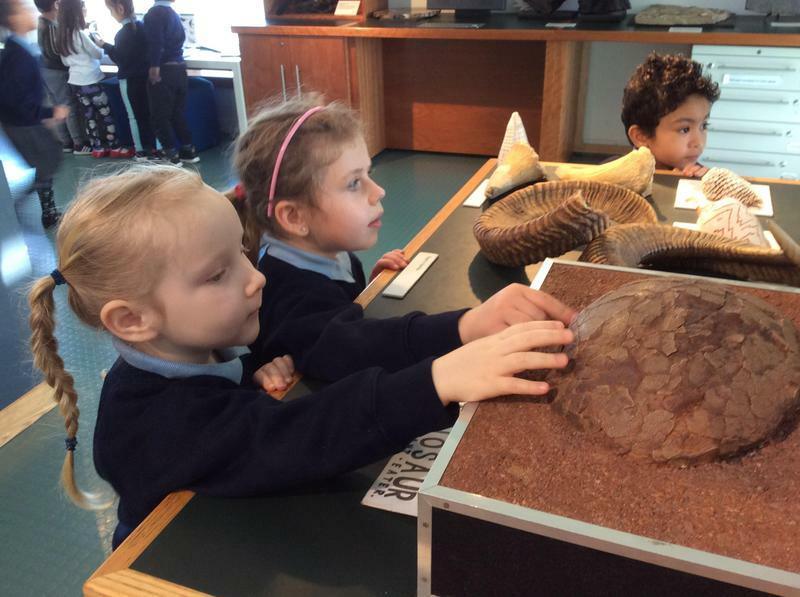 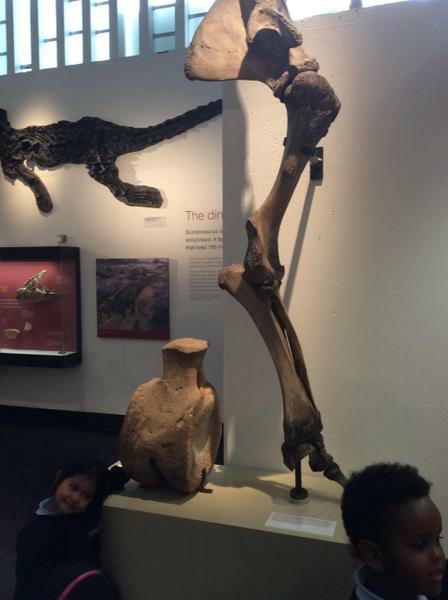 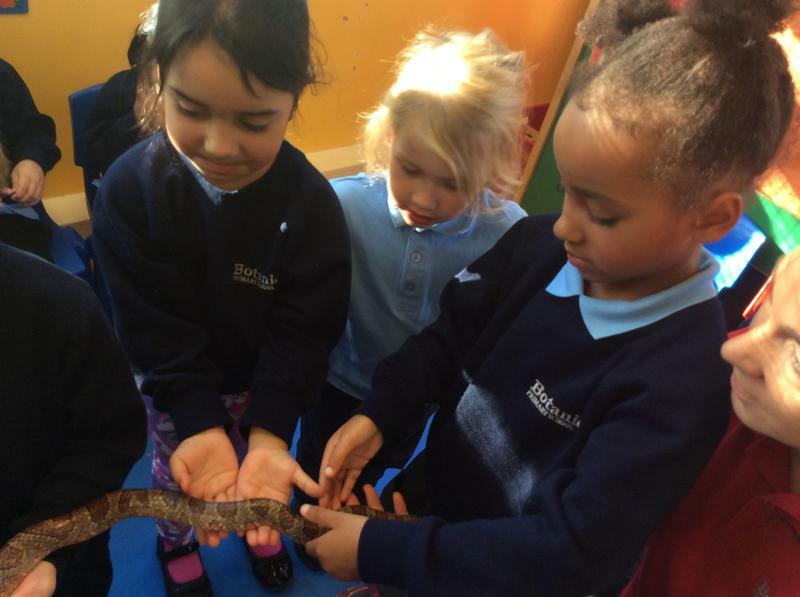 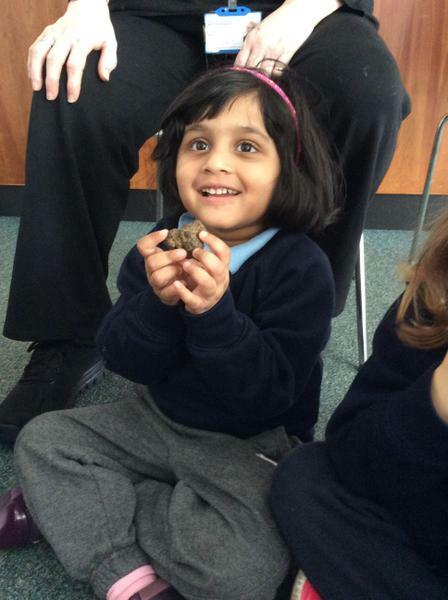 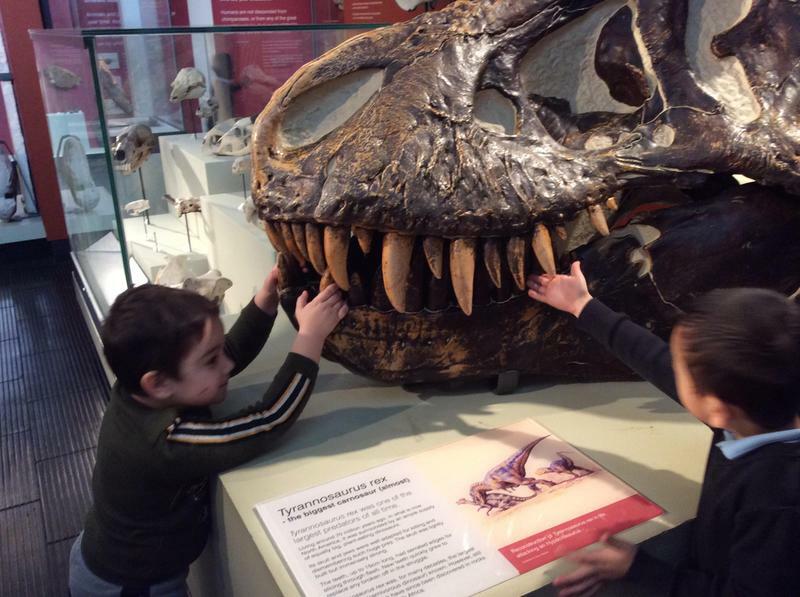 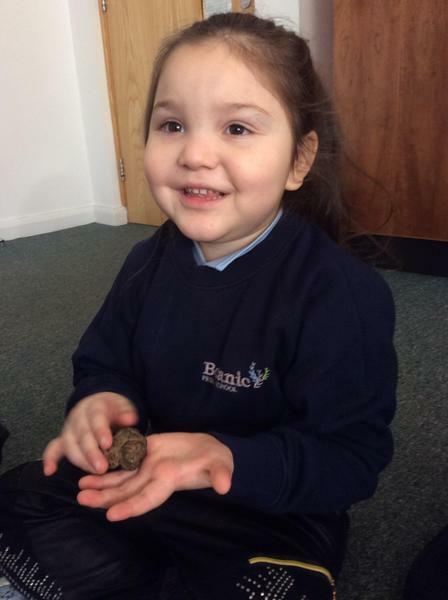 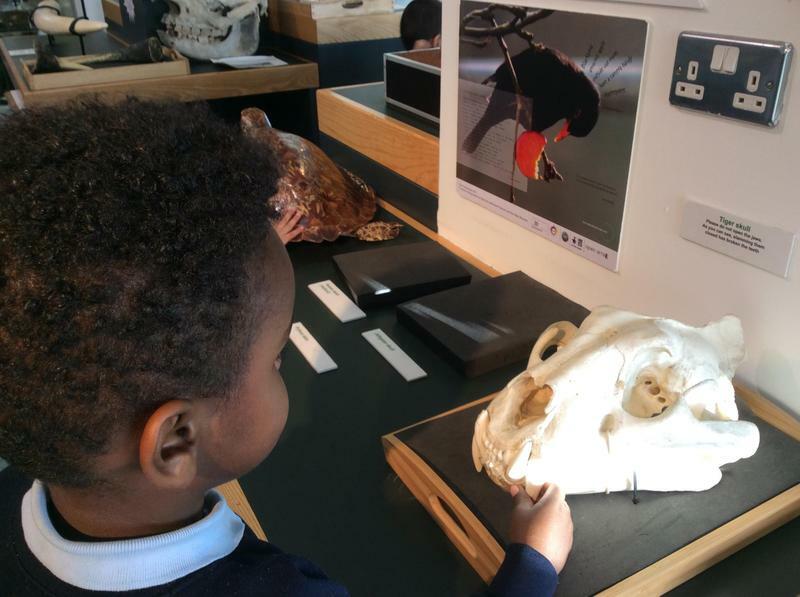 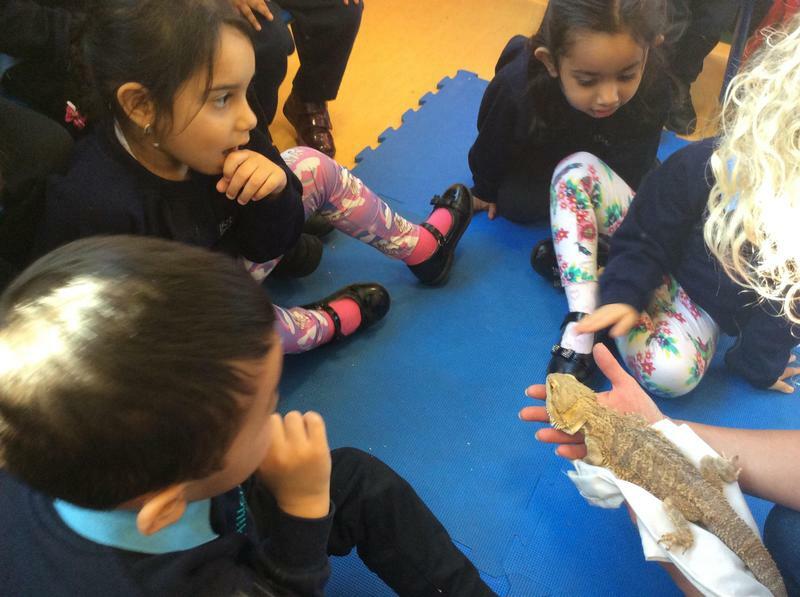 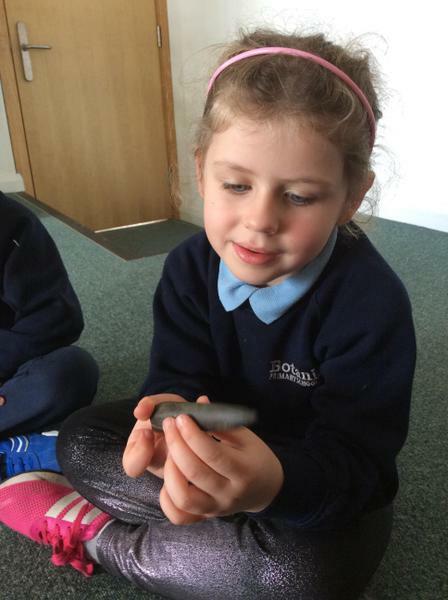 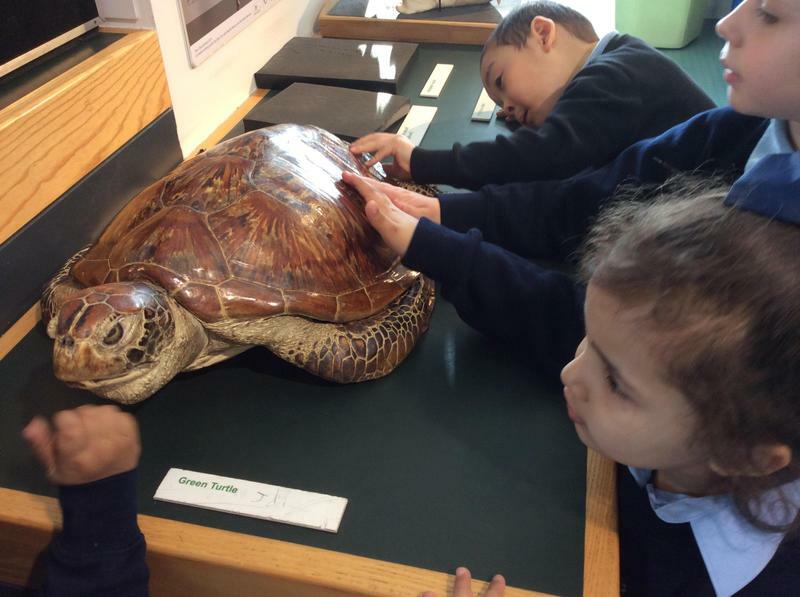 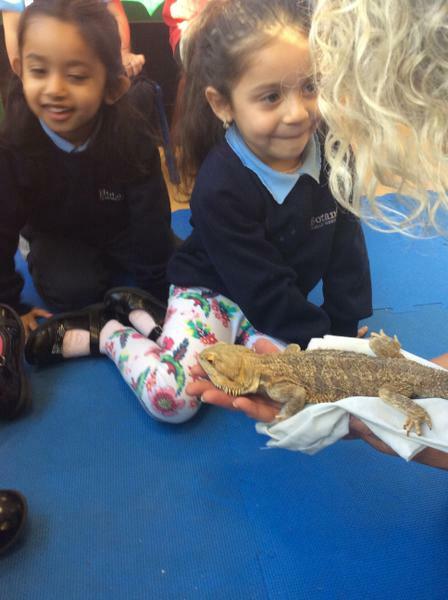 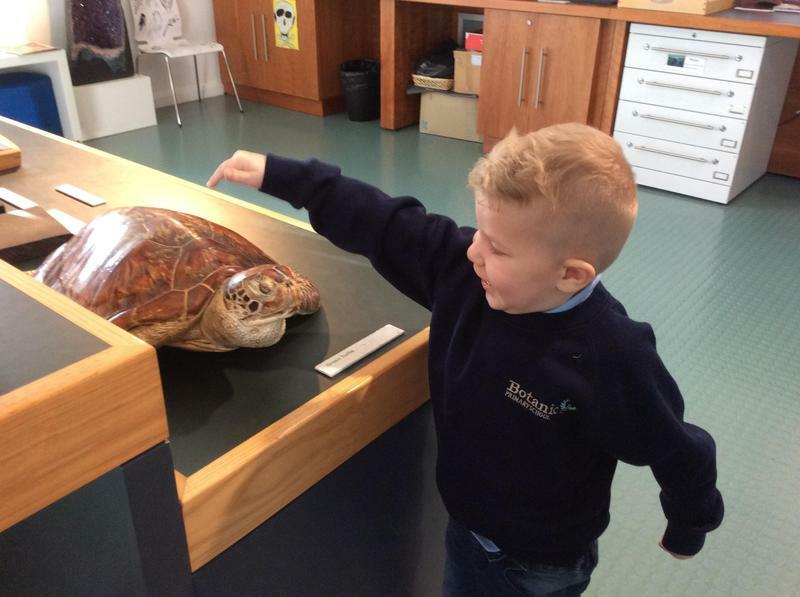 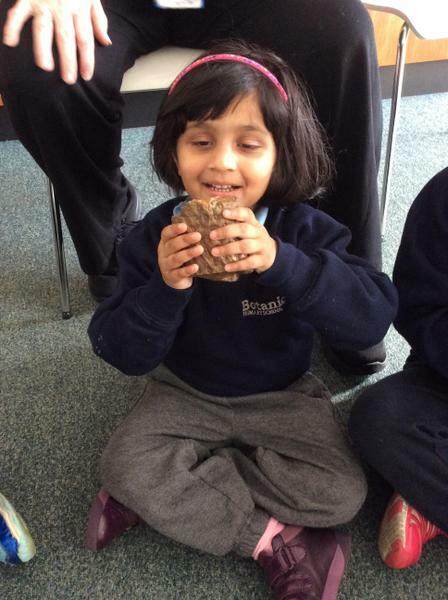 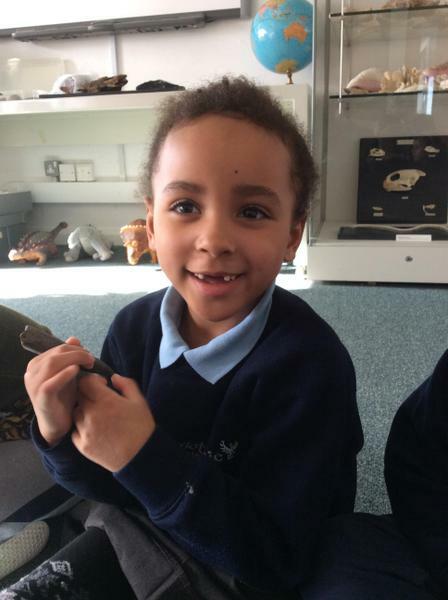 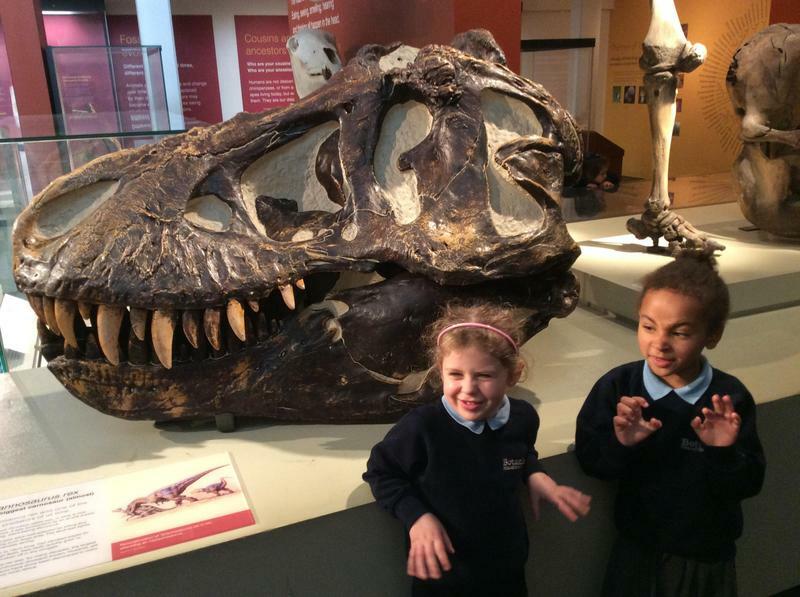 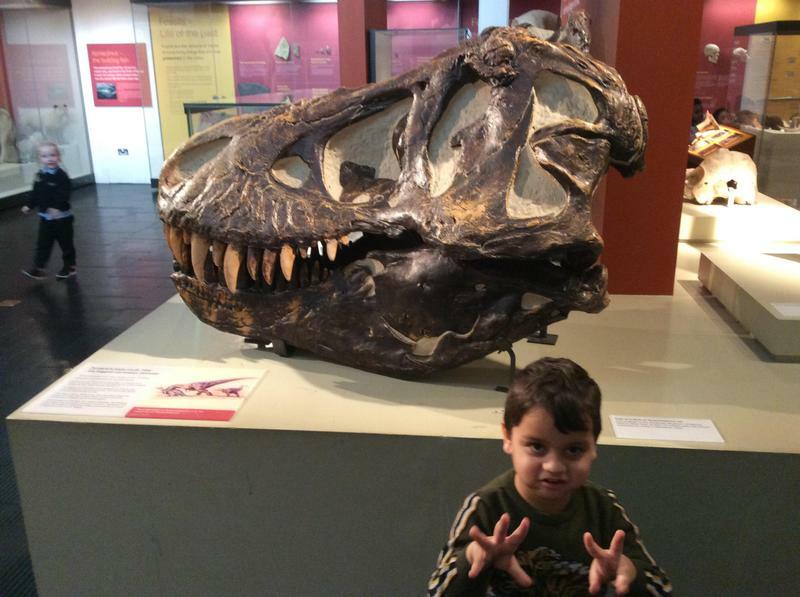 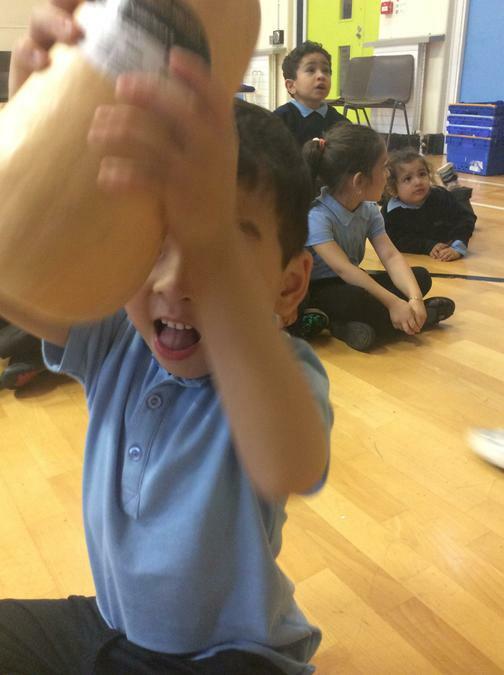 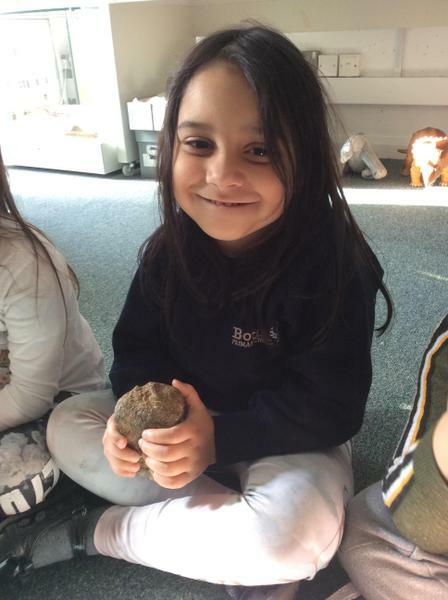 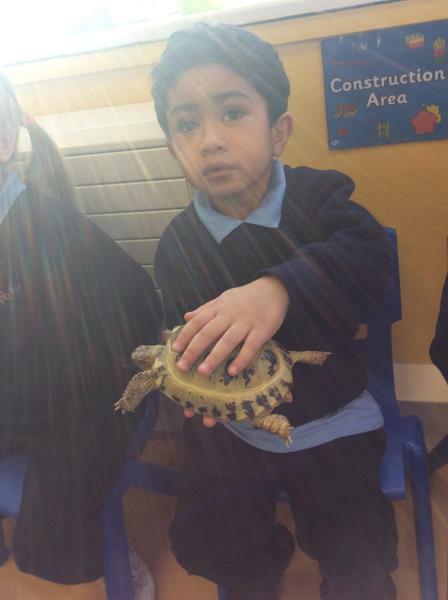 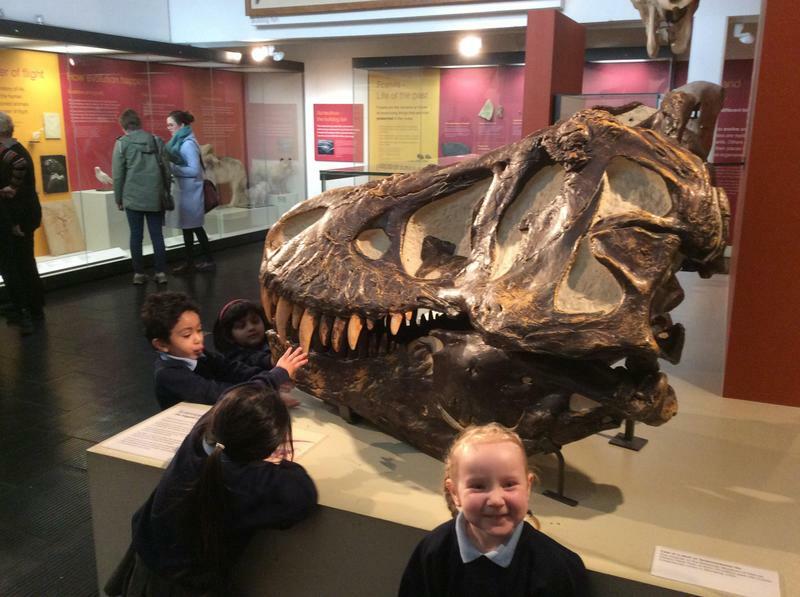 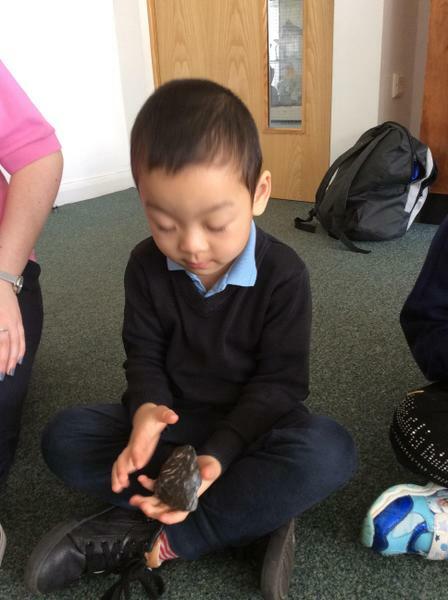 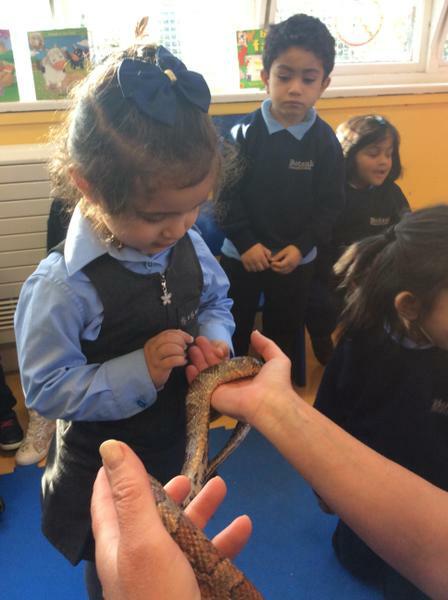 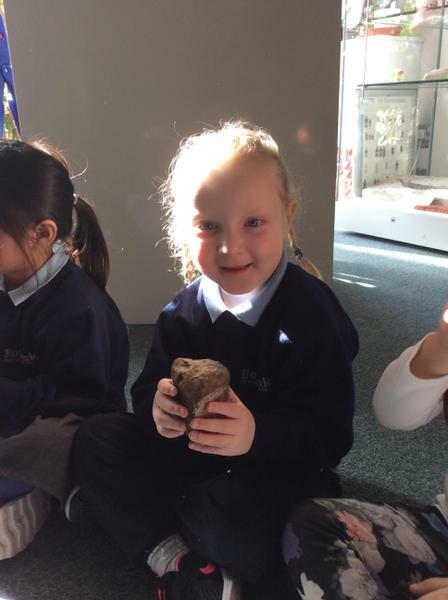 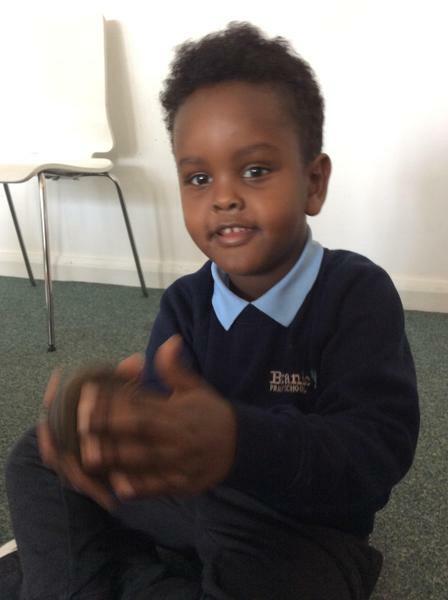 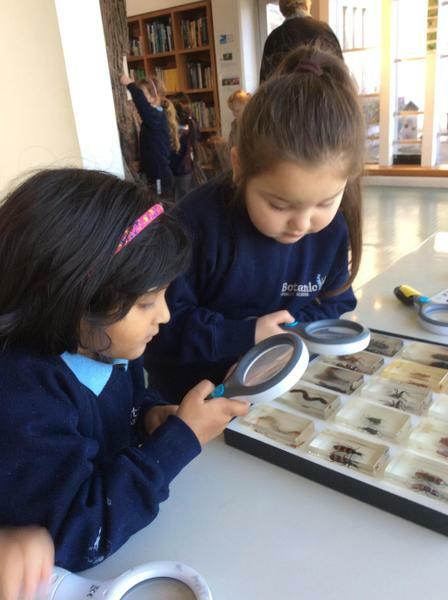 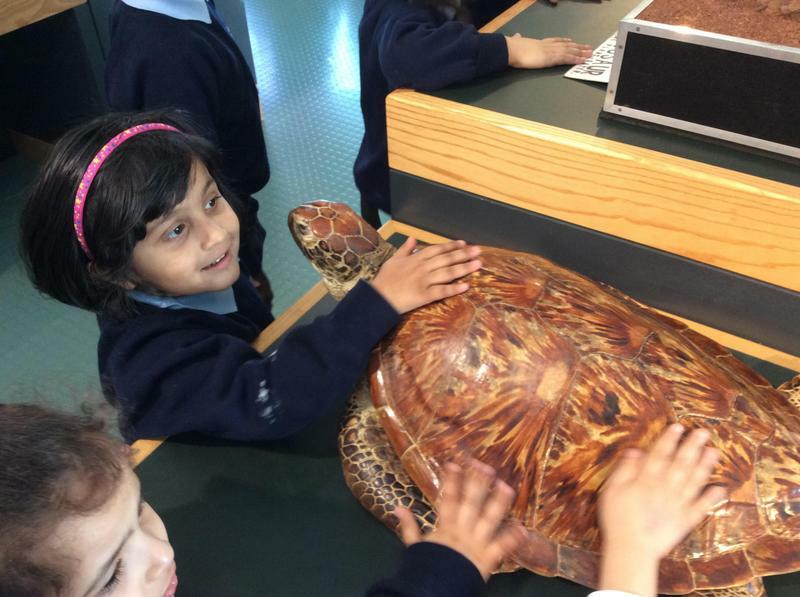 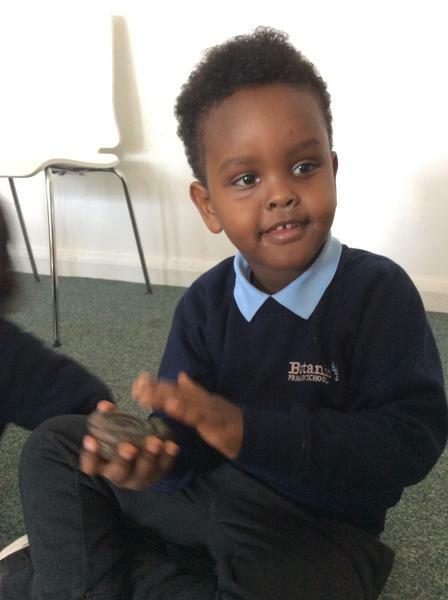 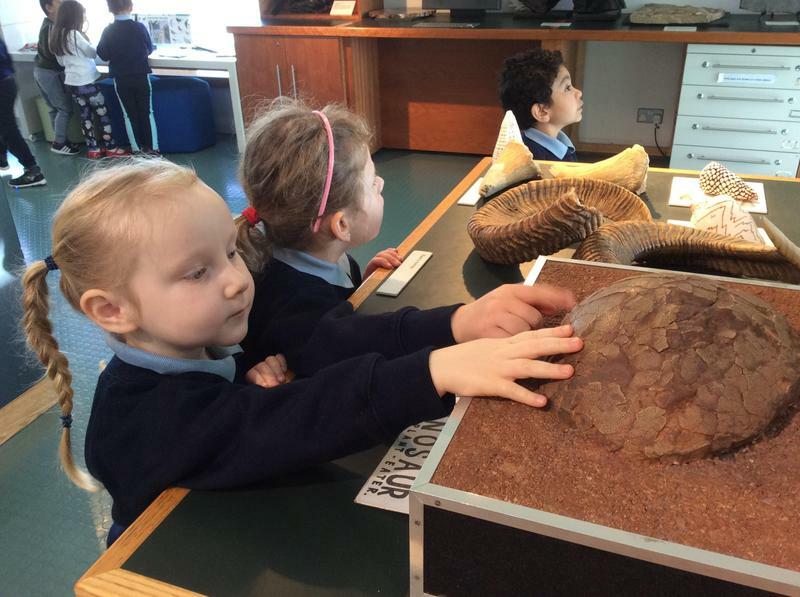 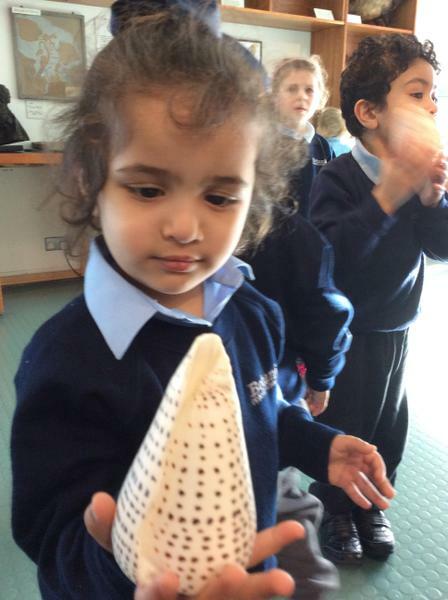 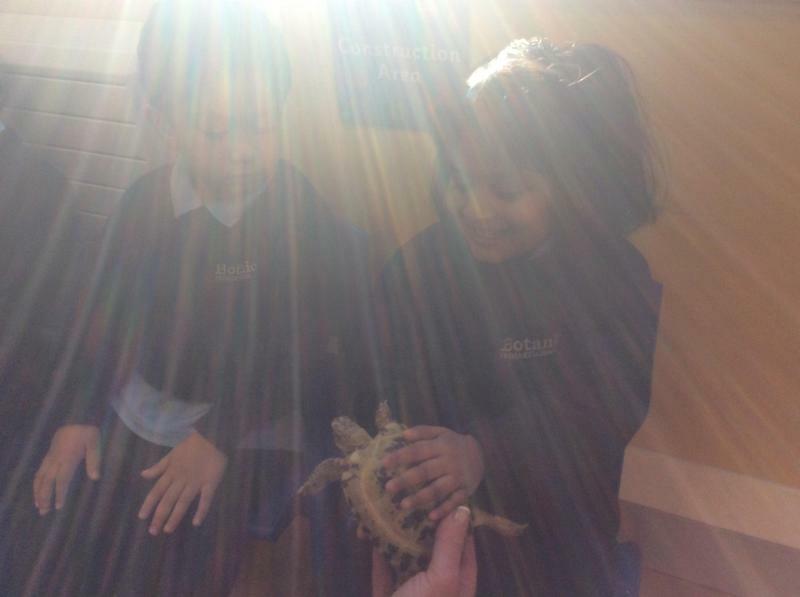 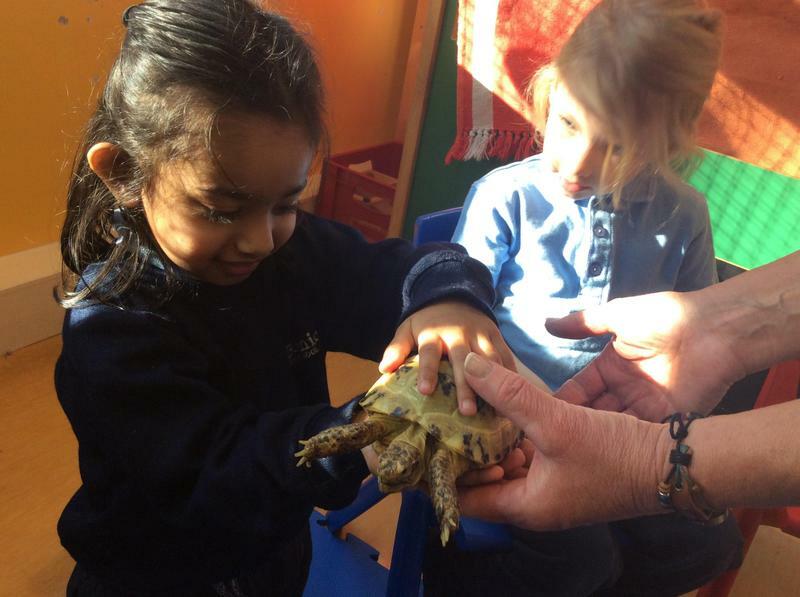 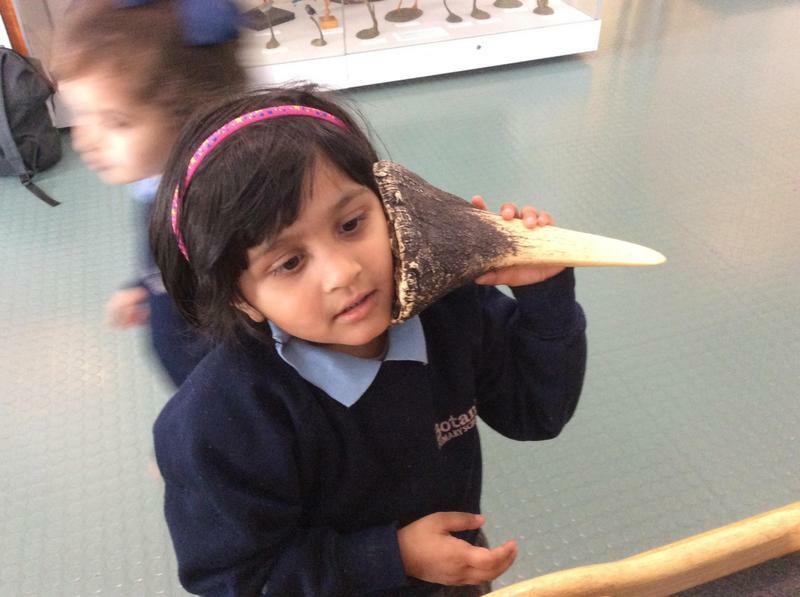 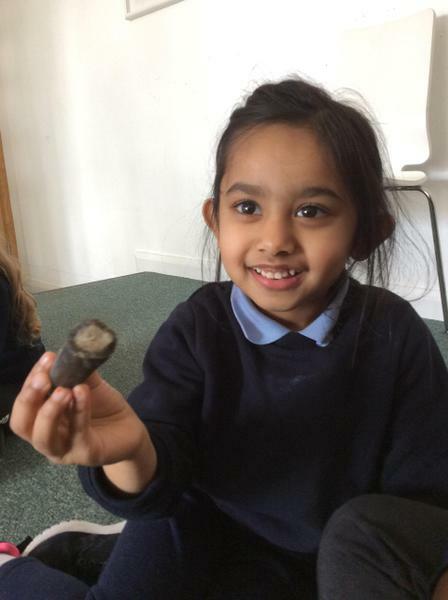 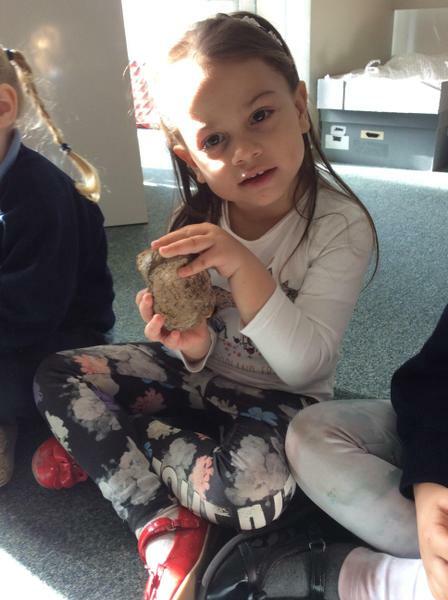 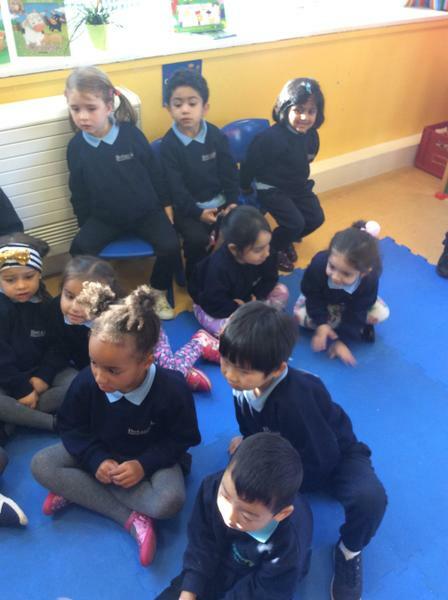 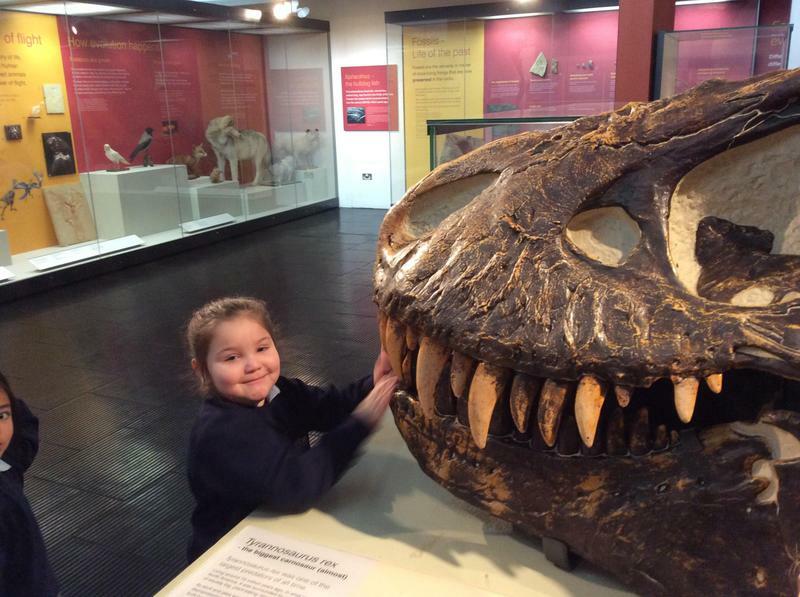 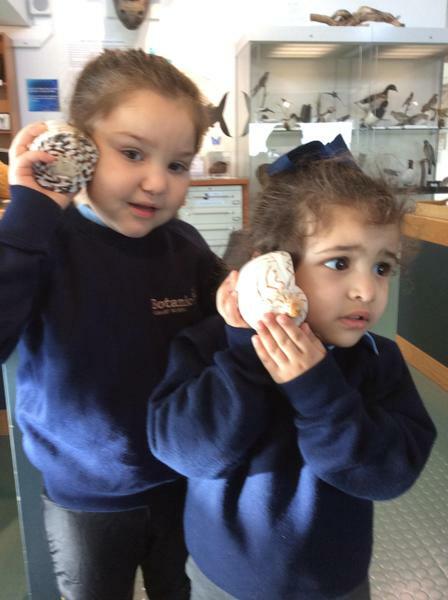 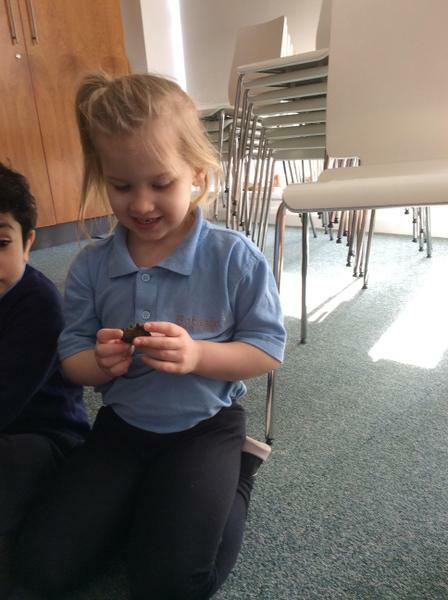 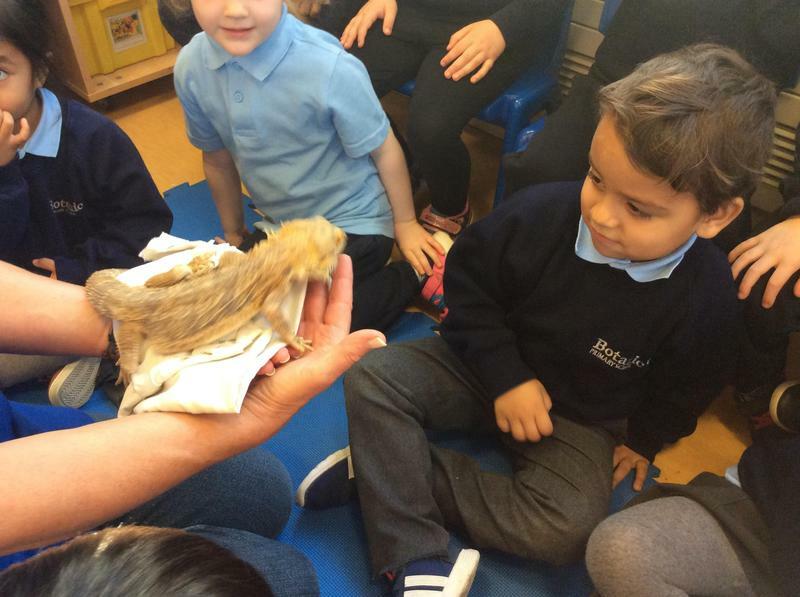 On 1st March, we were very excited to visit the museum to learn about dinosaurs. 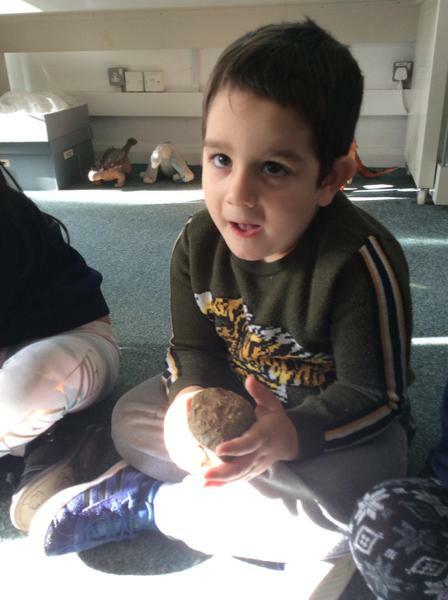 We went into the Nature Room where Leanne told us about the different types of dinosaurs and explained to us how dinosaurs became extinct. 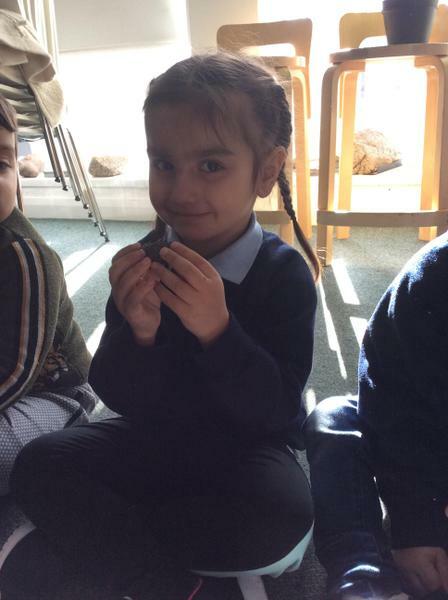 We got to hold real dinosaur fossils and we even got to hold dinosaur poo!! 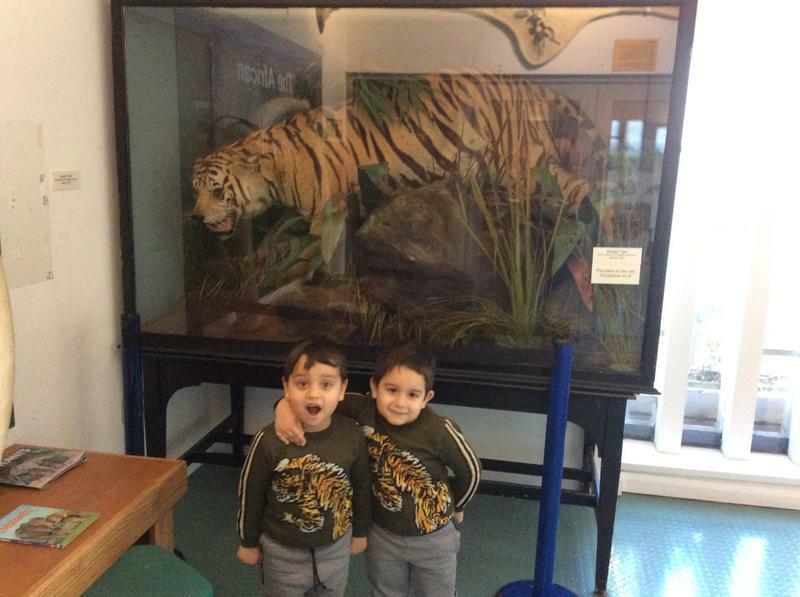 We had a great day at the museum and want to go back to visit every Friday! 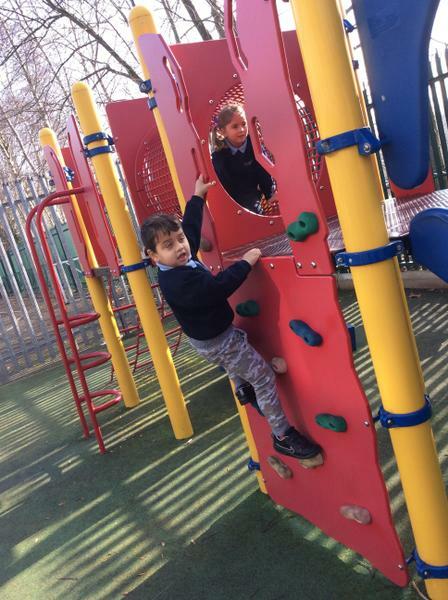 We really enjoyed the week of sunny weather in February as we got a long time to play outside! 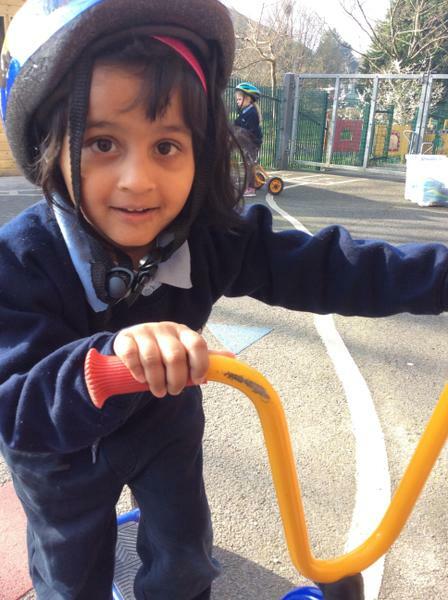 We love playing on the bicycles and pretending that we are fire-fighters on the way to an emergency. 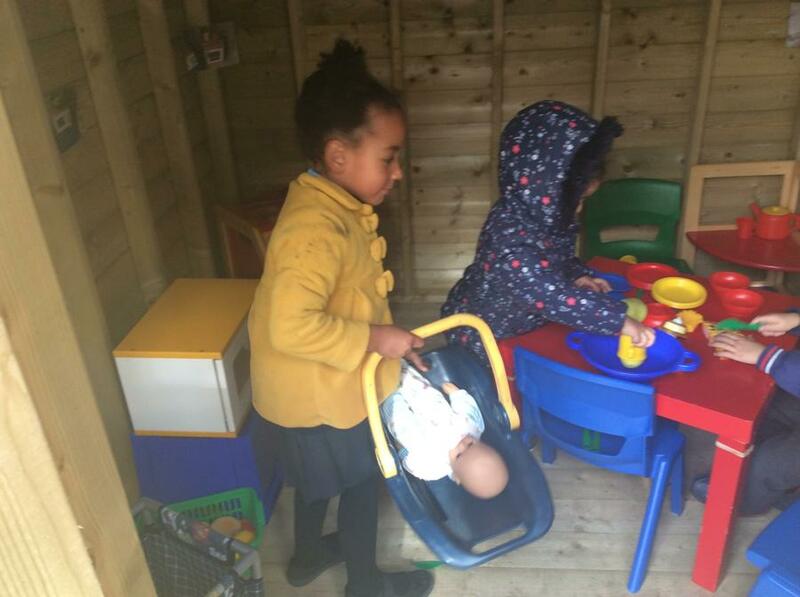 We also take really good care of the babies and take them for long walks to park or to the shops for a treat. 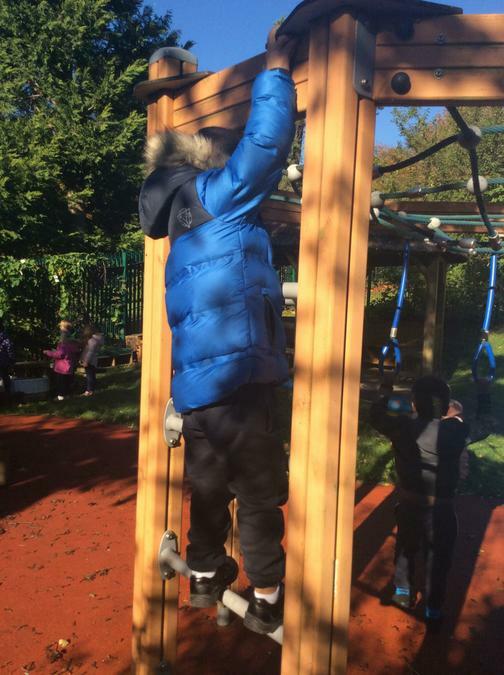 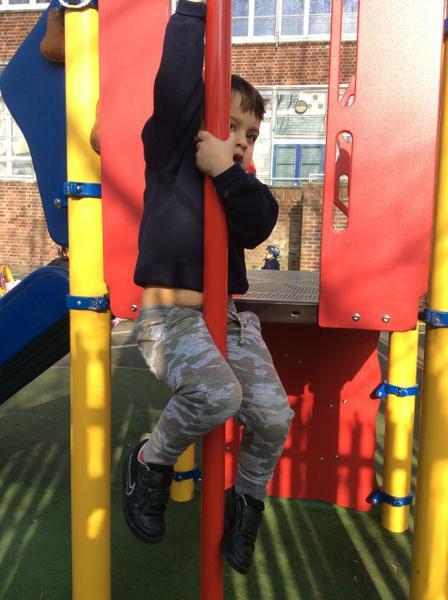 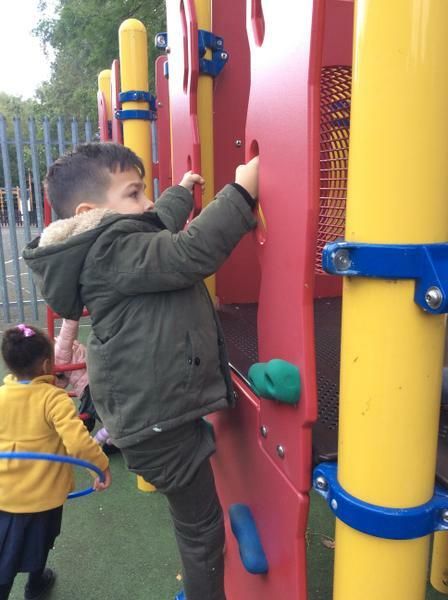 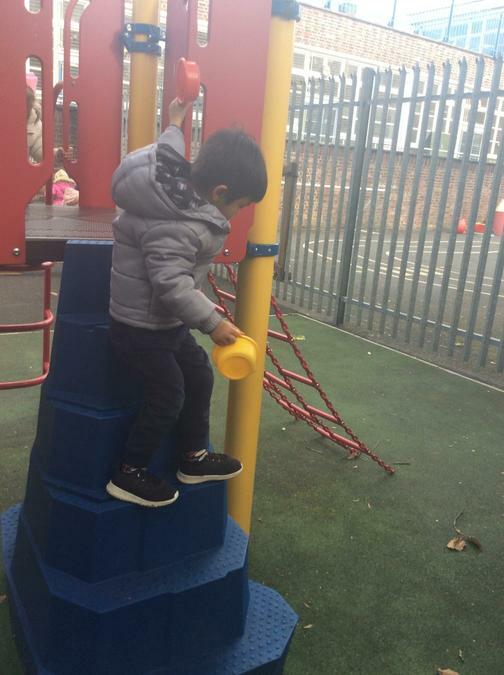 We are also getting very confident in using the climbing wall by ourselves but we are still learning to use the fireman's pole. 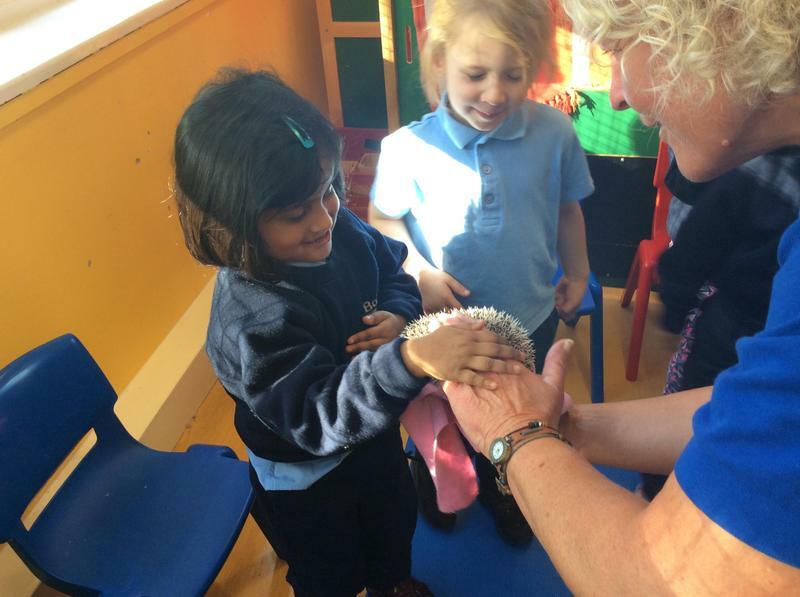 We were very lucky to have Lynne the dentist visit us. 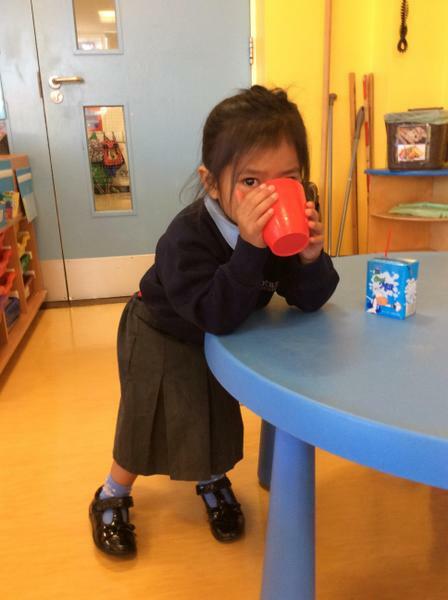 She came to check that we are brushing our teeth in school and that we are not eating the toothpaste! 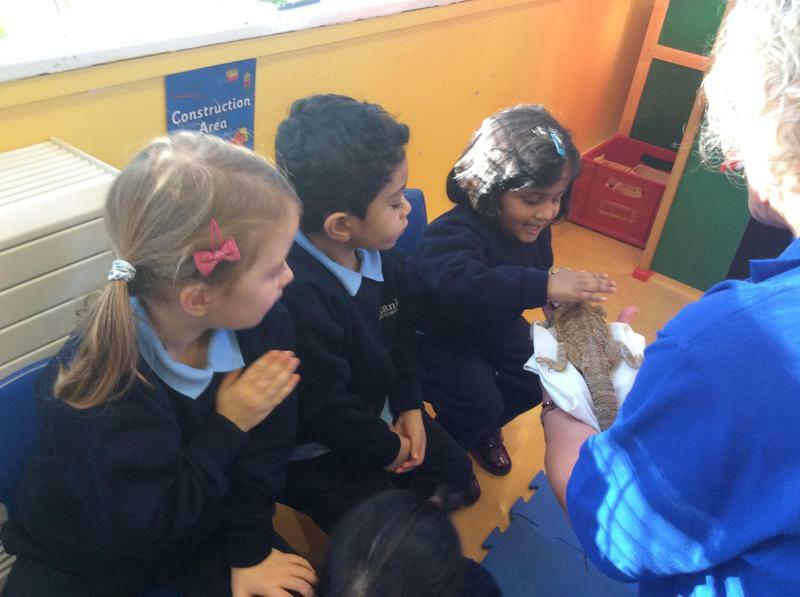 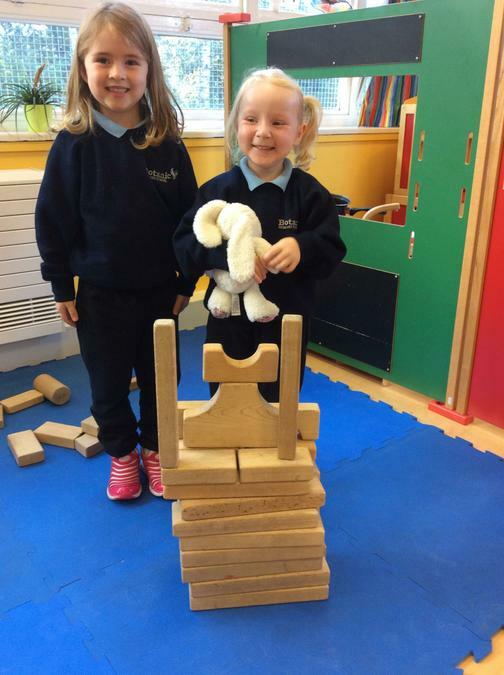 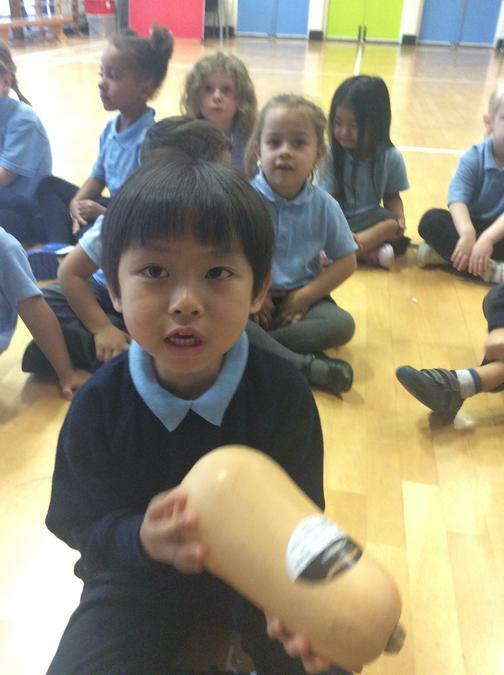 Lynne brought her friend Georgina the Giraffe to show us how we should be brushing our teeth. 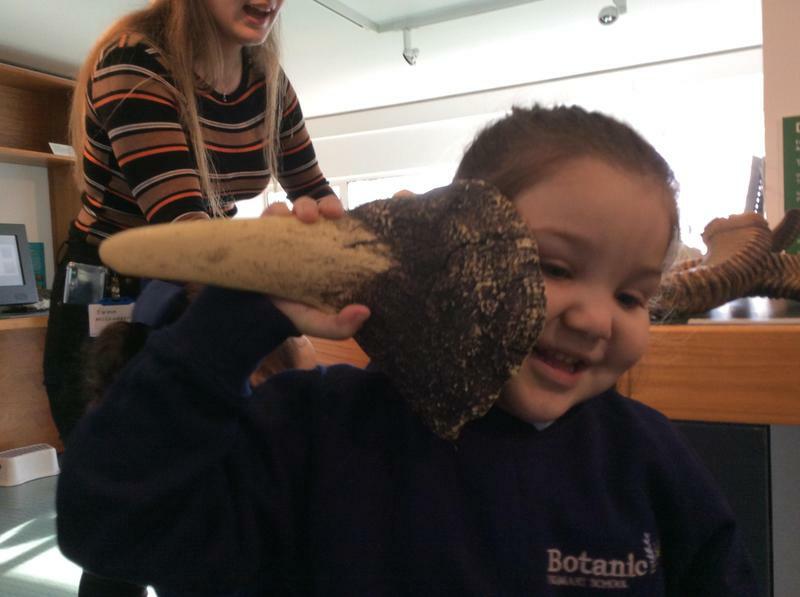 Lynne gave us a special mirror and toothbrush so we could brush Georgina's teeth- we didn't know a giraffe could have so many teeth! 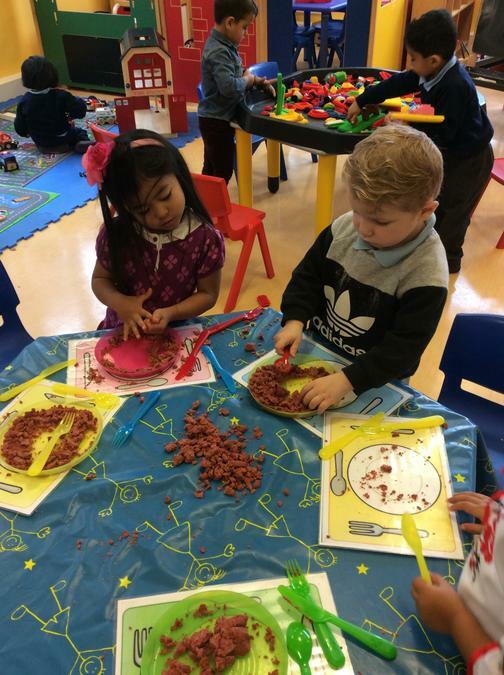 We really enjoyed learning about Chinese New Year; we had a Chinese restaurant in our classroom and we enjoyed learning about the food that is made and served in these restaurants. 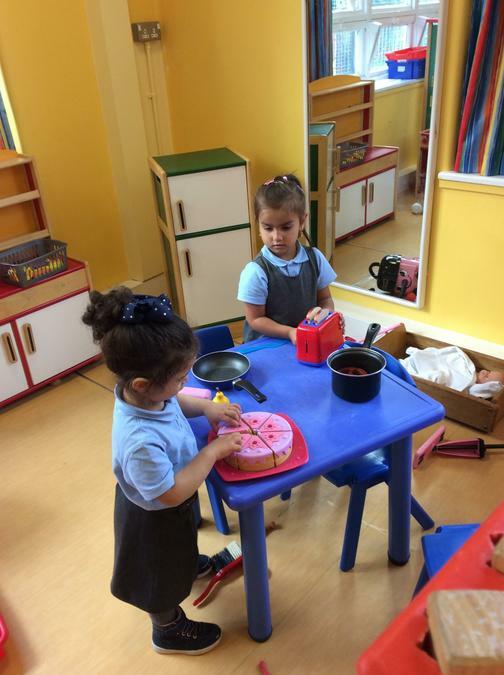 Our favourite part was writing down orders and then serving food to the customers. 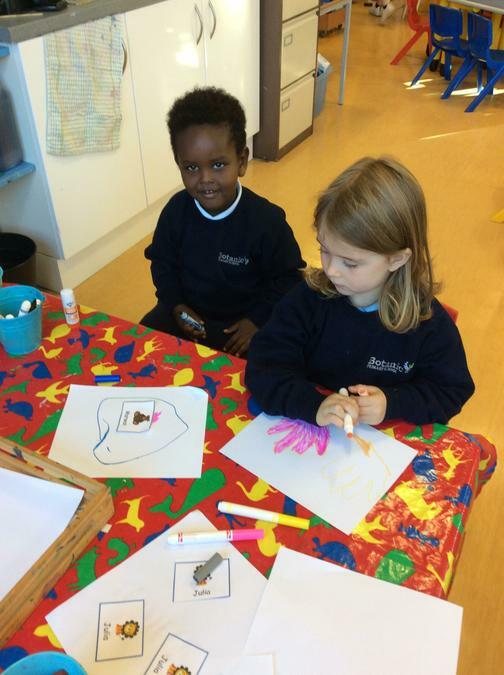 We also made dragon masks and did some dragon dancing to celebrate the new year. 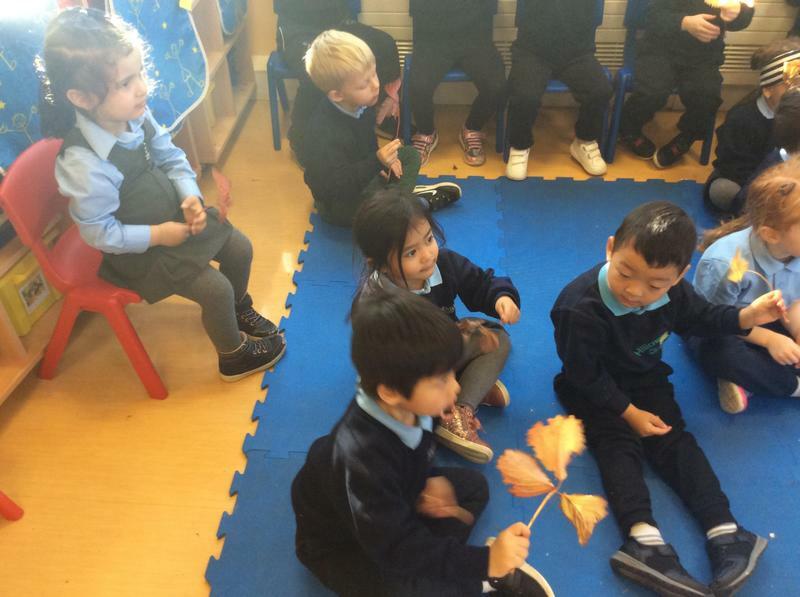 We watched videos of the dragon dance in China but we know that the dragon is only pretend! 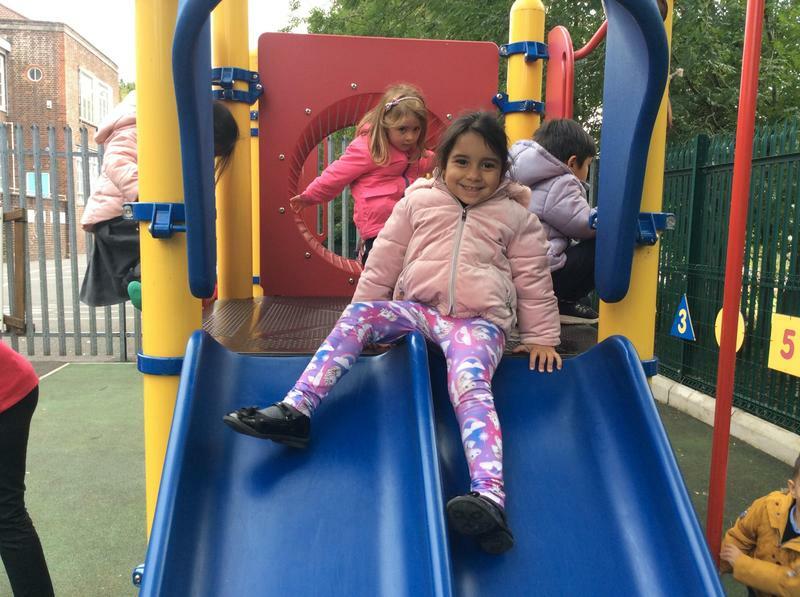 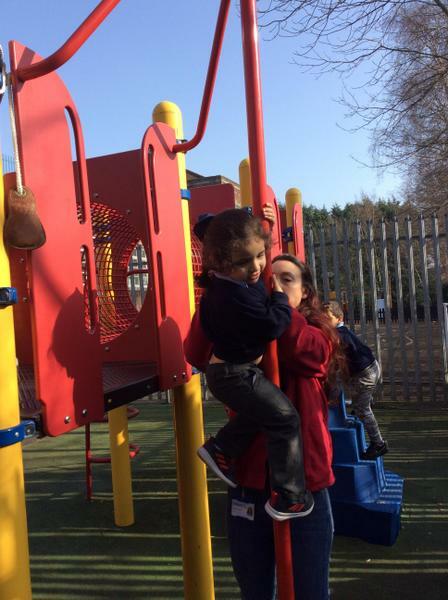 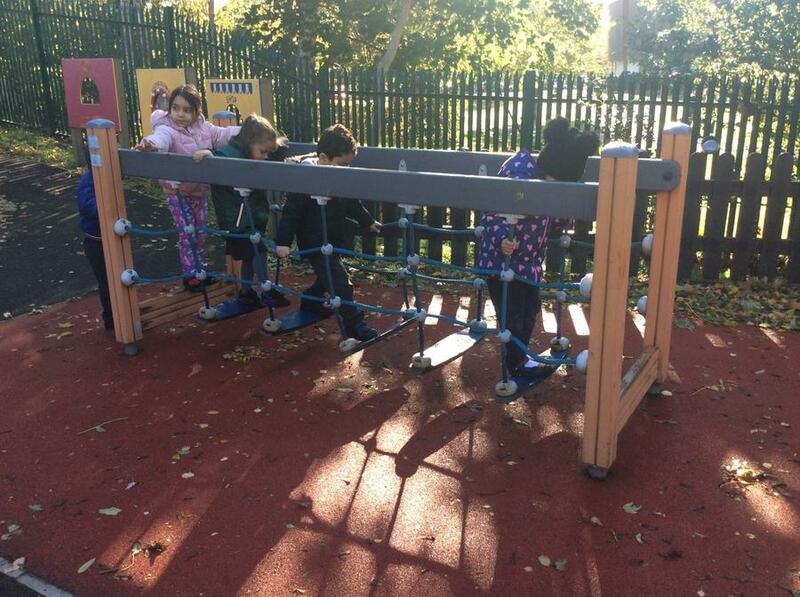 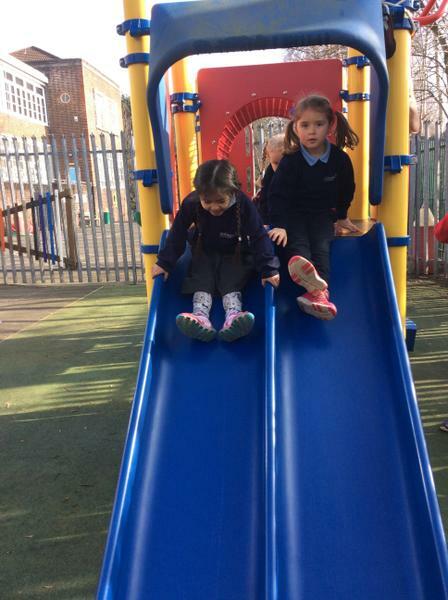 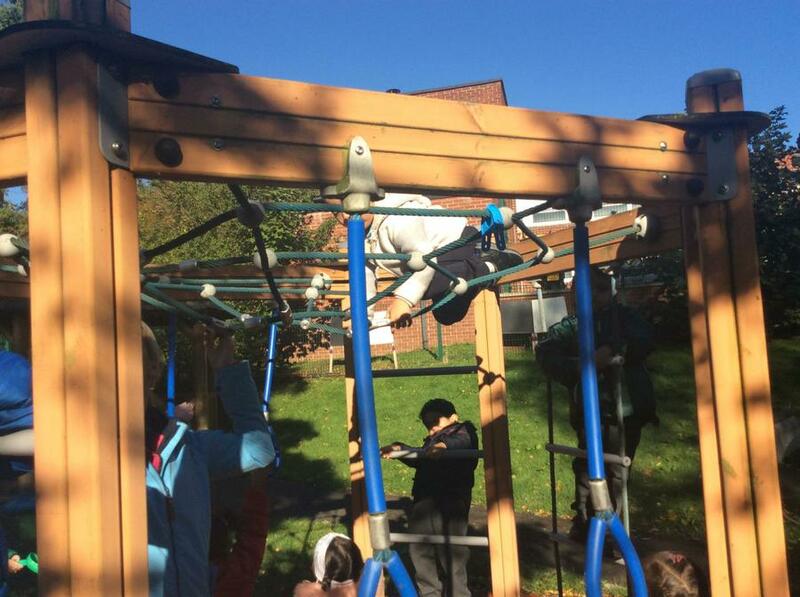 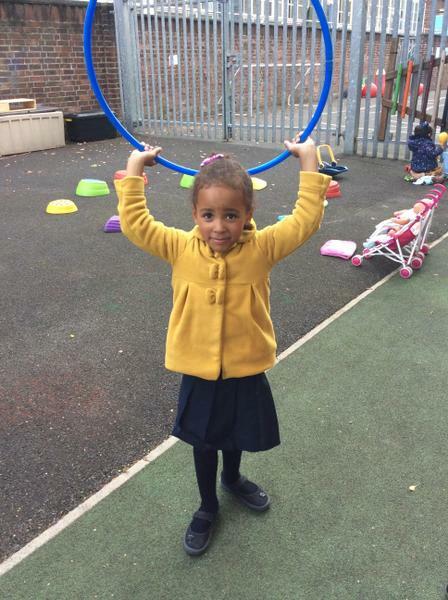 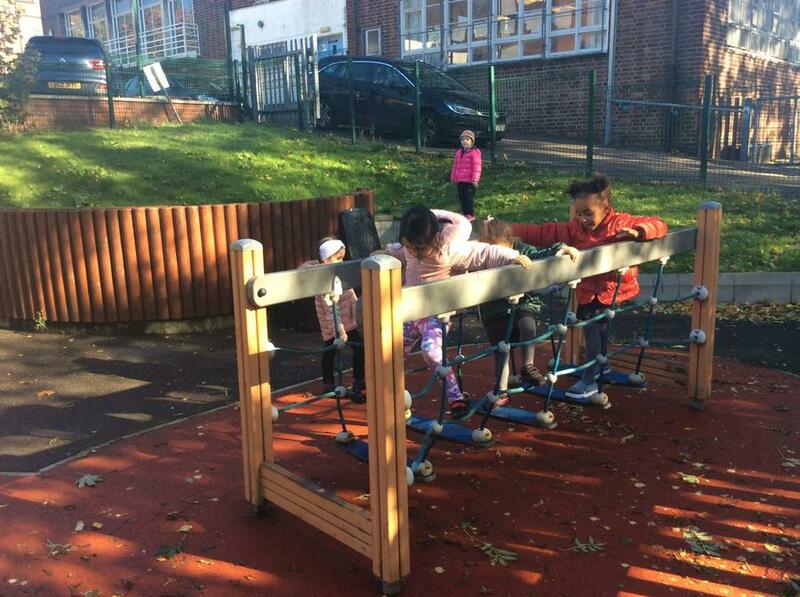 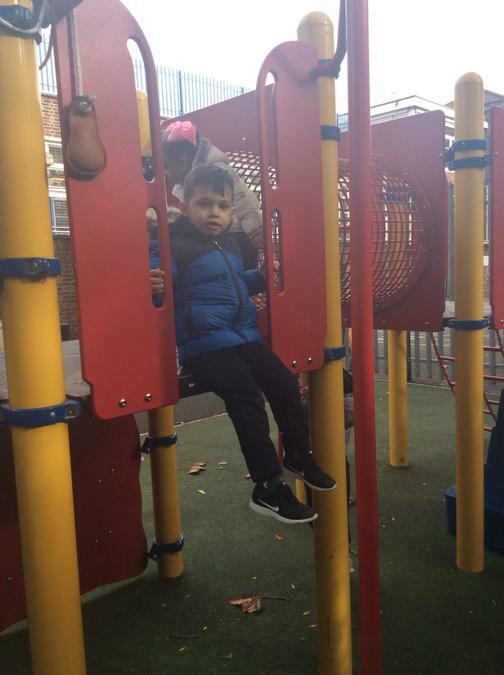 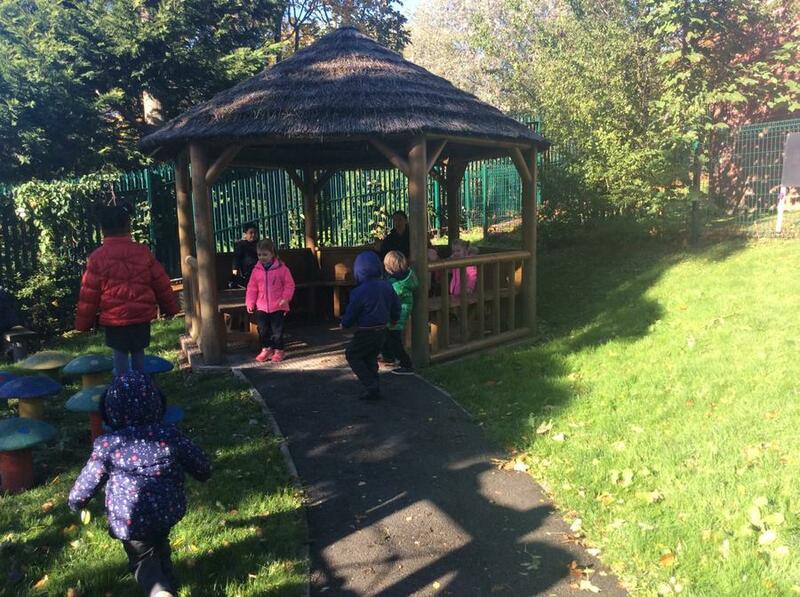 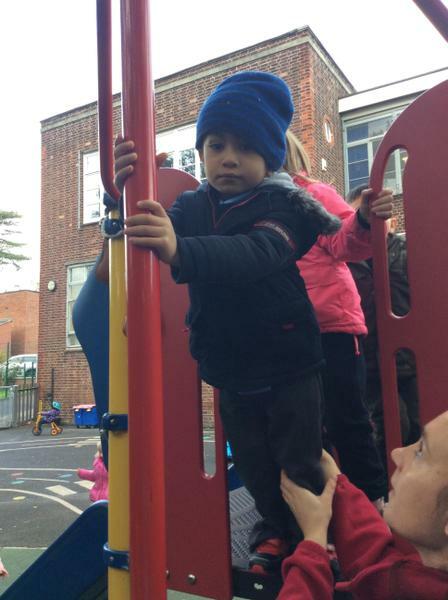 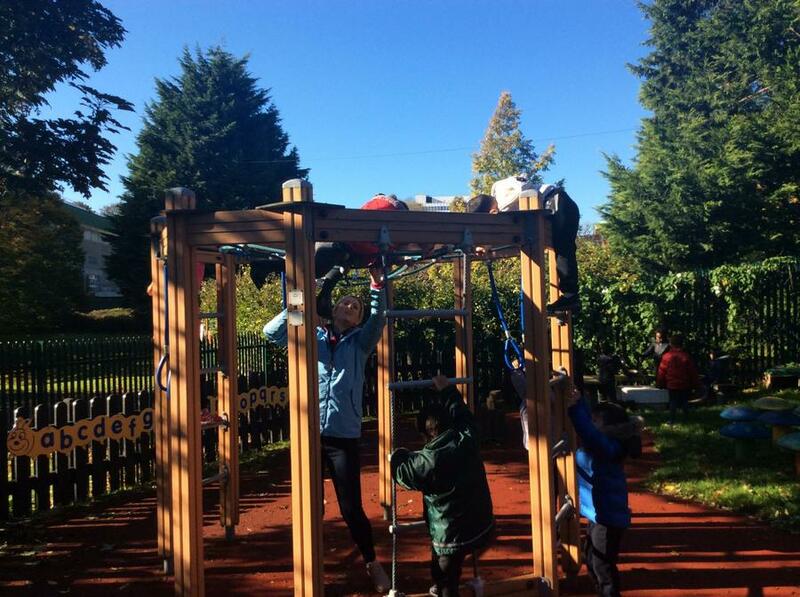 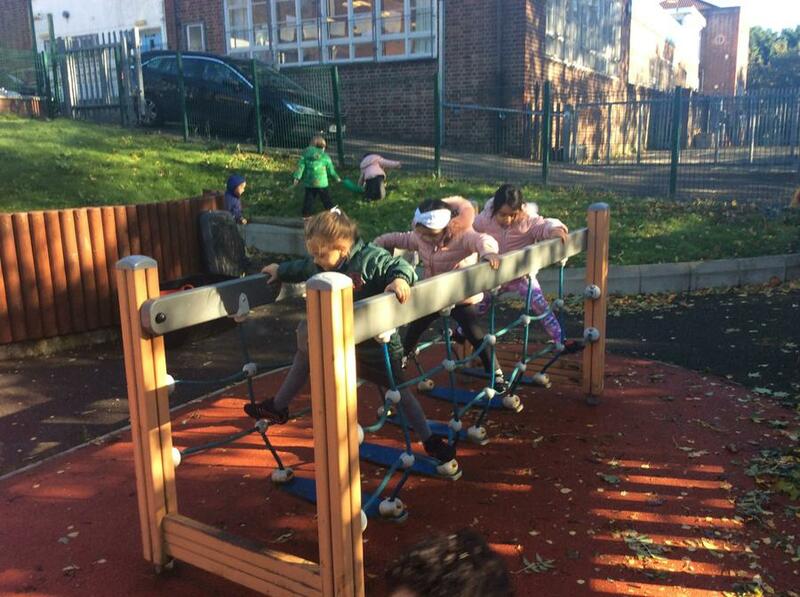 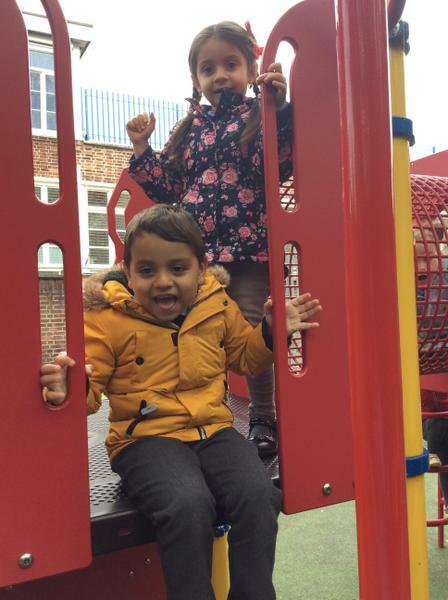 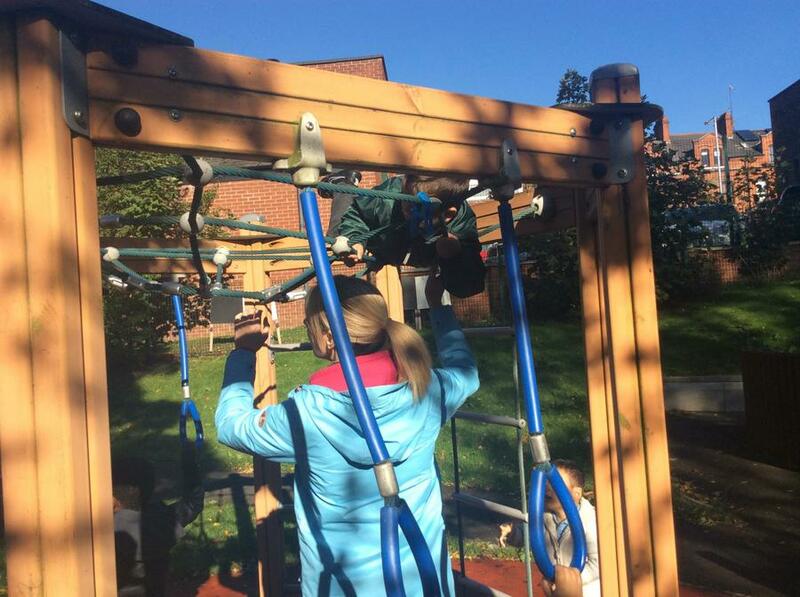 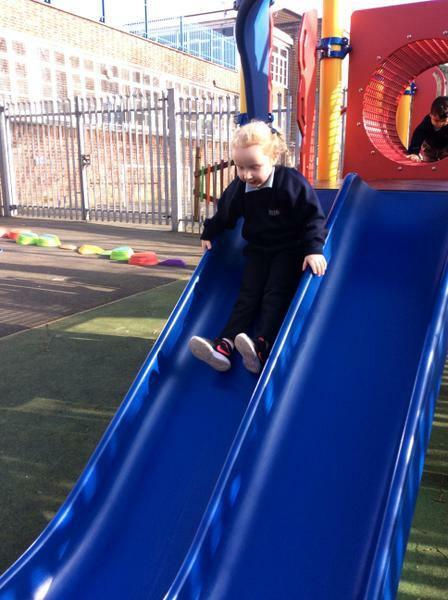 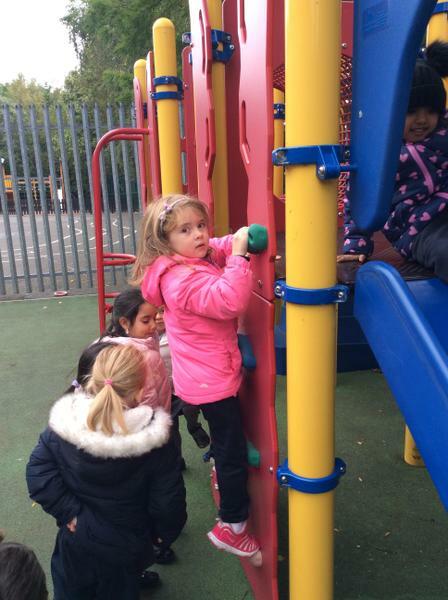 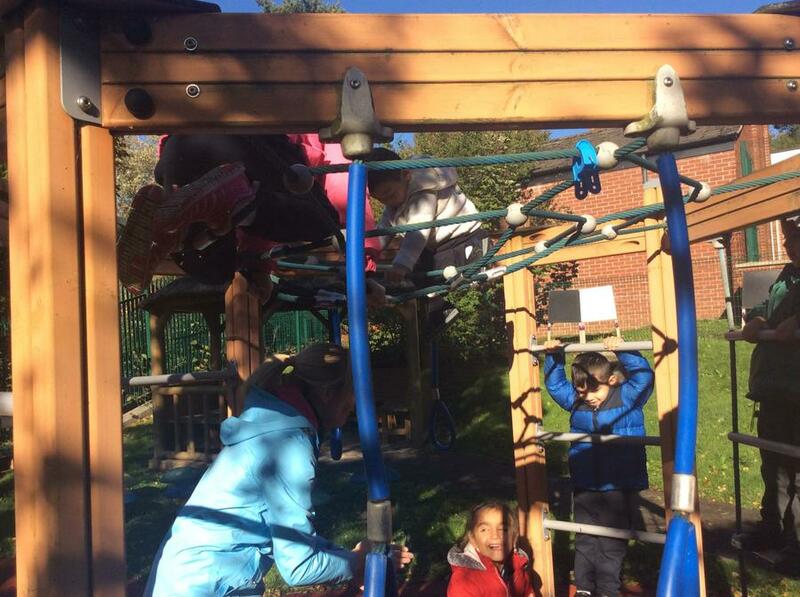 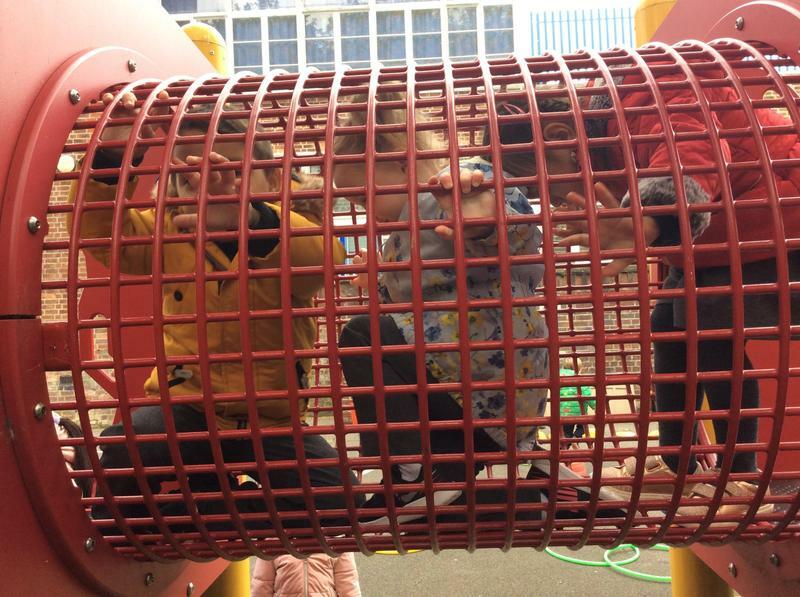 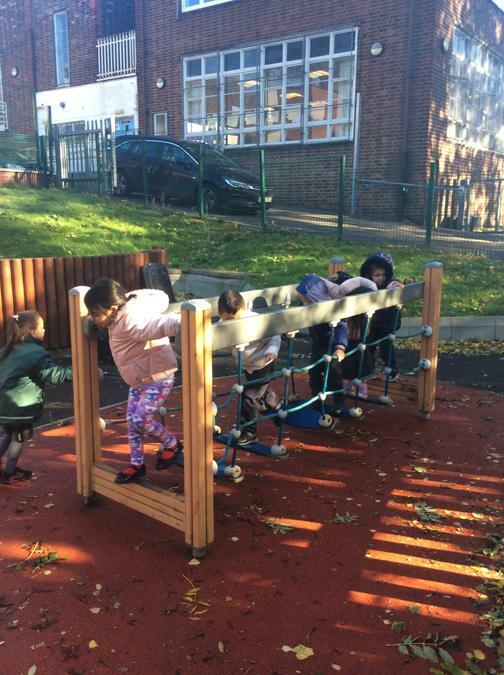 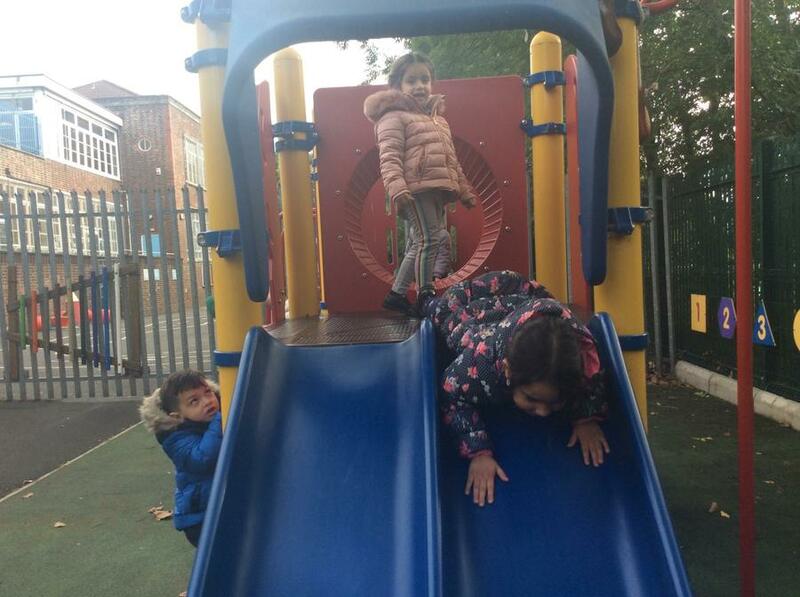 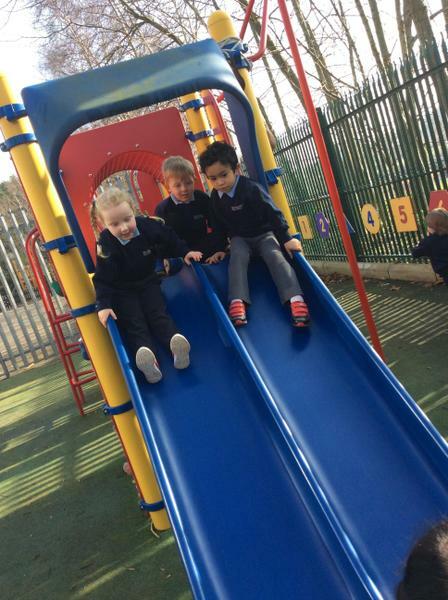 We love playing outside in our playground. 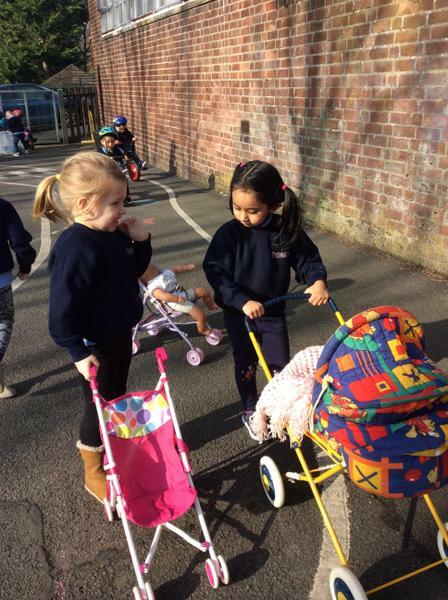 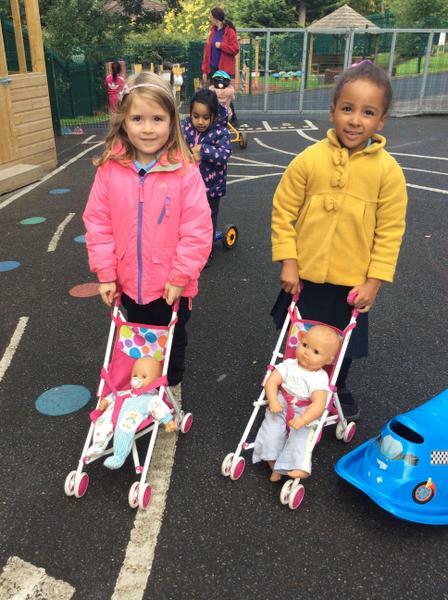 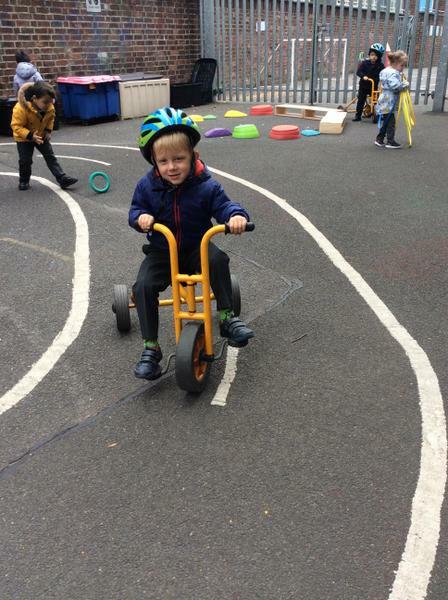 We are getting very good at steering, peddling and controlling the tricycles but sometimes we forget to keep them on the road! 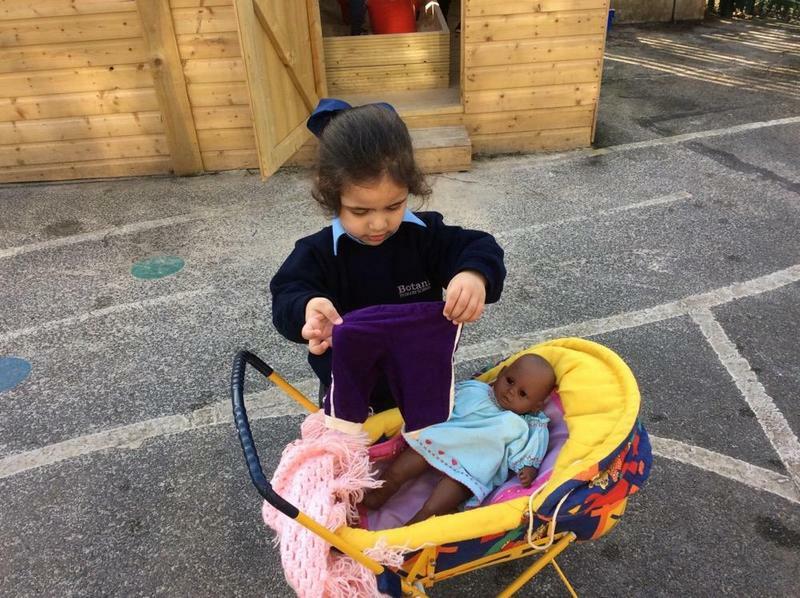 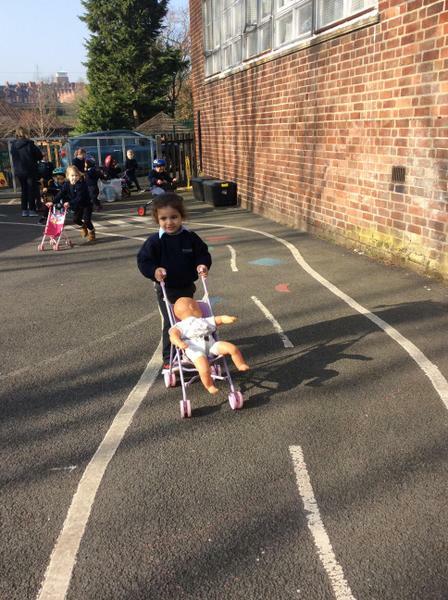 We also love to take care of the babies and take them for long walks in their prams. 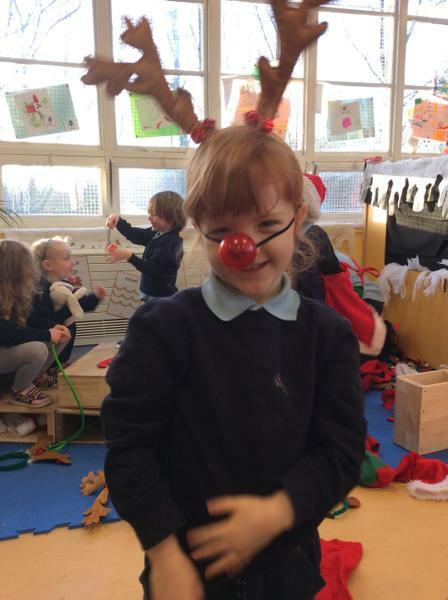 We had a very busy time at Christmas. 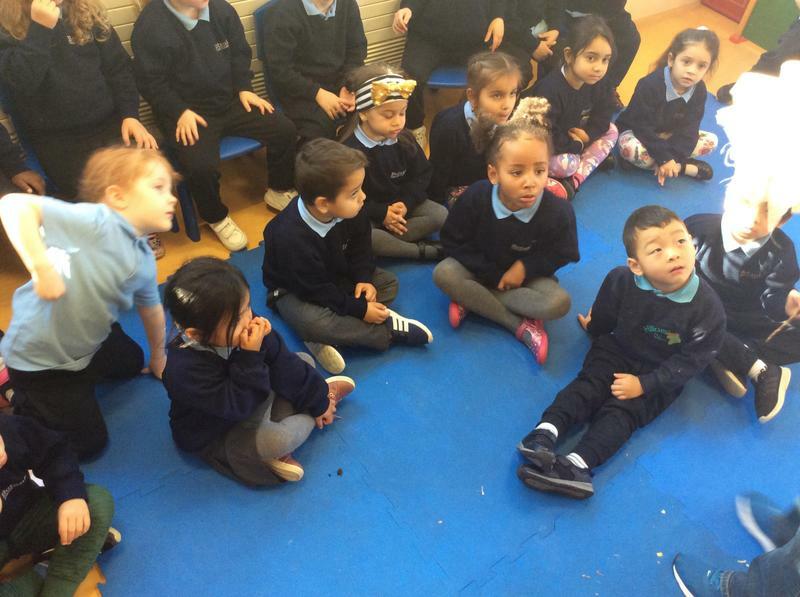 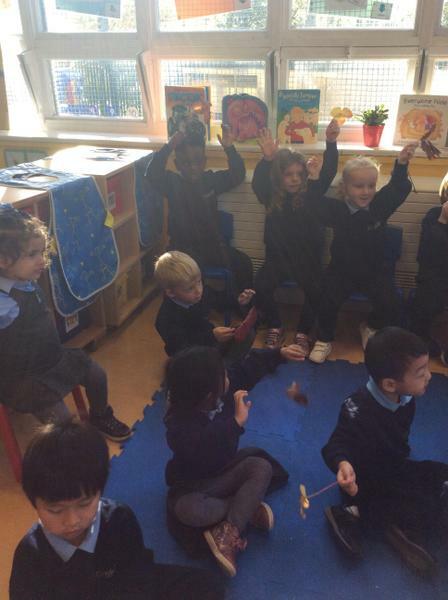 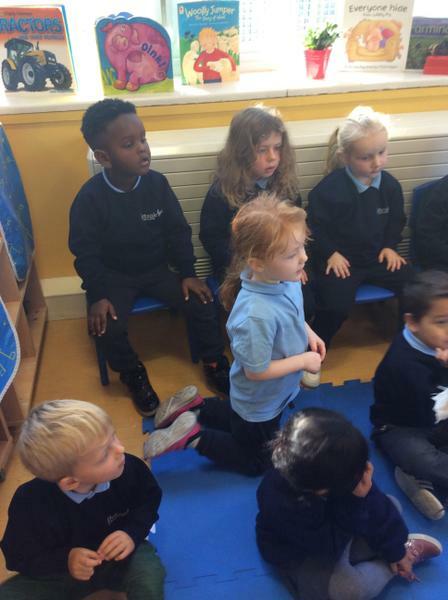 We were practising for our show "The Sleepy Shepherd" and had to do lots and lots of singing. 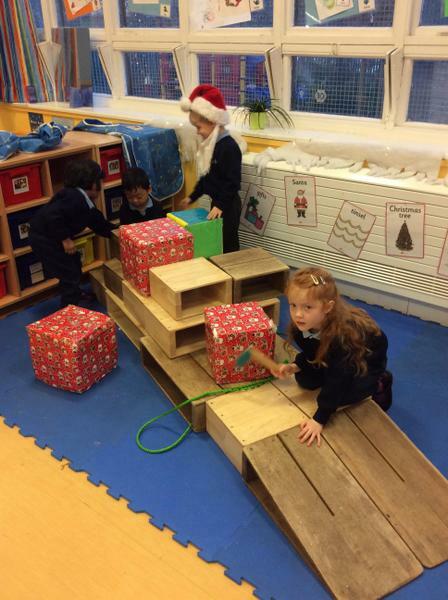 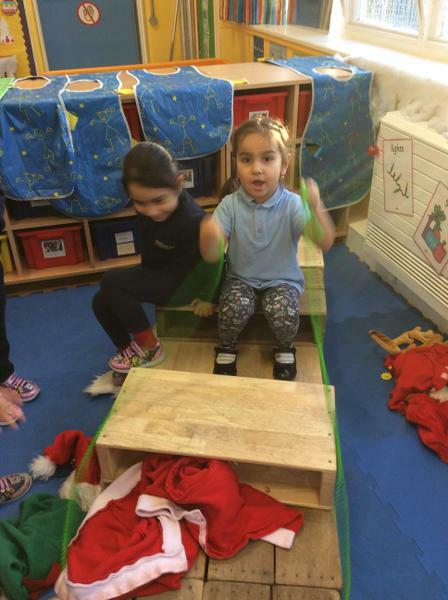 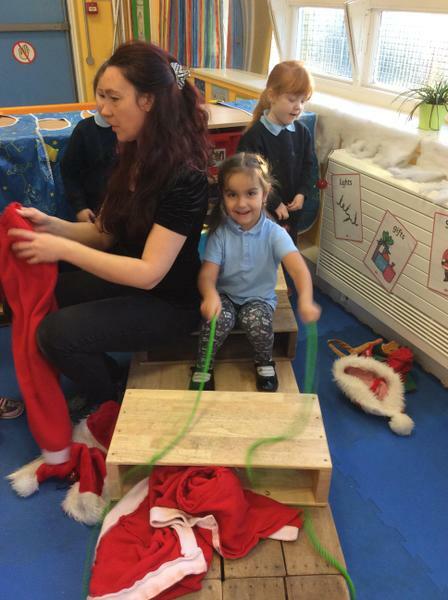 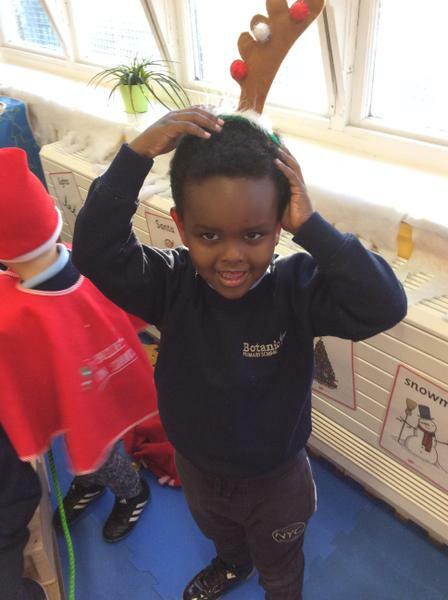 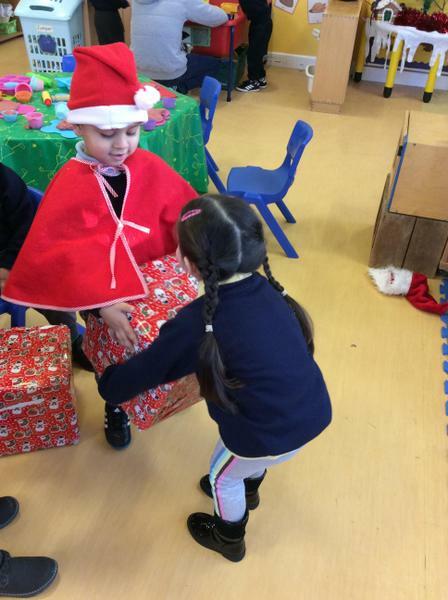 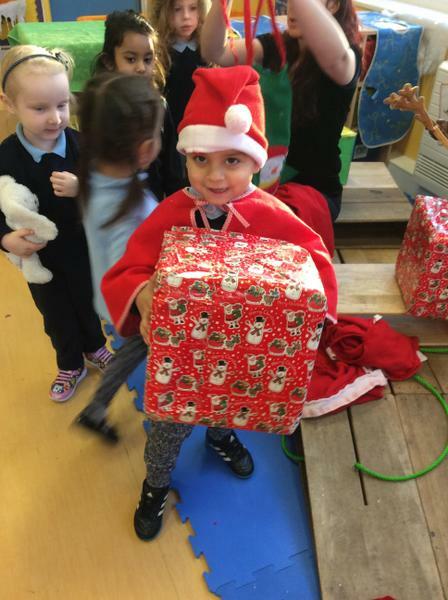 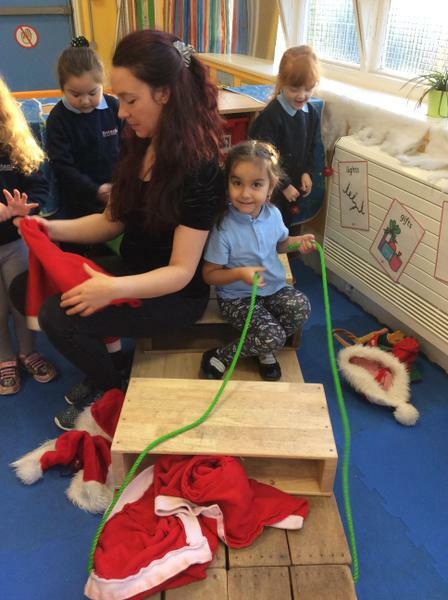 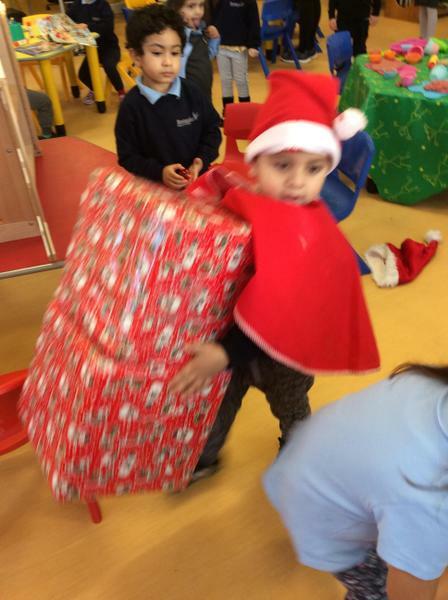 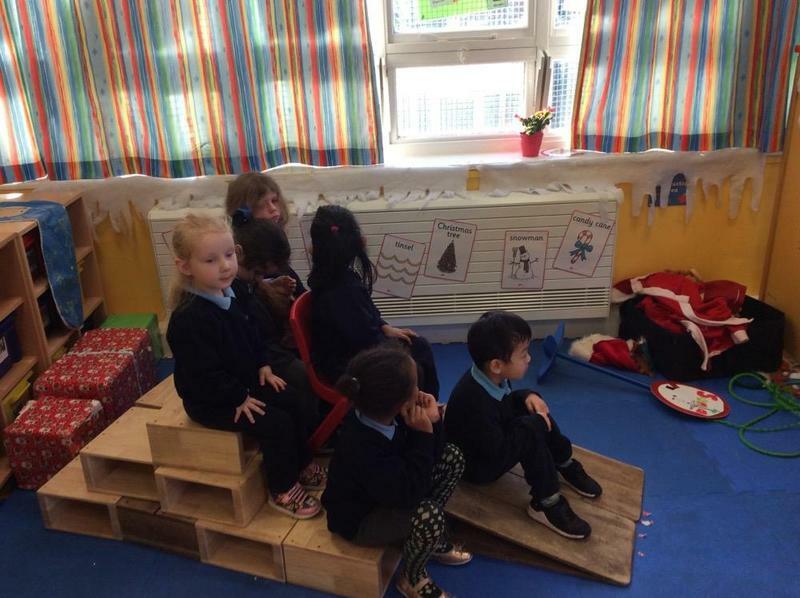 We were also very busy building Santa's sleigh, so he could deliver presents to the boys and girls. 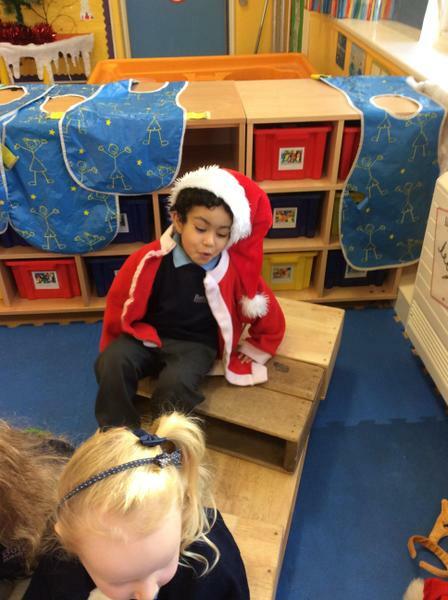 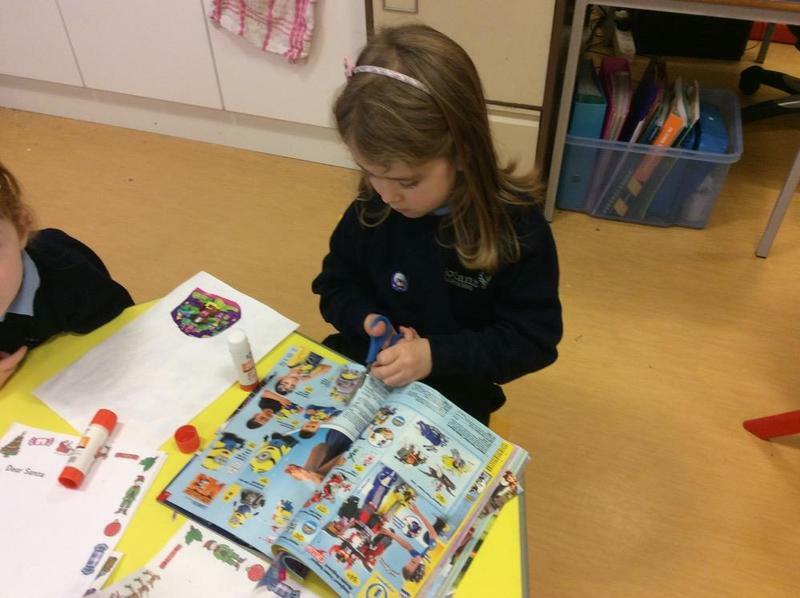 We also wrote Santa some letters, with pictures to show him what toys the children would like. 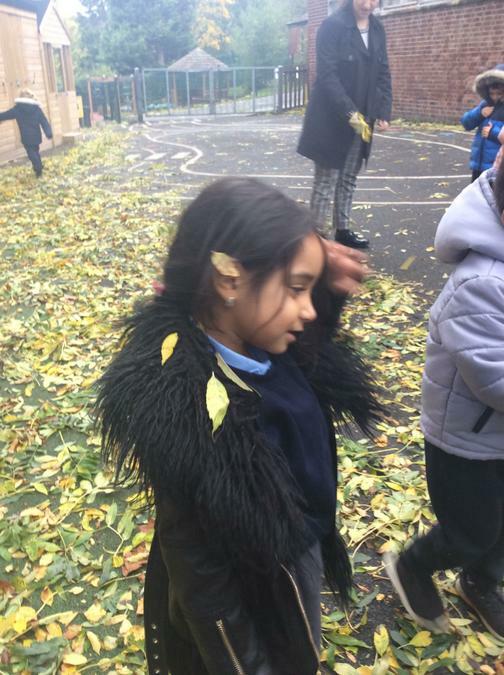 In November, we learnt about animals that hibernate during the winter. 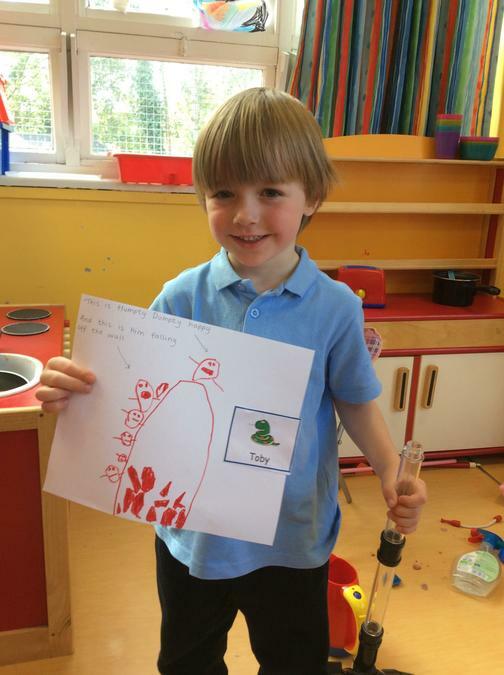 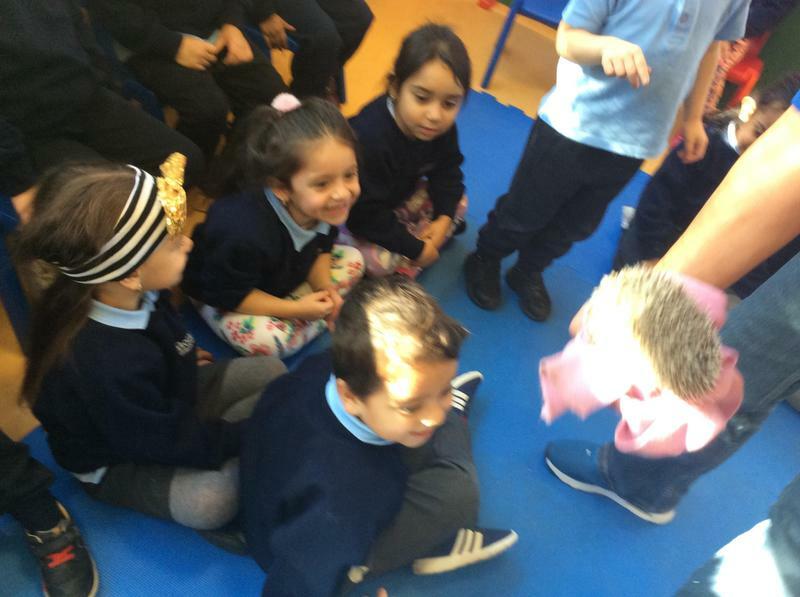 Our favourite animal we learnt about was hedgehogs! 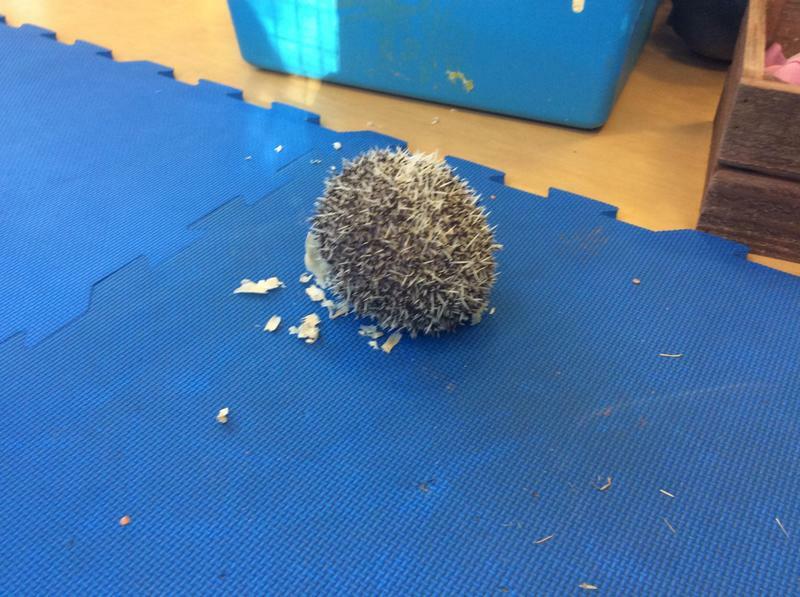 We liked that they had spikes on their back to protect them and were surprised that they came out at night when we were sleeping. 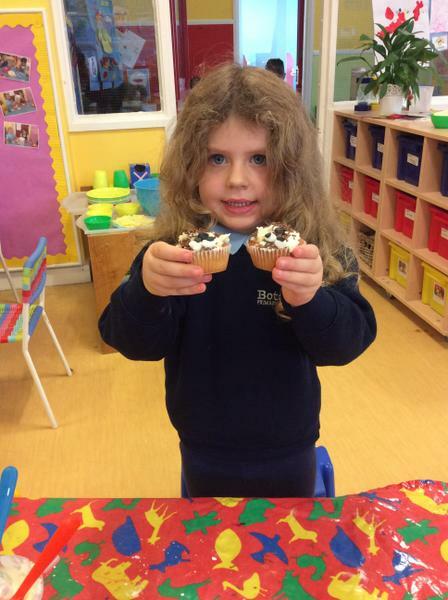 Our hedgehog cupcakes turned out great and tasted really yummy! 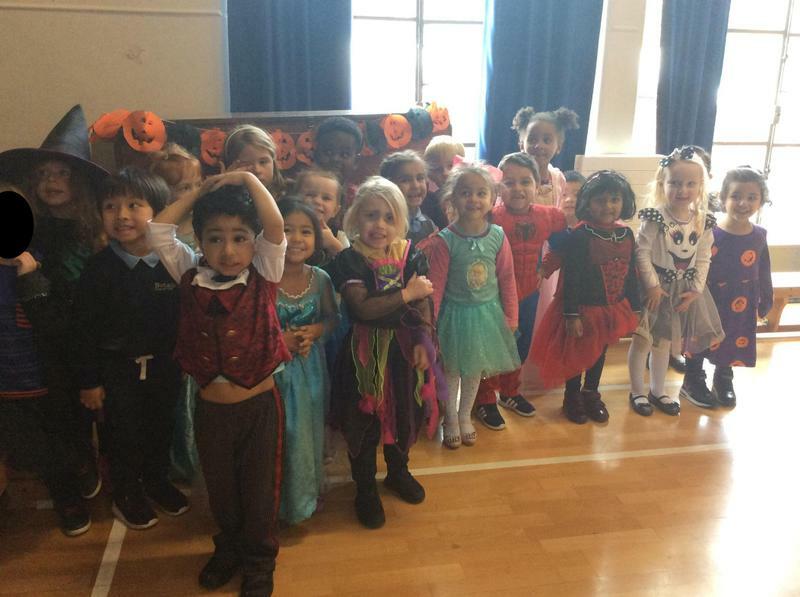 To help raise funds for our PTA we came to school in our fancy dress costumes. Don’t we look fabulous! 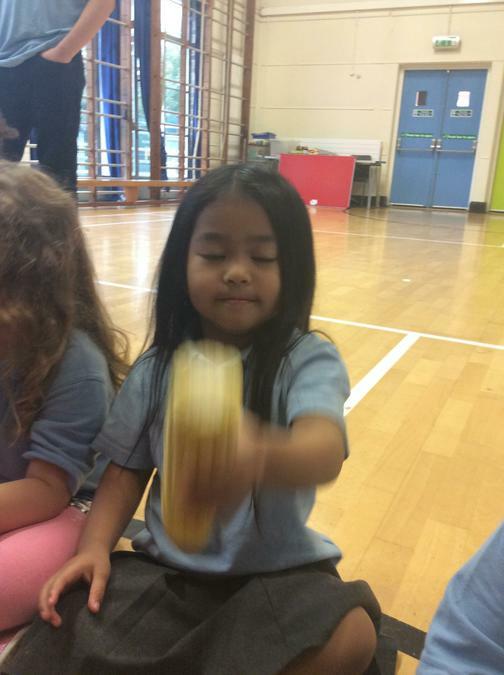 We showed off our groovy moves at the disco and had some yummy sweets from the tuck shop. 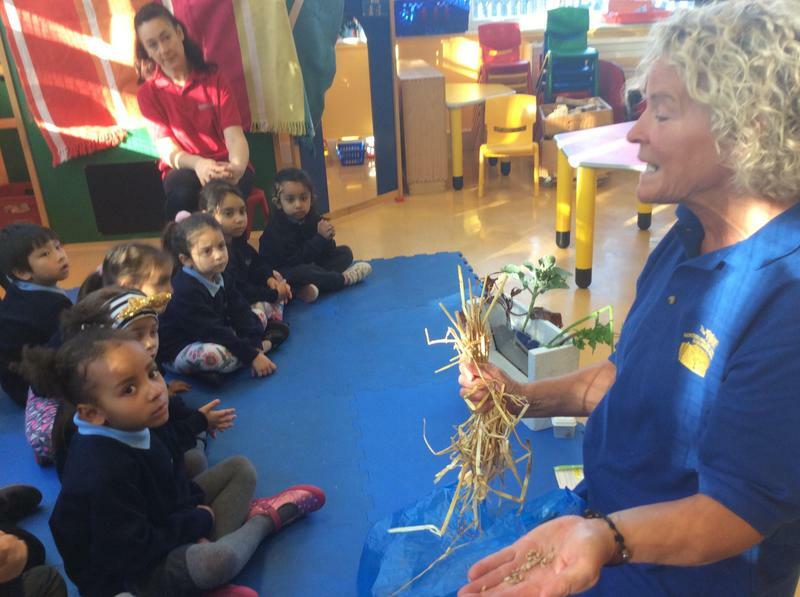 Farmer Lorraine visited our class and talked to us about all the important jobs a farmer does at Harvest time. 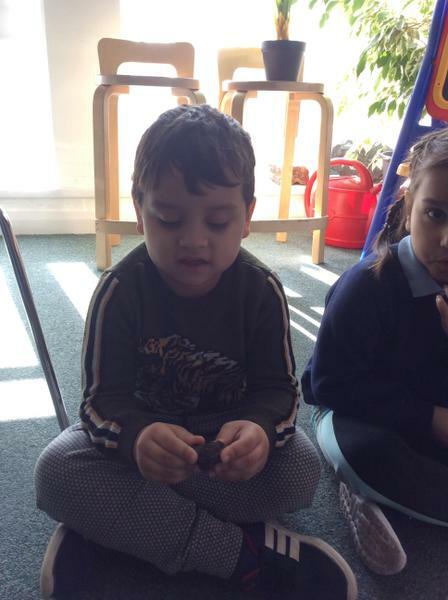 We refelected and shared our knowledge of how seeds grow and what they need to nurture them. 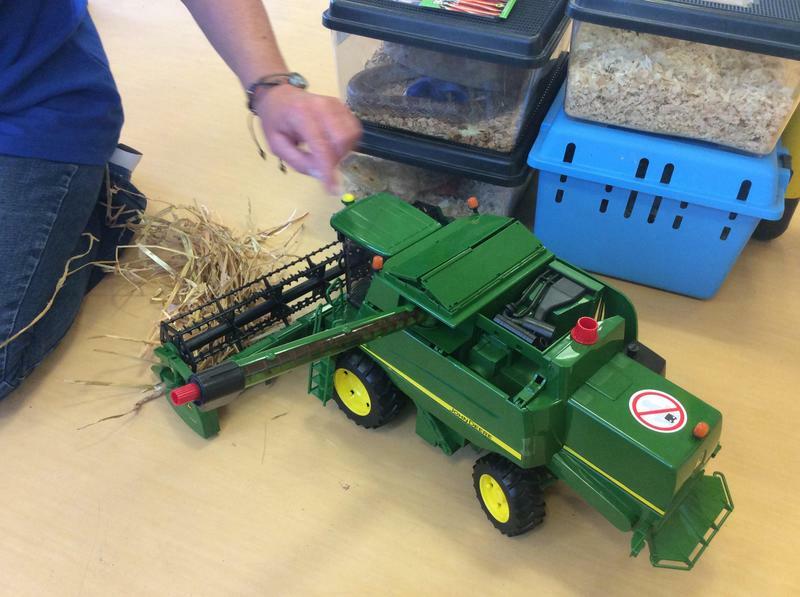 We talked about all the different types of animals a farmer looks after at their farm. 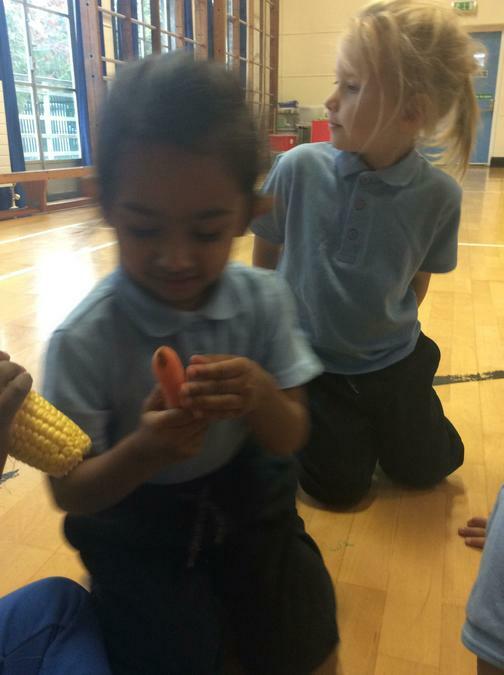 We discussed all the yummy foods that a farmer and their animals produce. 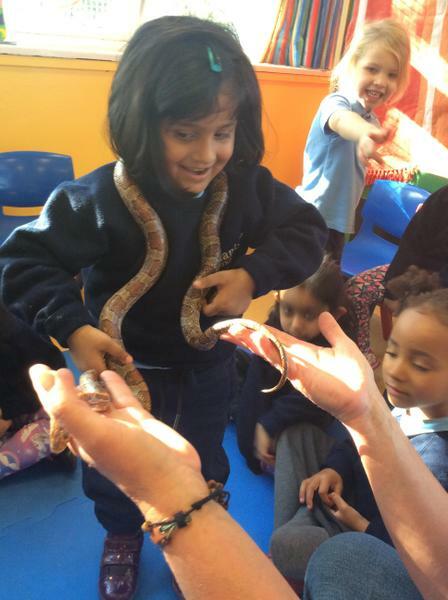 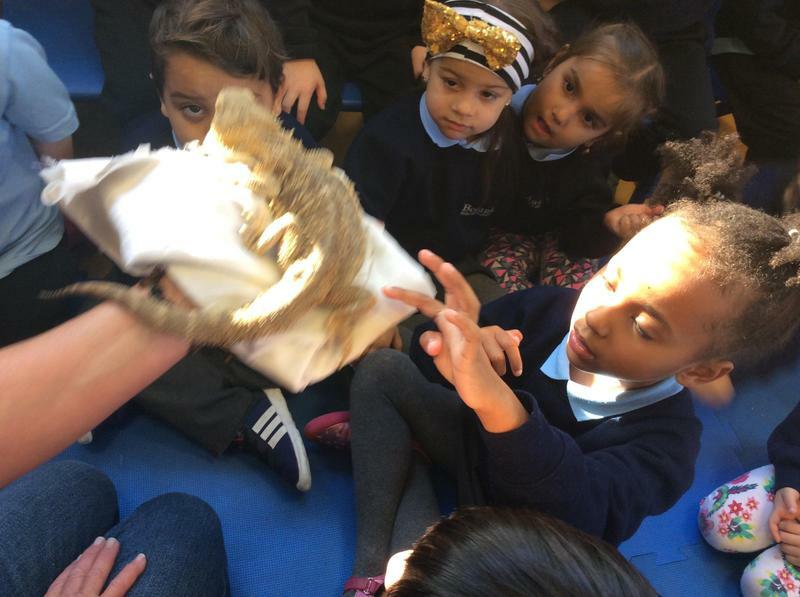 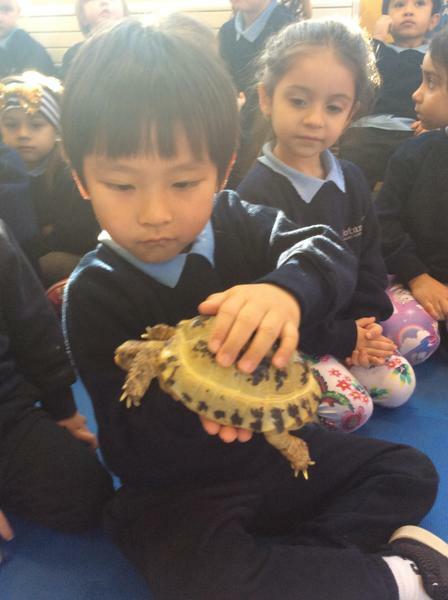 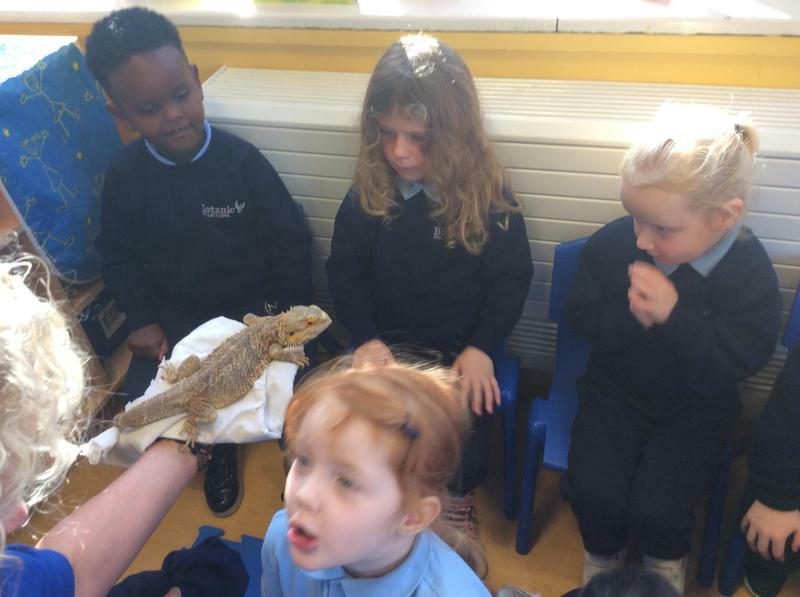 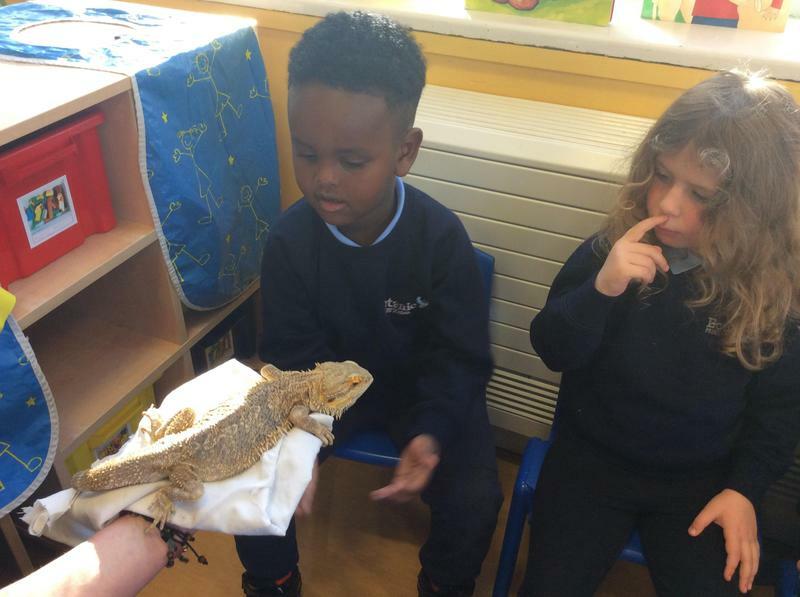 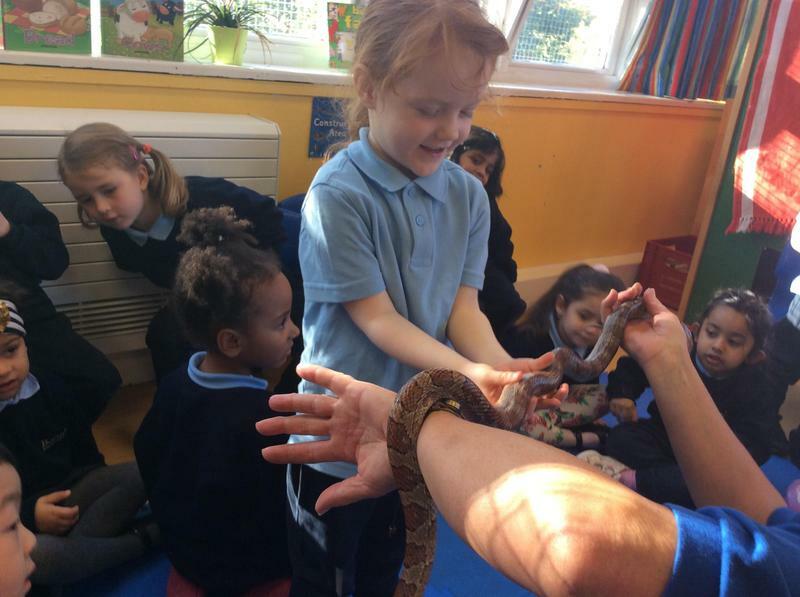 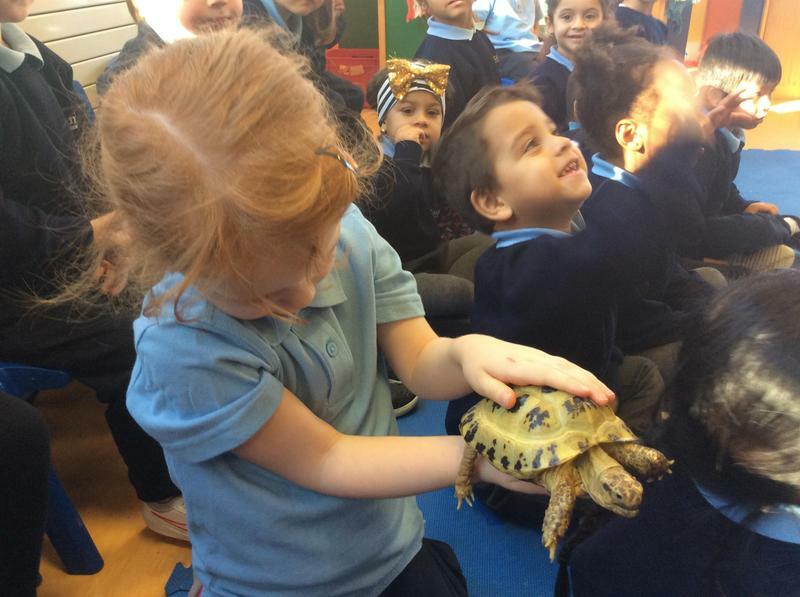 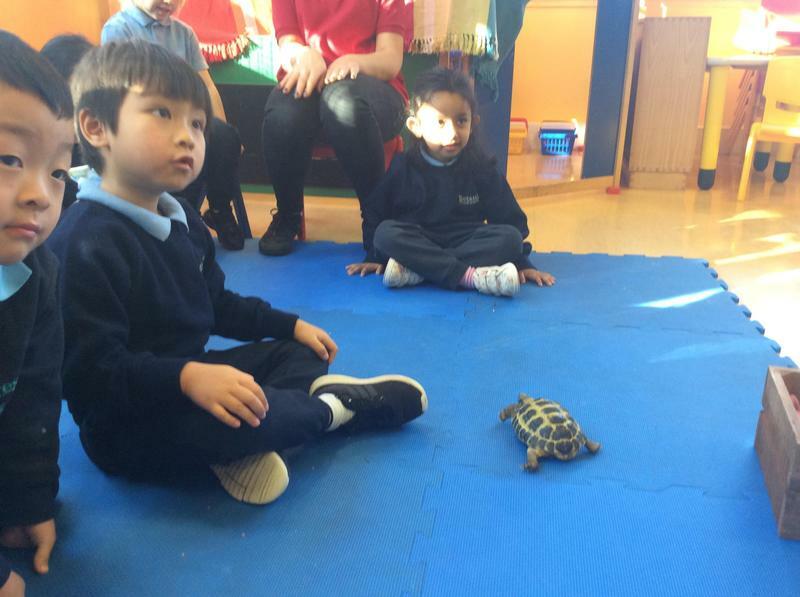 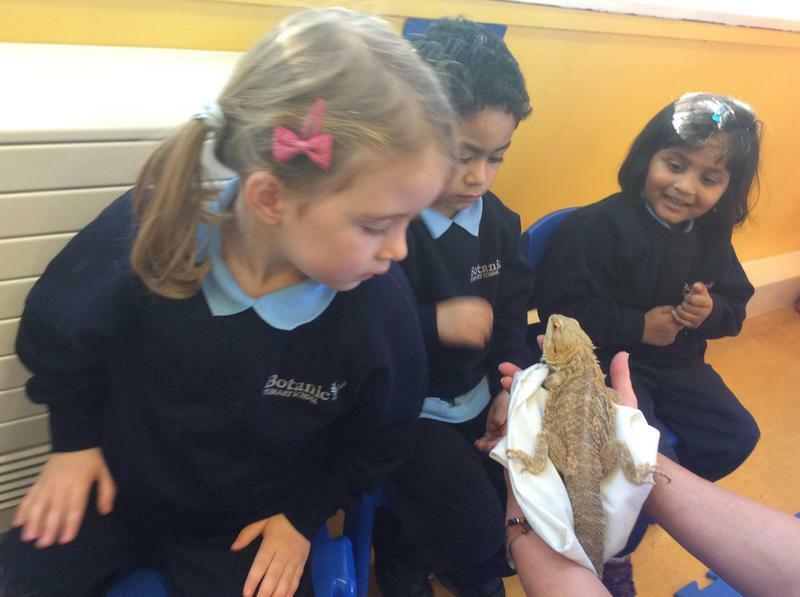 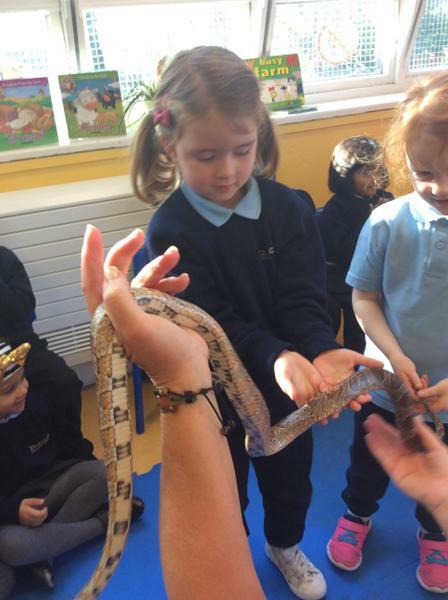 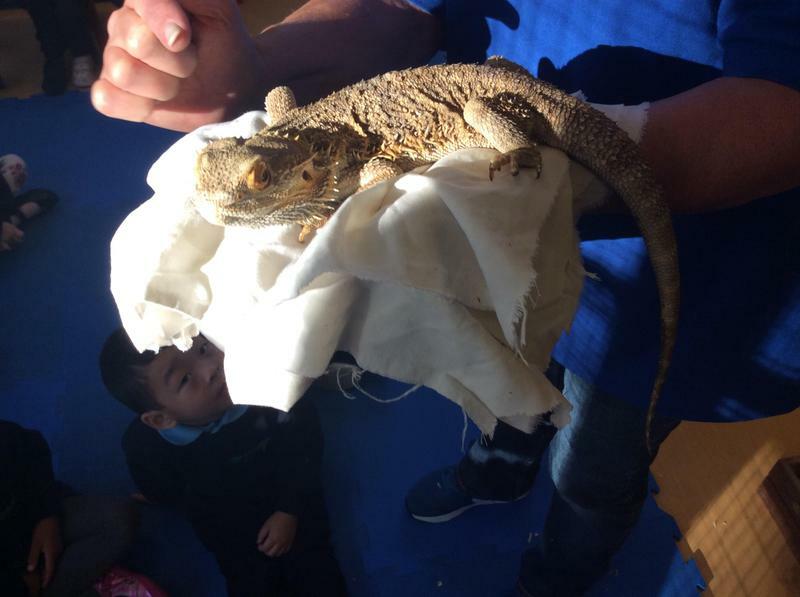 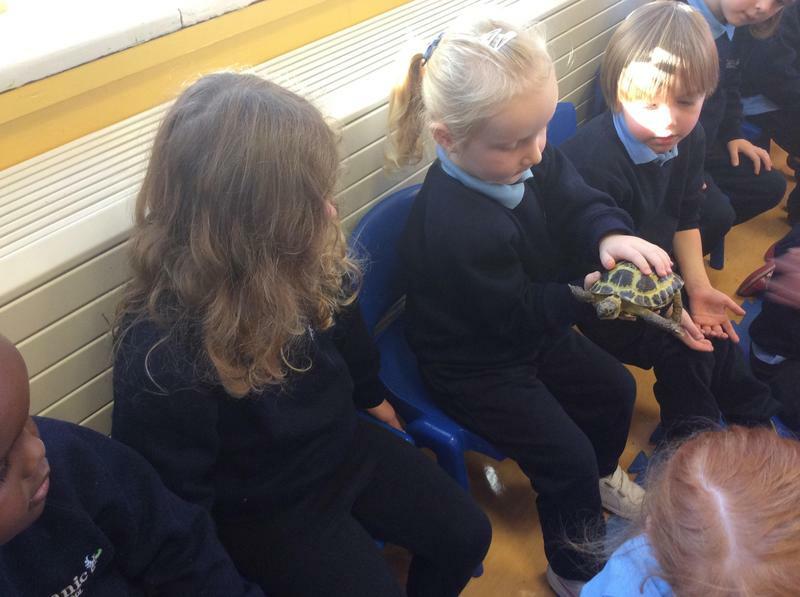 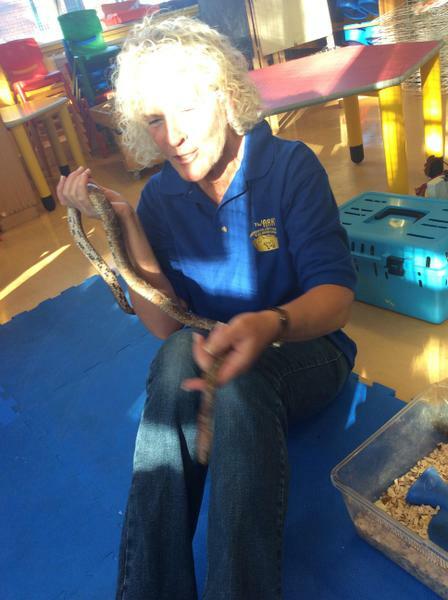 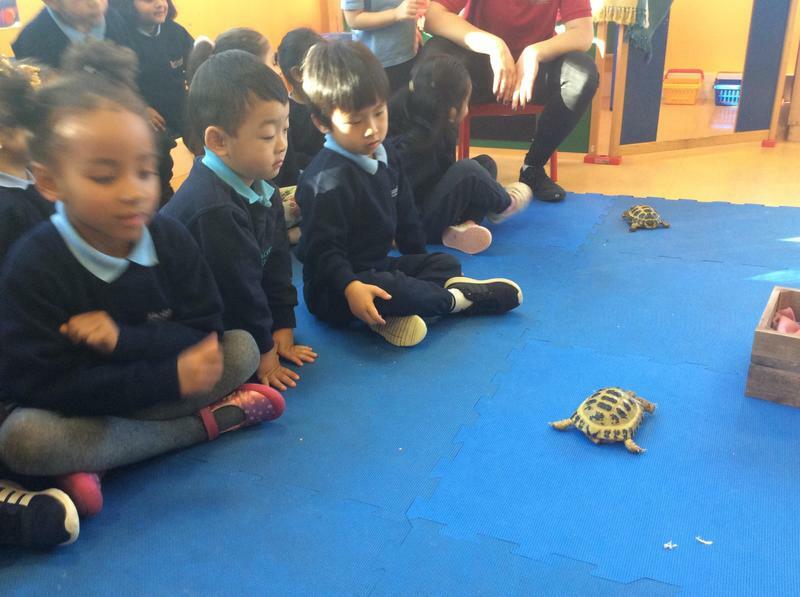 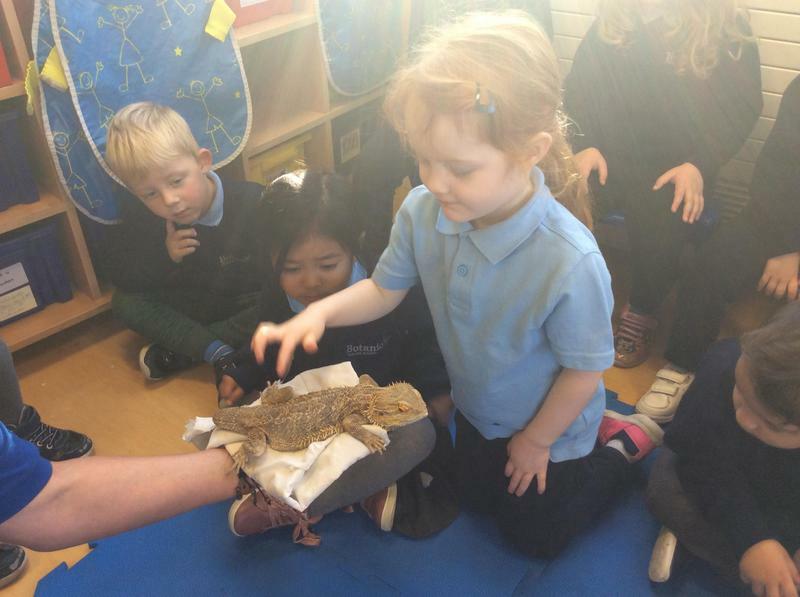 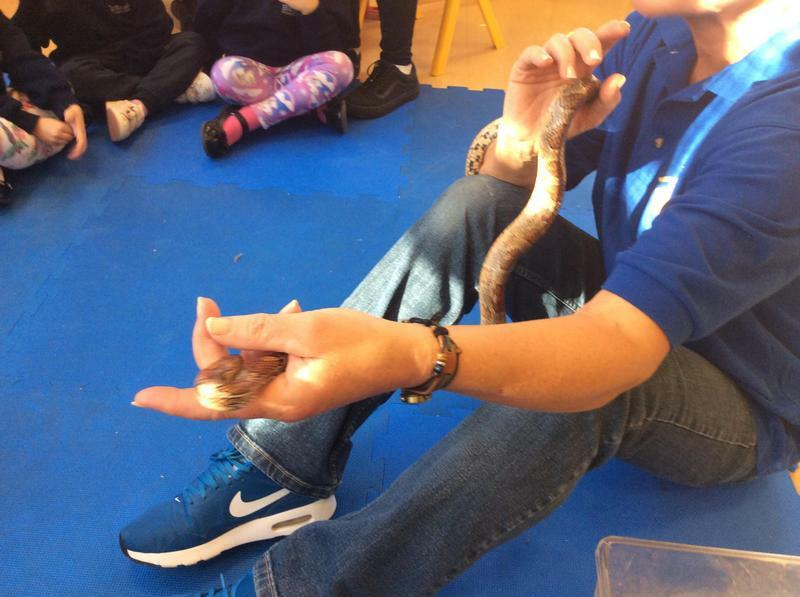 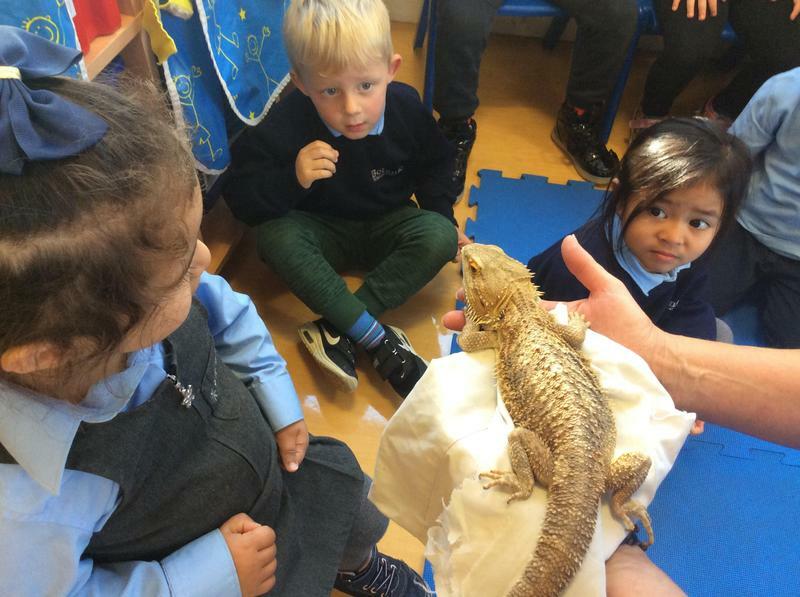 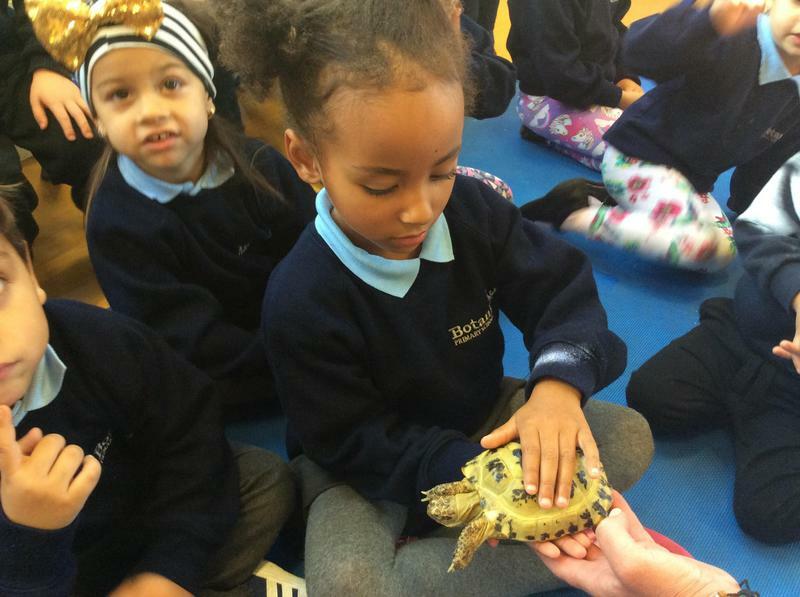 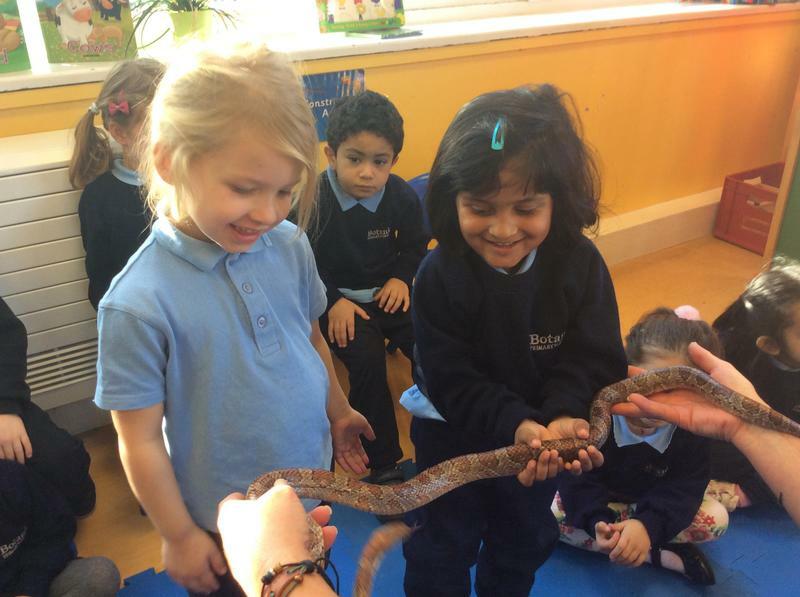 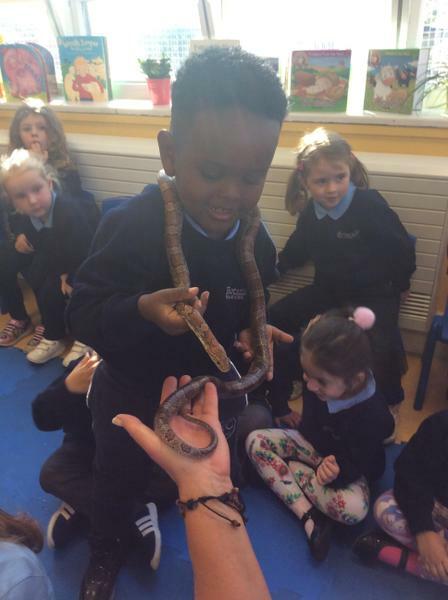 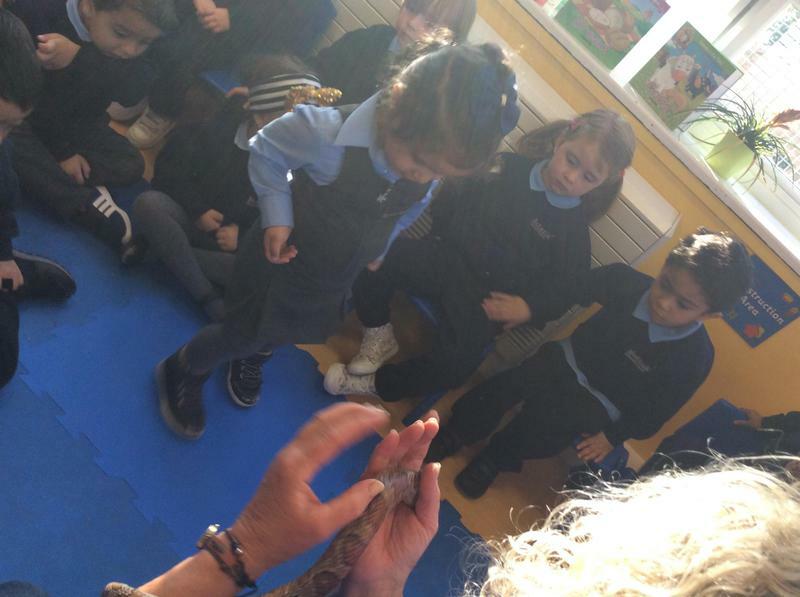 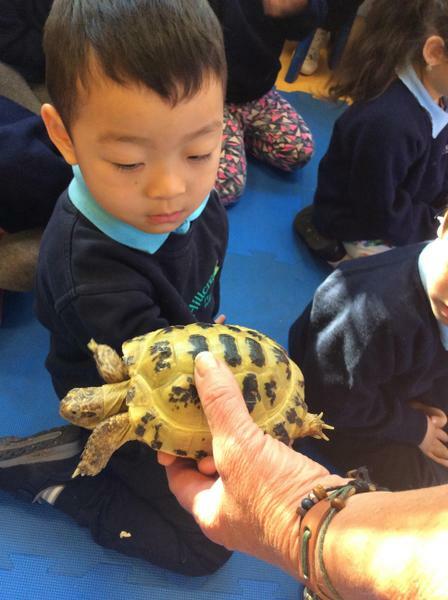 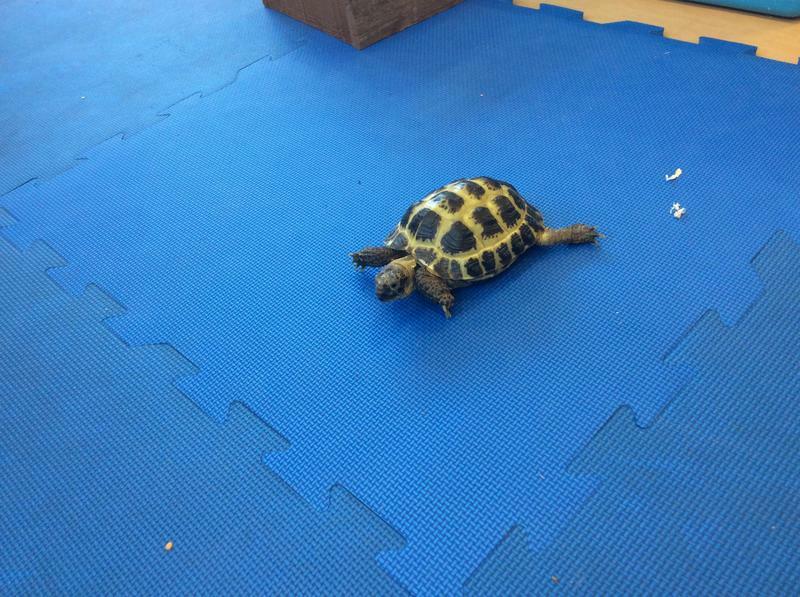 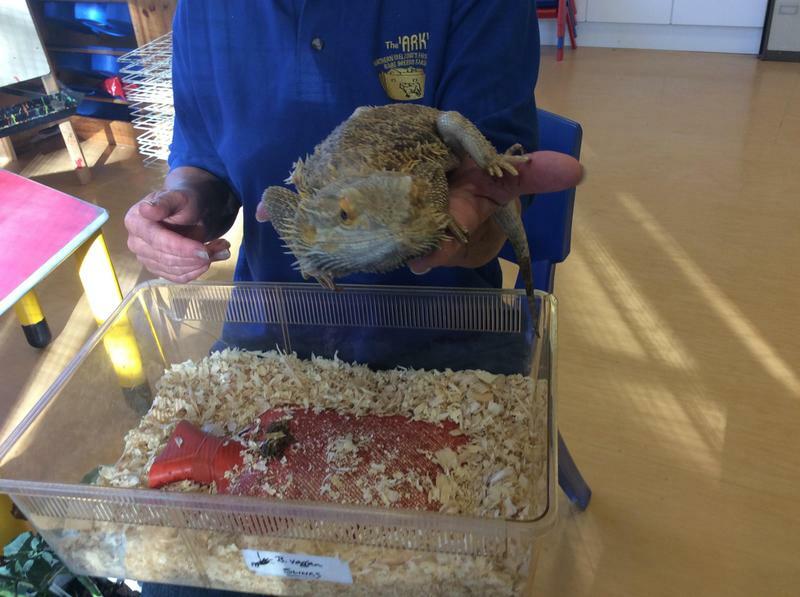 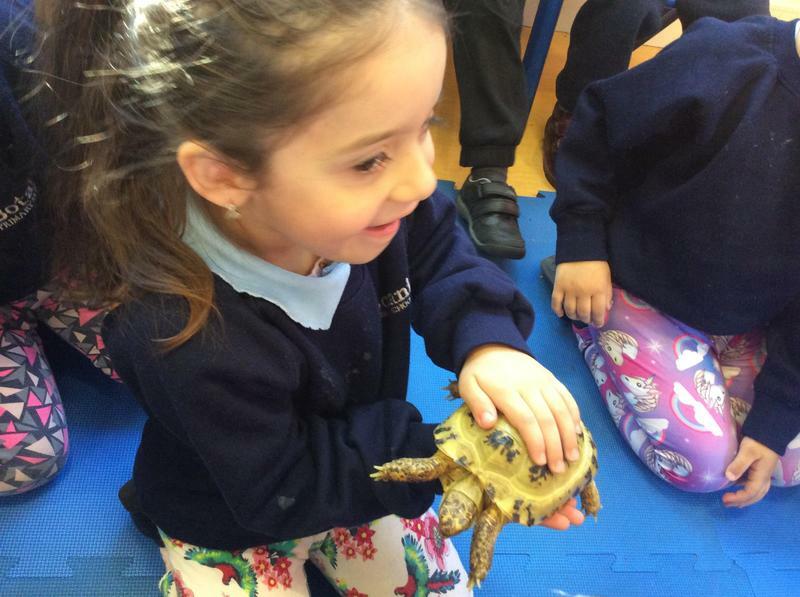 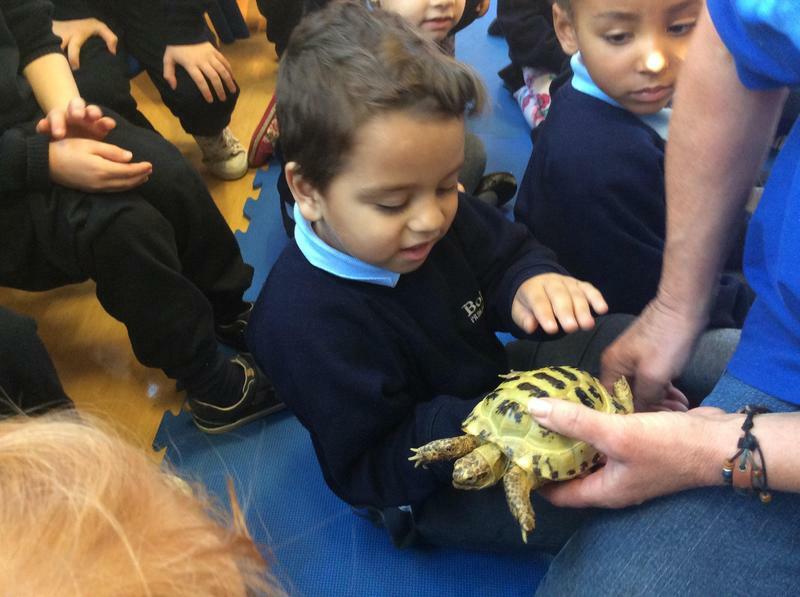 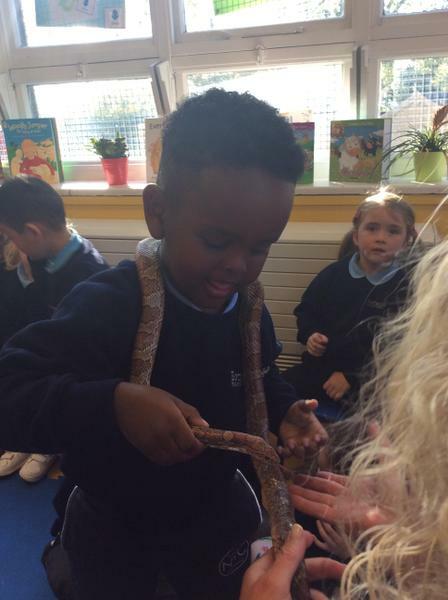 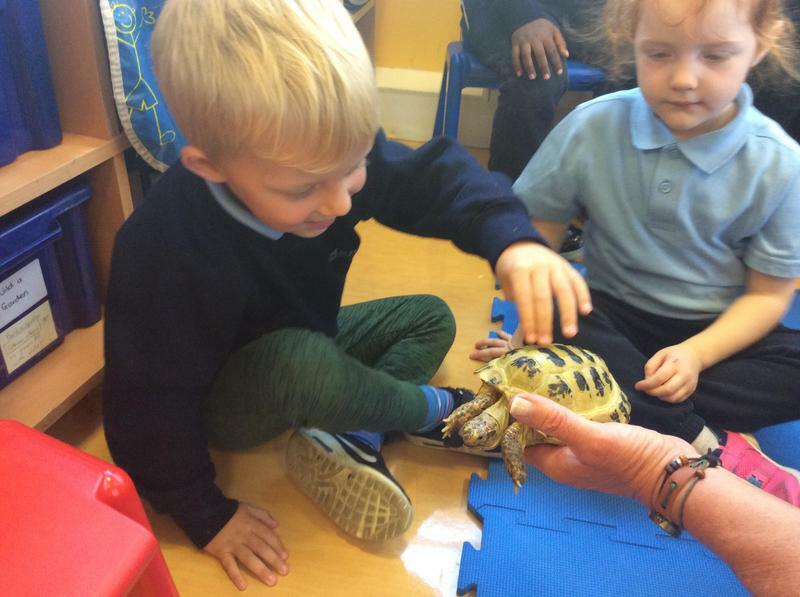 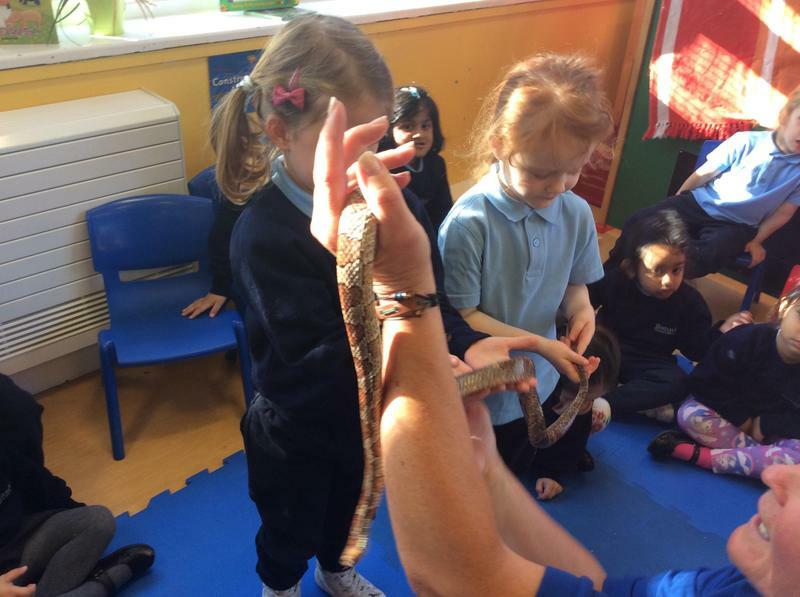 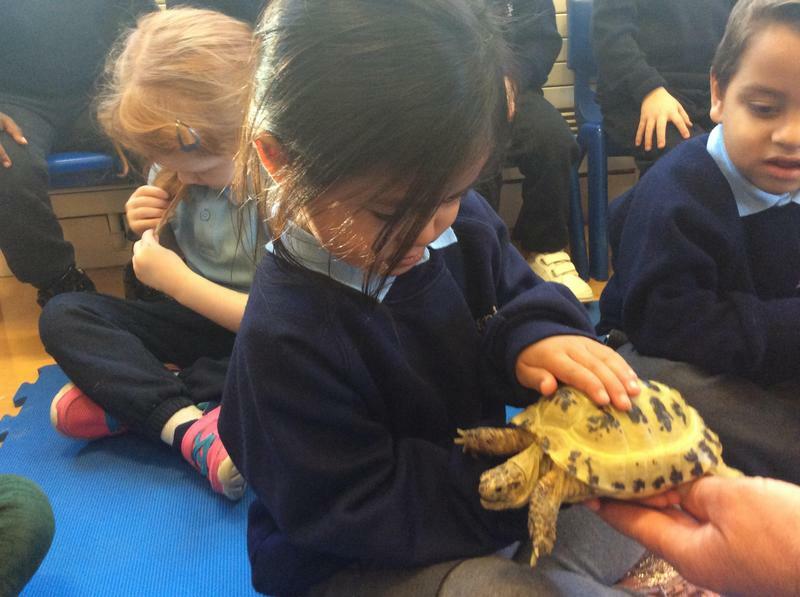 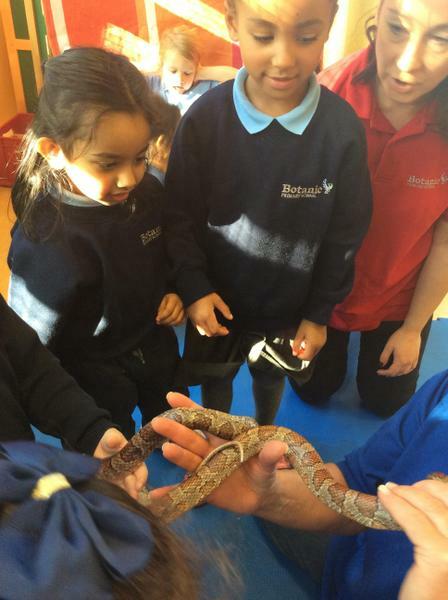 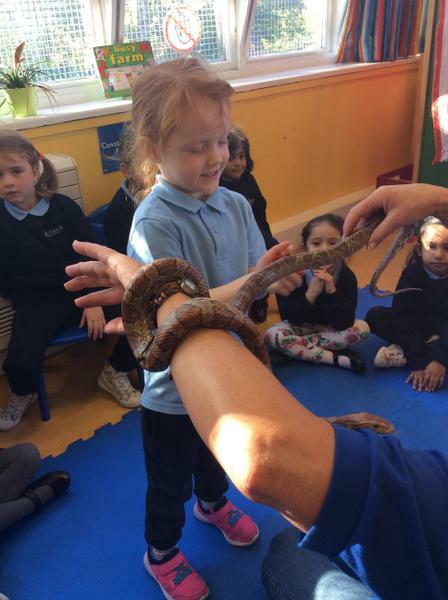 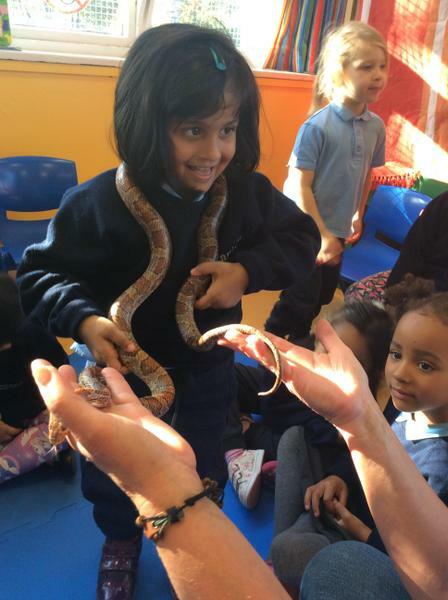 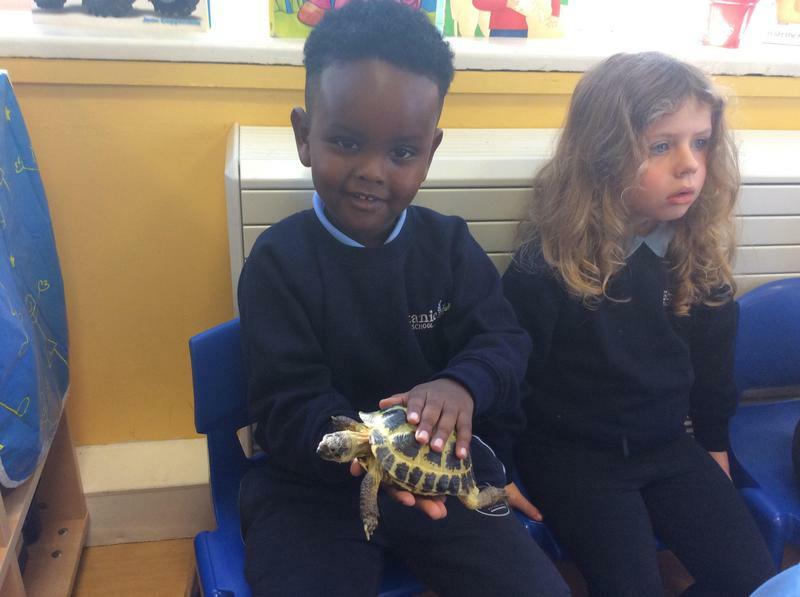 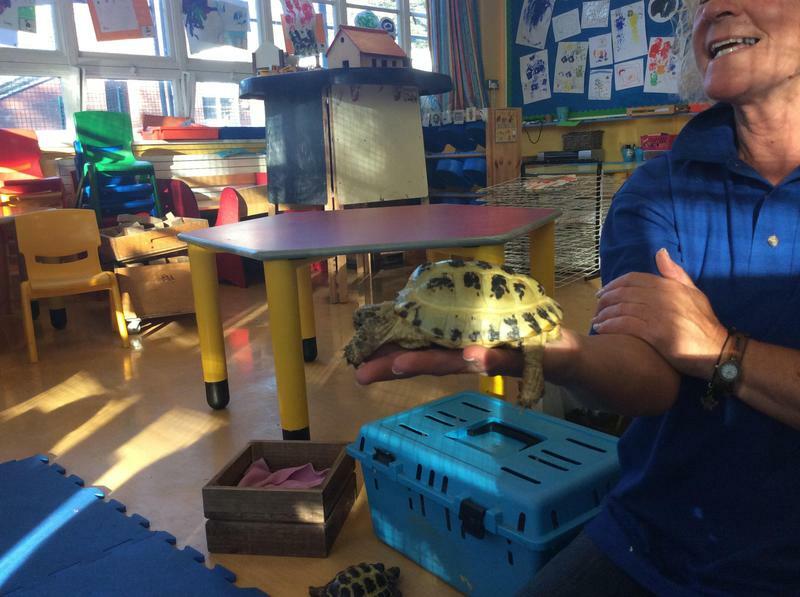 Lorraine brought some interesting animals with her; a hedgehog, bearded dragon, two tortoises and a snake. 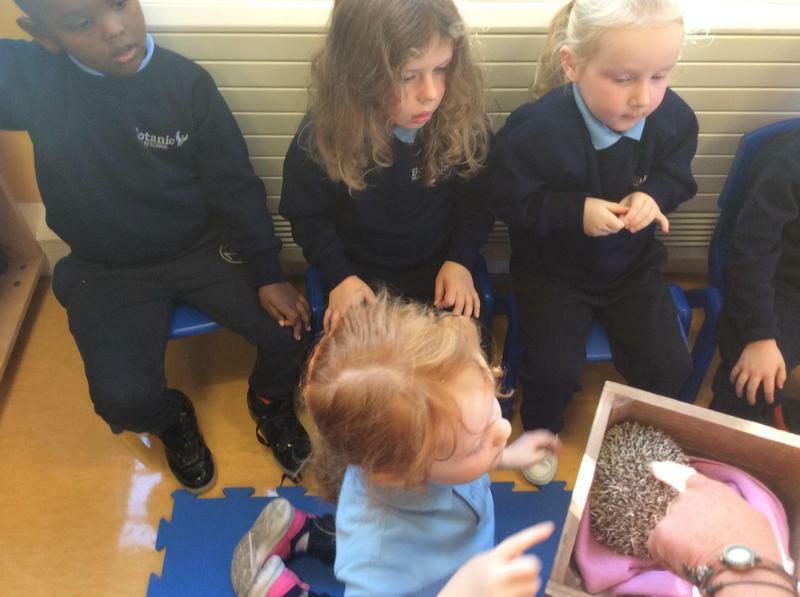 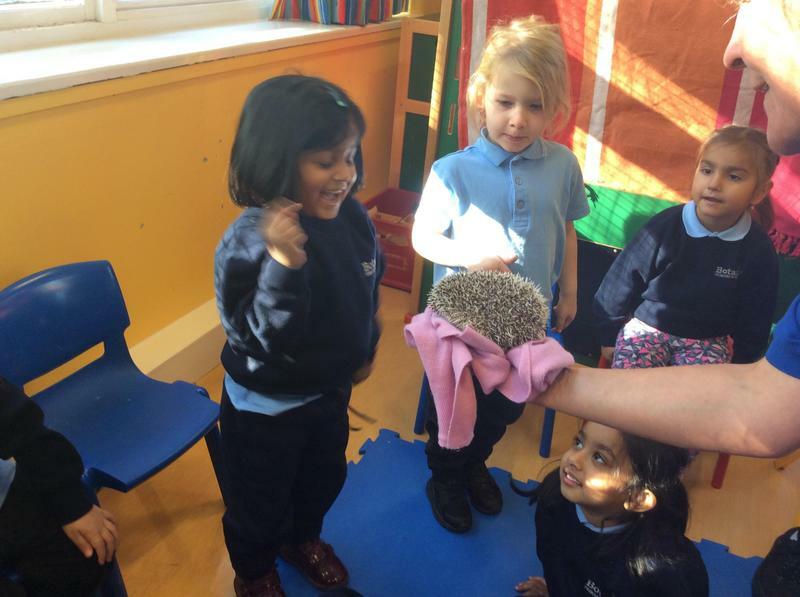 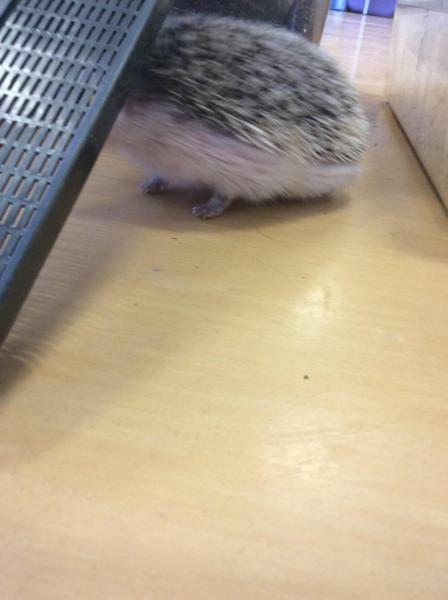 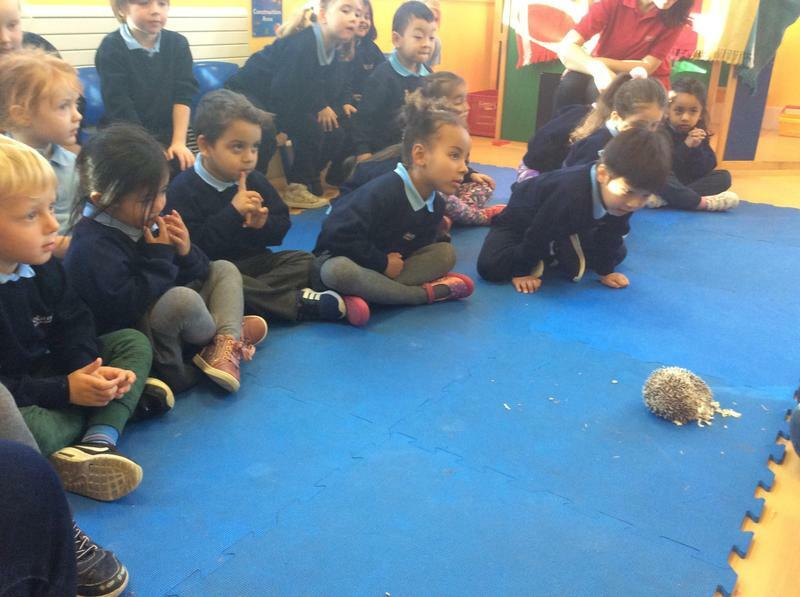 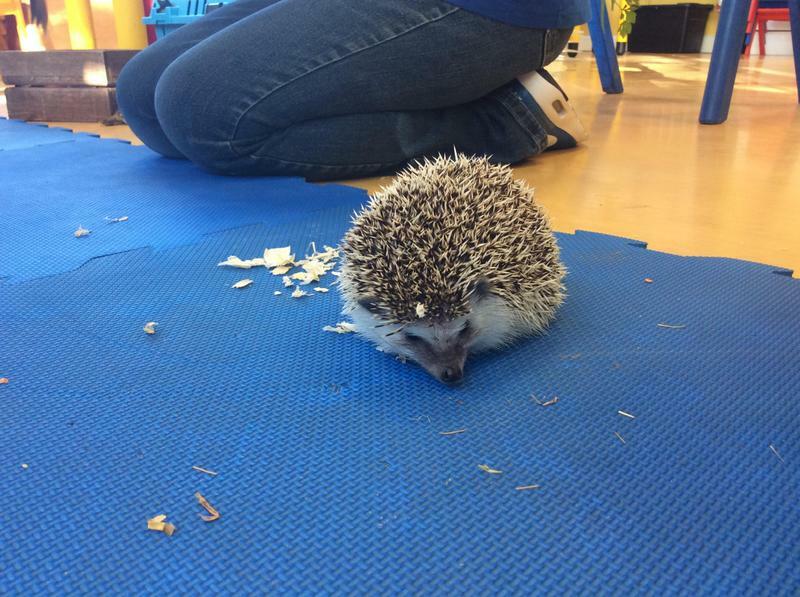 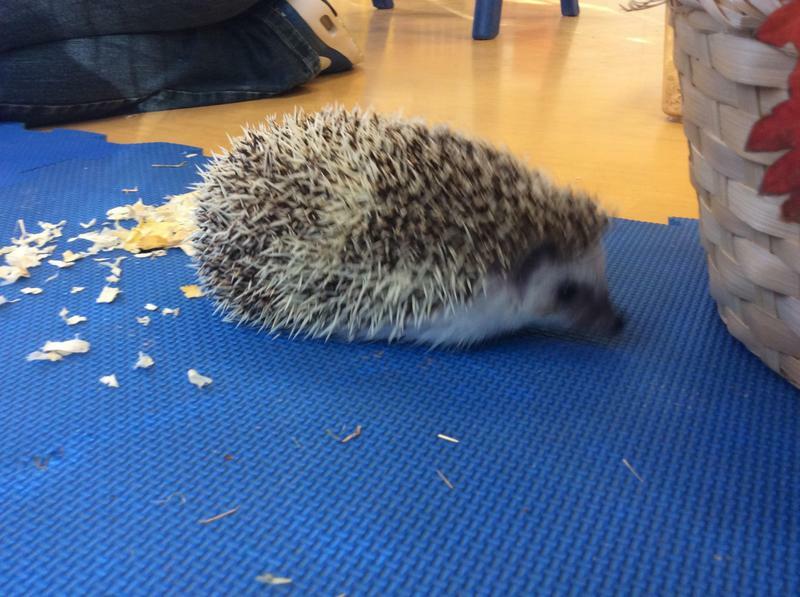 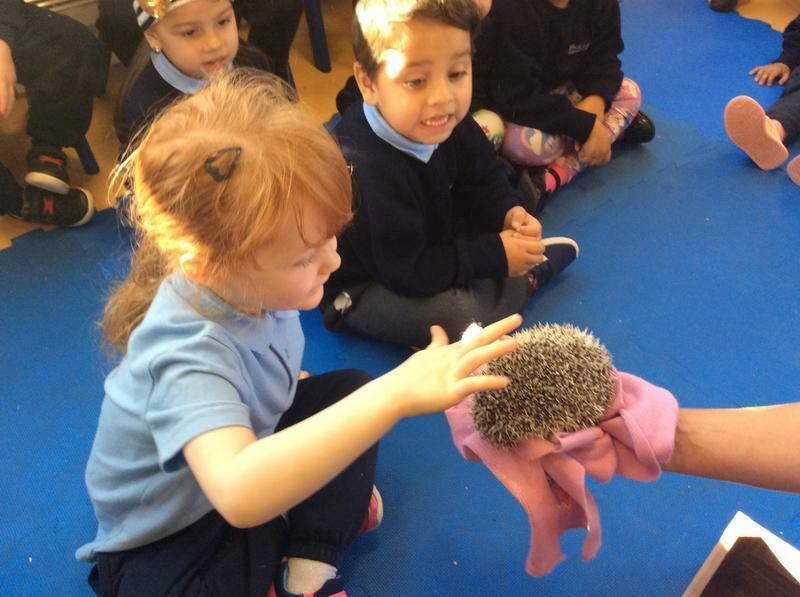 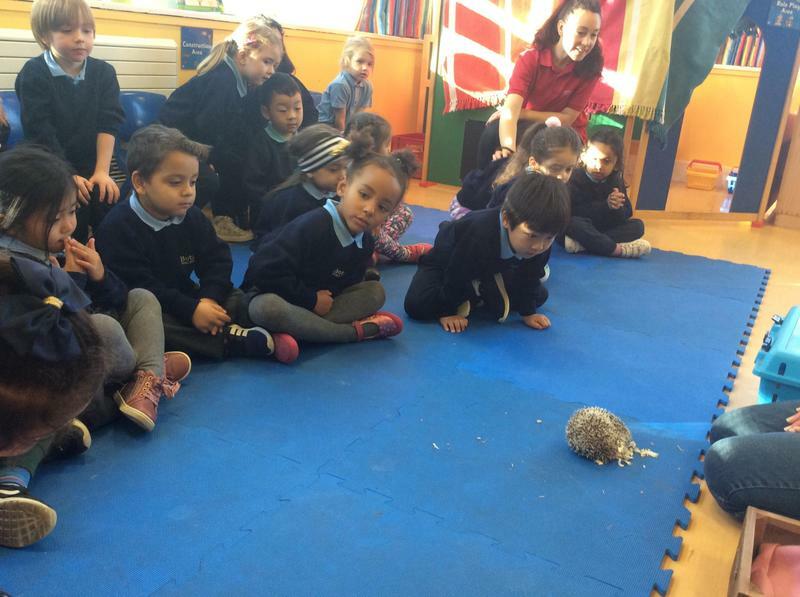 We learnt that Mr Prickles the hedgehog will soon be hibernating until the spring. 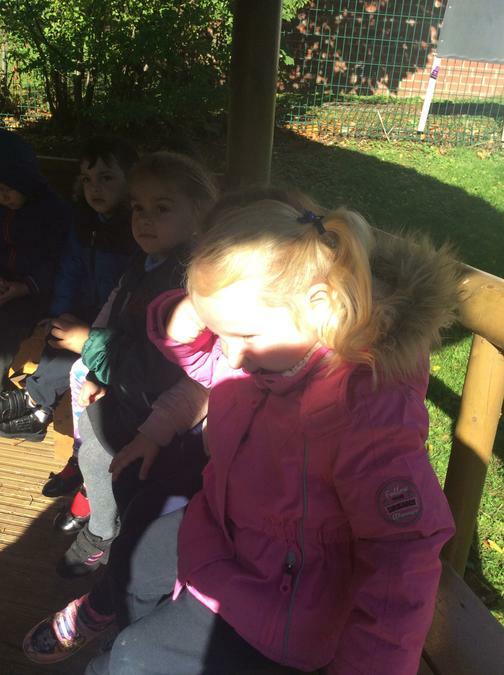 Thank you Lorraine for a fantastic visit! 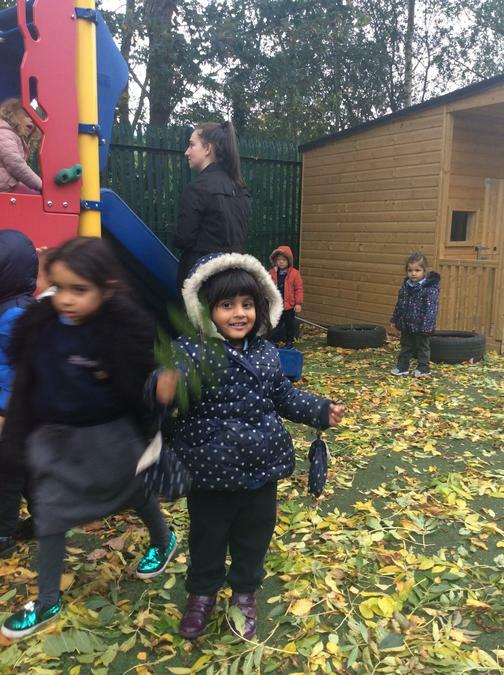 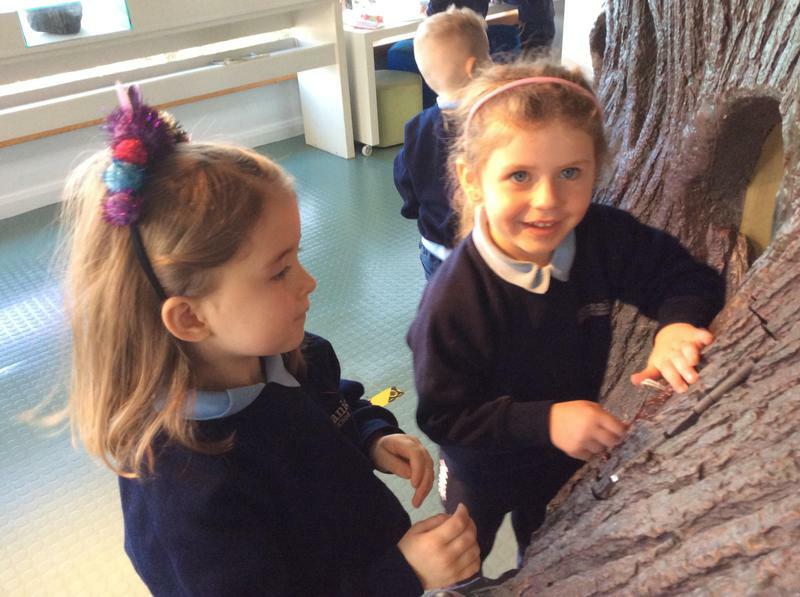 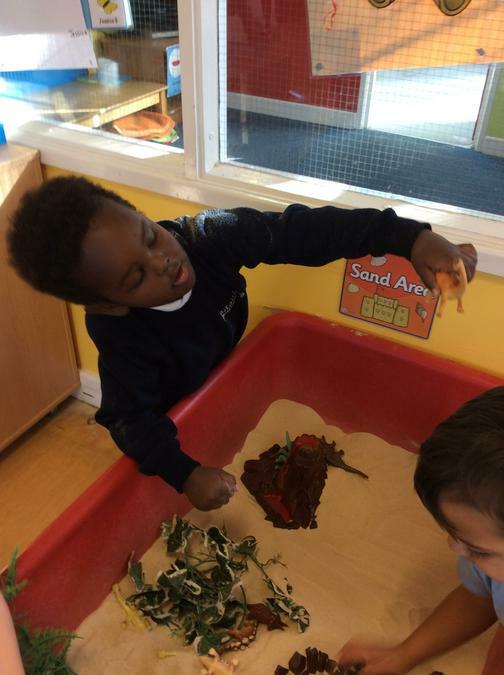 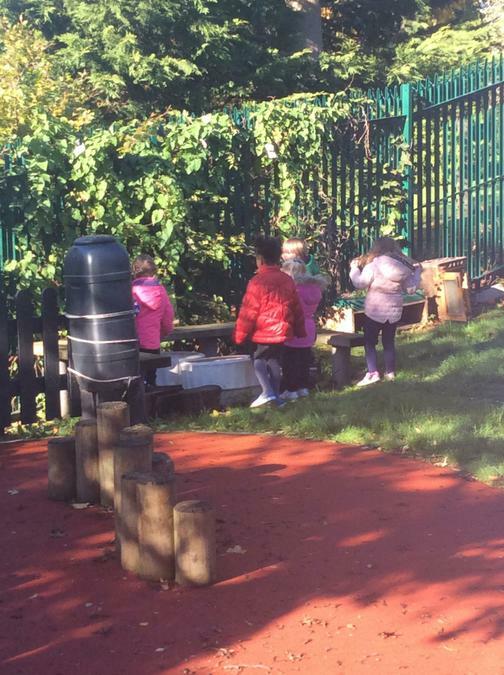 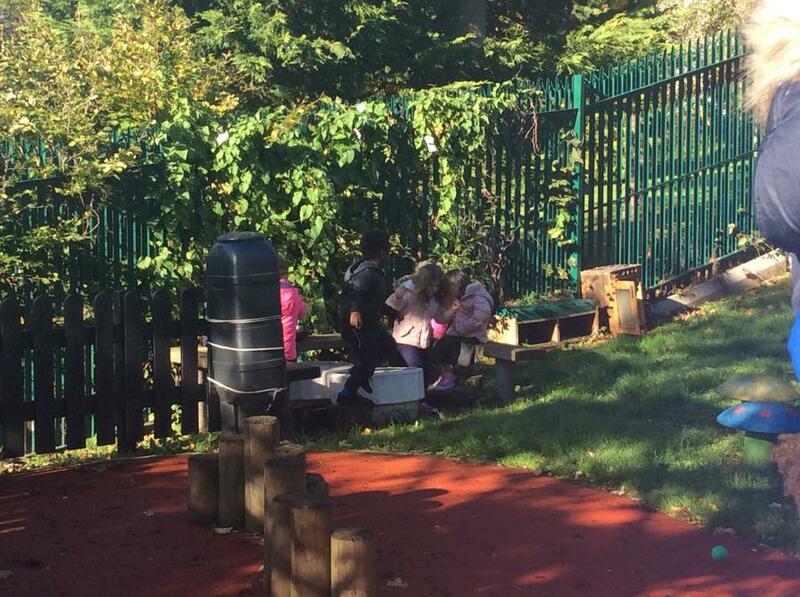 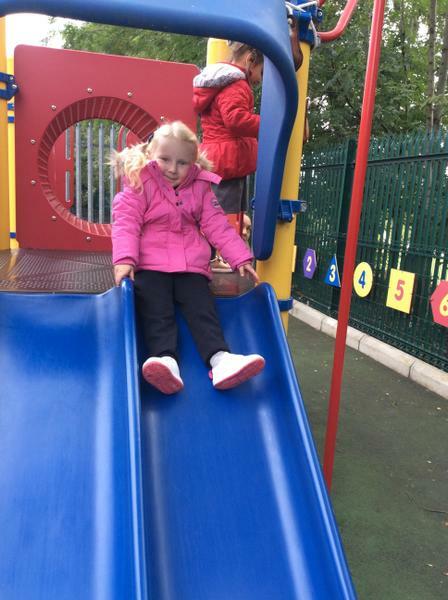 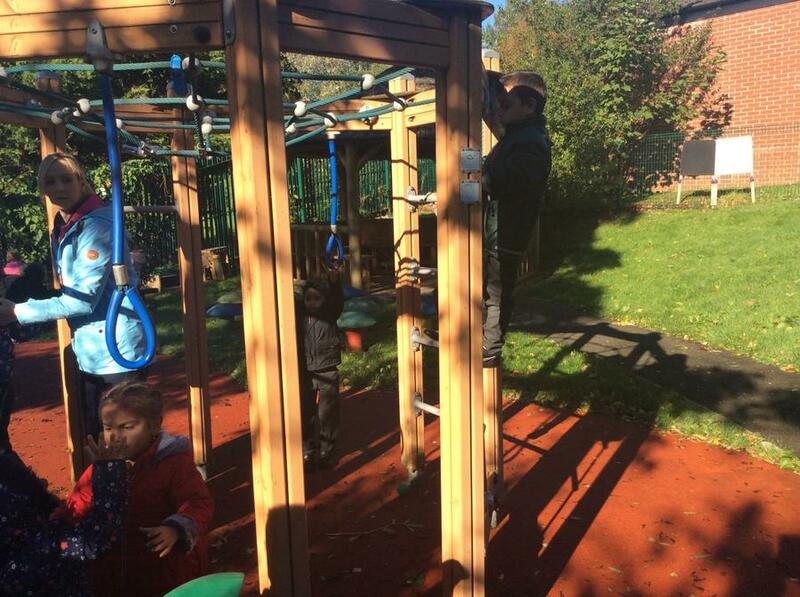 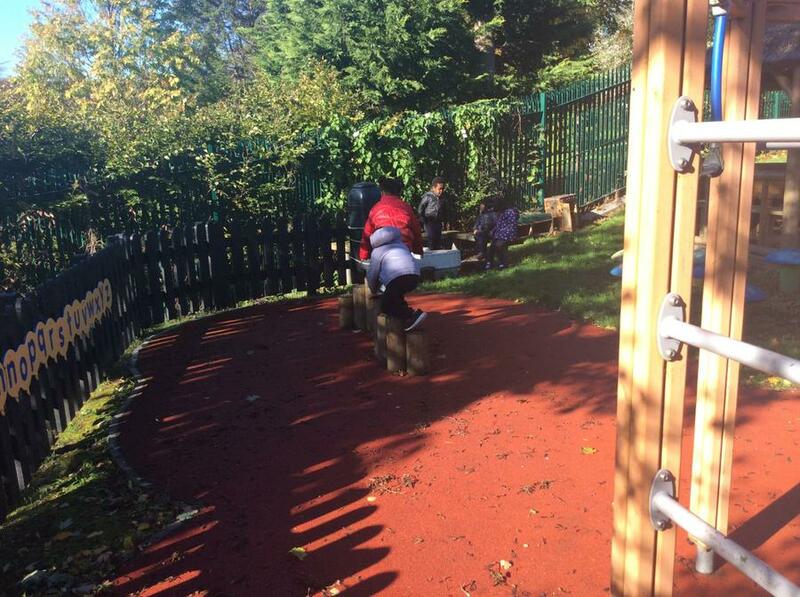 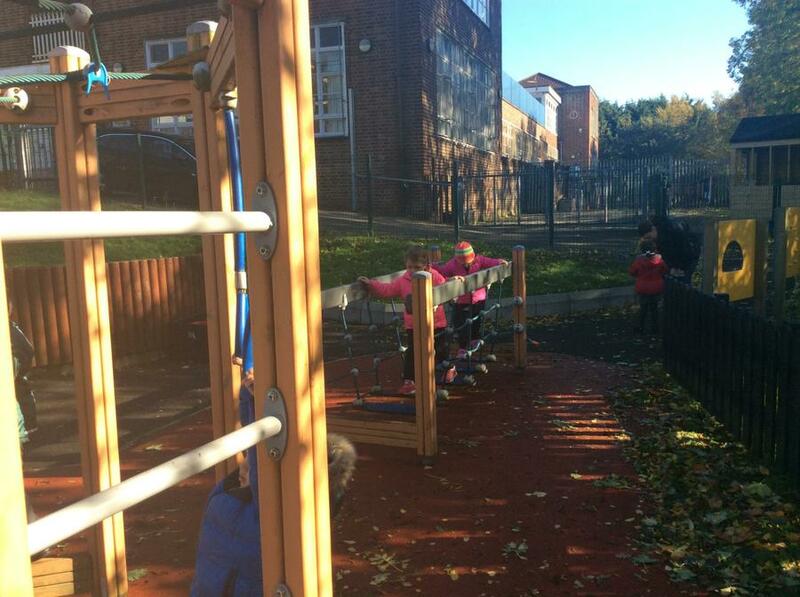 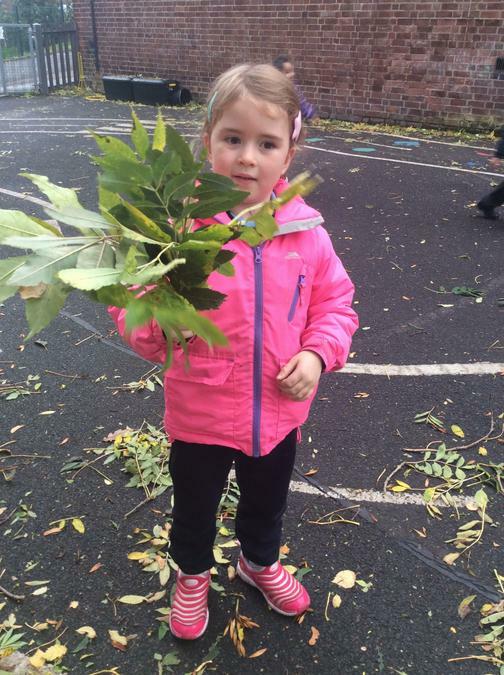 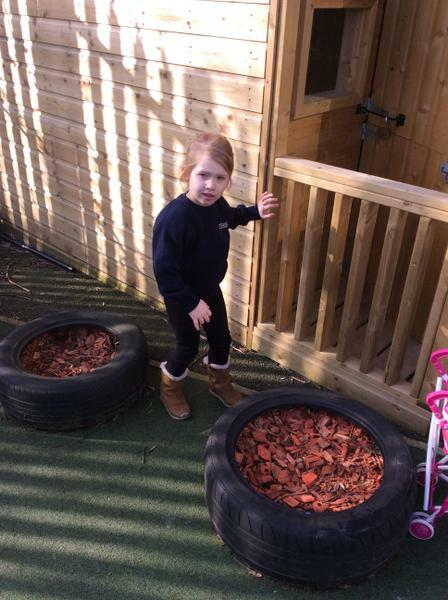 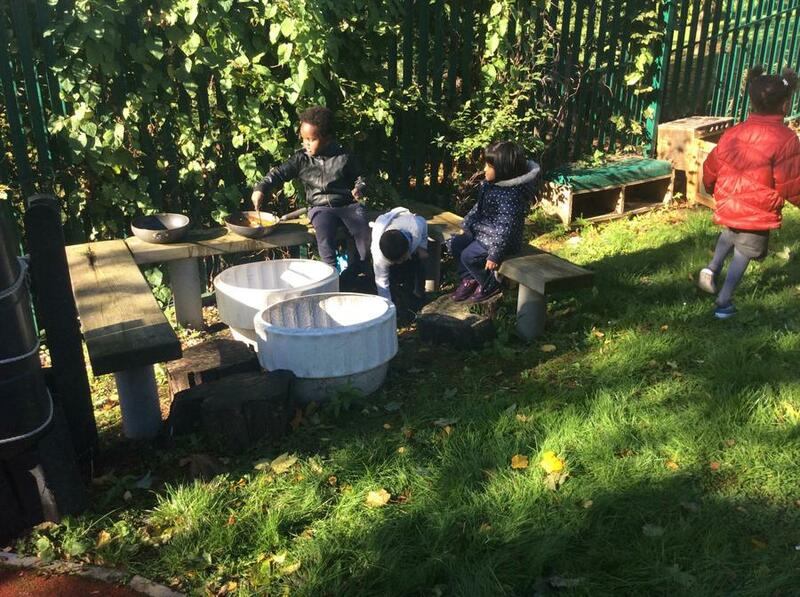 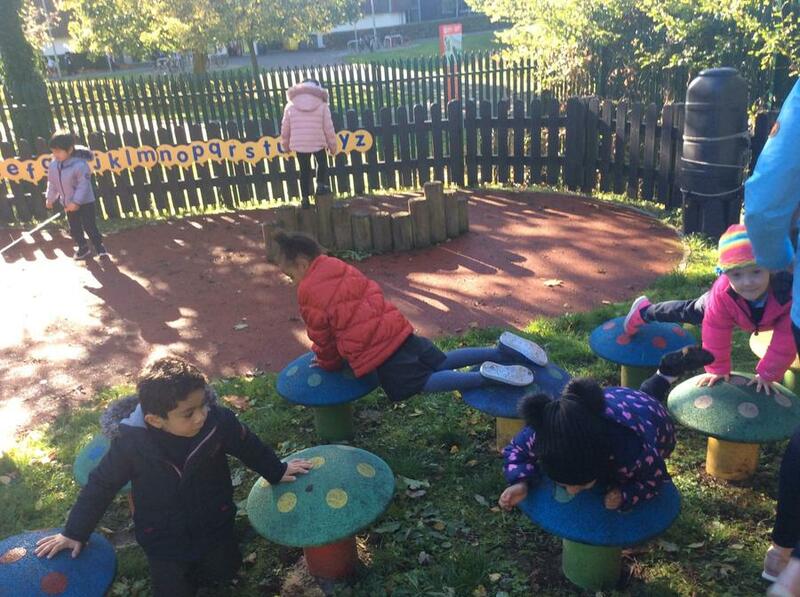 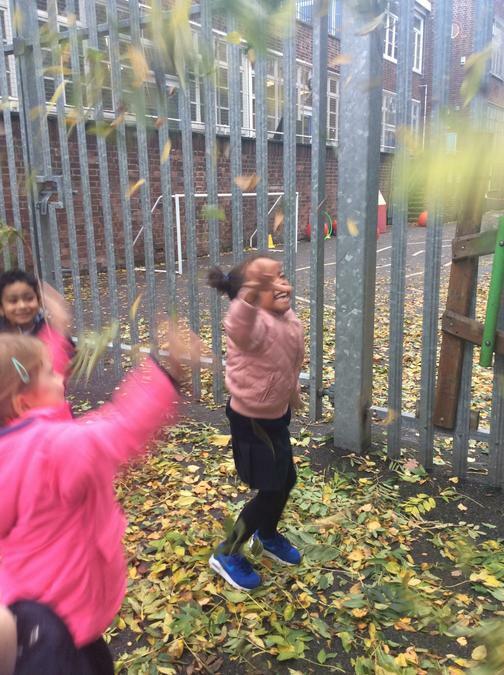 We have been exploring the Autumnal changes in our playground and garden. 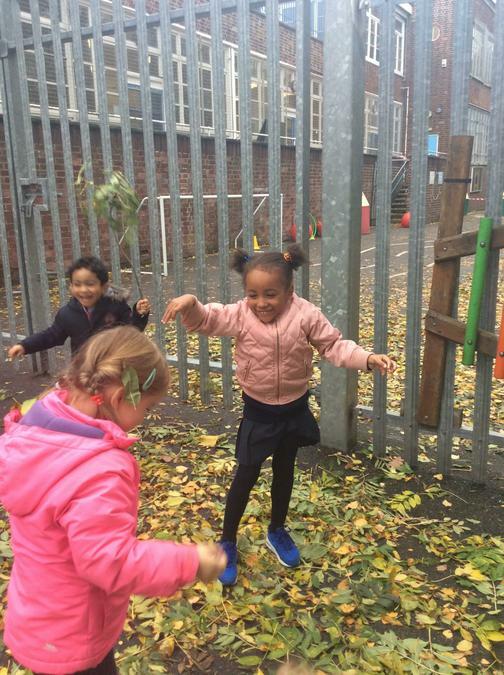 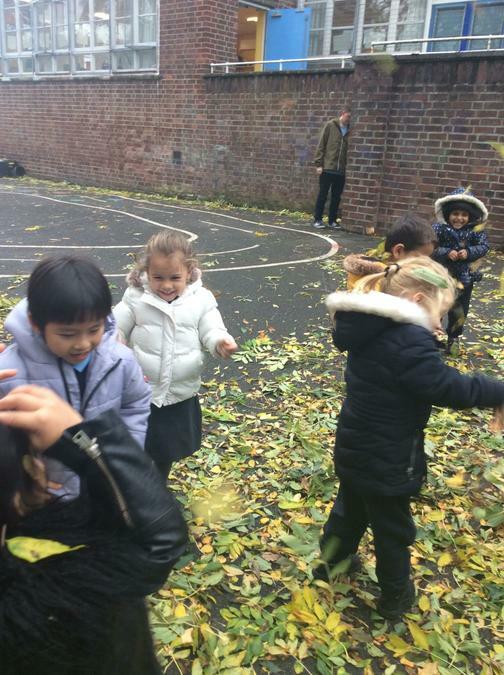 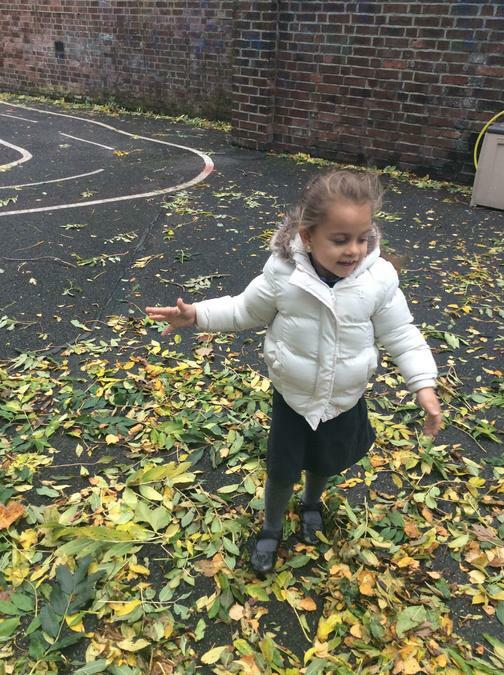 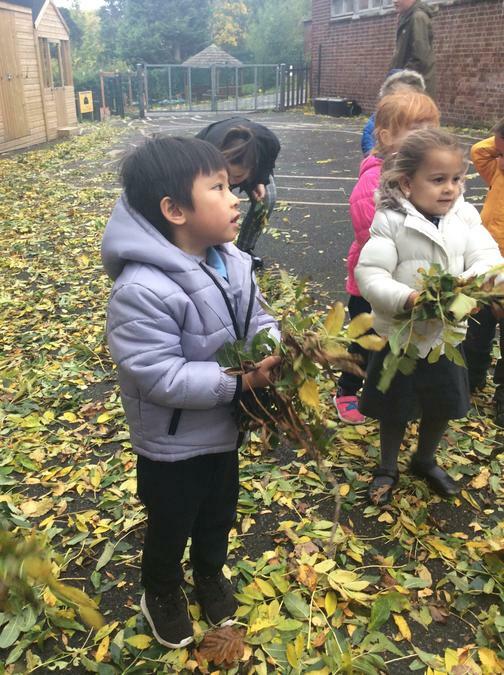 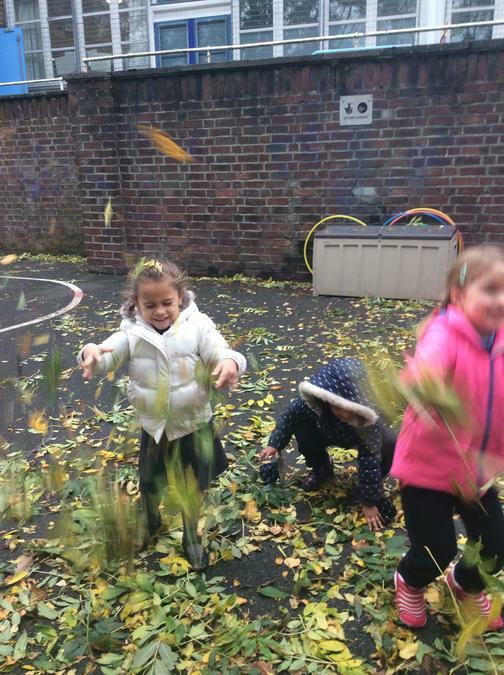 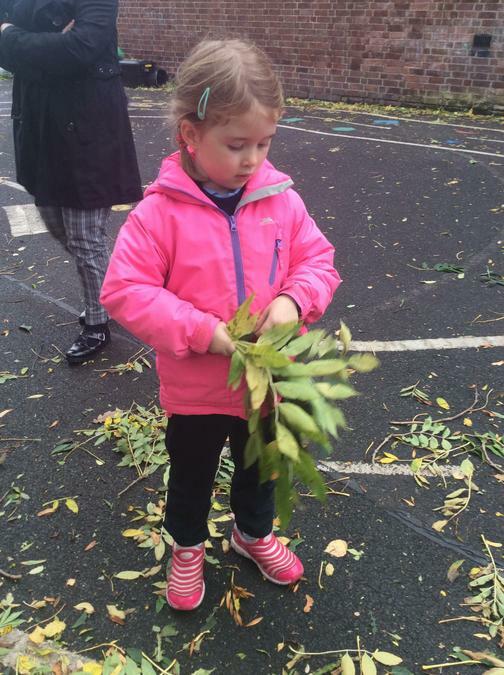 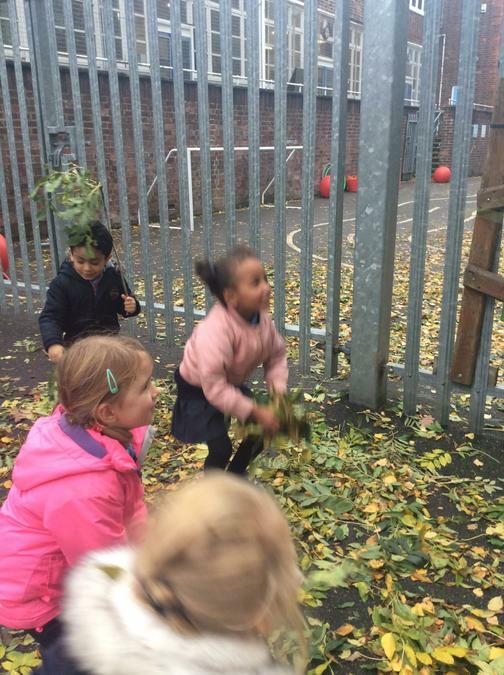 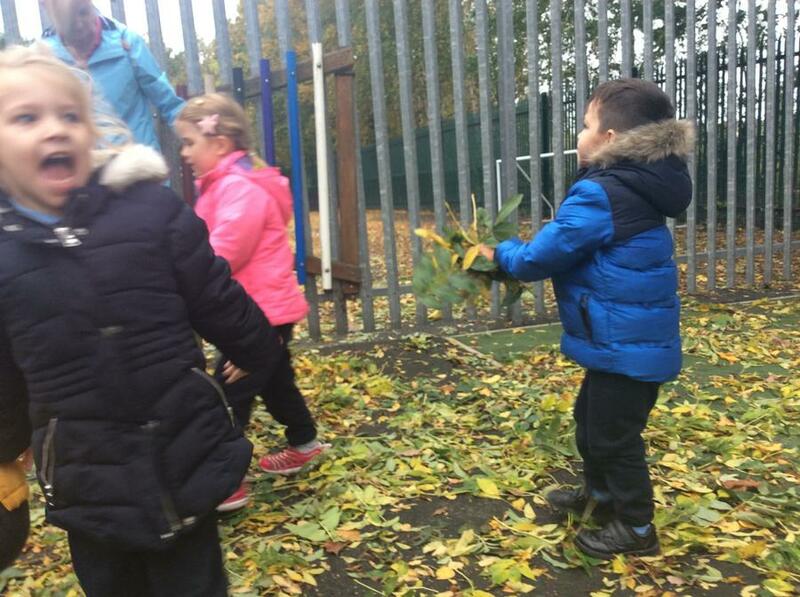 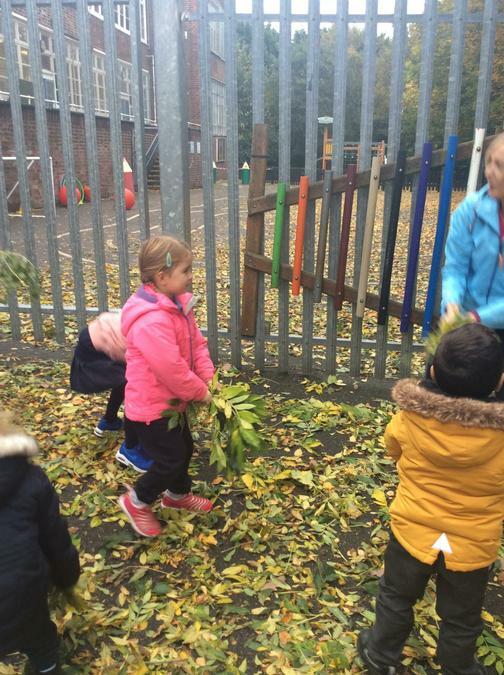 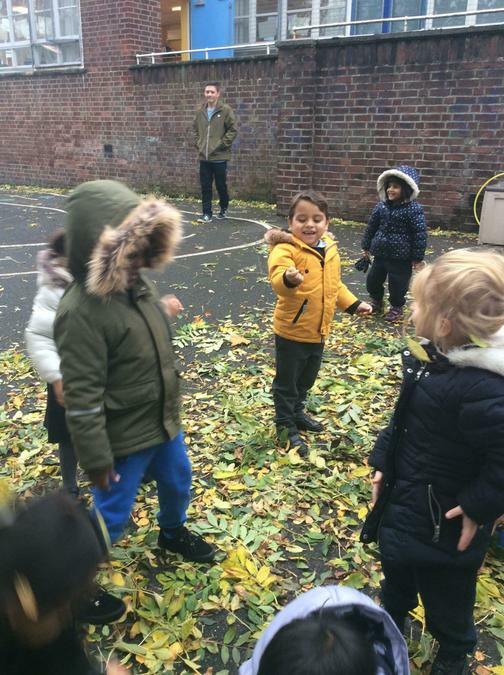 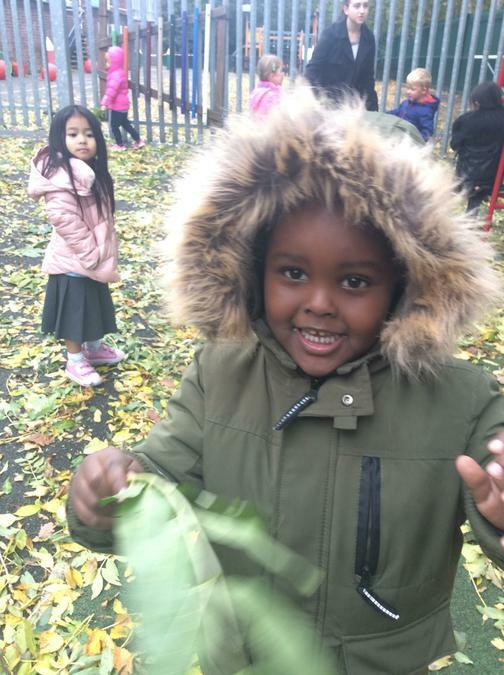 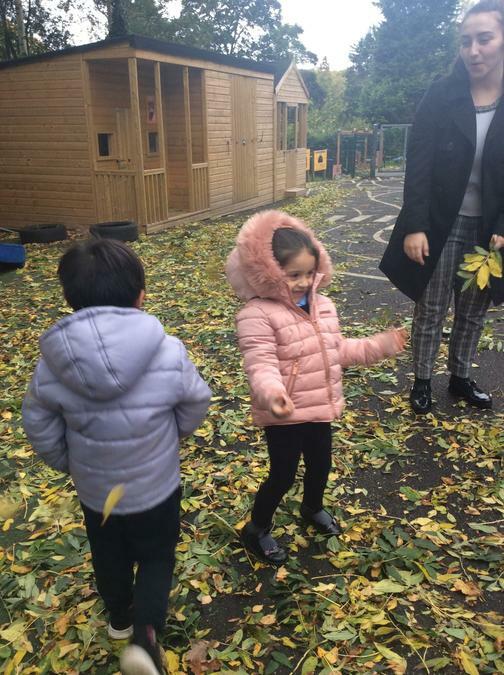 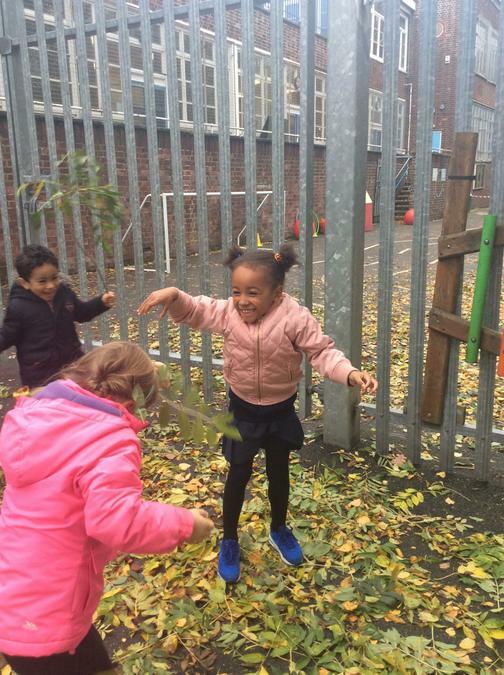 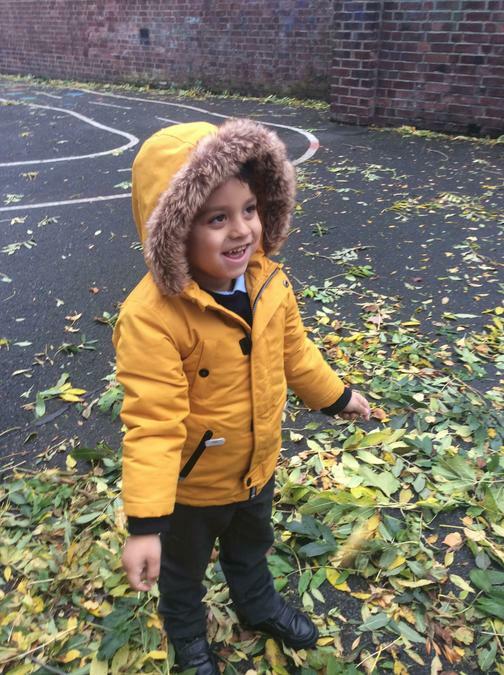 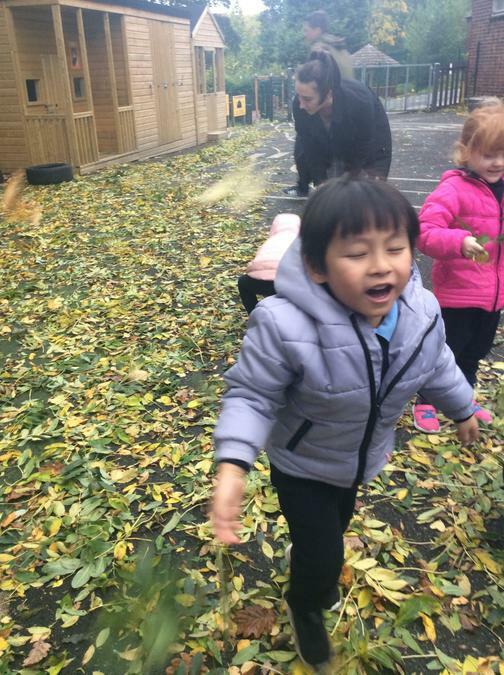 We are enjoying kicking and brushing up the leaves, throwing leaves into the wind and collecting leaves. 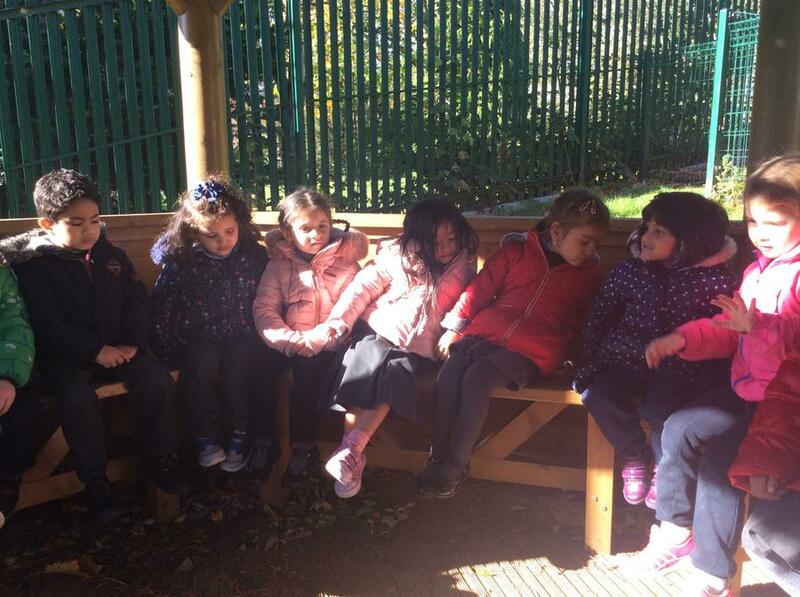 We have even enjoyed some Autunmal stories in our hut in the garden. 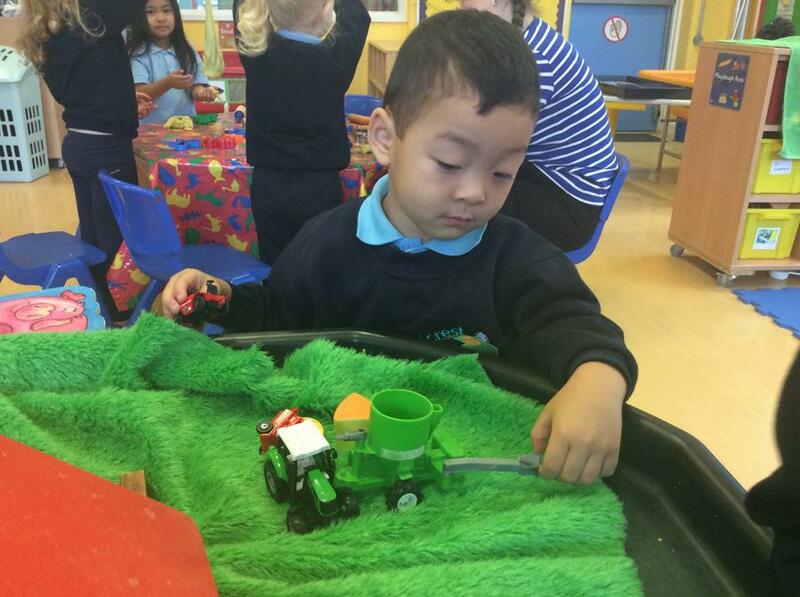 As part of our topic of ‘Autumn’ we have been exploring the role of a farmer and thinking about where our food comes from. 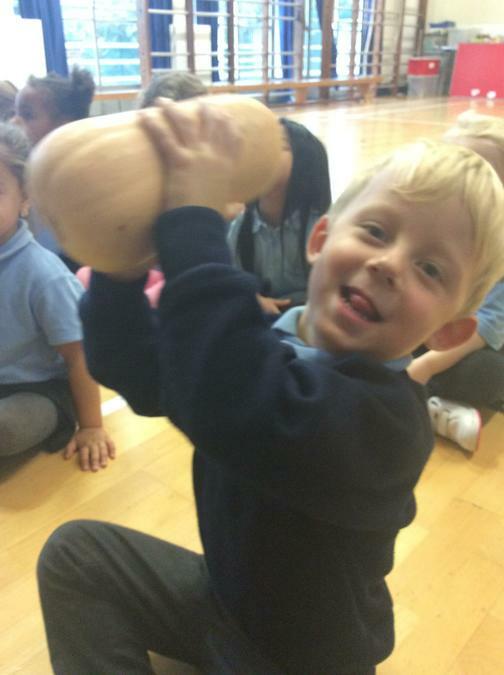 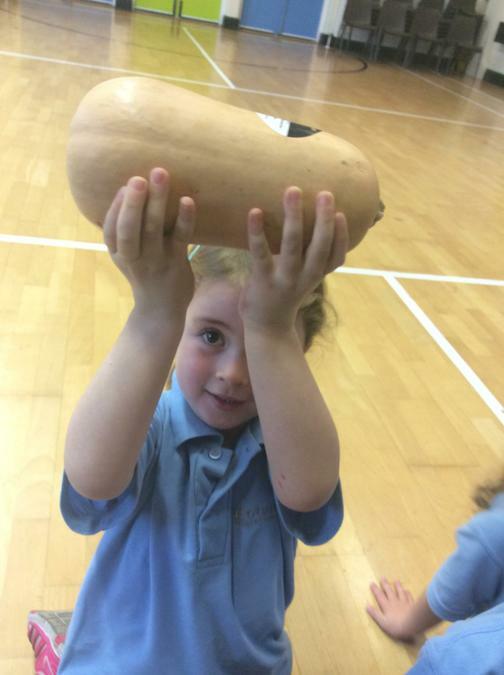 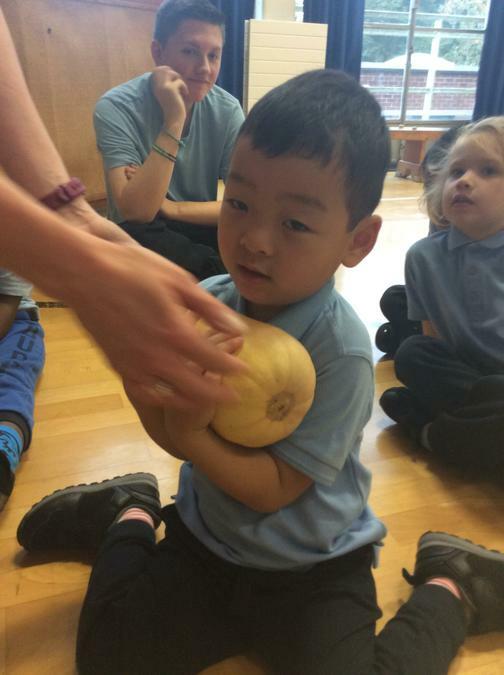 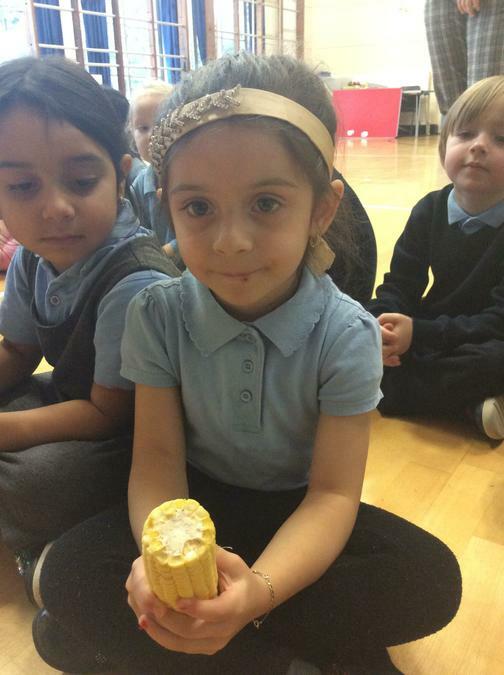 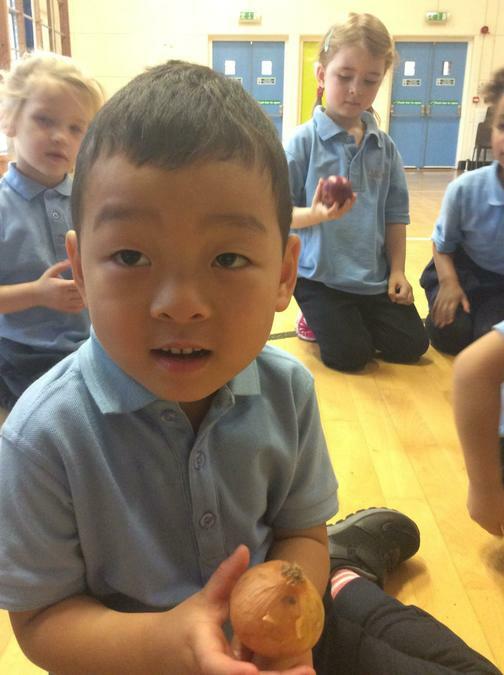 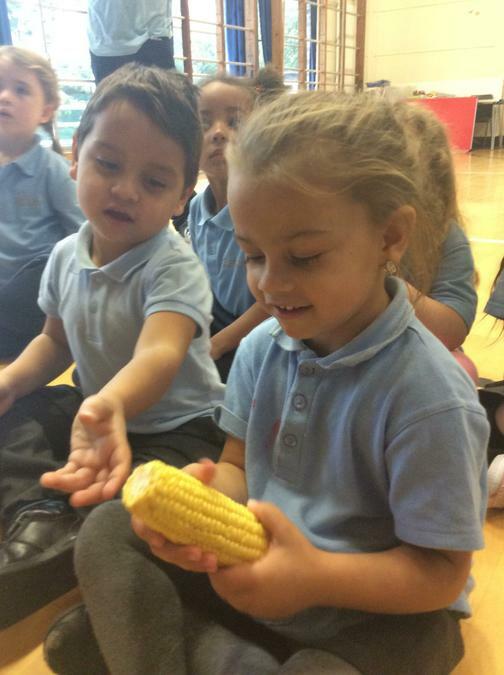 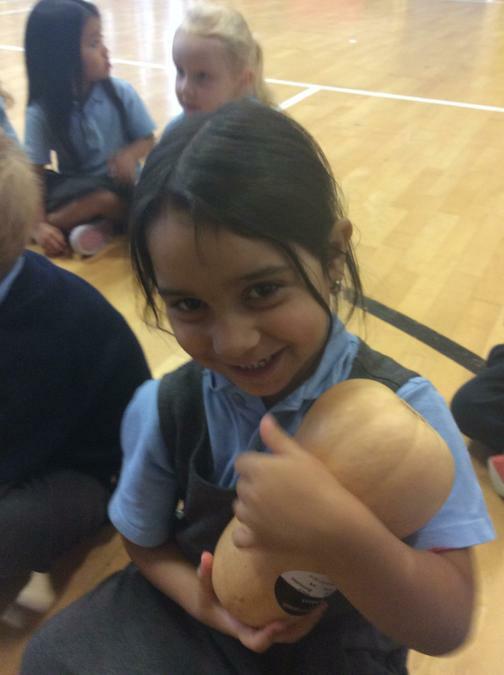 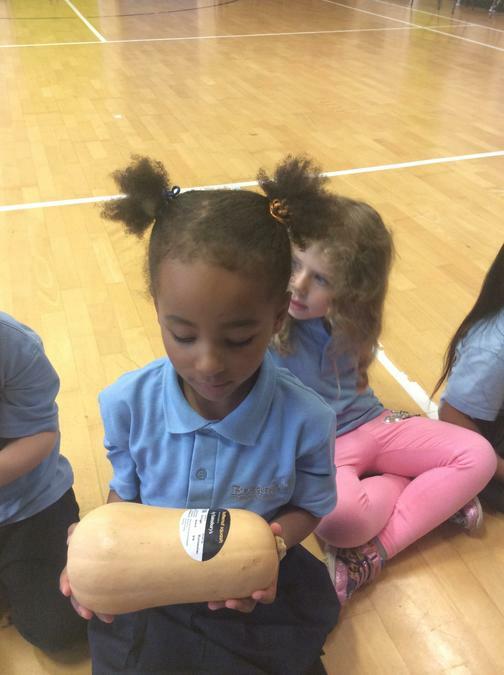 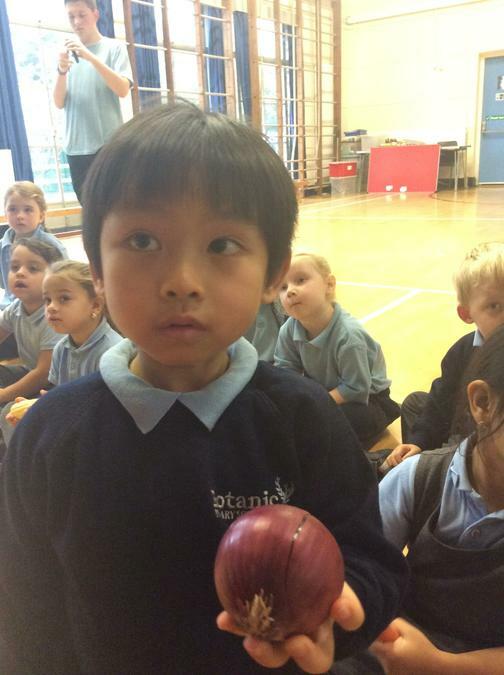 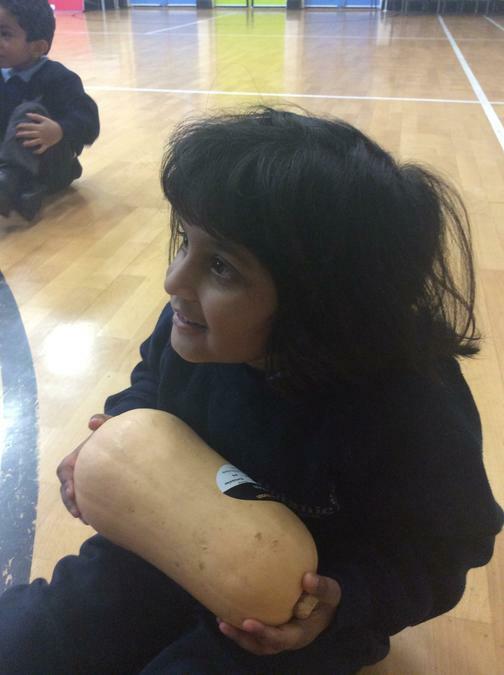 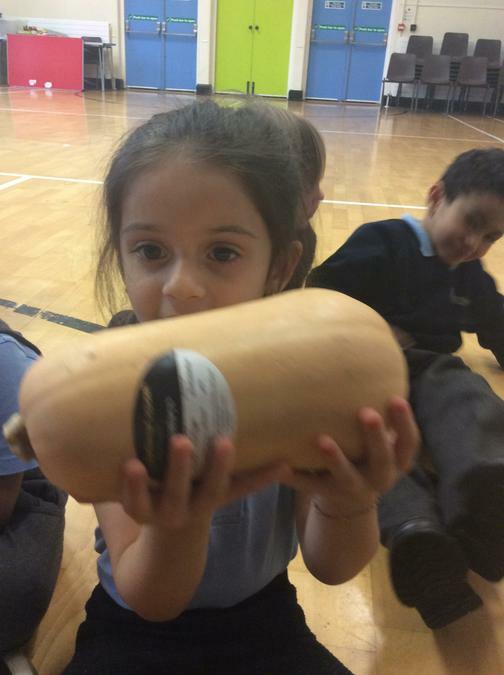 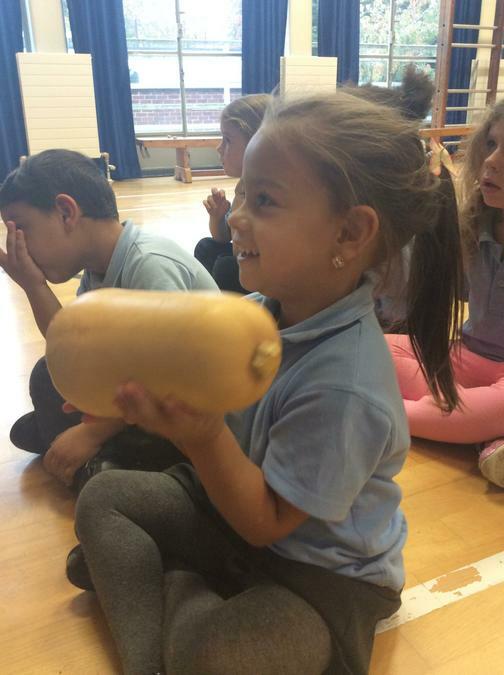 We went up to the hall to look at the harvest display and explored some harvest foods with our senses. 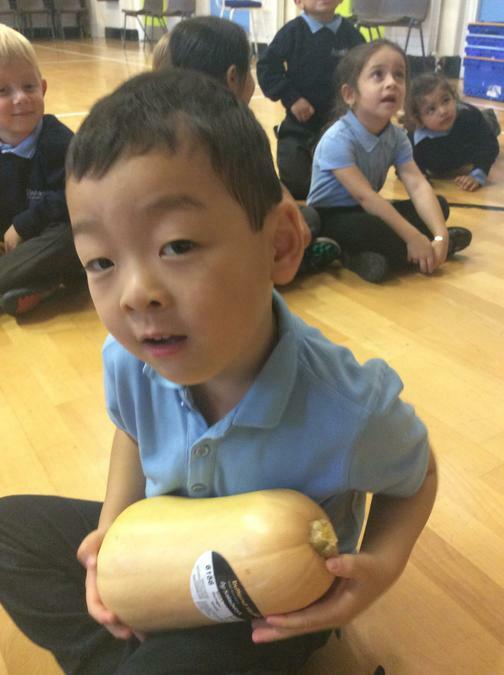 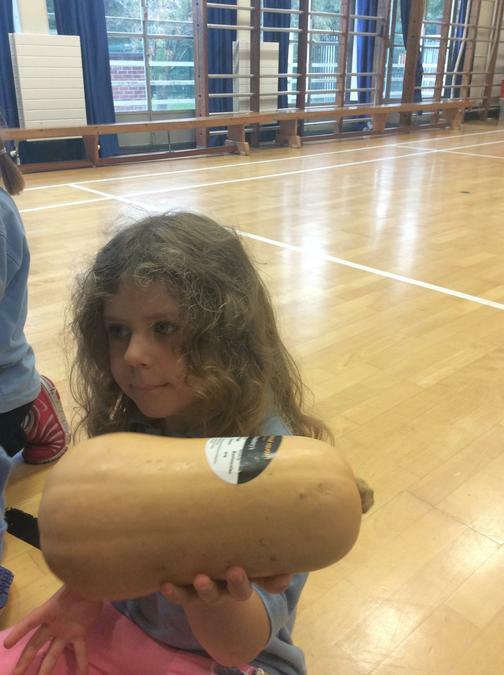 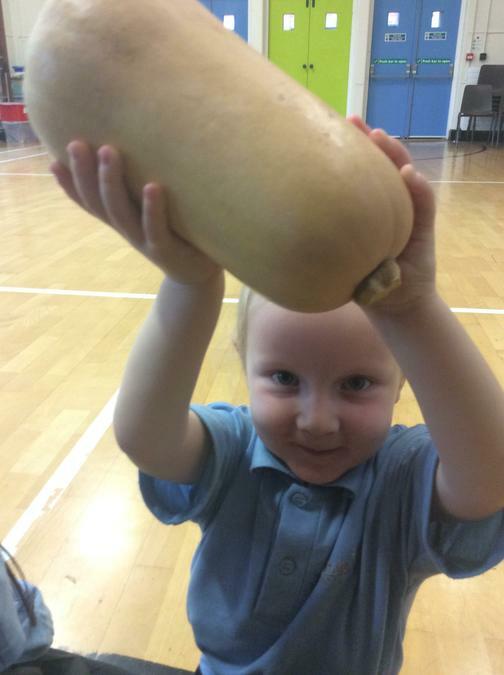 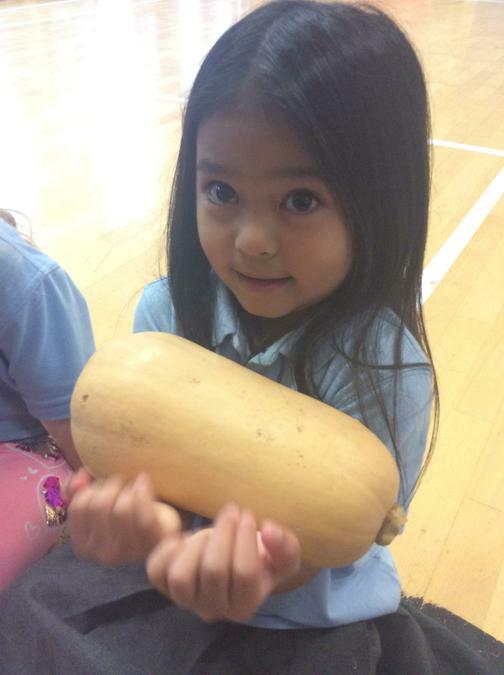 We hope to create some art work for our display boards using some harvest vegetables. 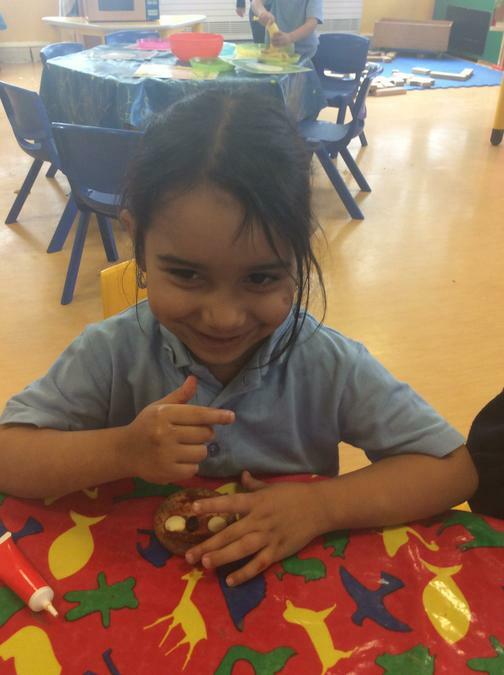 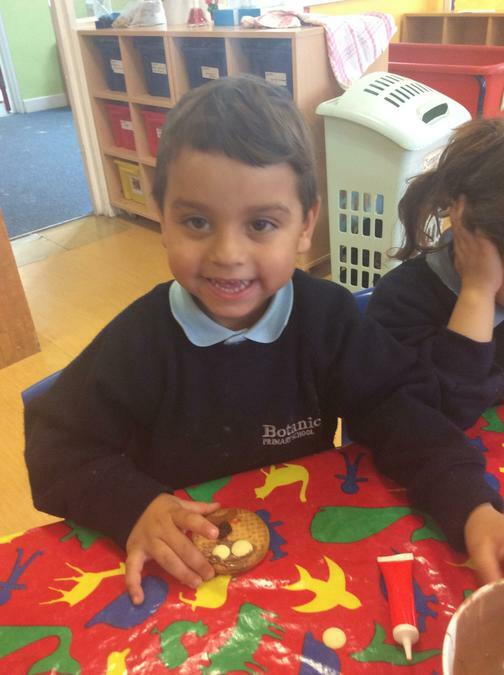 To coincide with our topic “Amazing Me” we made some yummy biscuit treats. 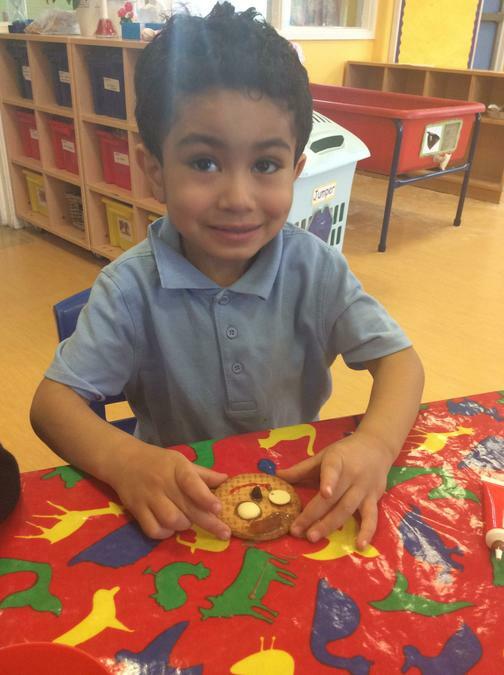 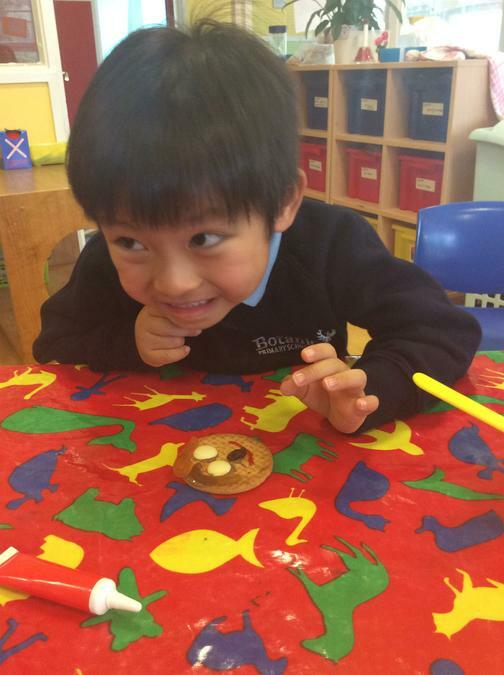 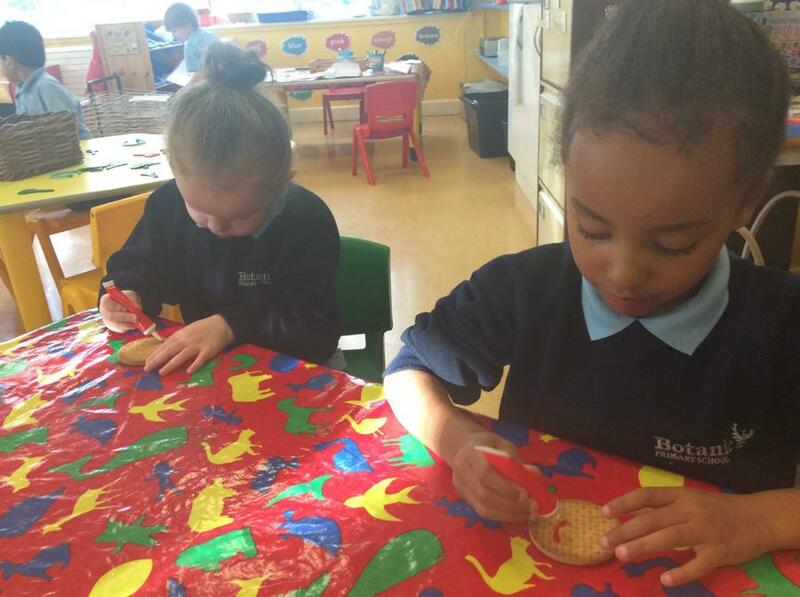 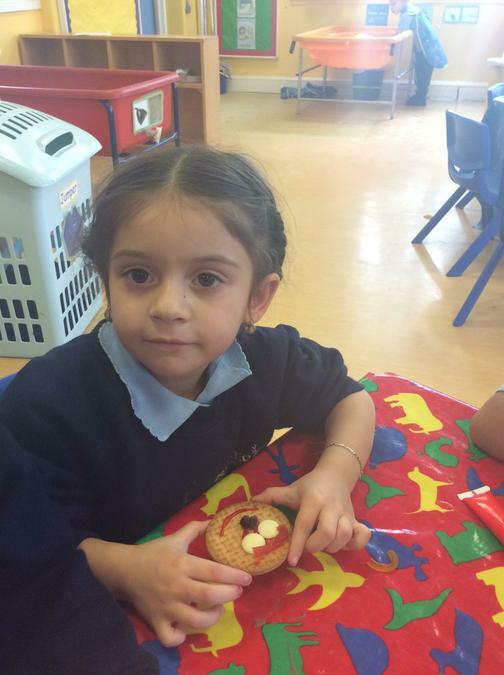 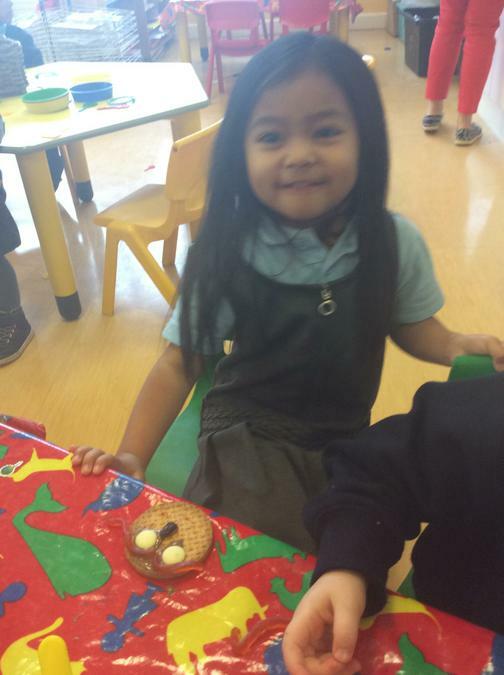 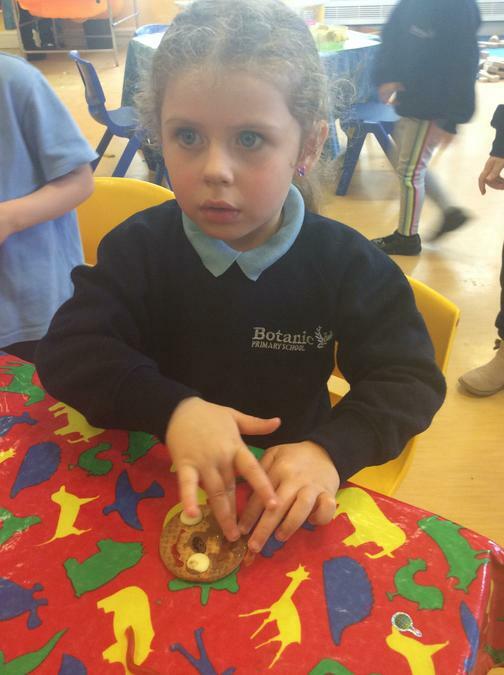 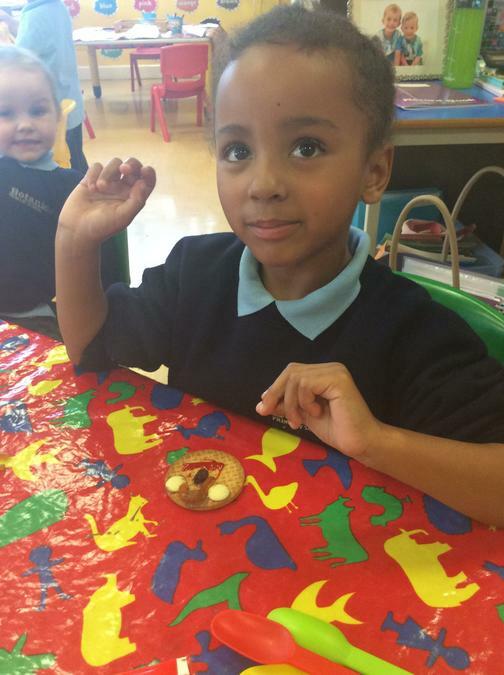 We transformed a digestive biscuit into an edible portrait. 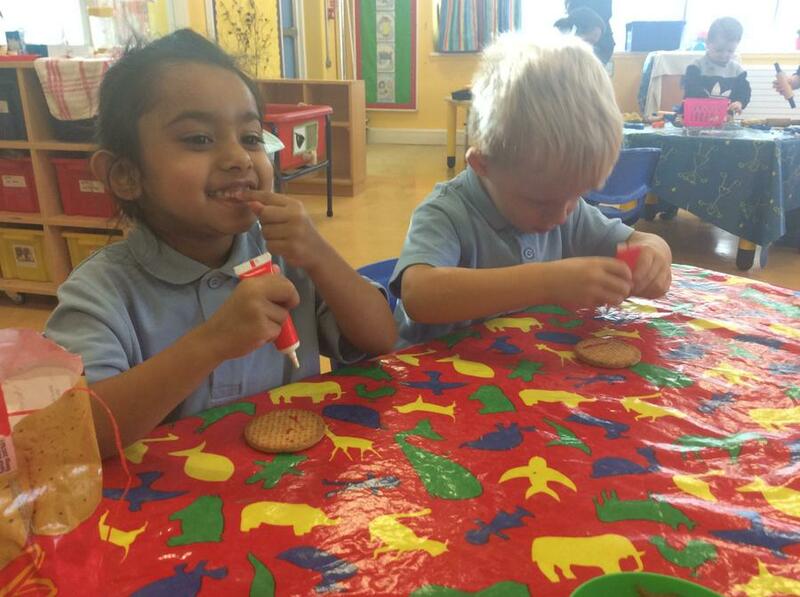 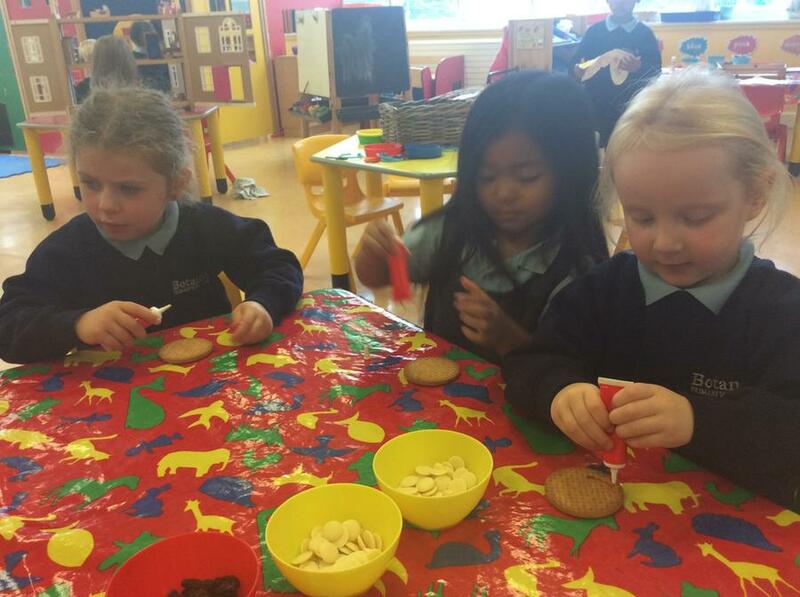 We used white chocolate buttons for eyes, a raisin for our nose, red icing for our mouths and and fruit strings for our hair. 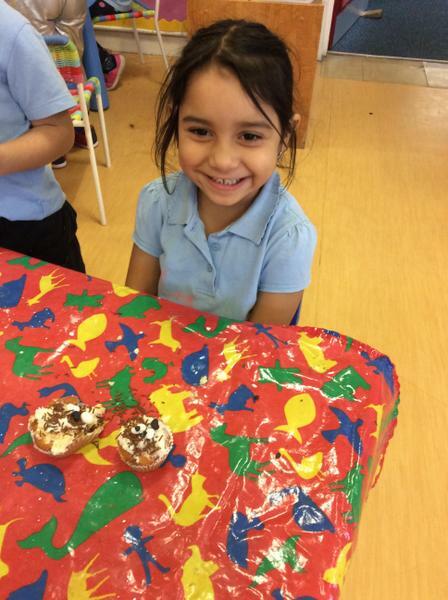 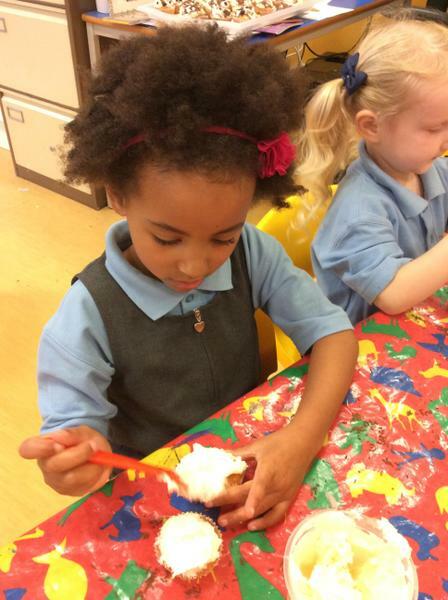 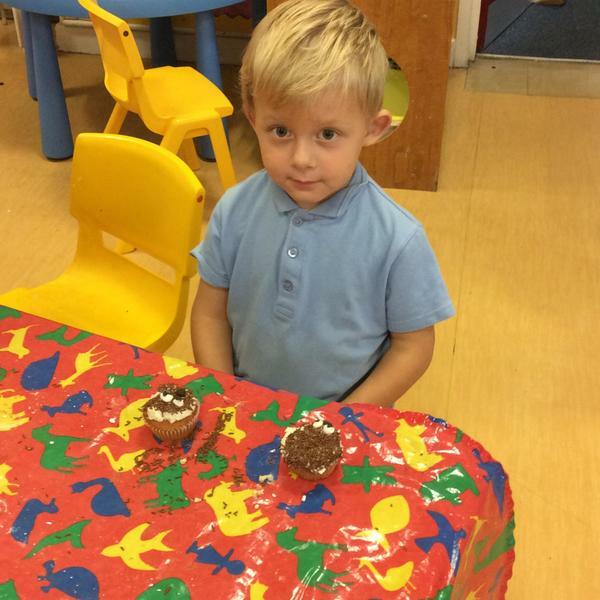 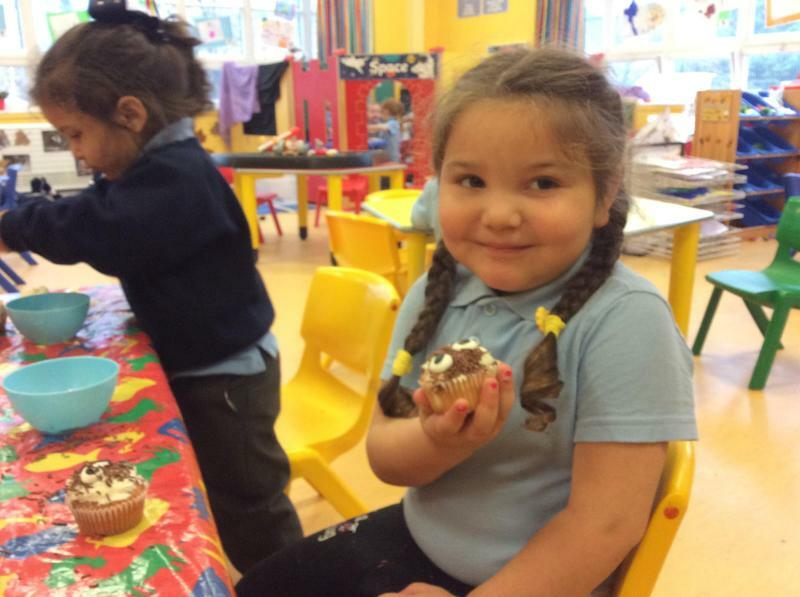 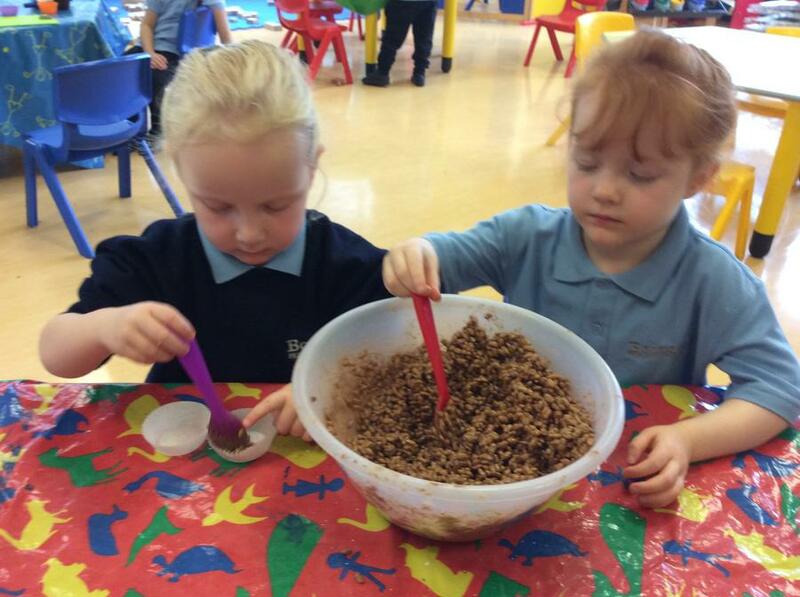 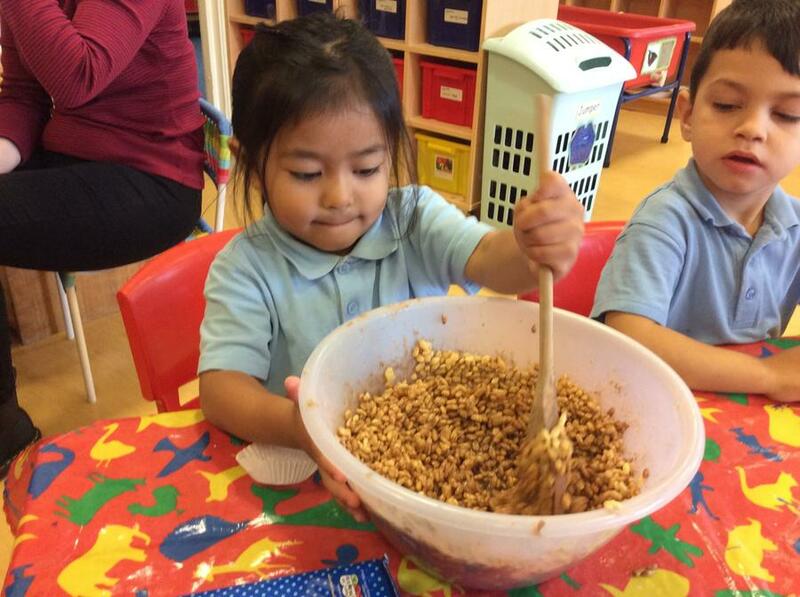 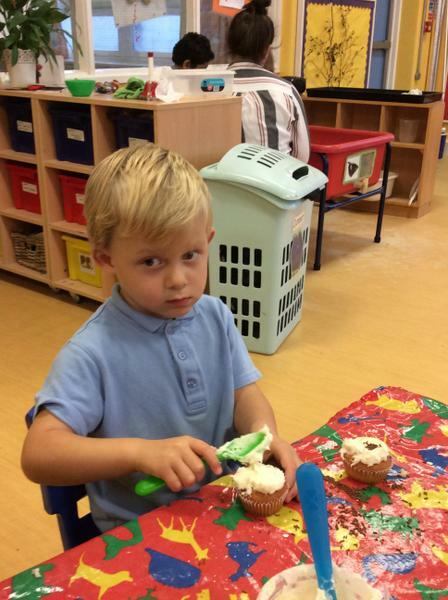 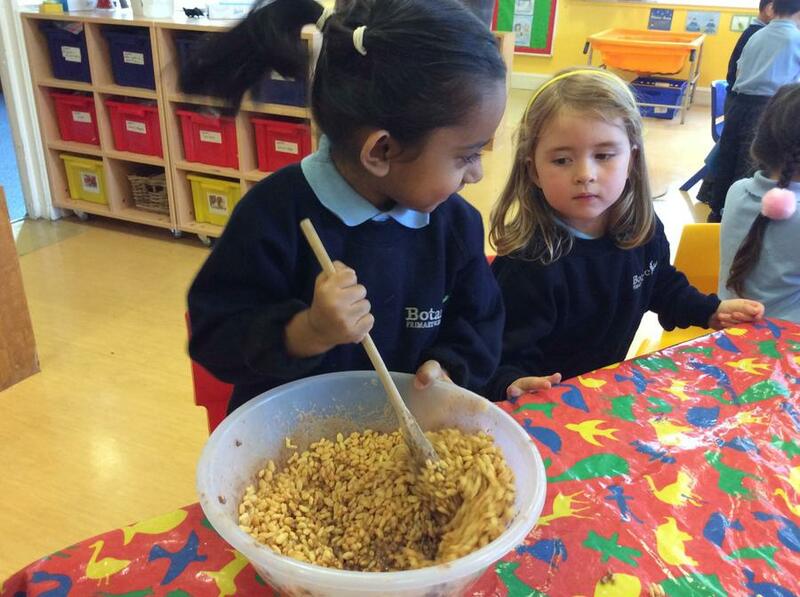 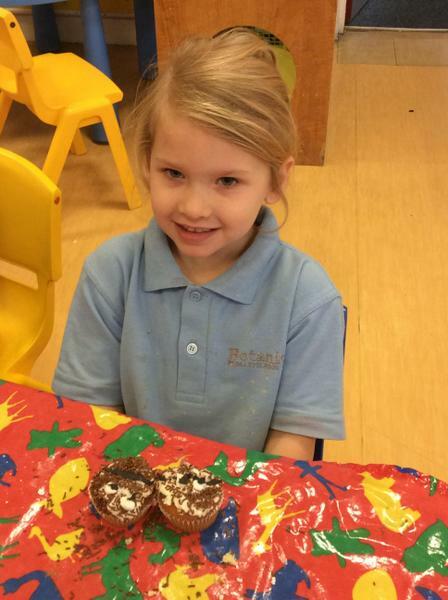 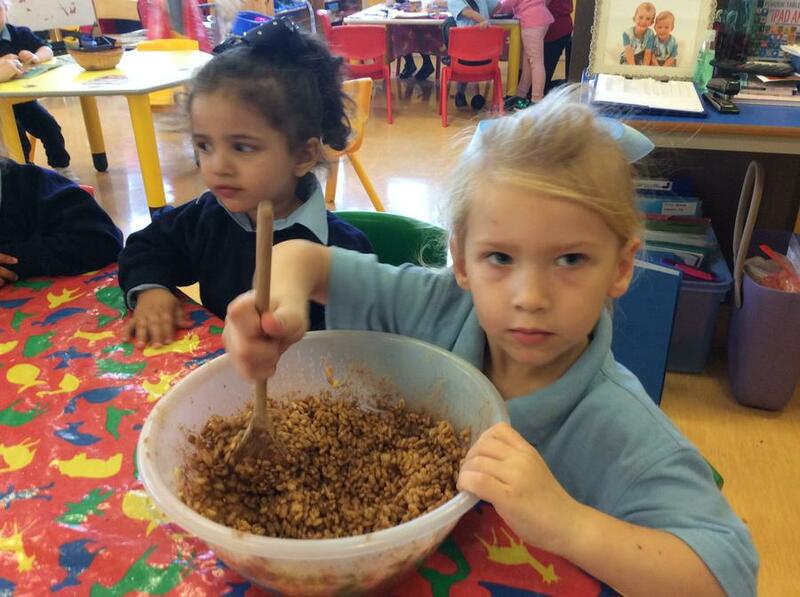 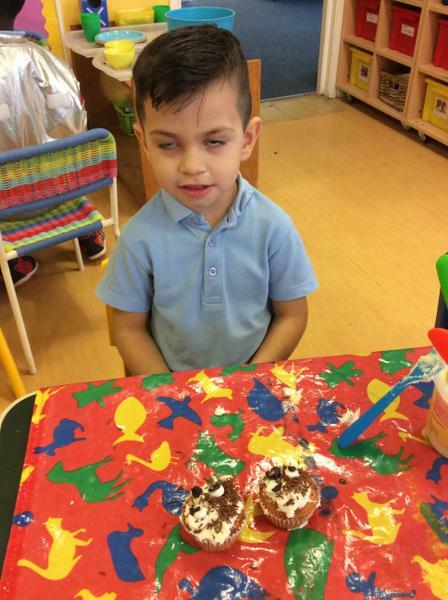 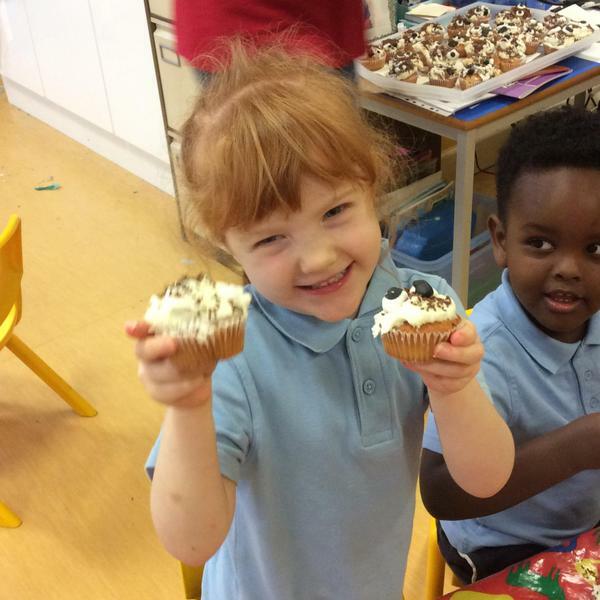 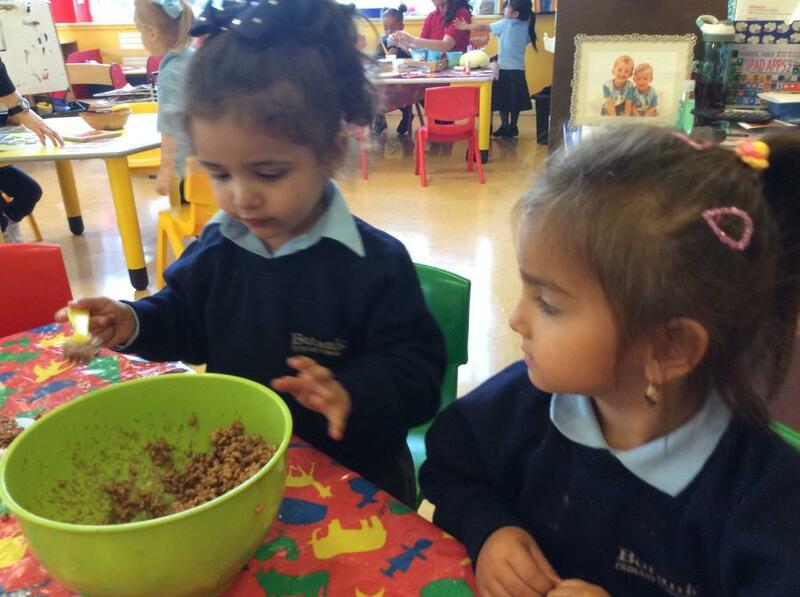 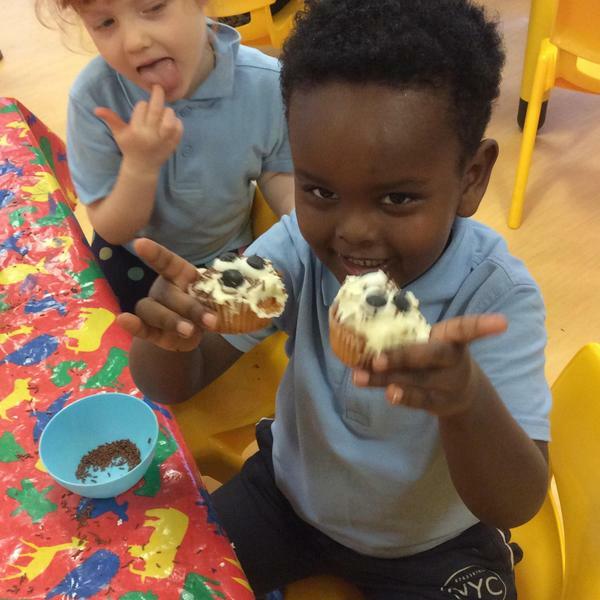 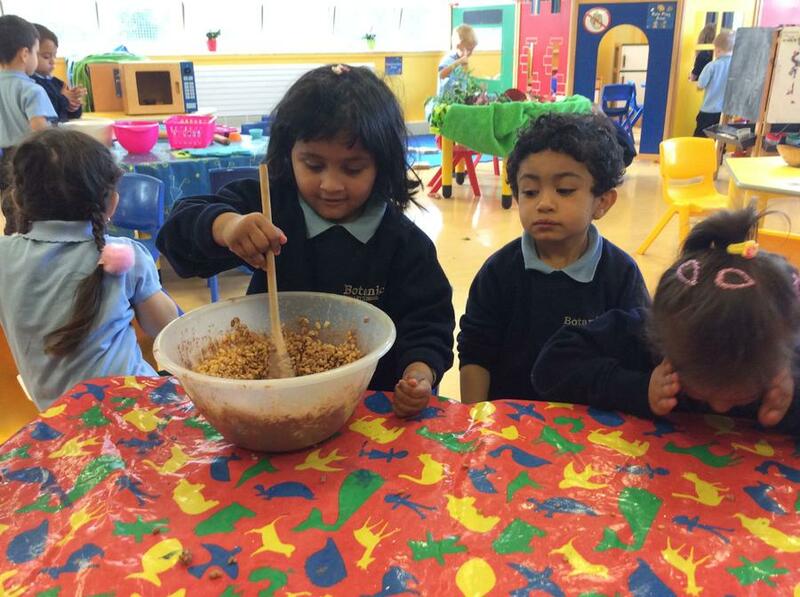 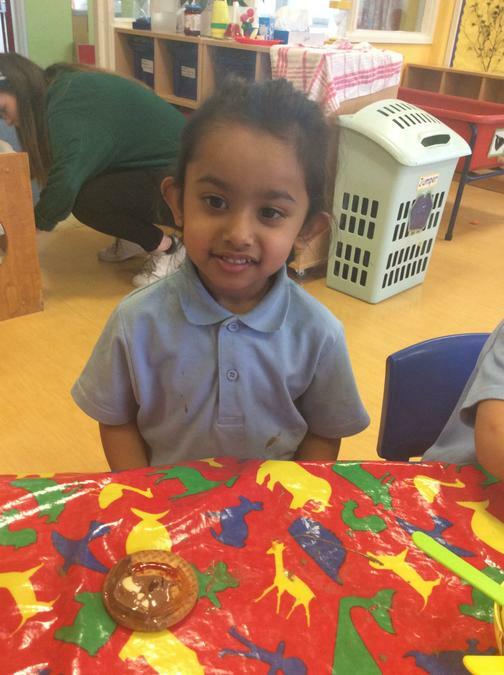 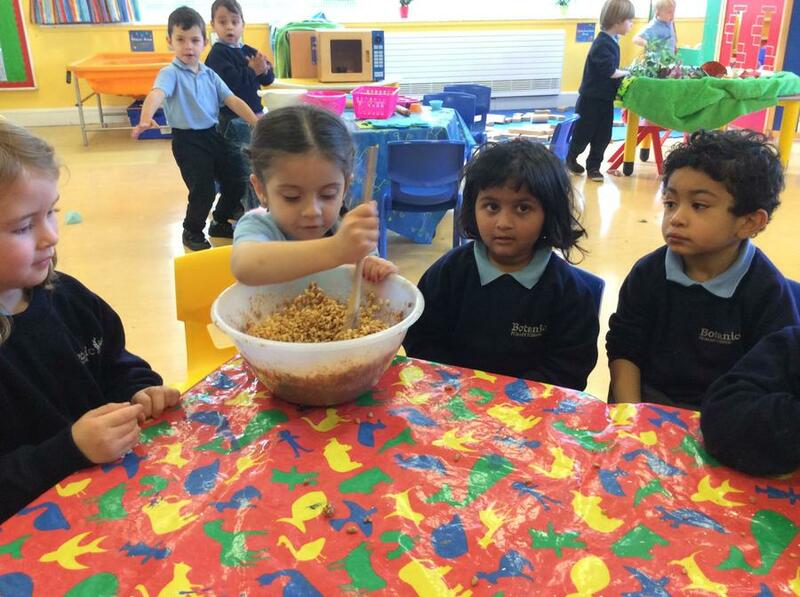 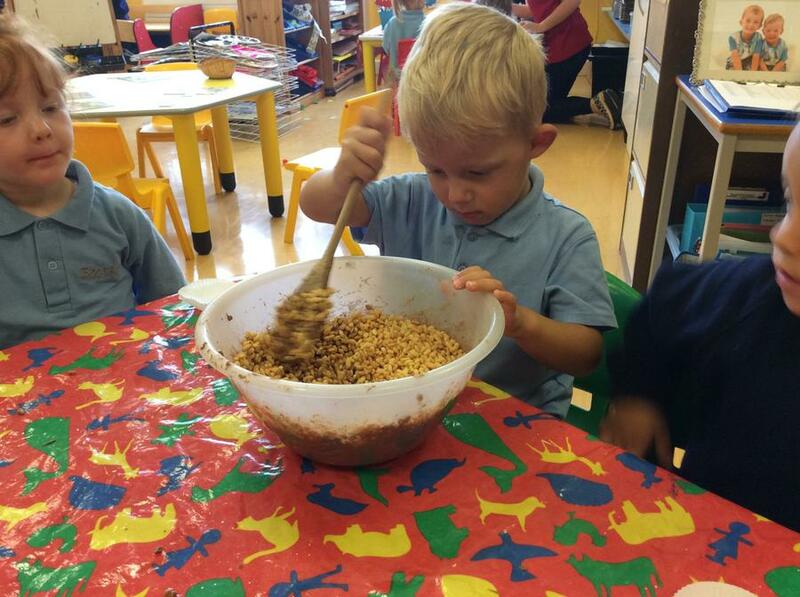 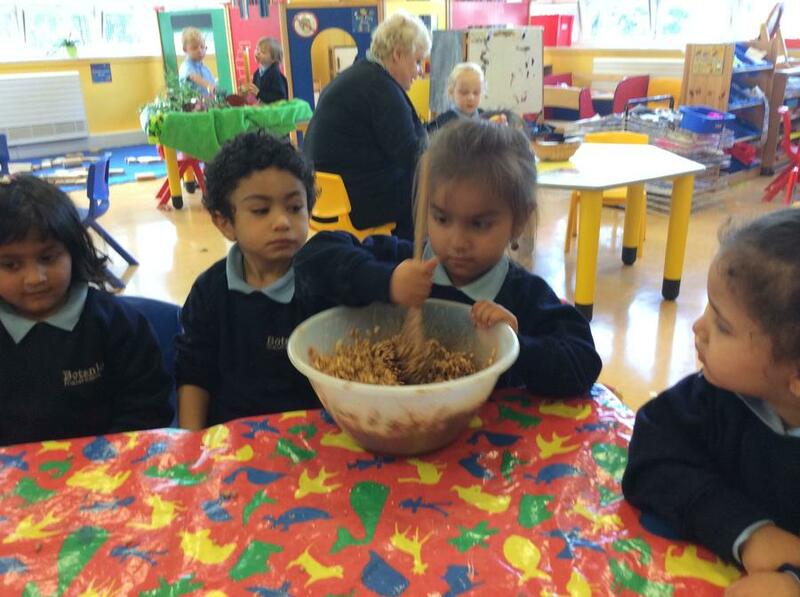 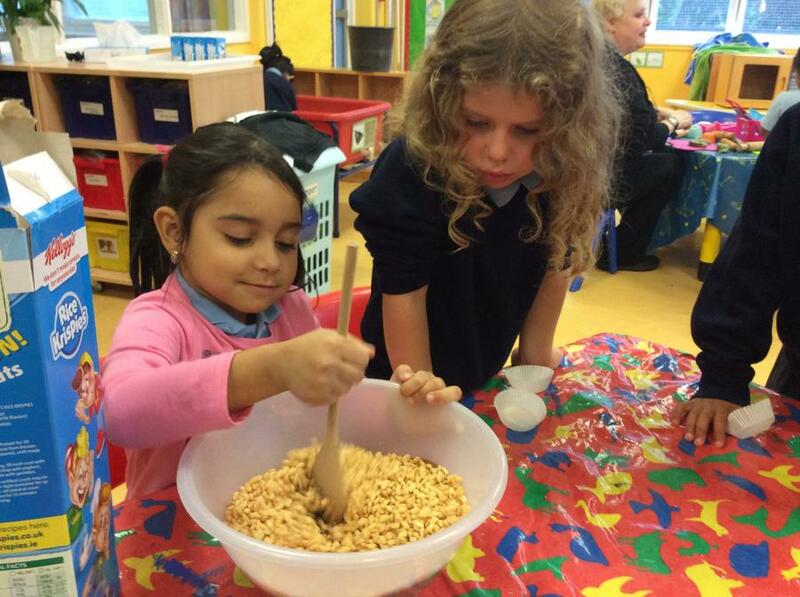 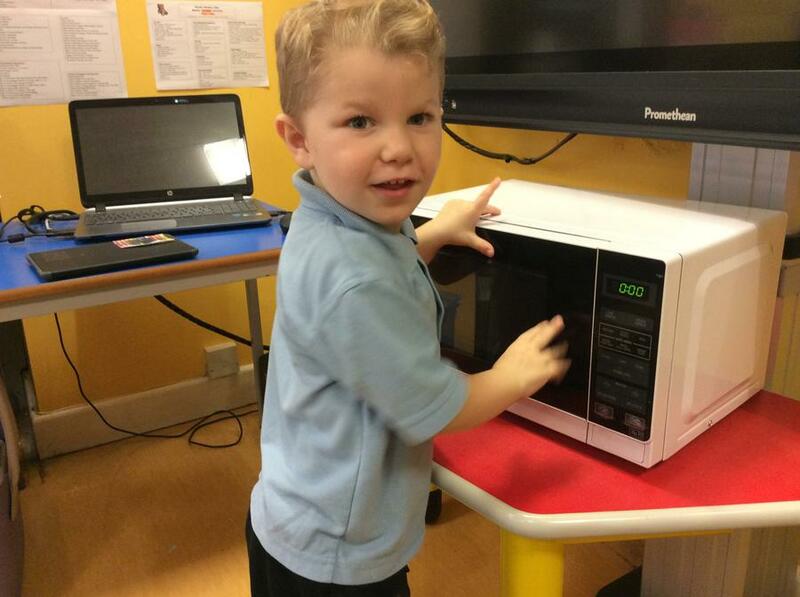 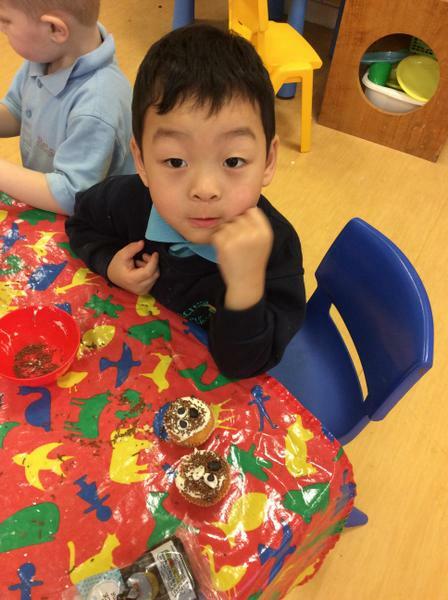 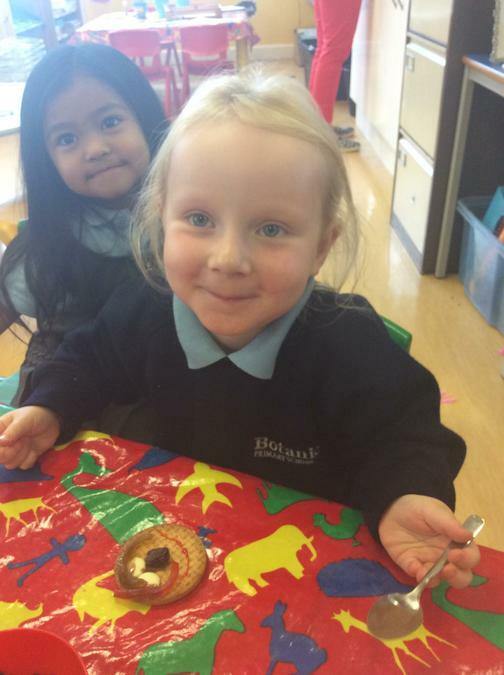 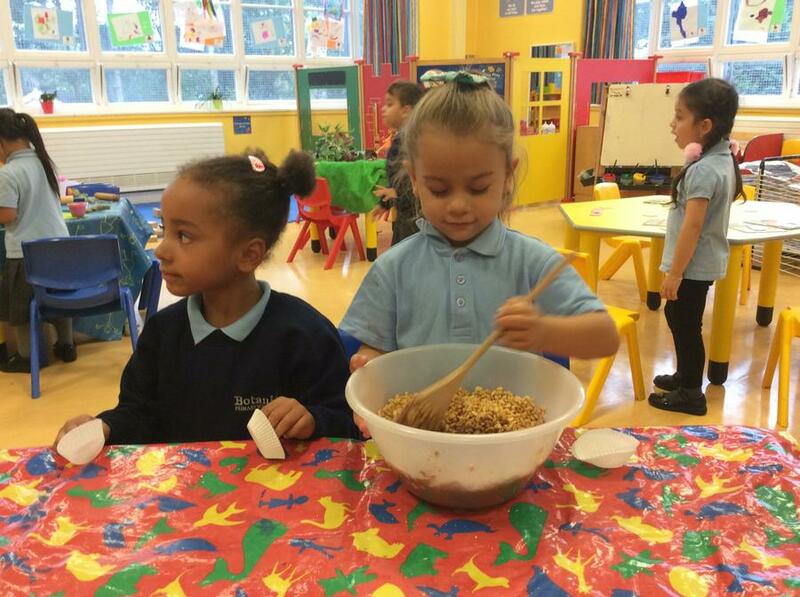 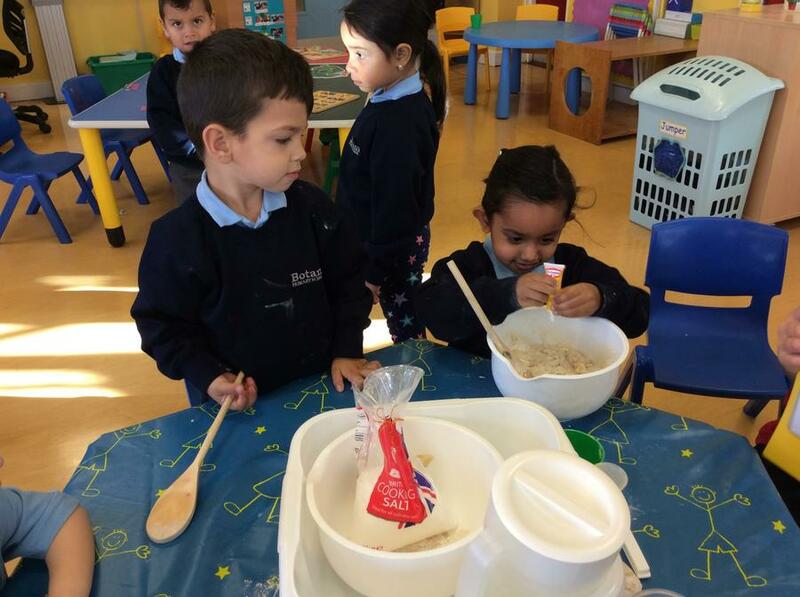 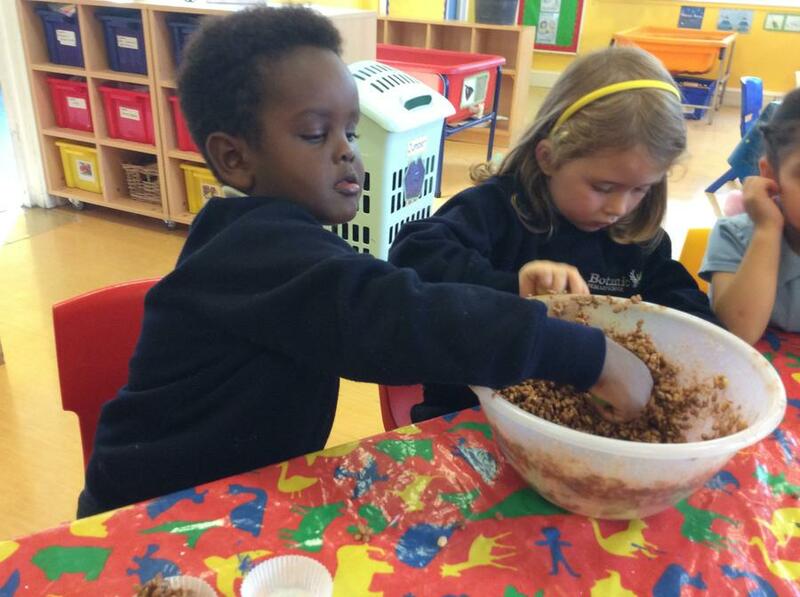 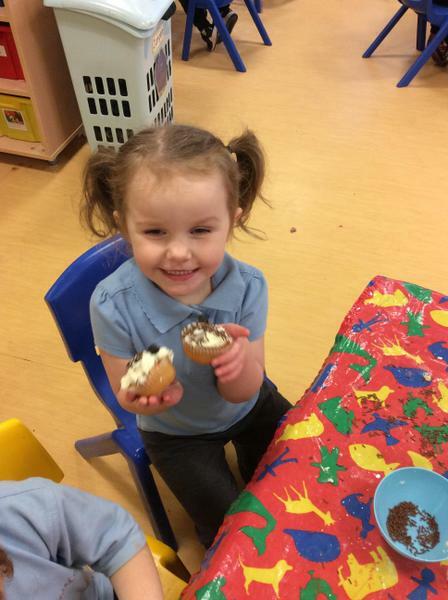 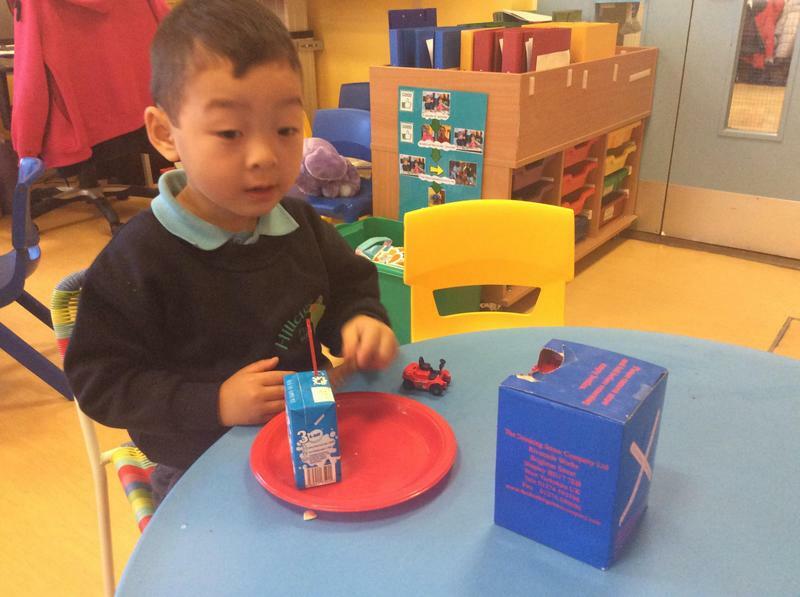 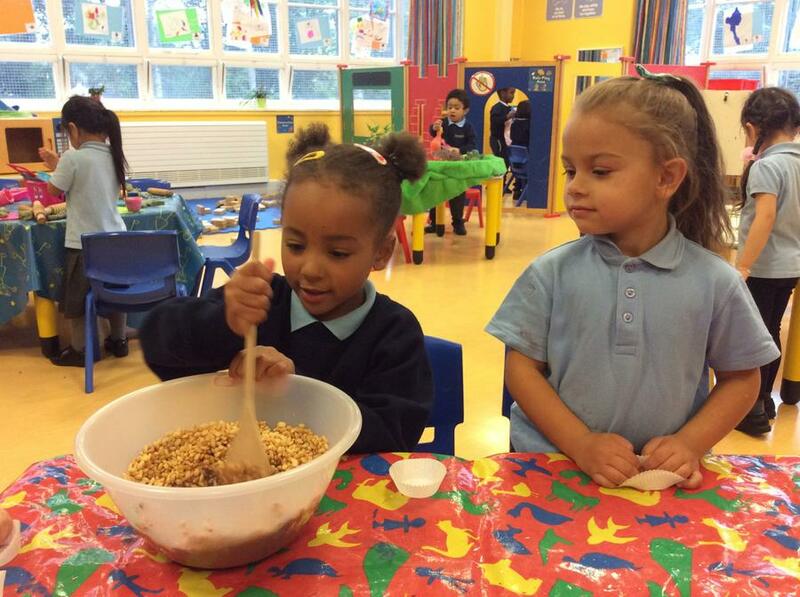 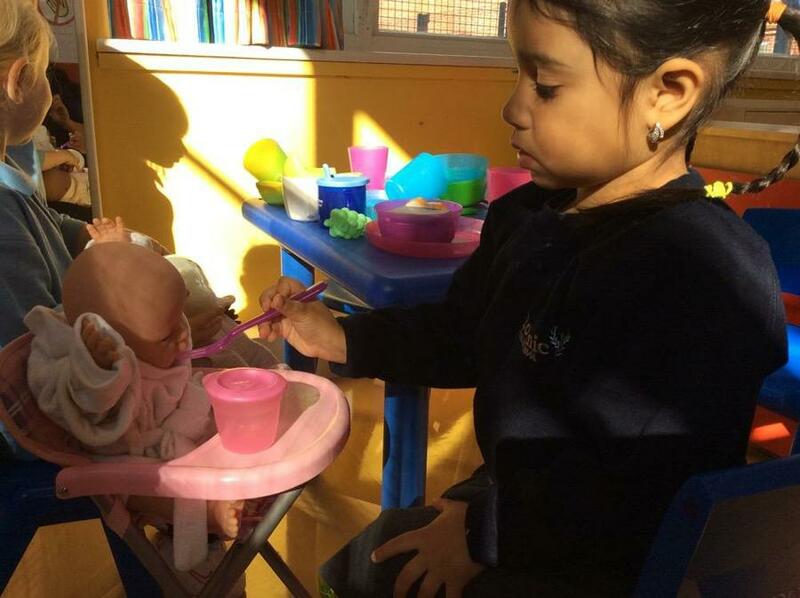 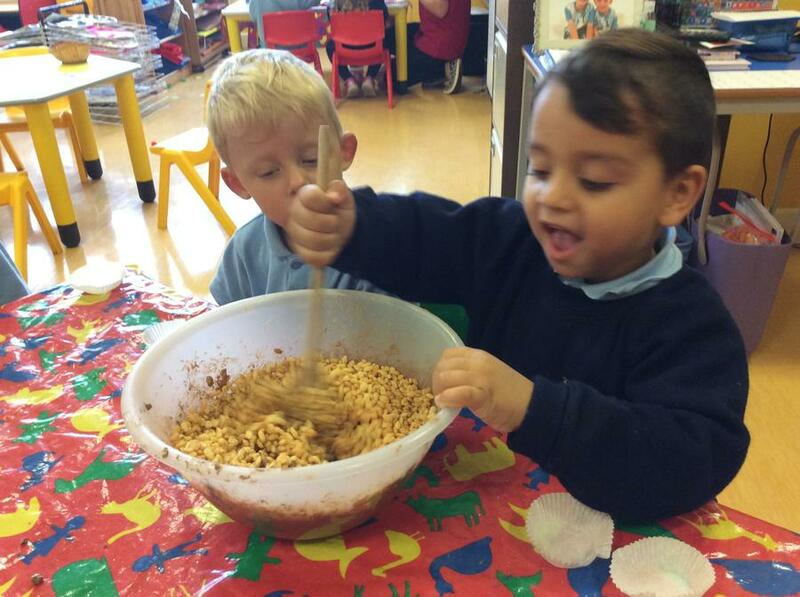 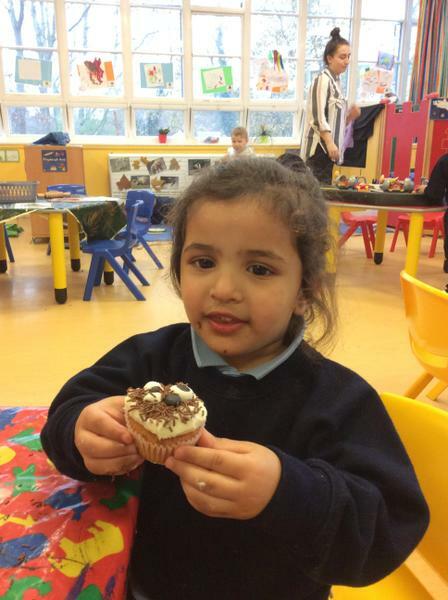 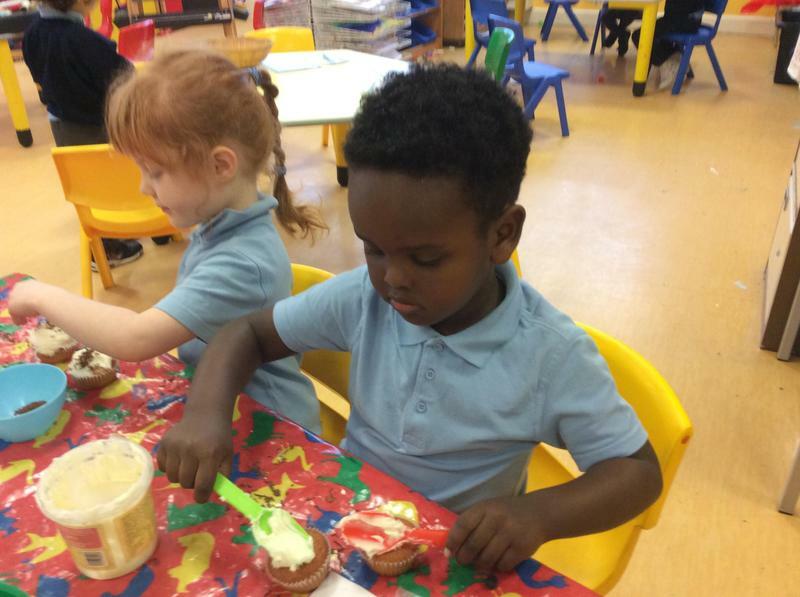 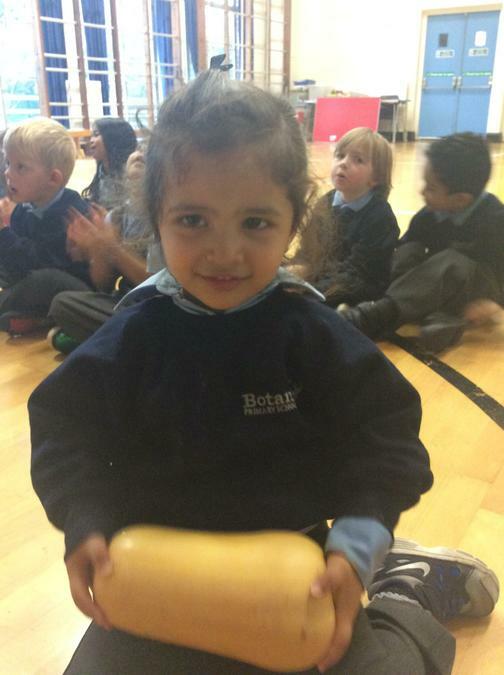 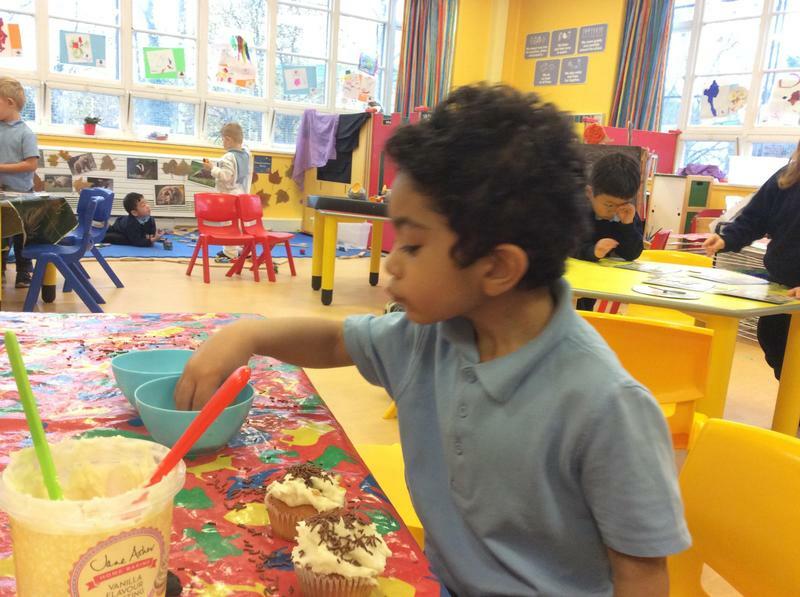 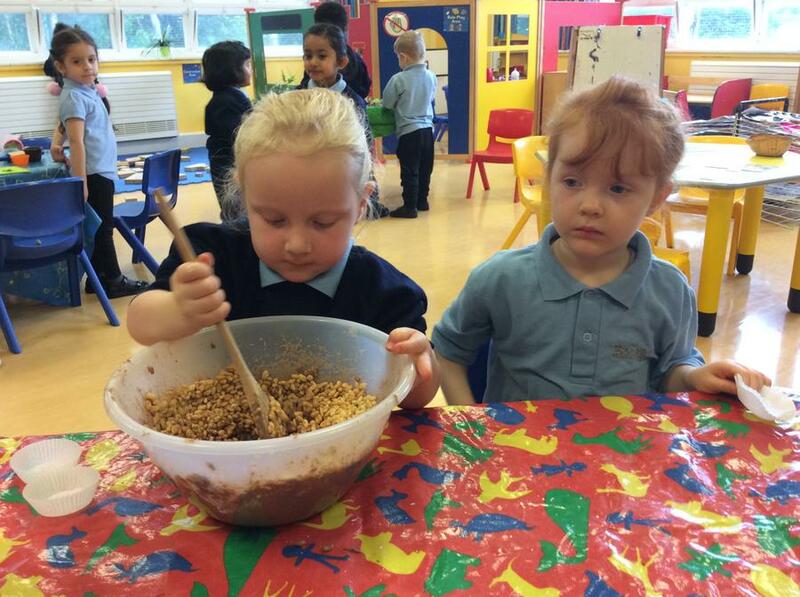 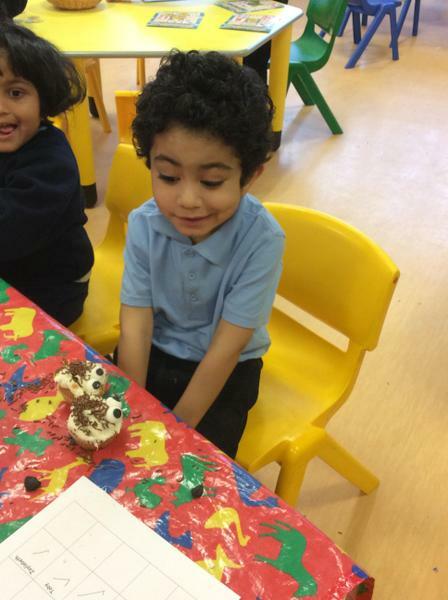 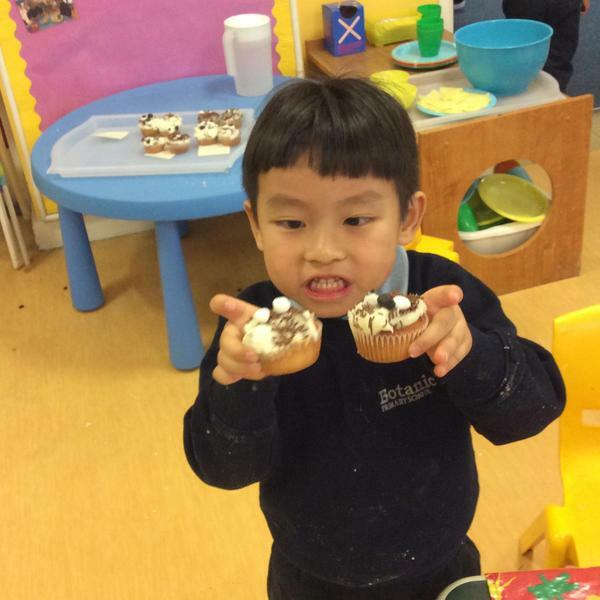 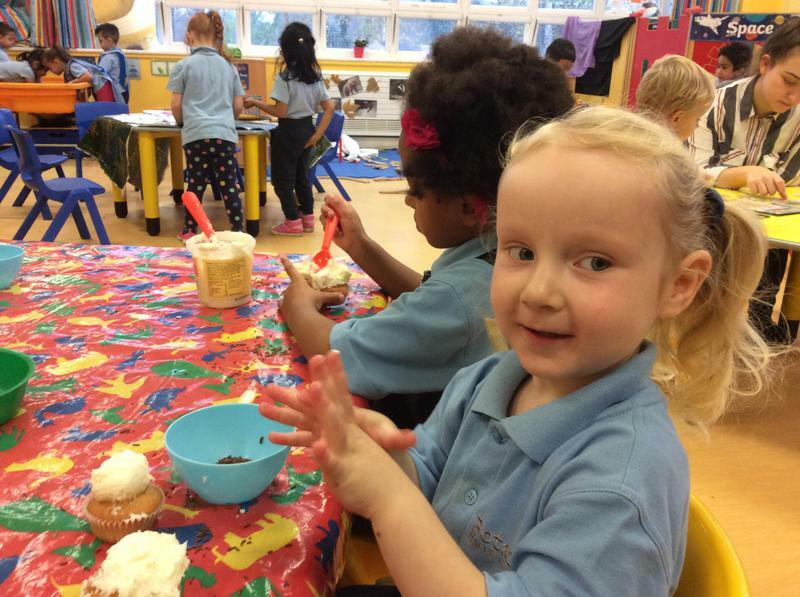 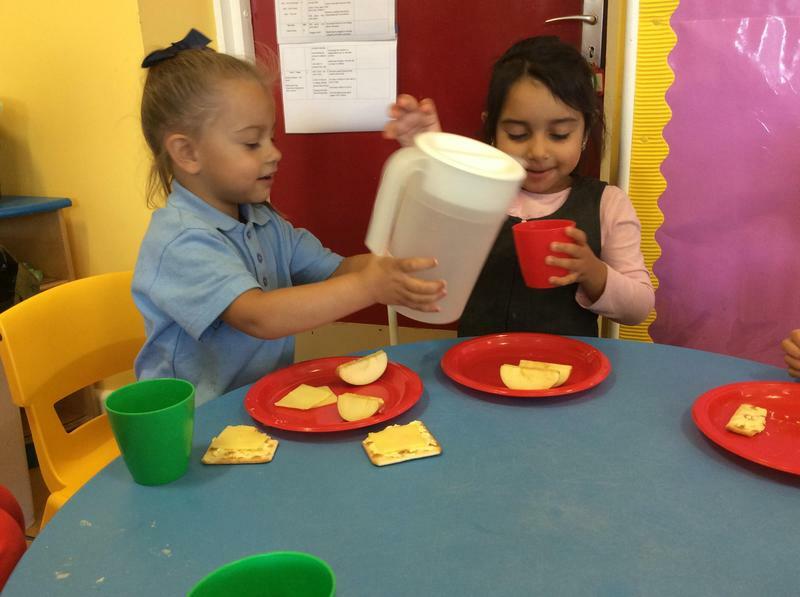 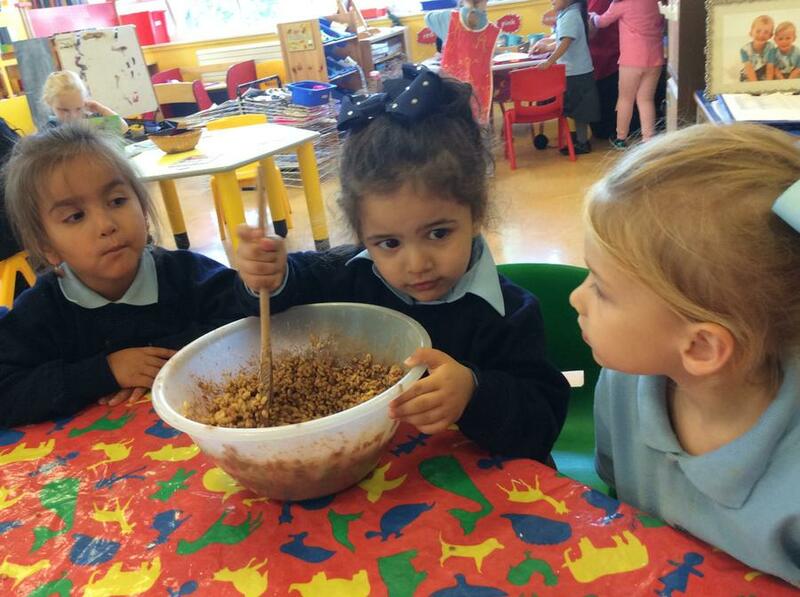 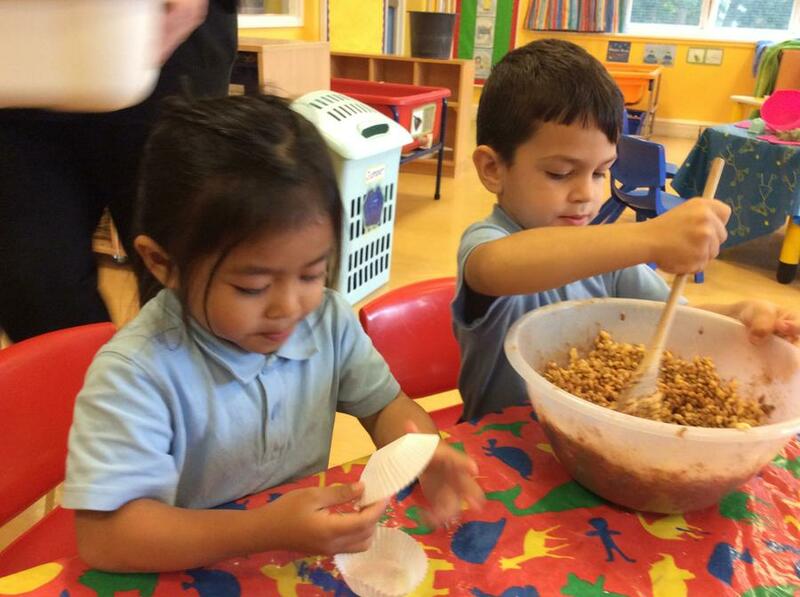 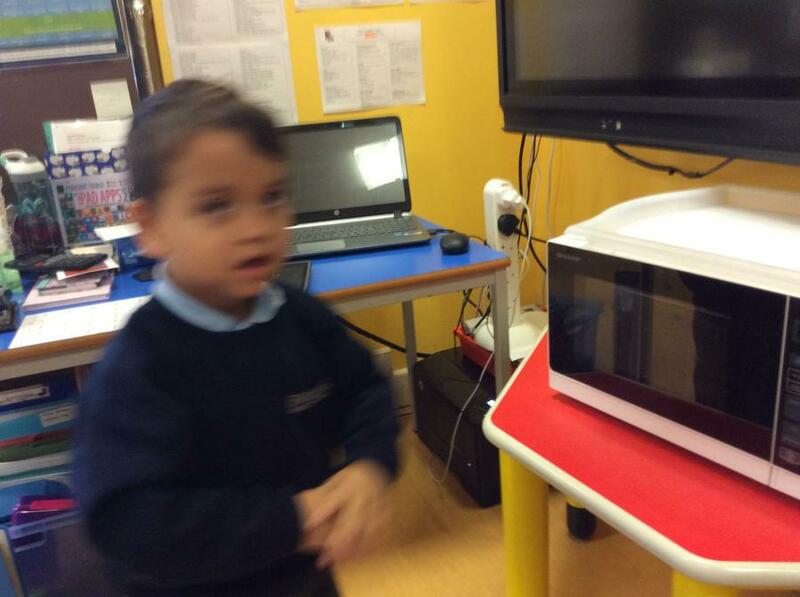 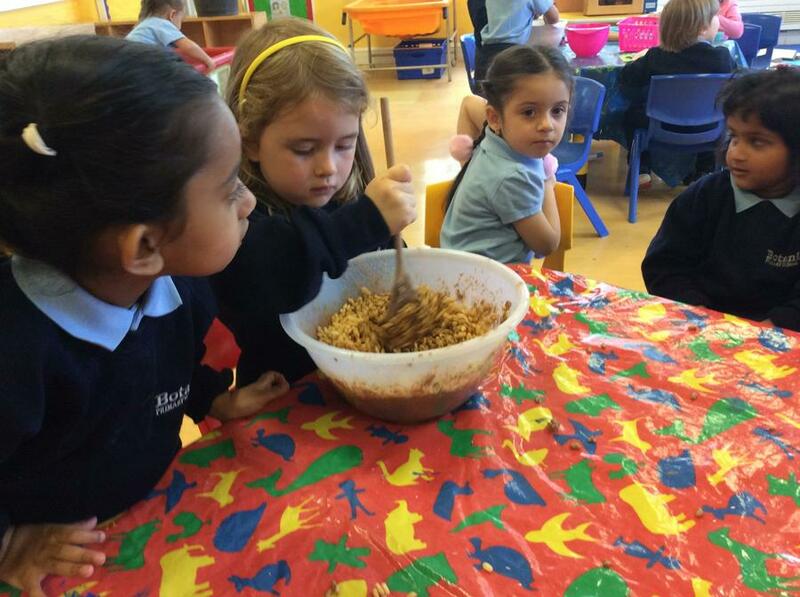 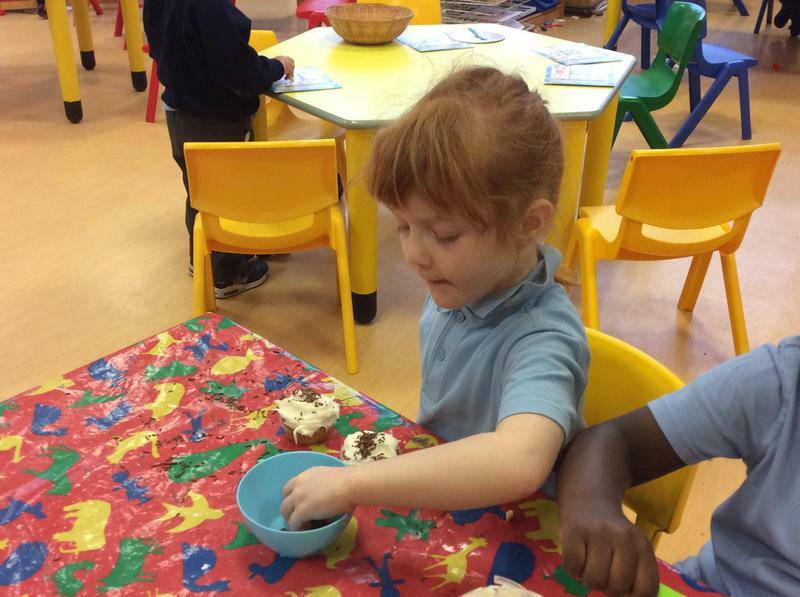 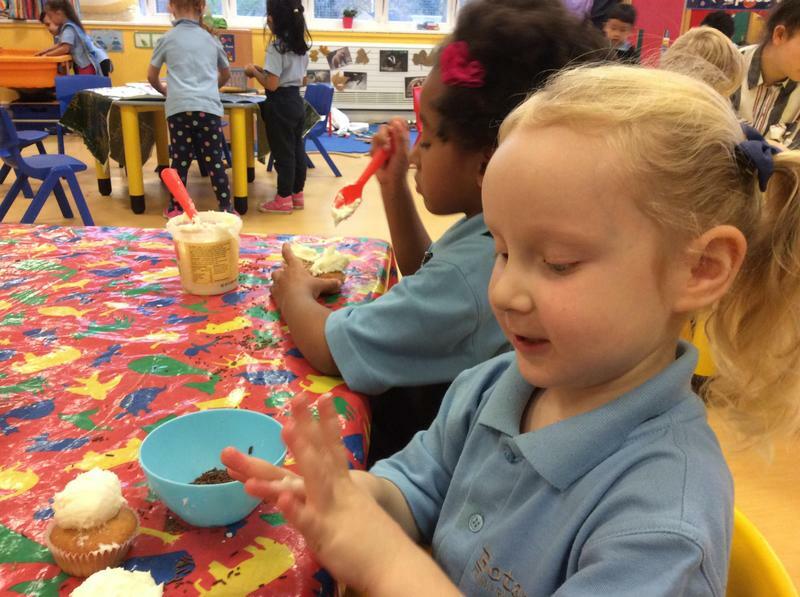 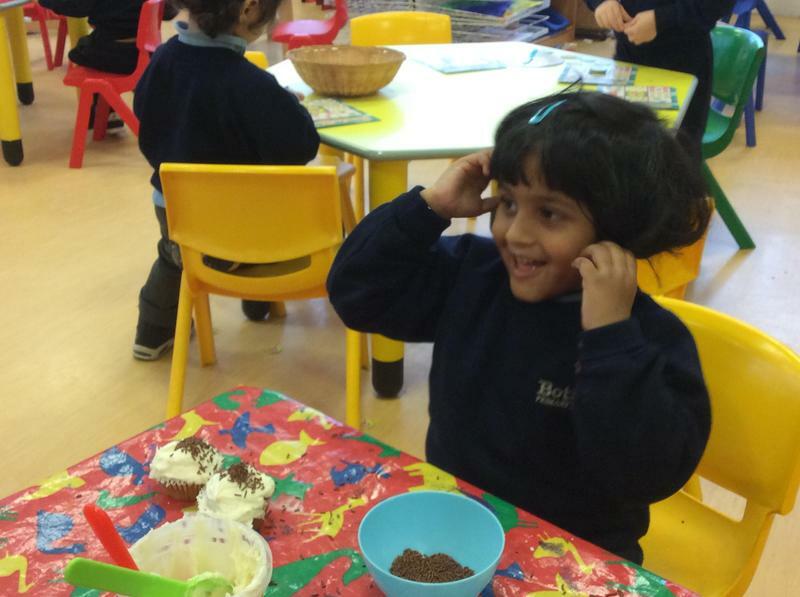 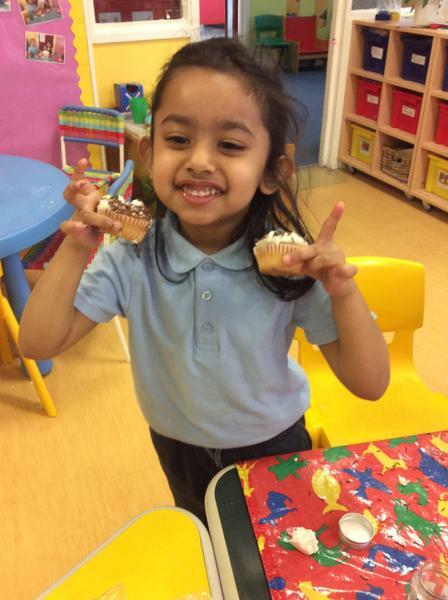 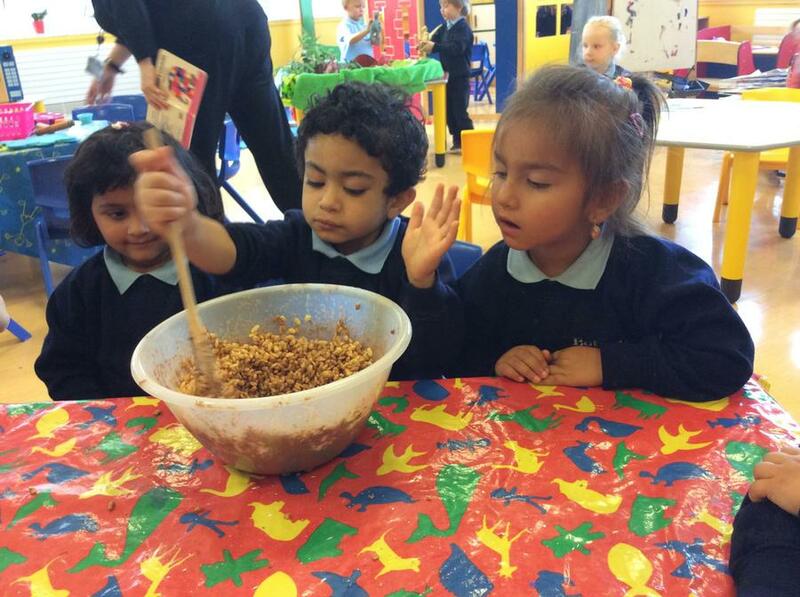 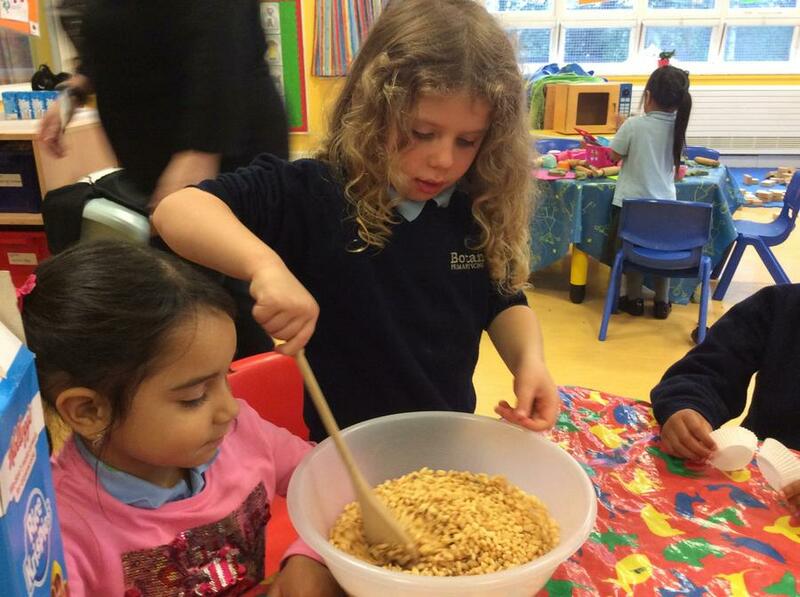 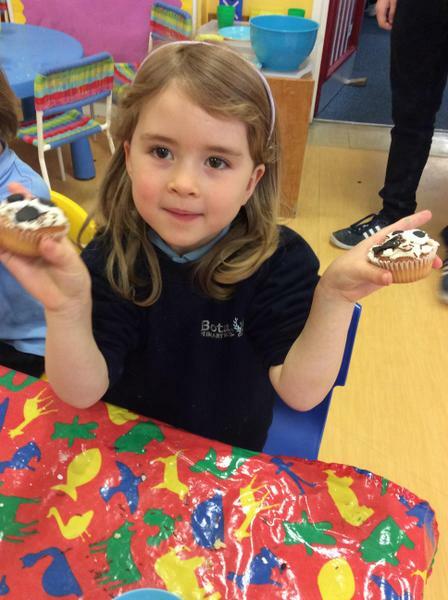 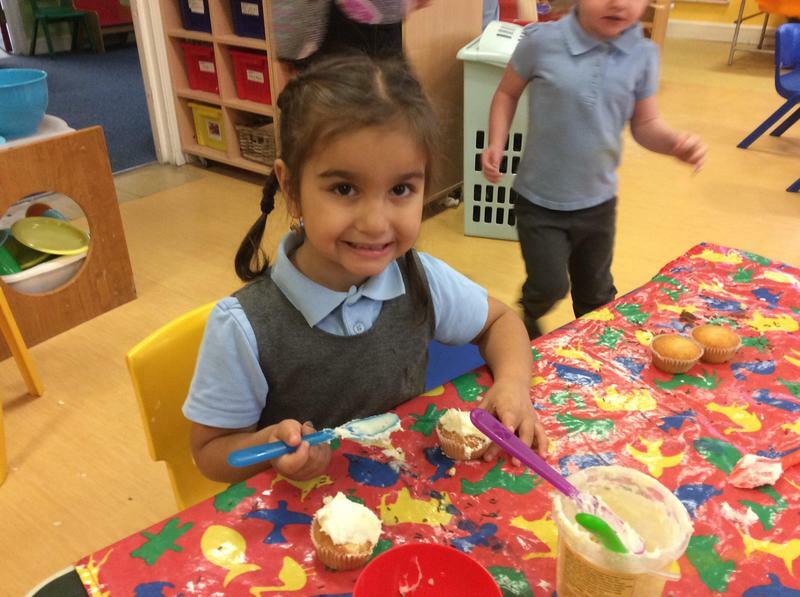 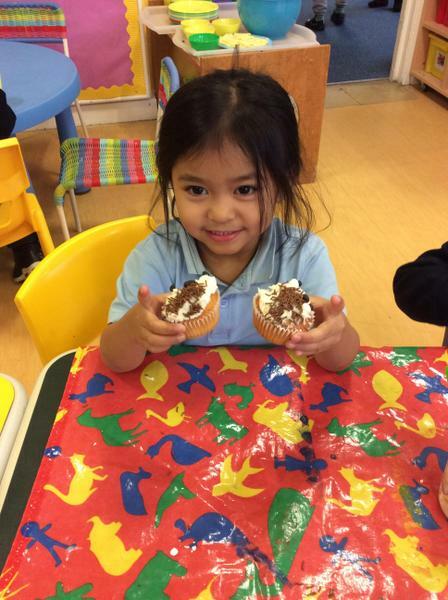 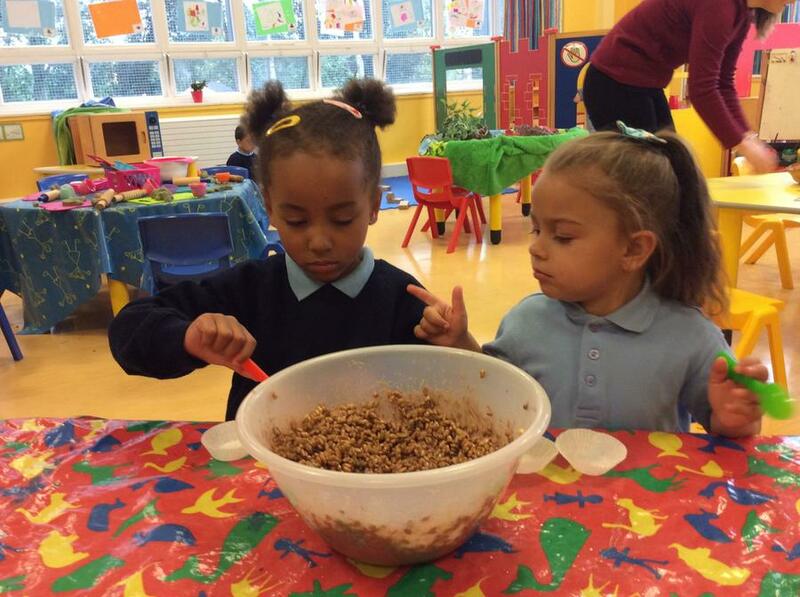 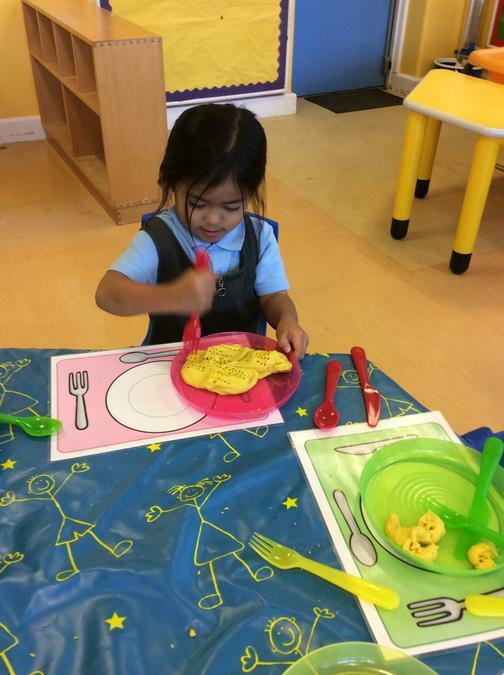 In nursery we enjoy cooking. 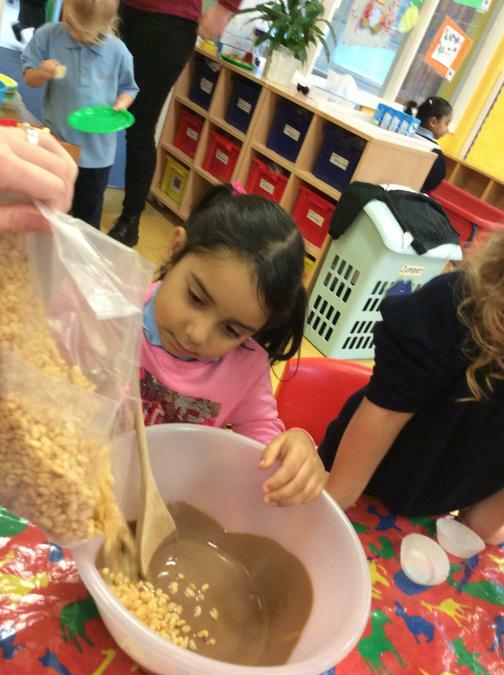 We melted chocolate in the microwave and added rice crispies. 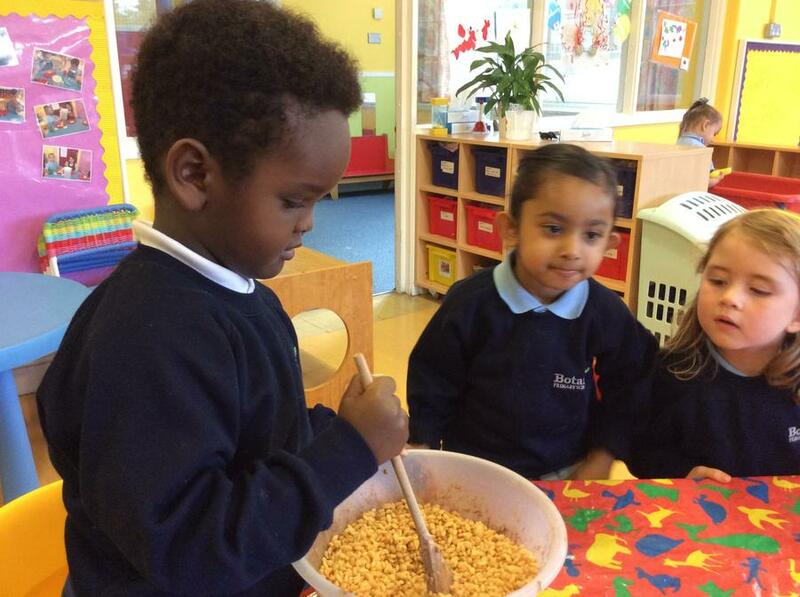 We mixed everything together and made delicious treats! 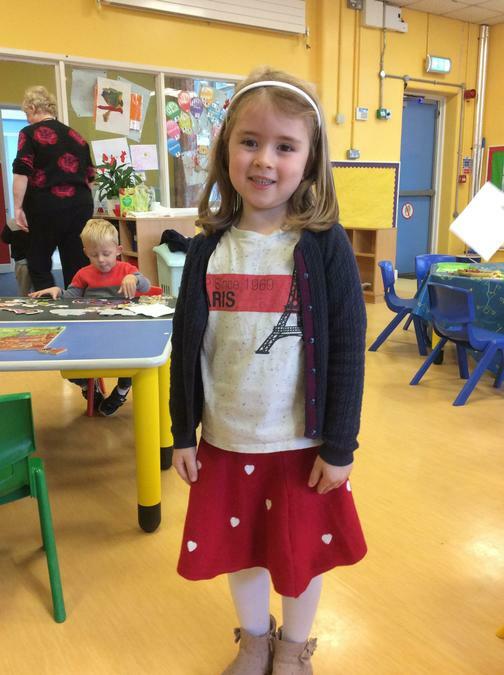 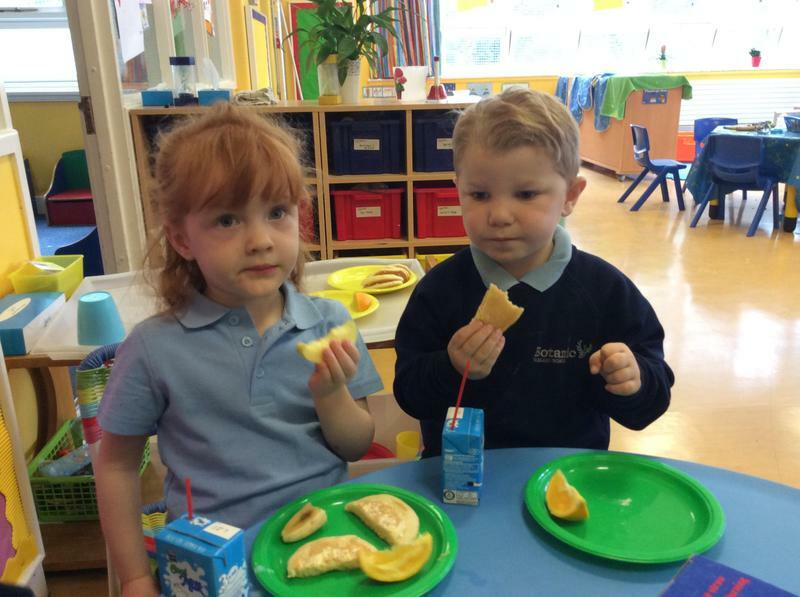 Today we celebrated all the different languages in our school by dressing up and having a European themed snack of Croissants and orange juice. 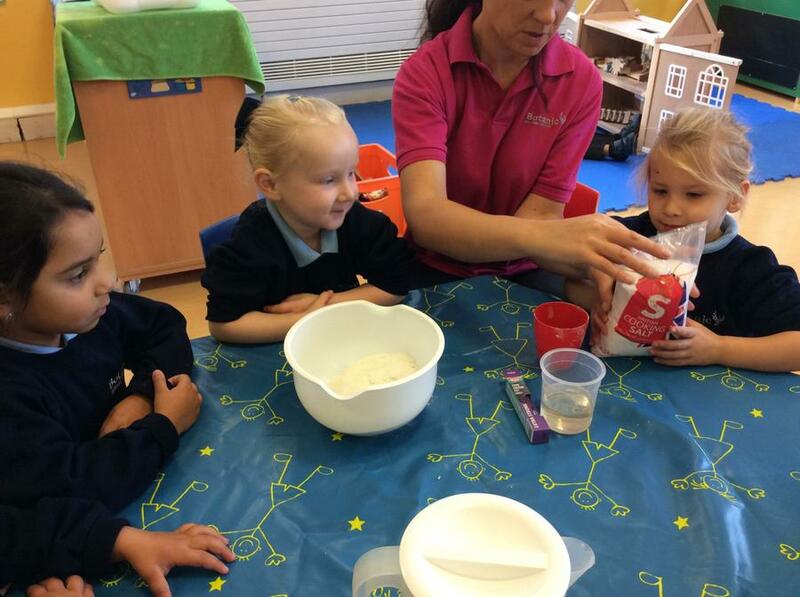 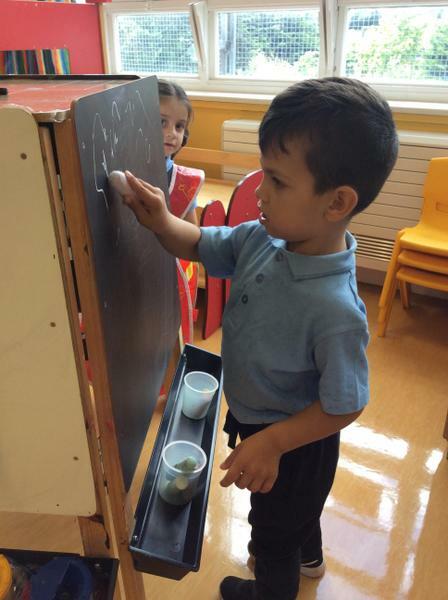 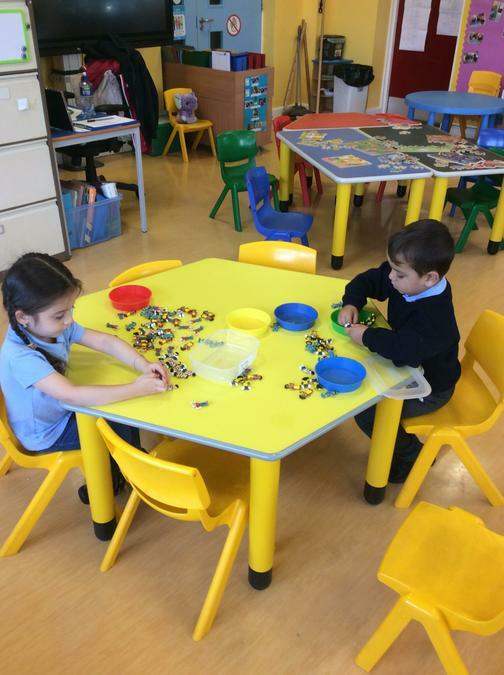 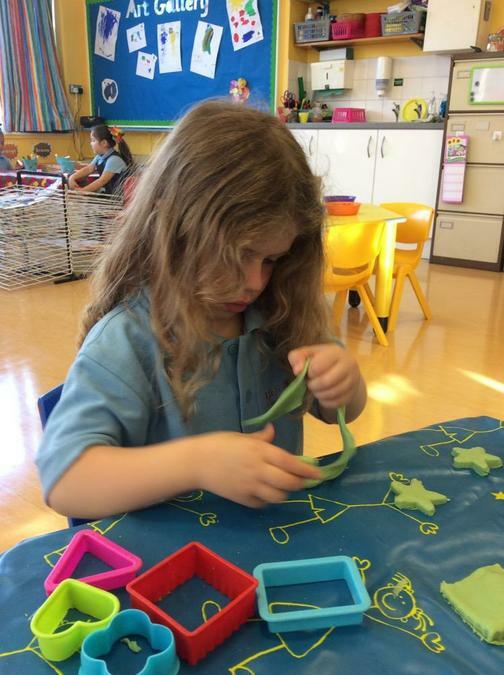 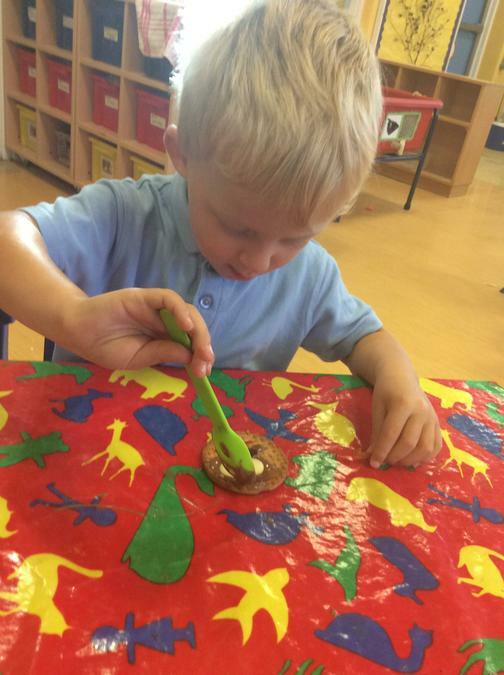 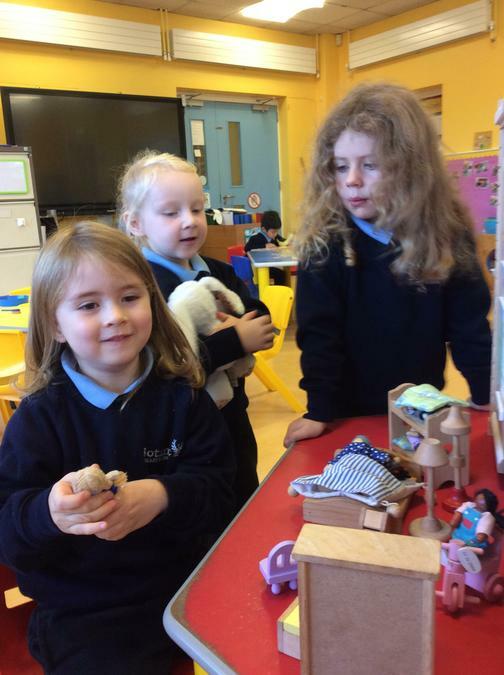 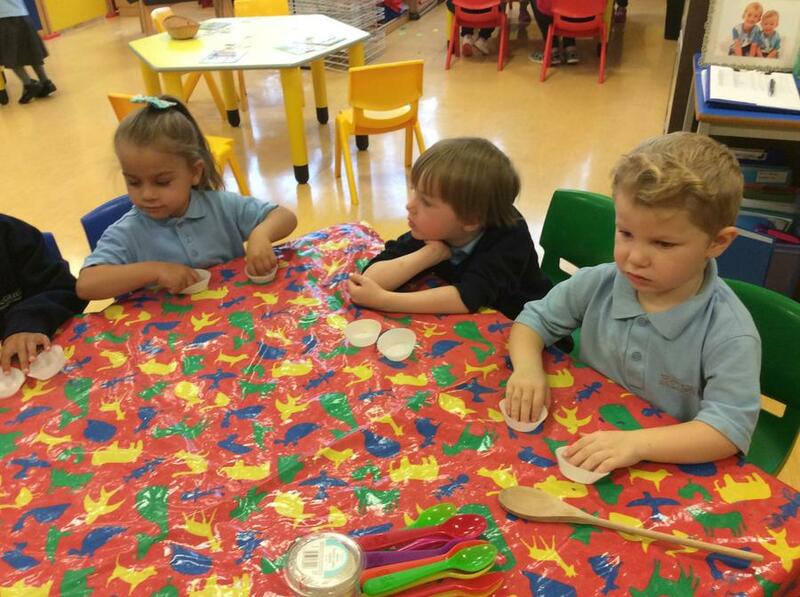 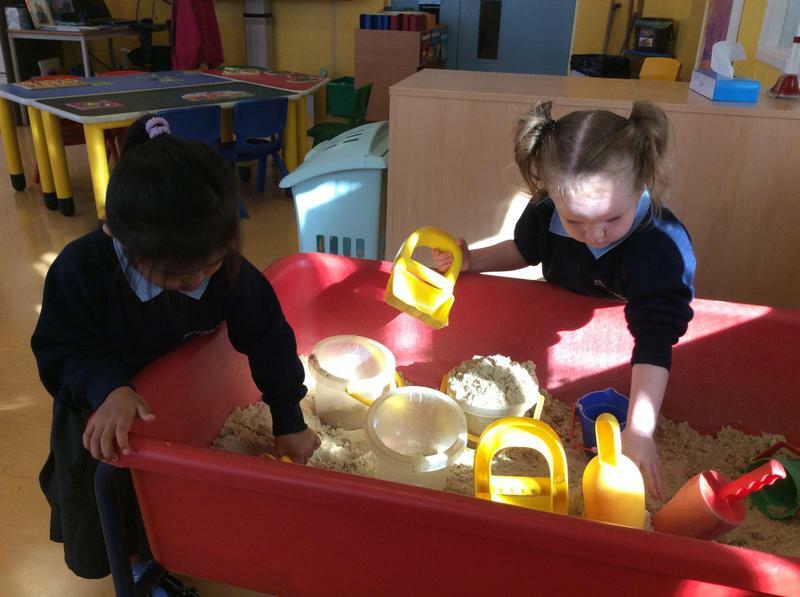 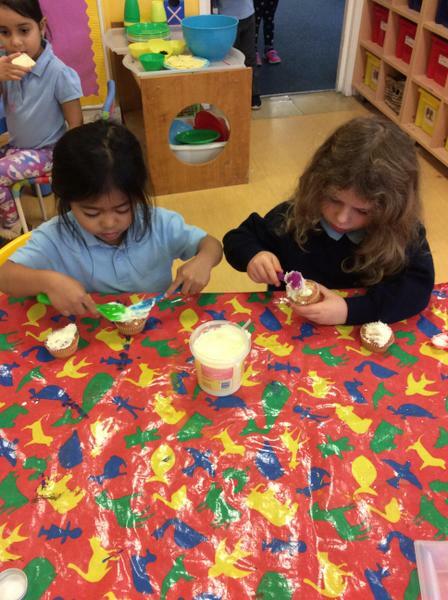 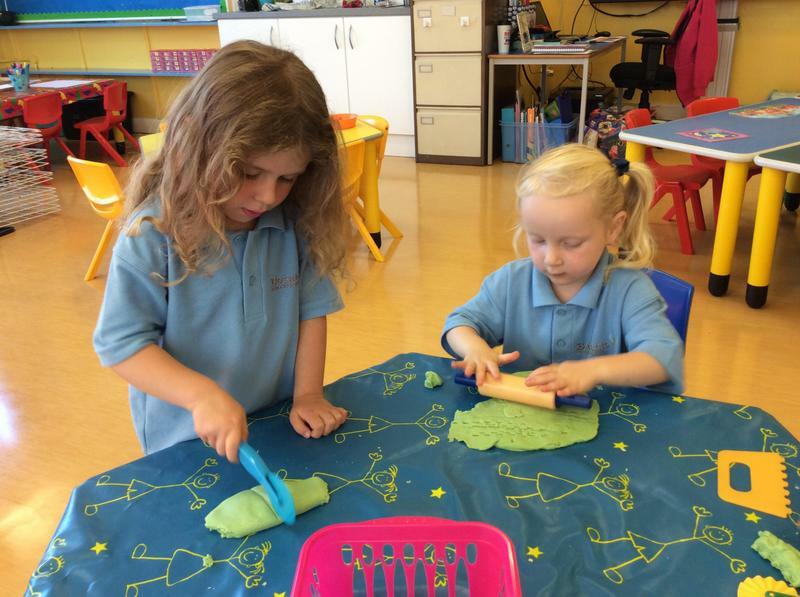 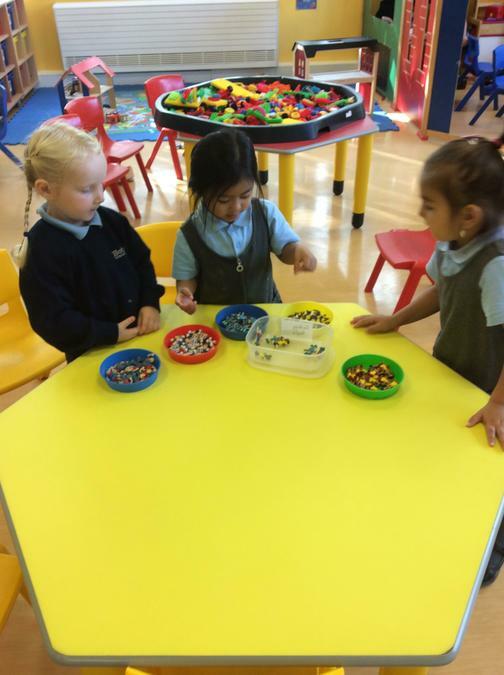 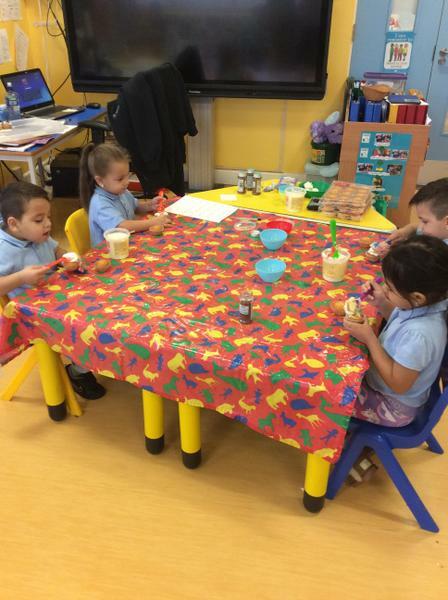 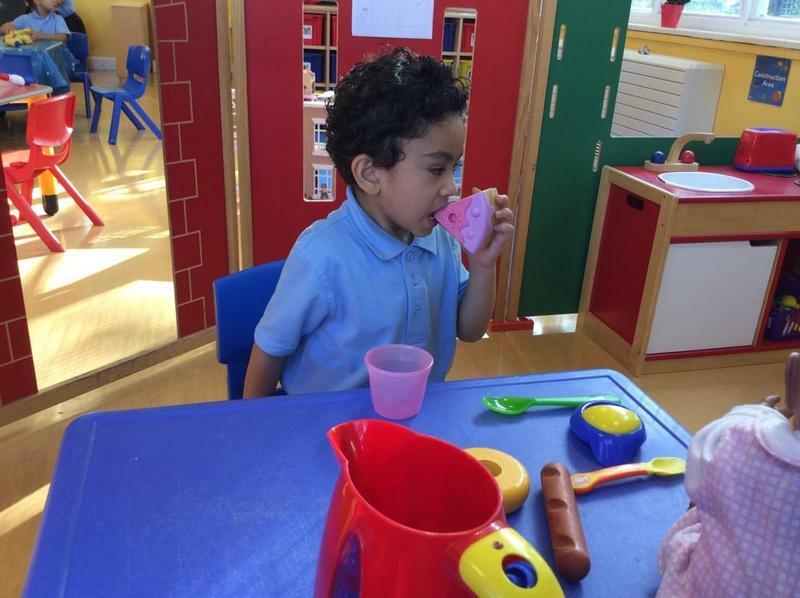 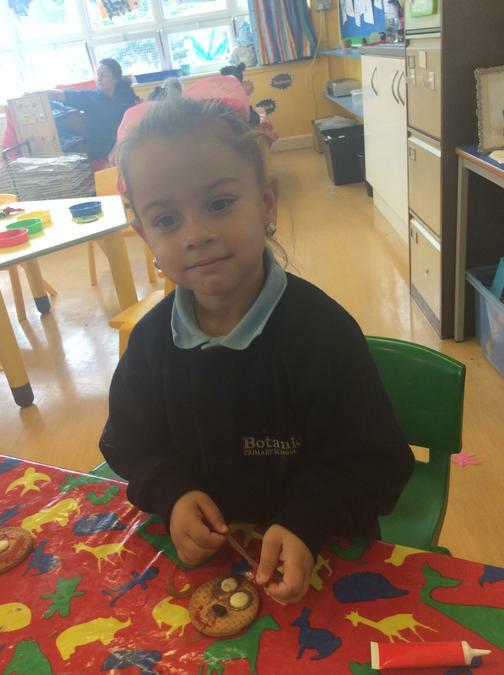 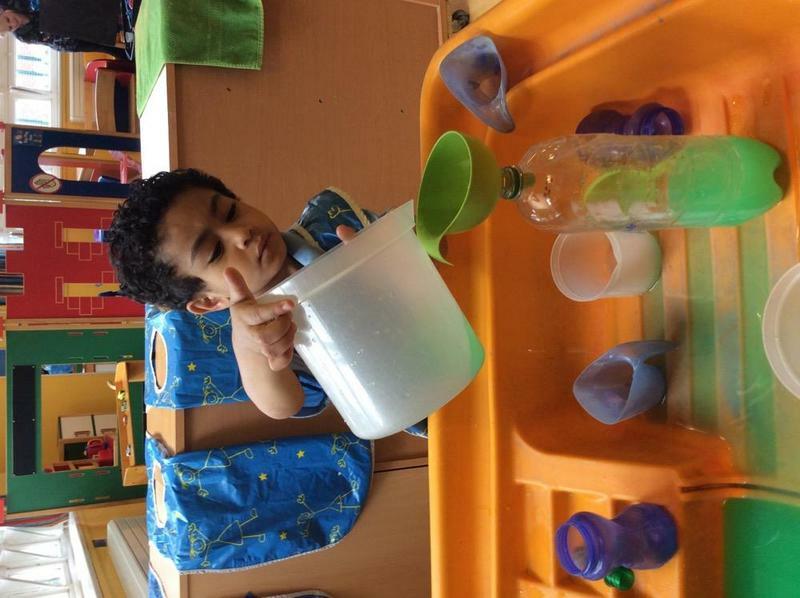 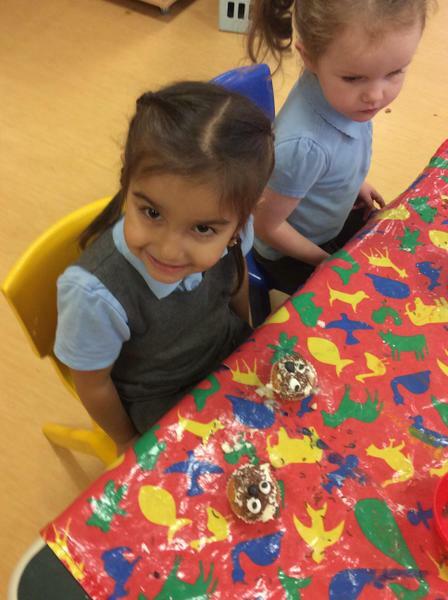 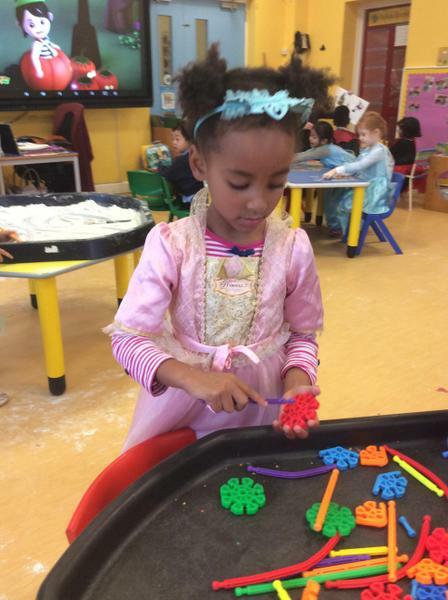 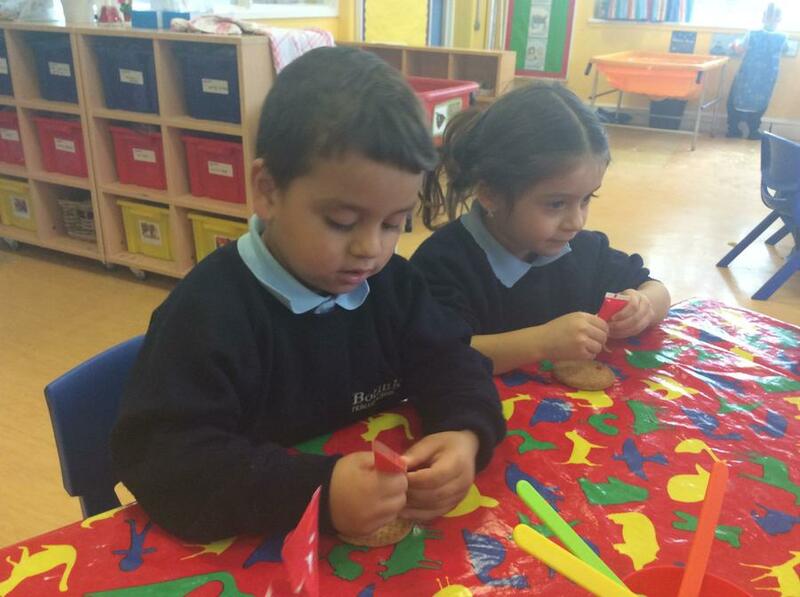 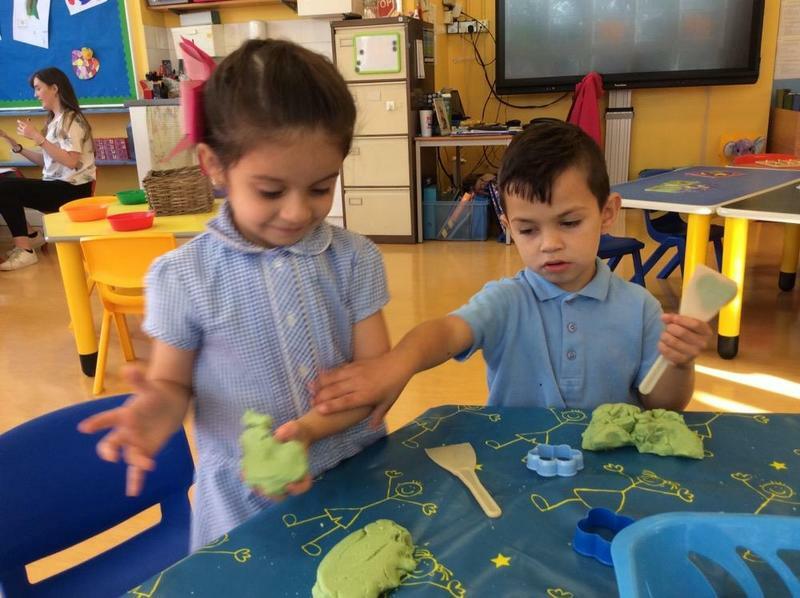 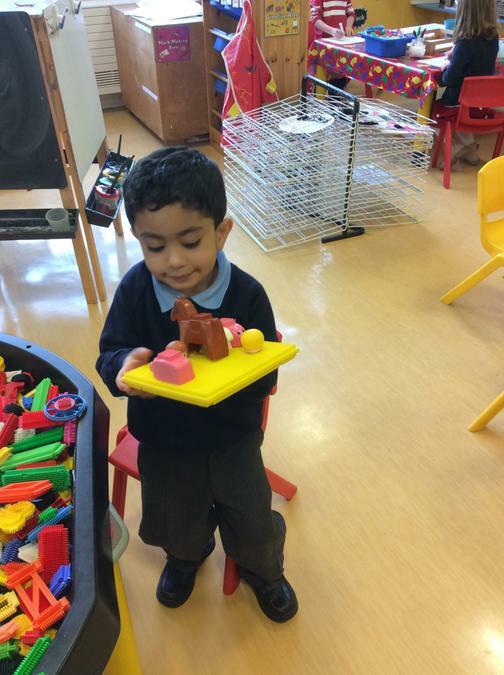 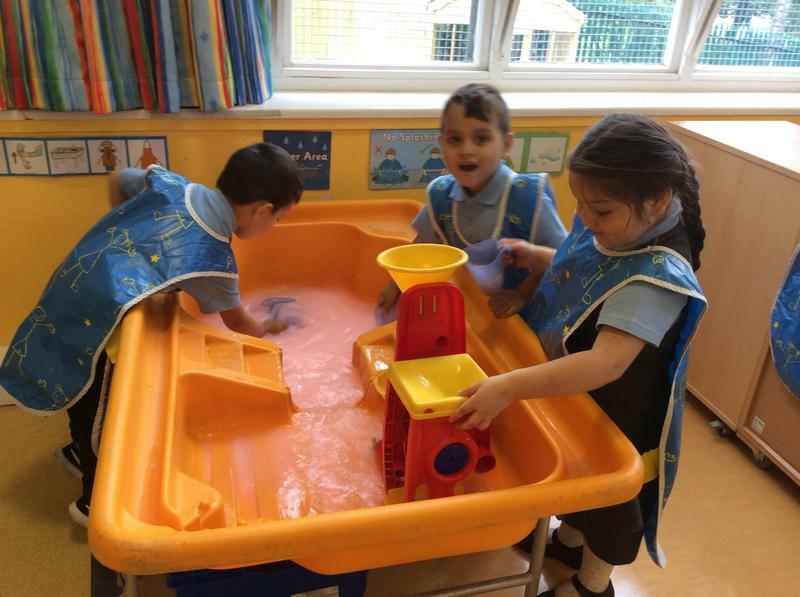 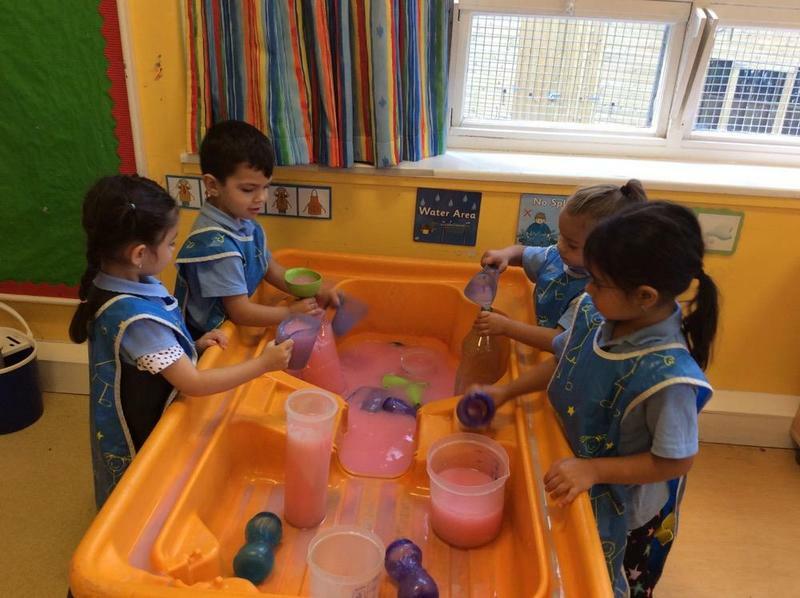 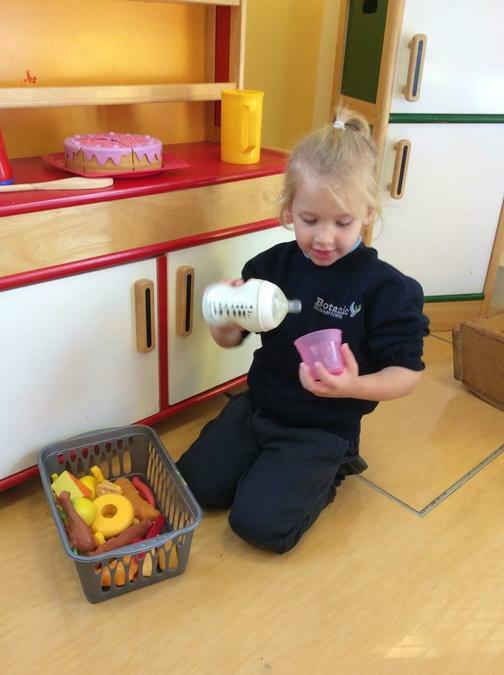 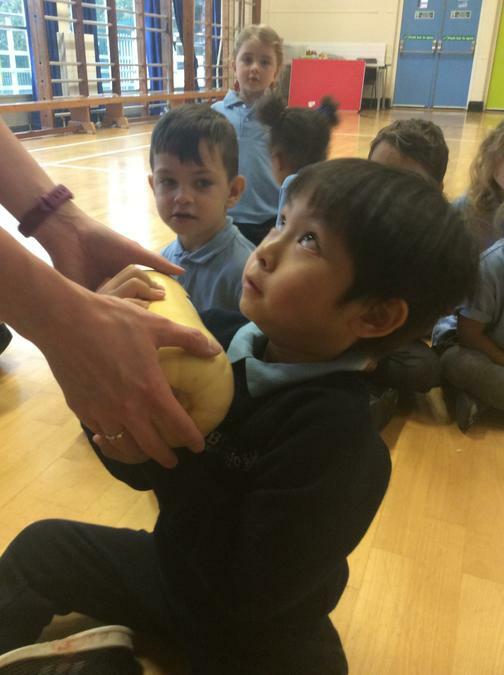 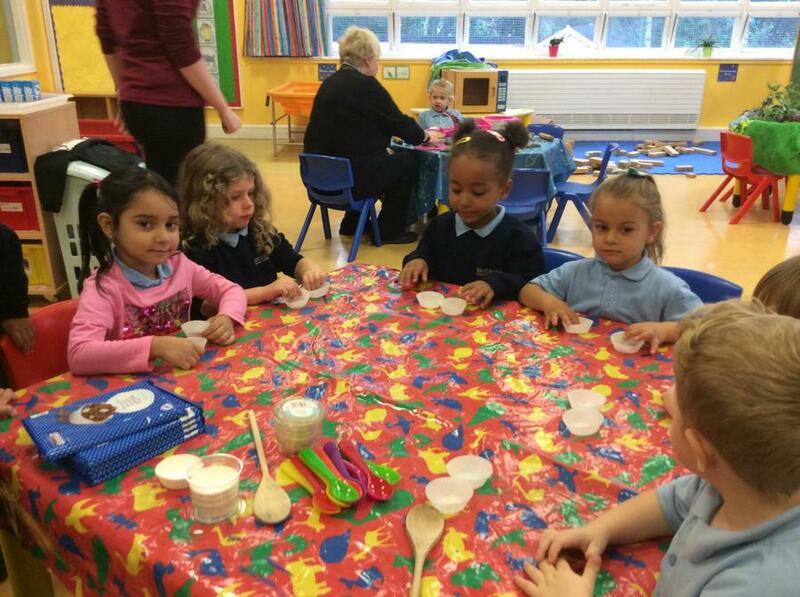 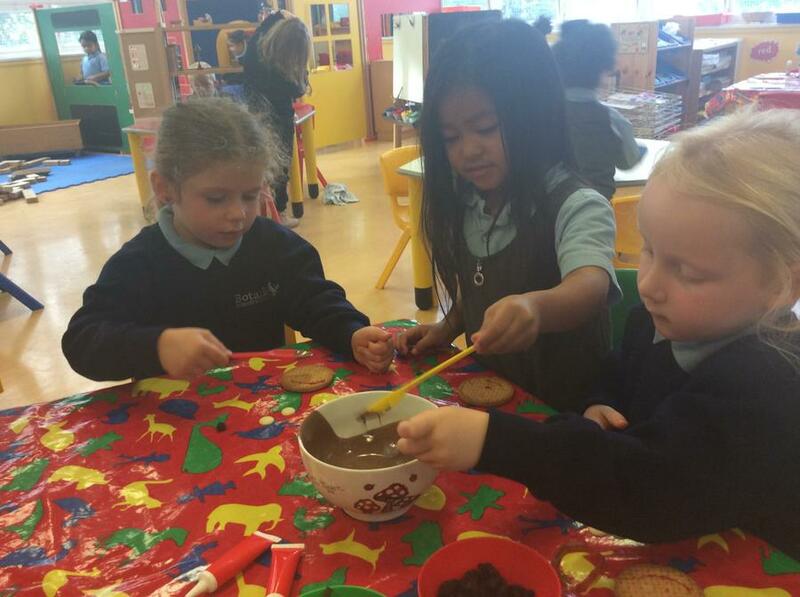 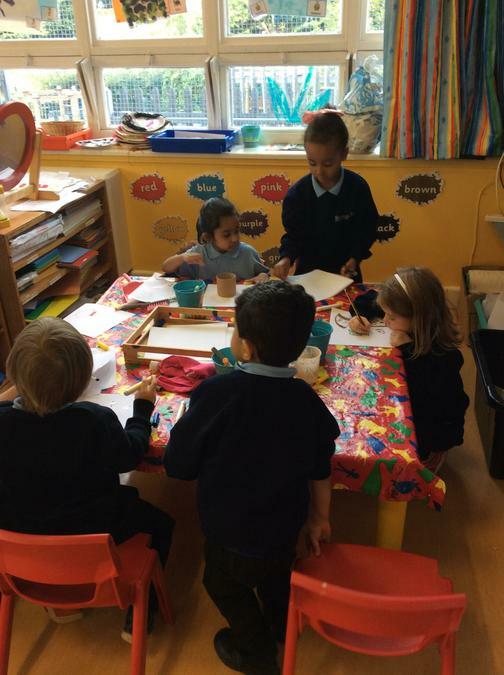 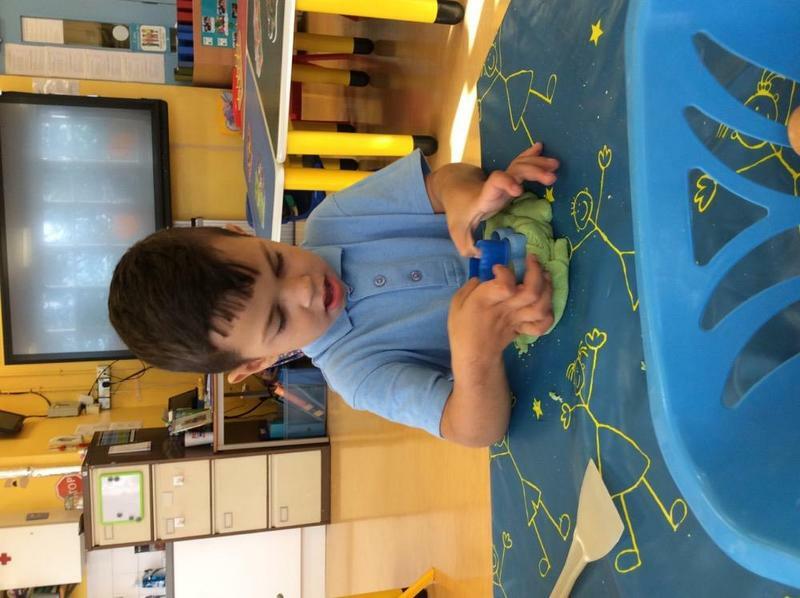 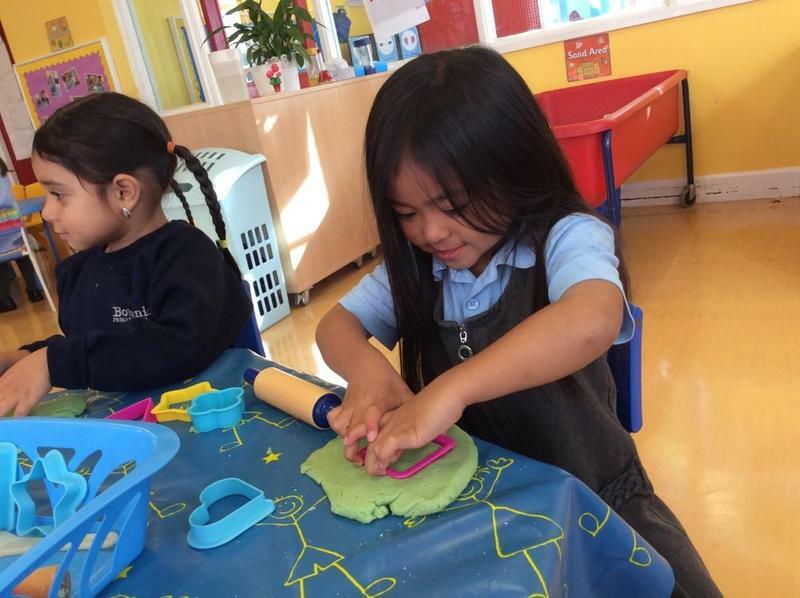 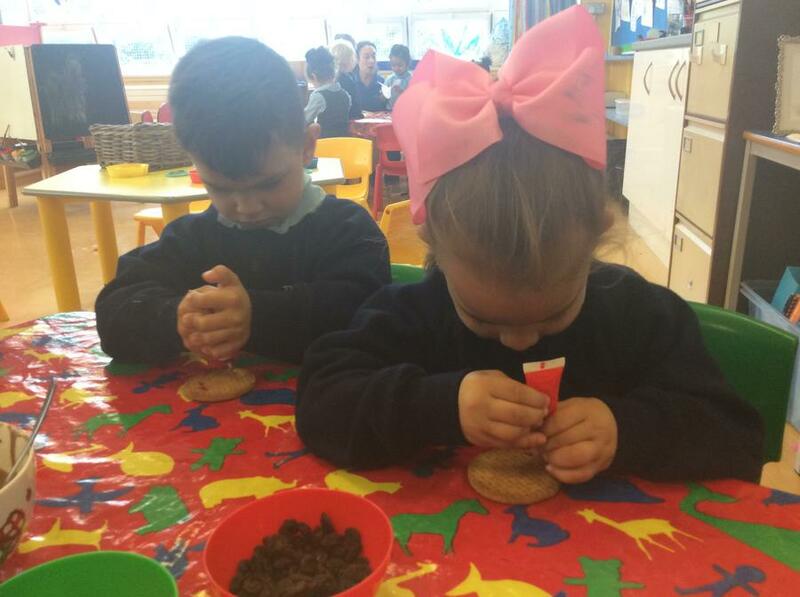 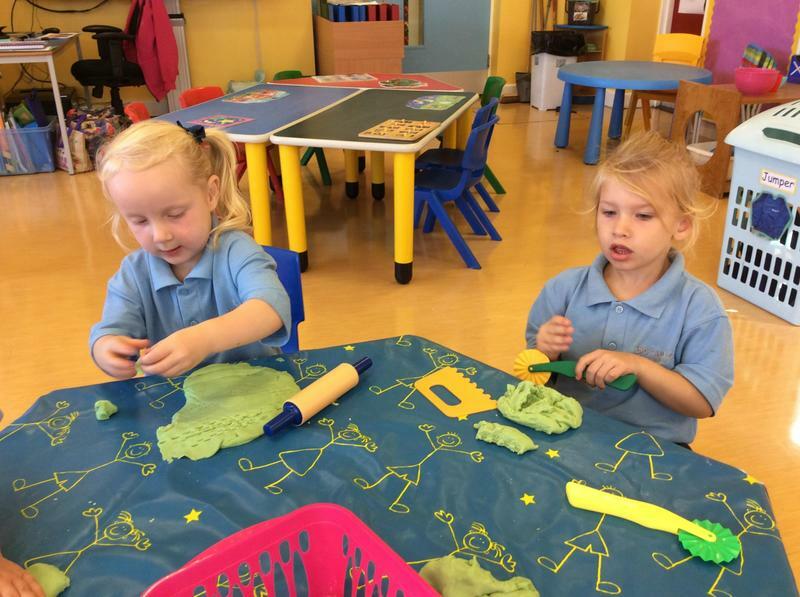 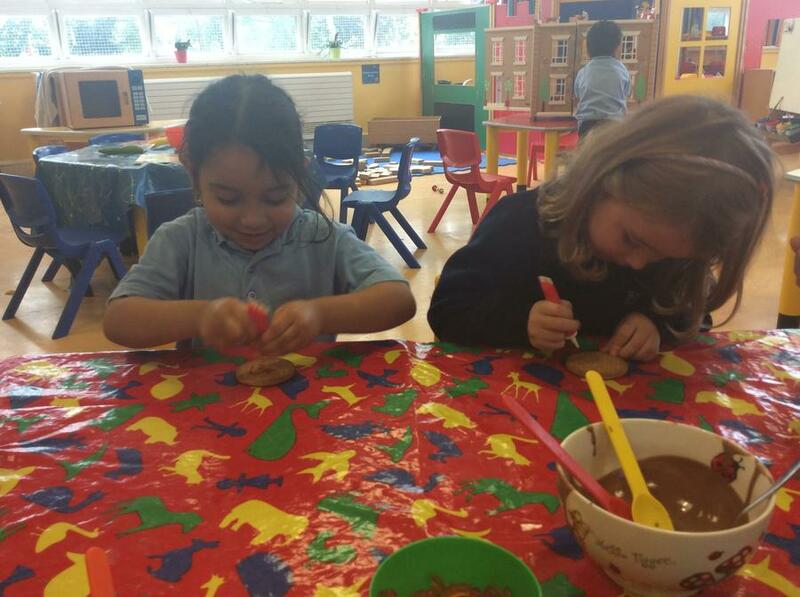 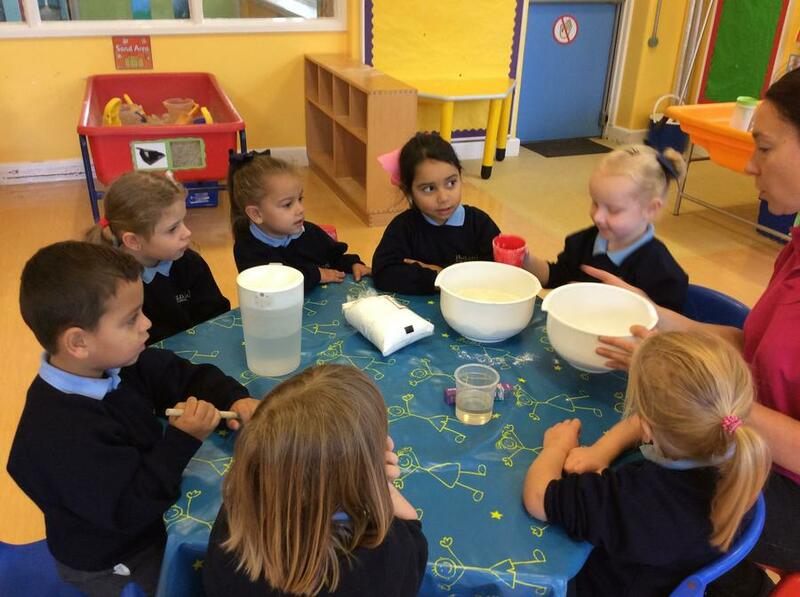 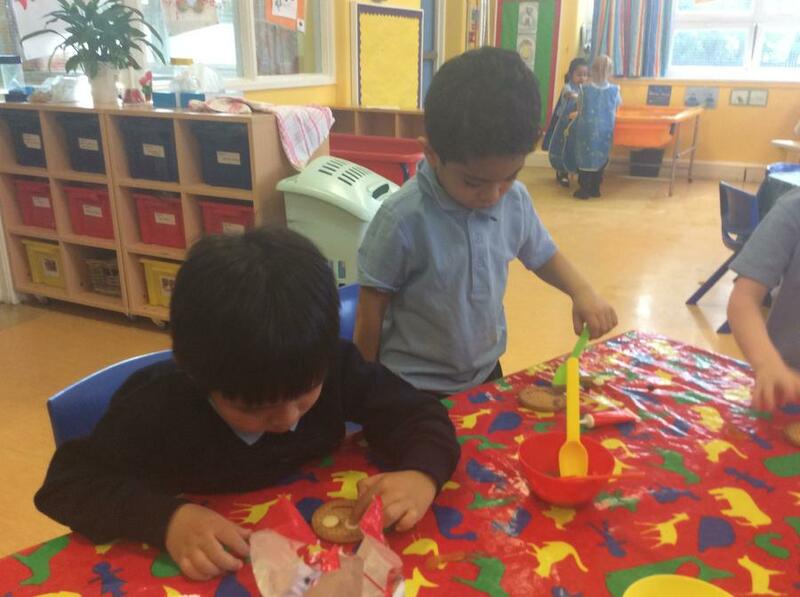 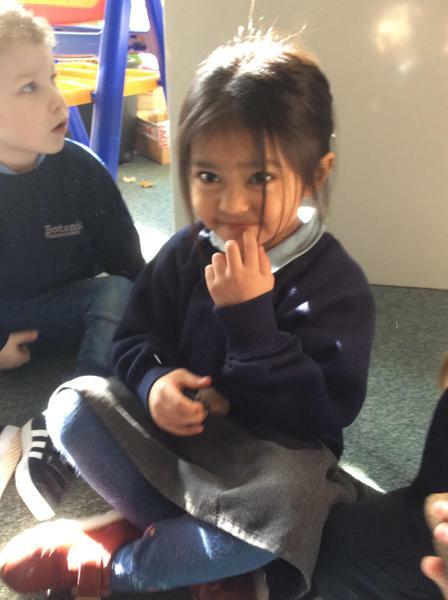 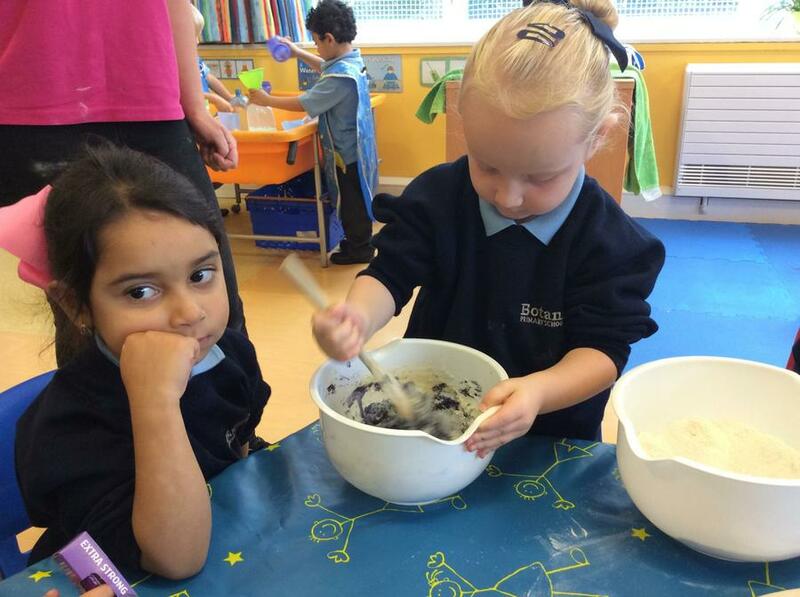 In nursery the children help to make the playdough. 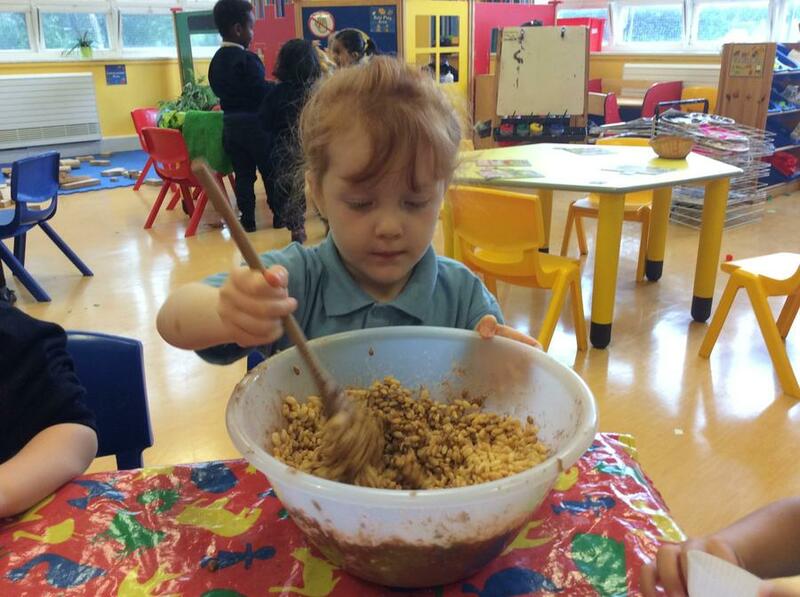 We follow the visual recipe, count out the ingredients and mix in a variety of colours. 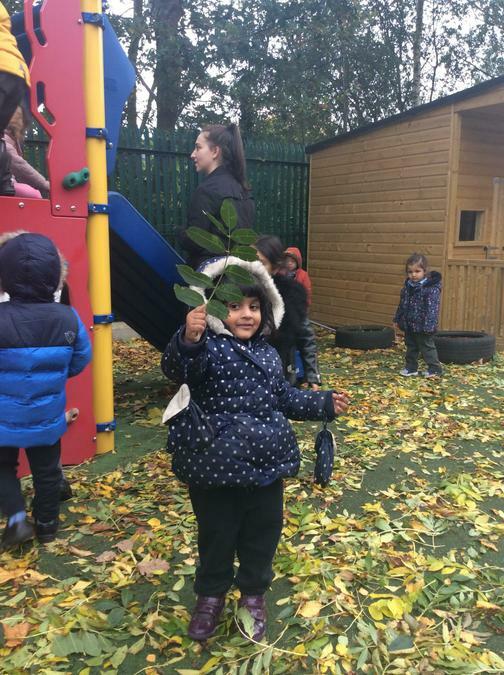 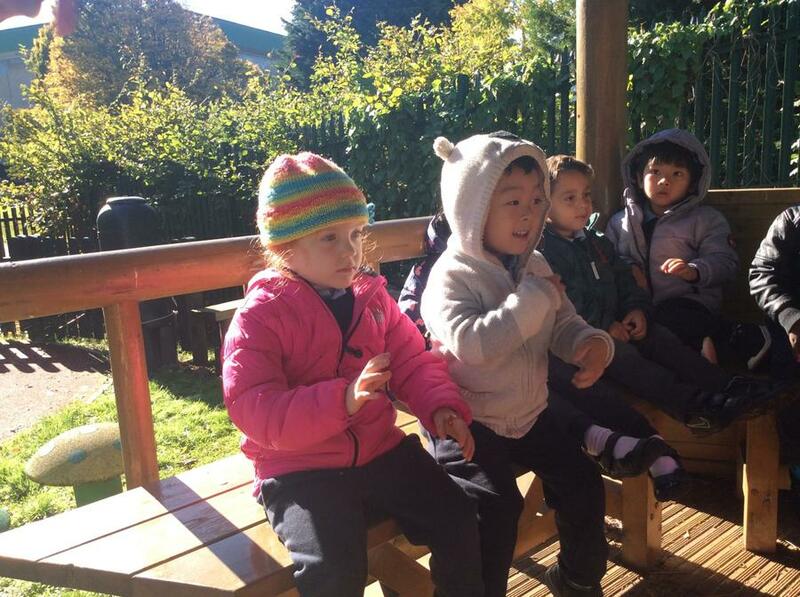 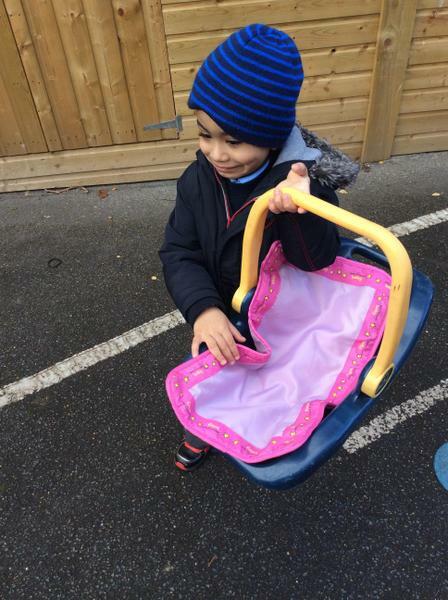 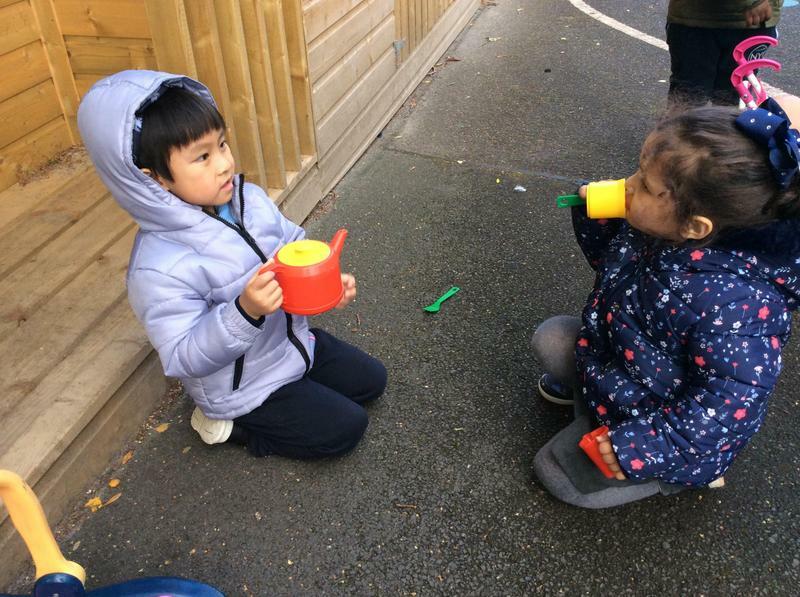 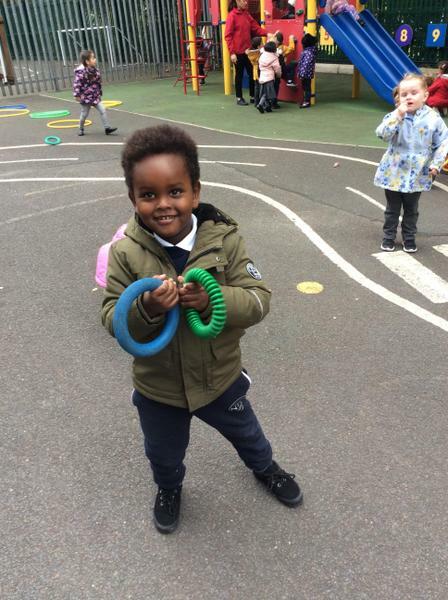 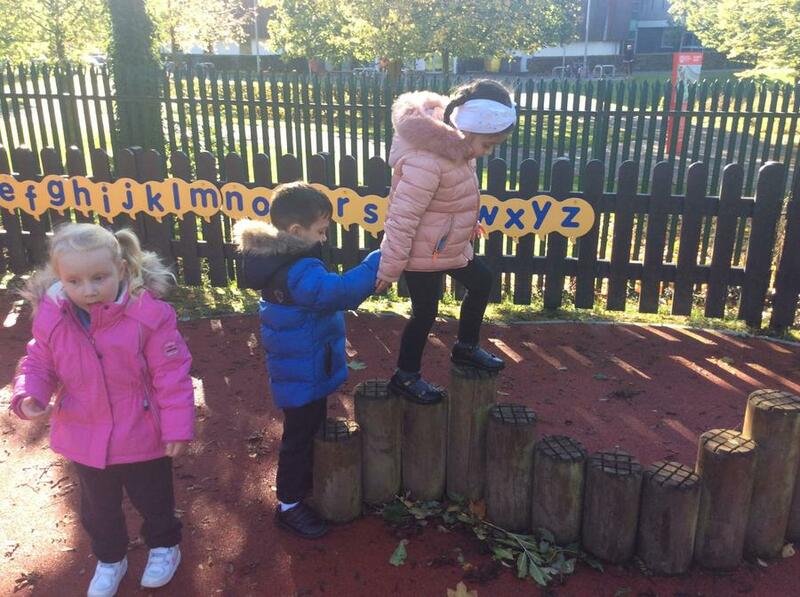 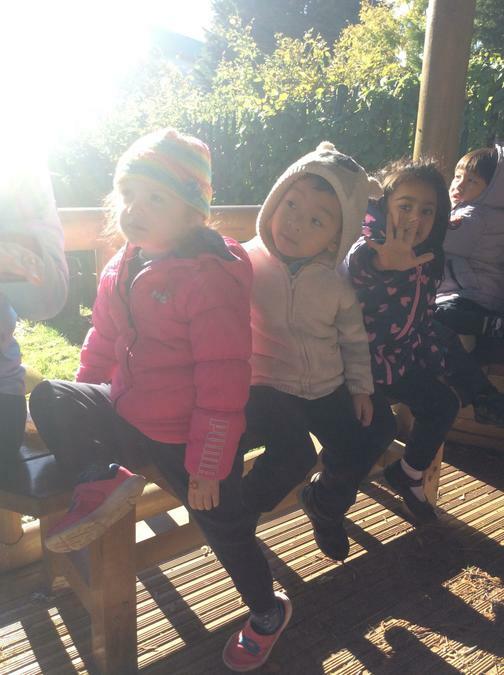 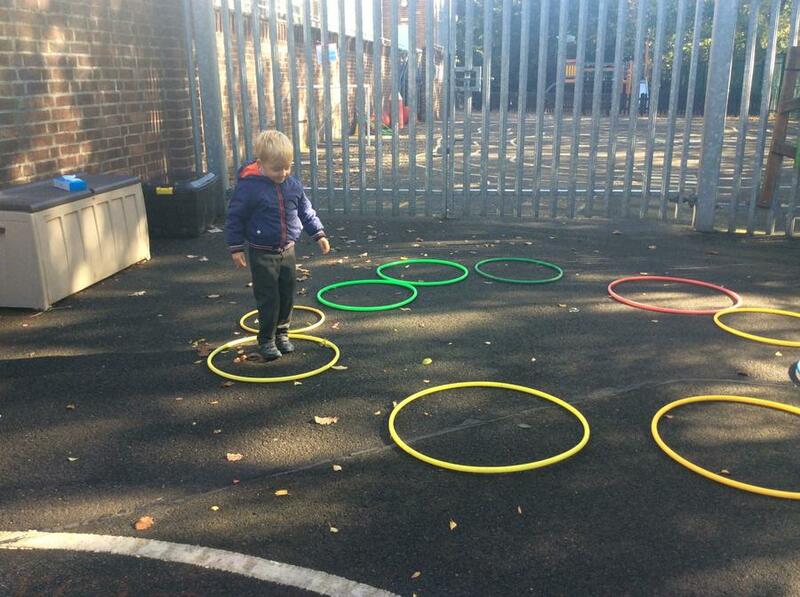 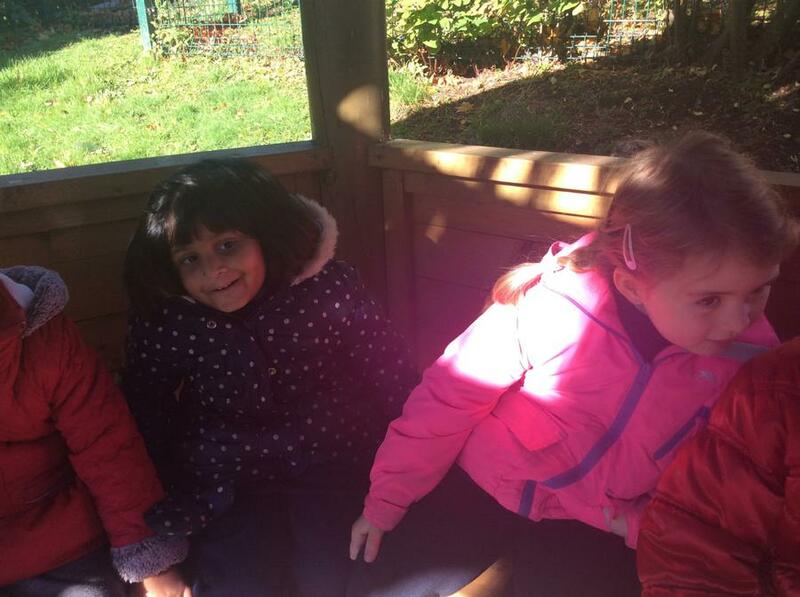 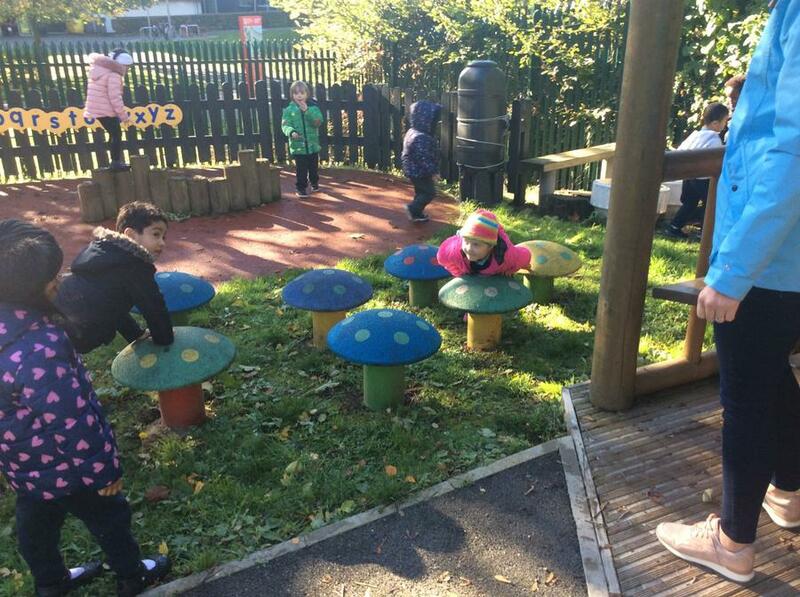 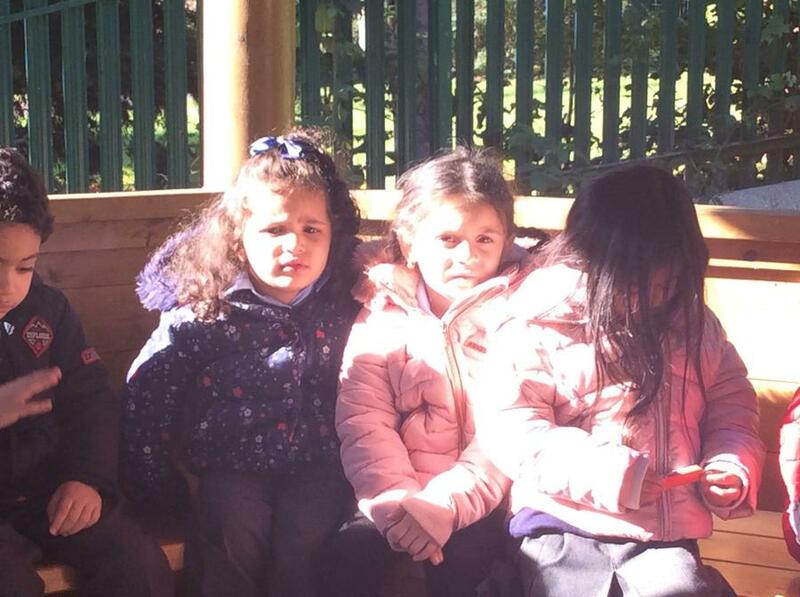 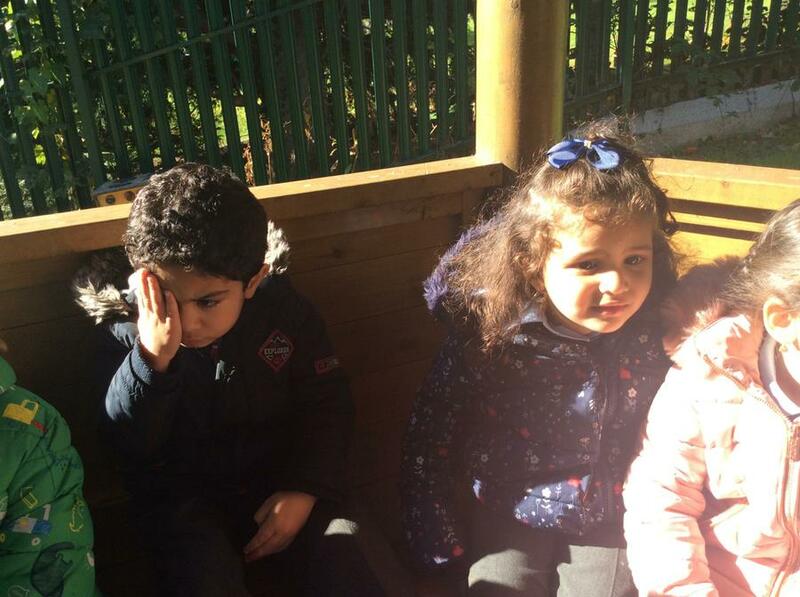 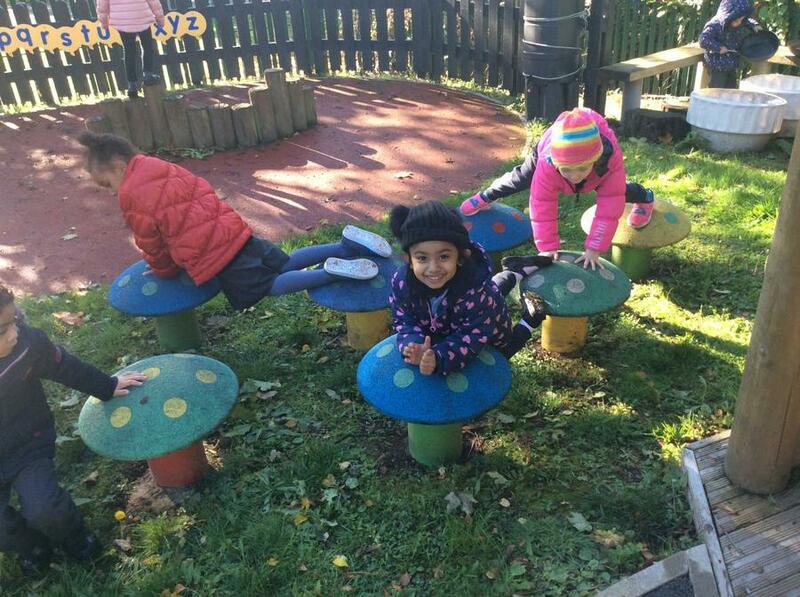 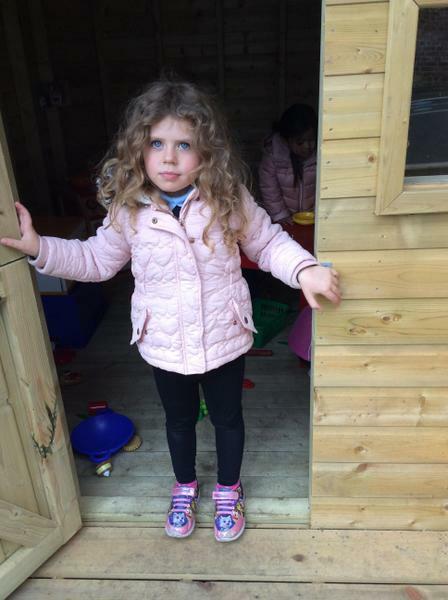 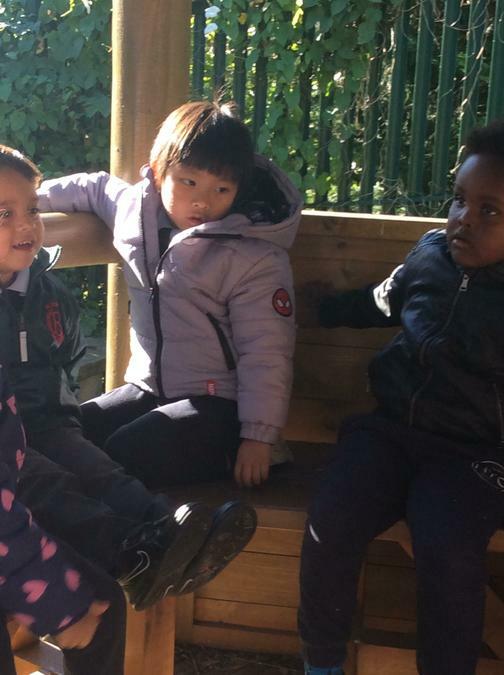 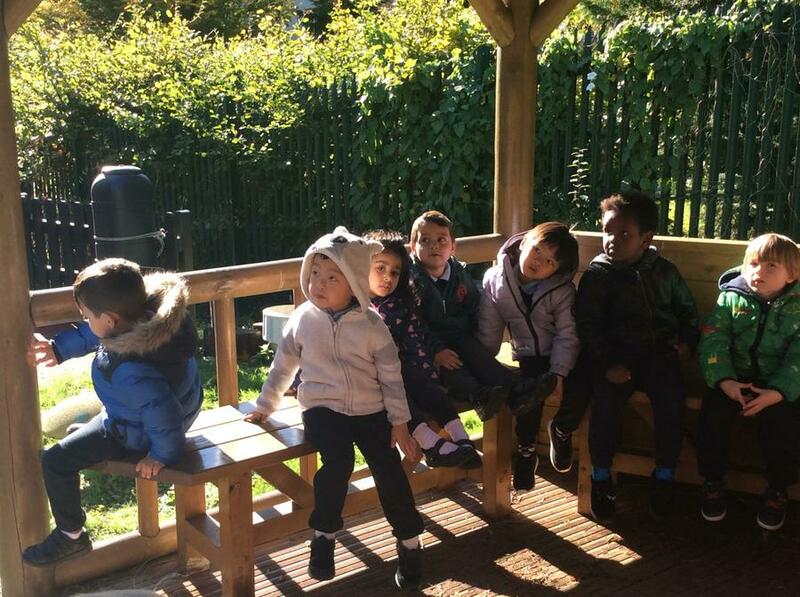 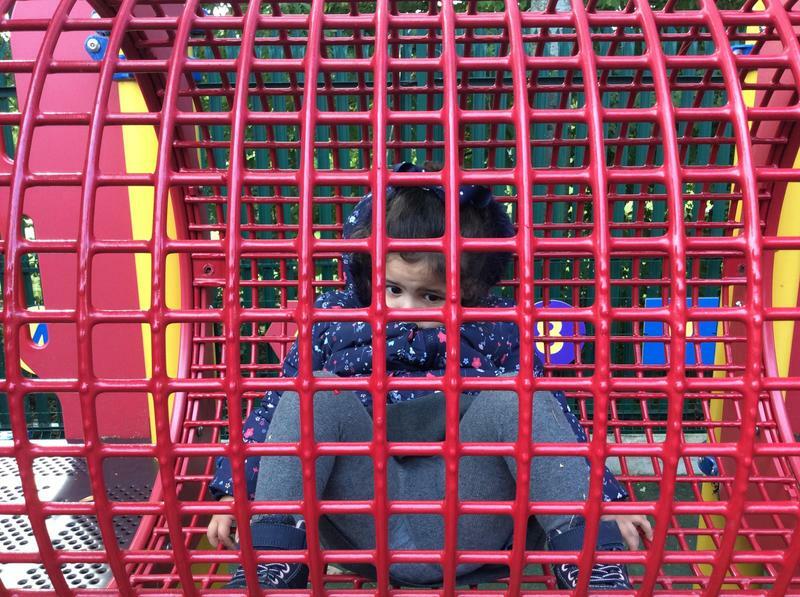 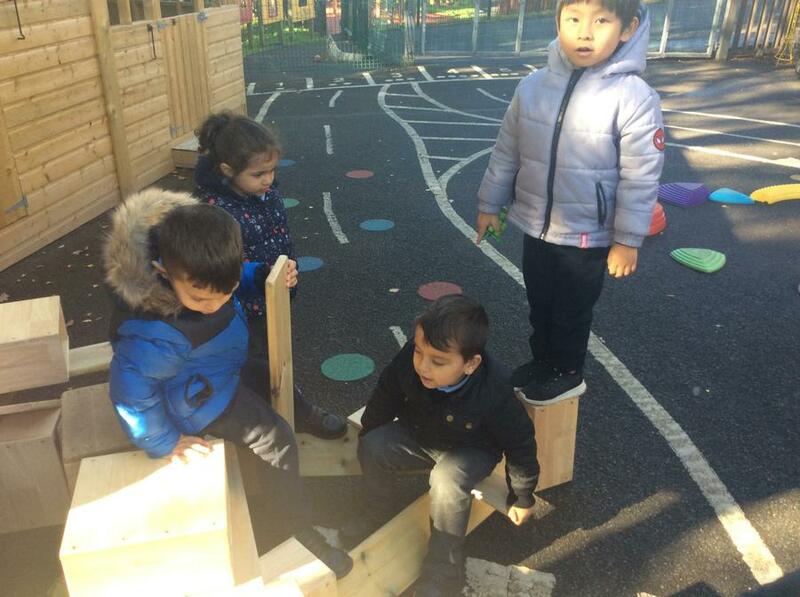 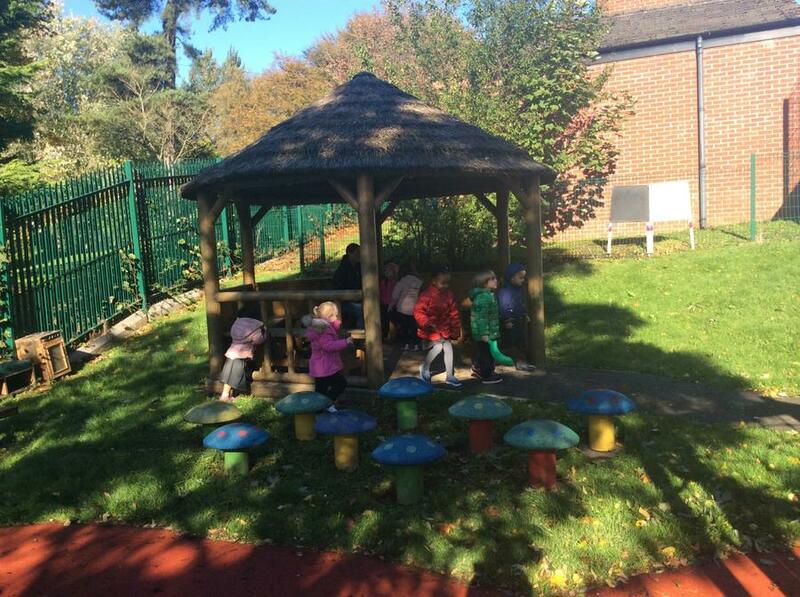 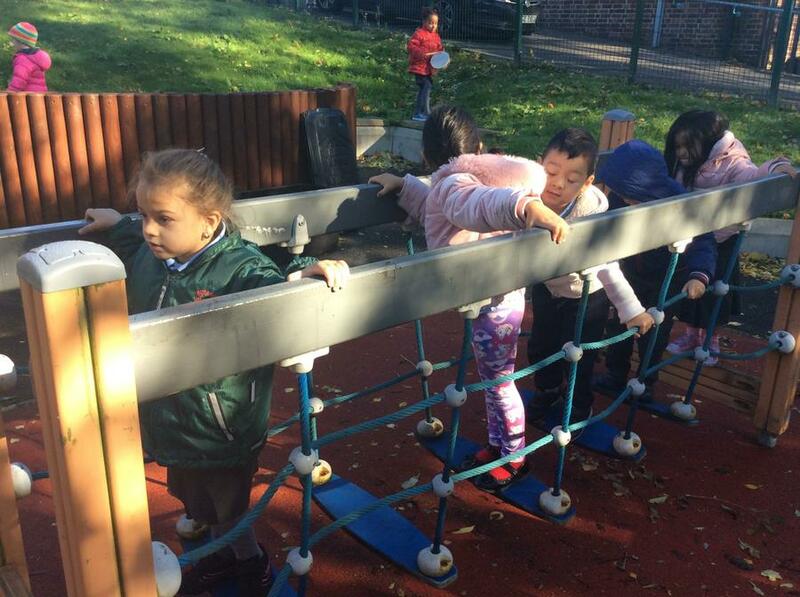 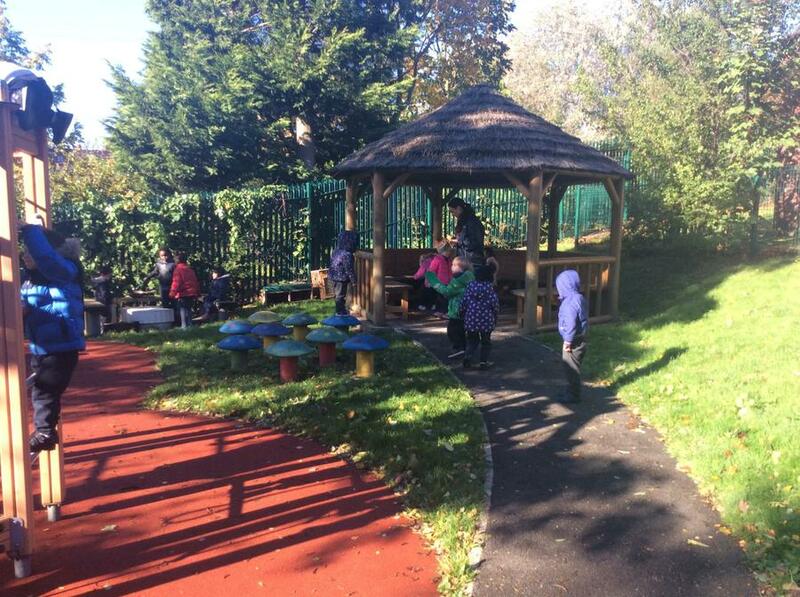 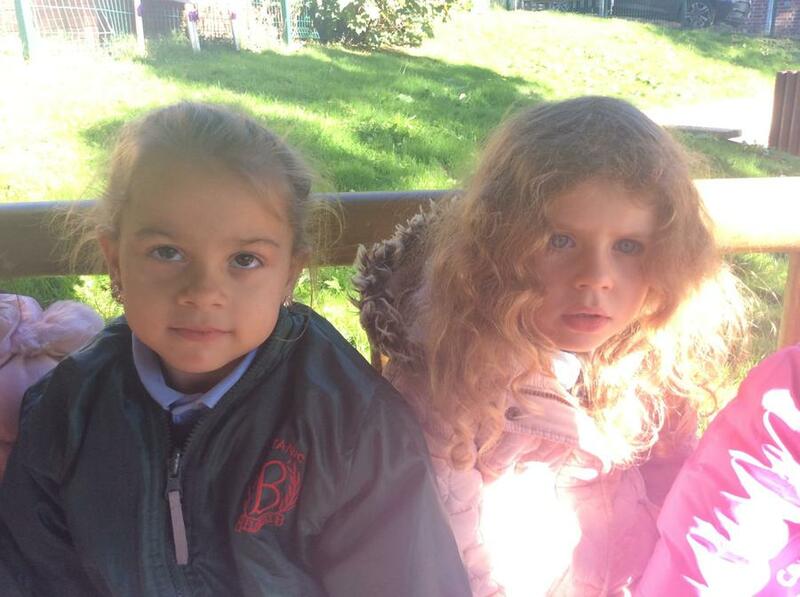 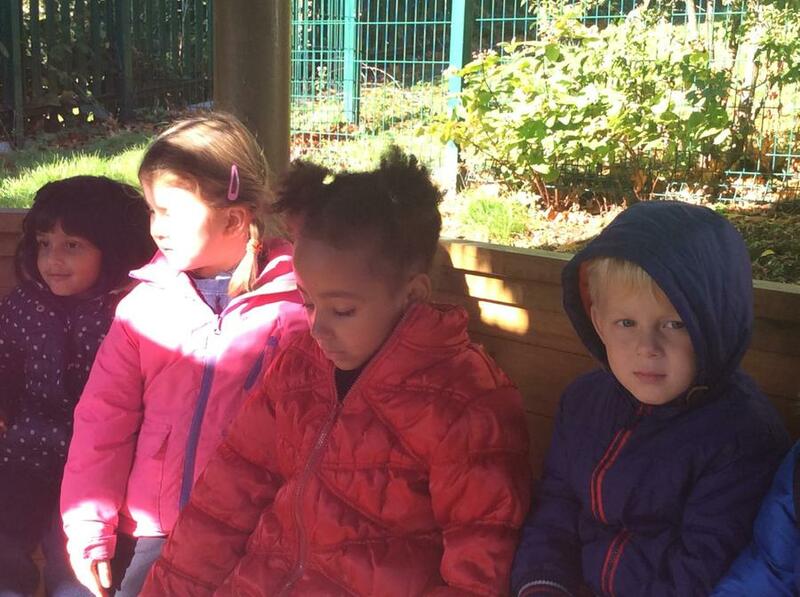 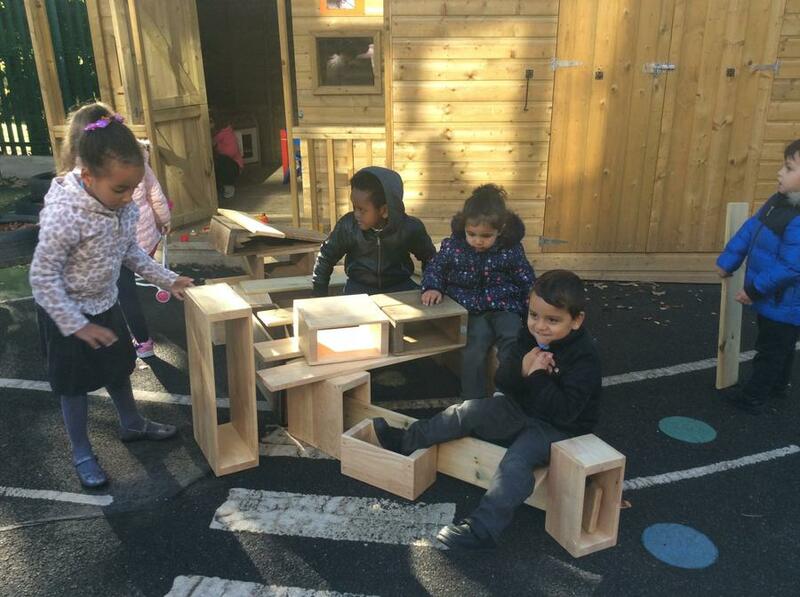 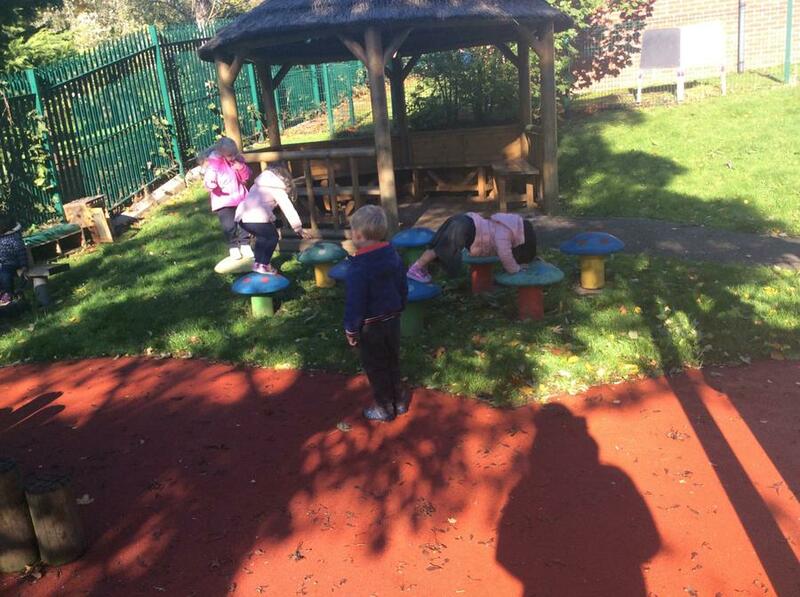 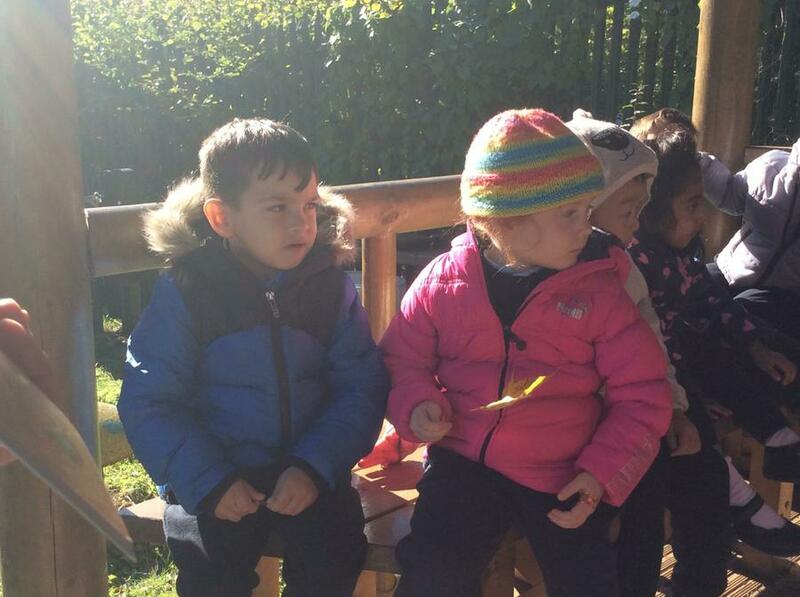 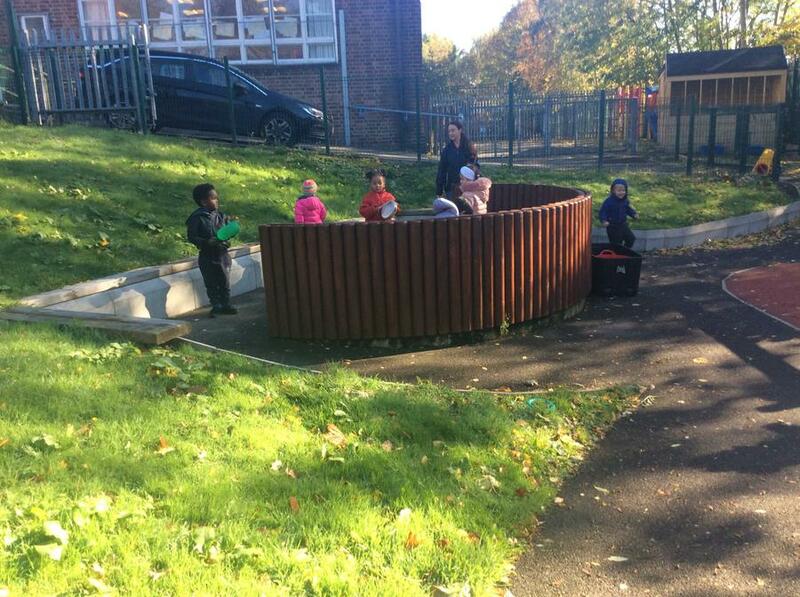 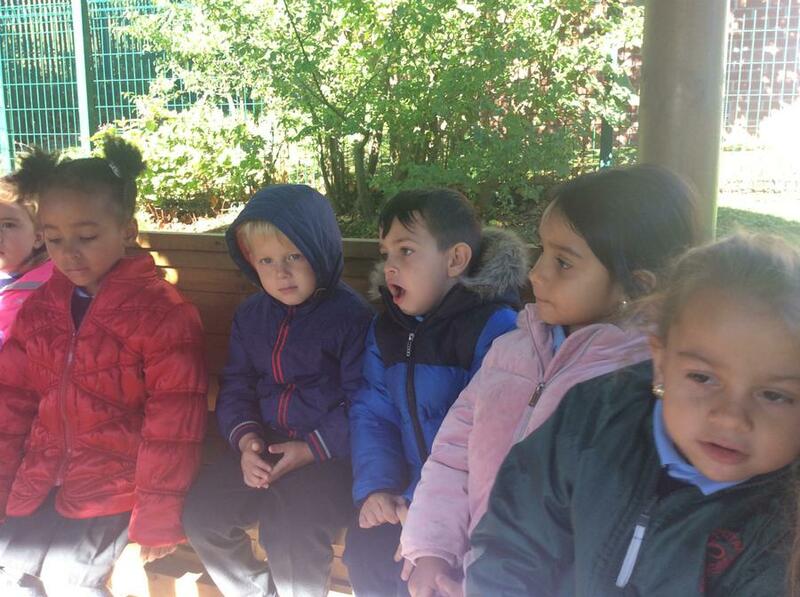 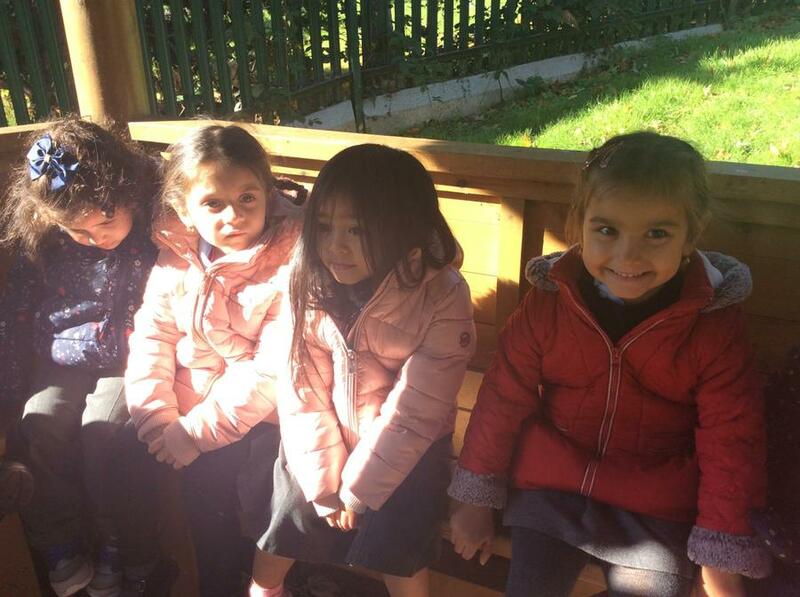 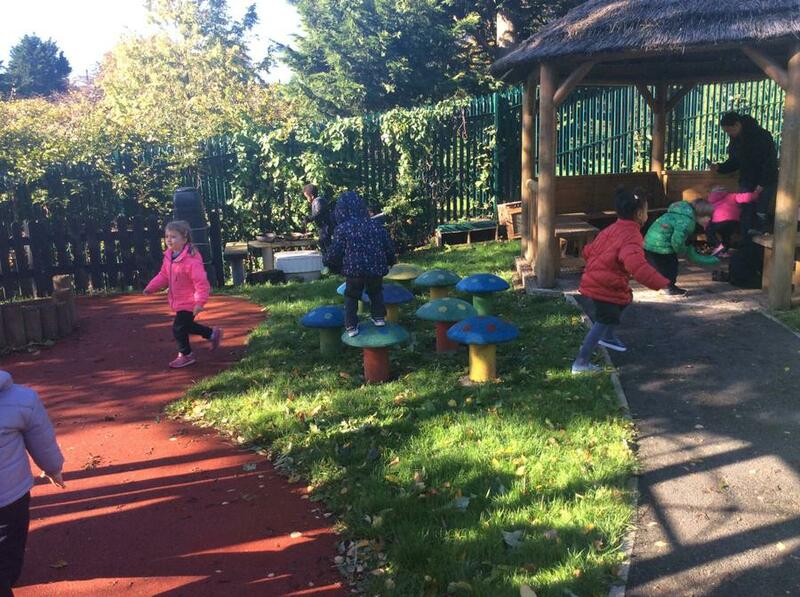 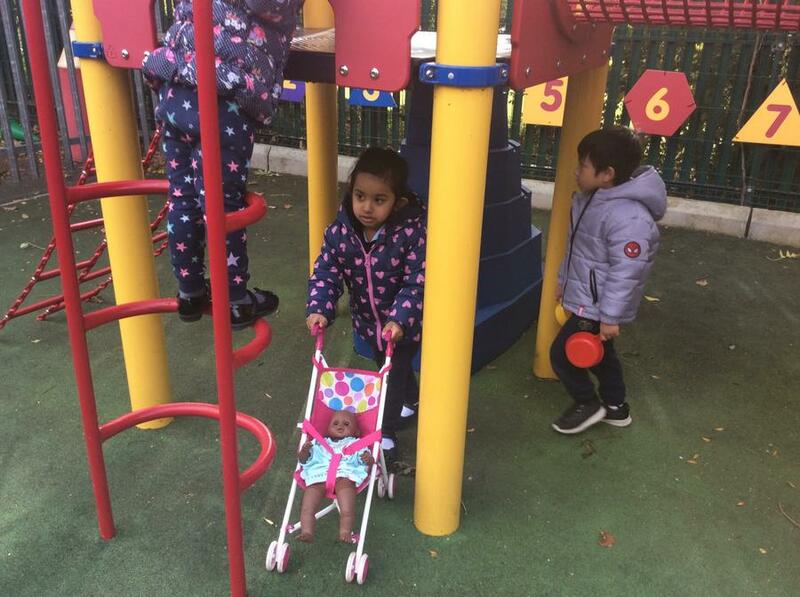 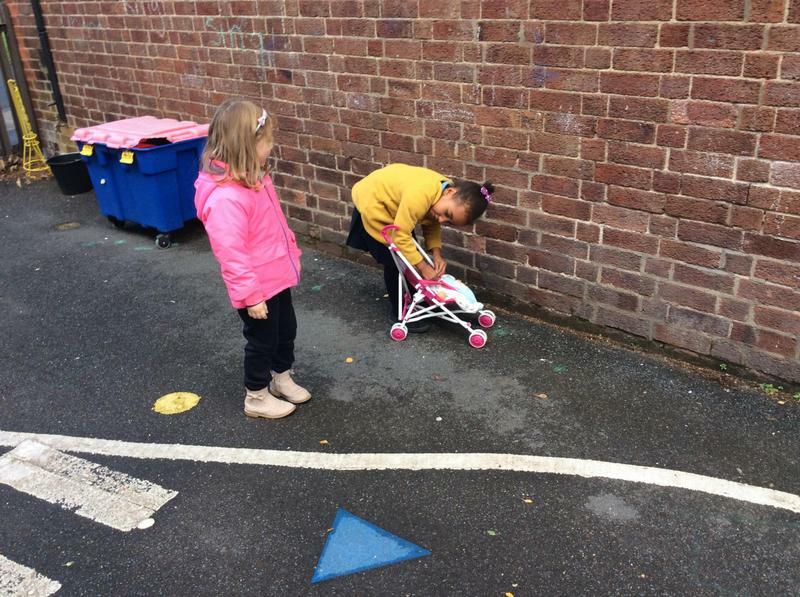 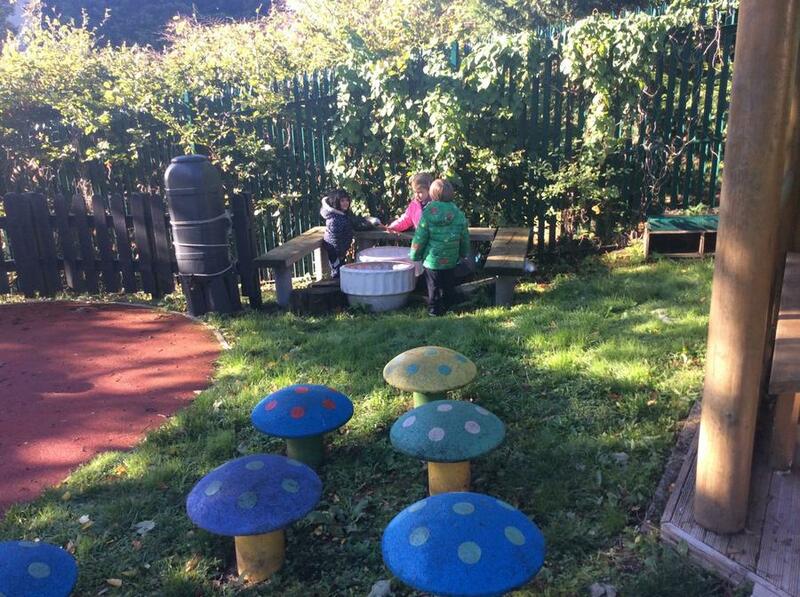 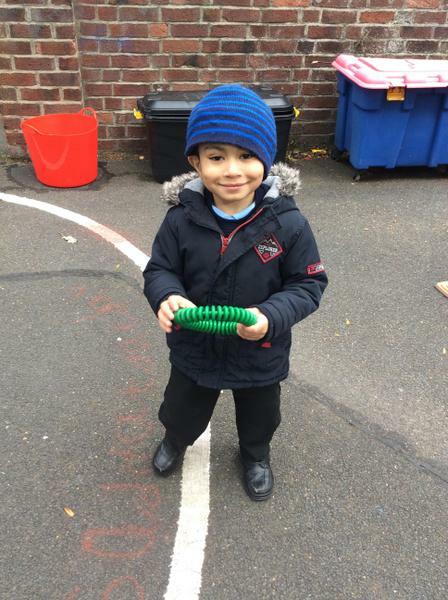 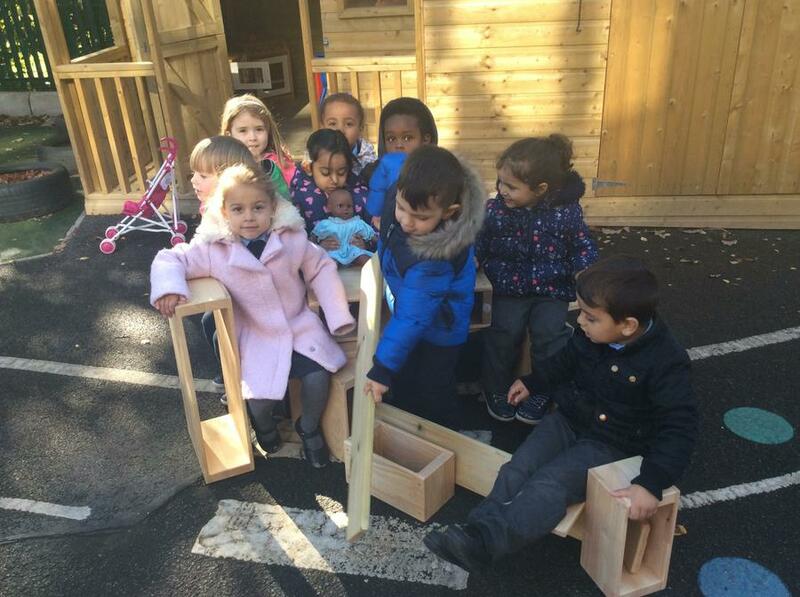 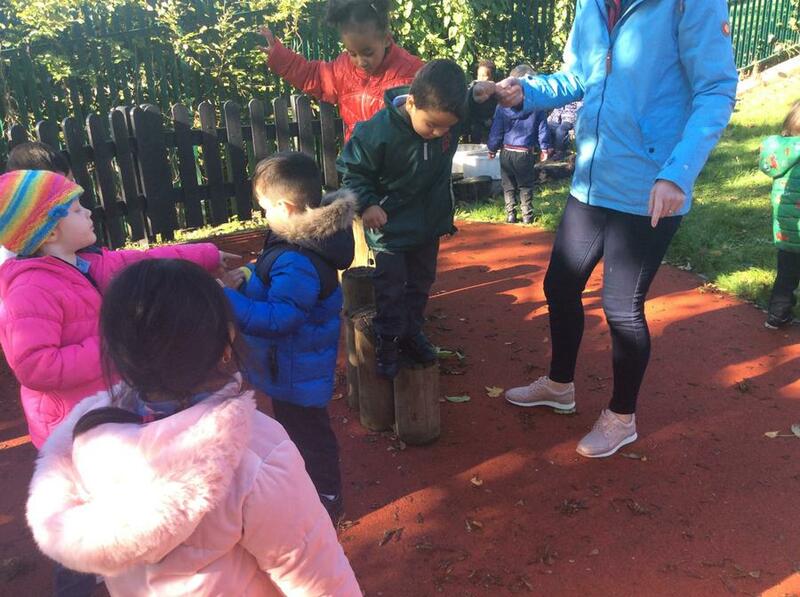 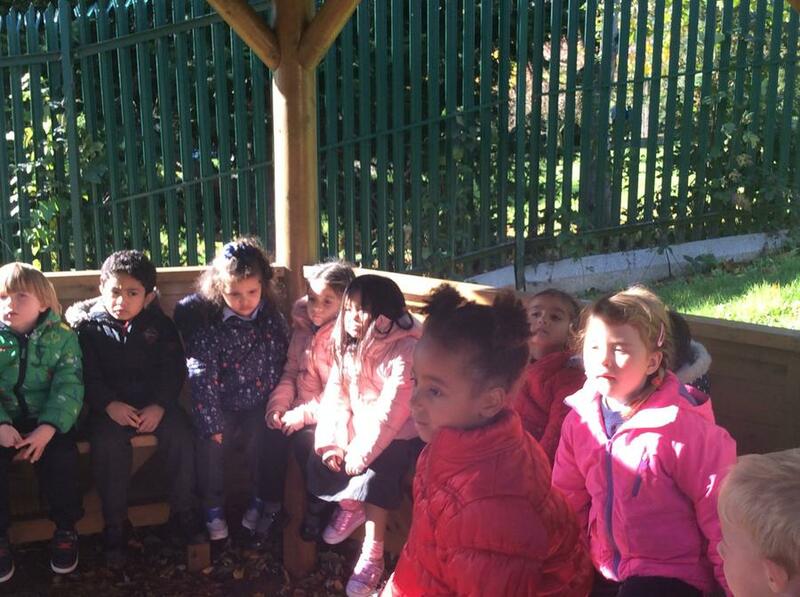 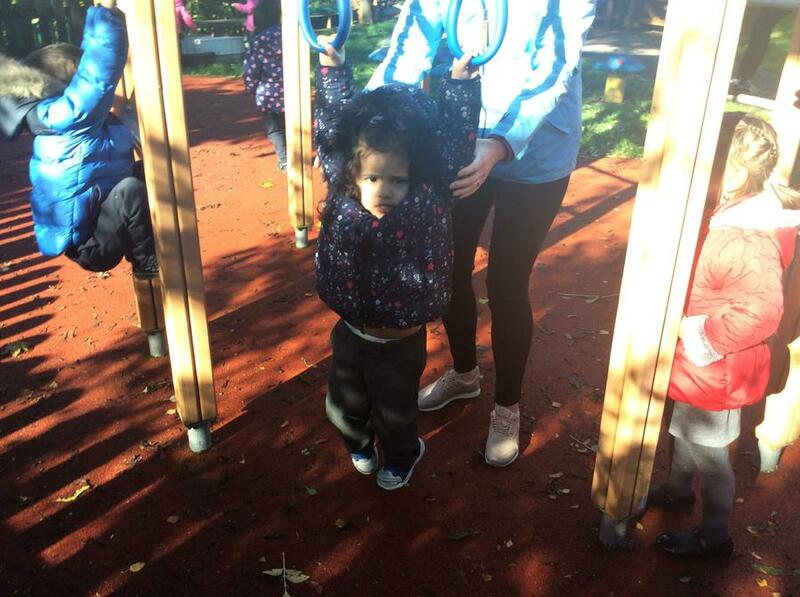 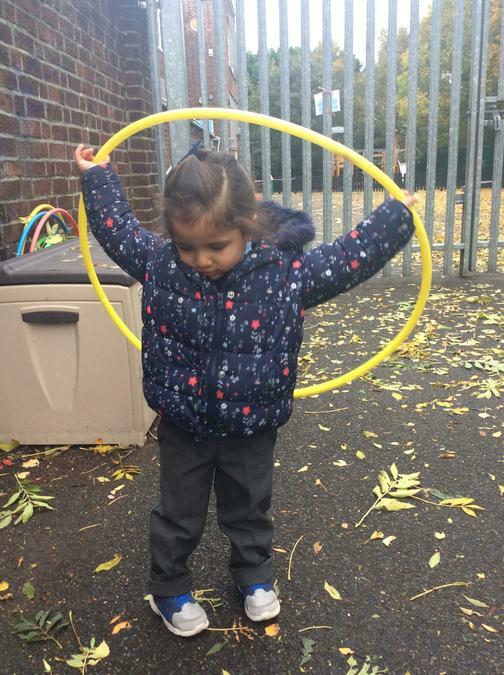 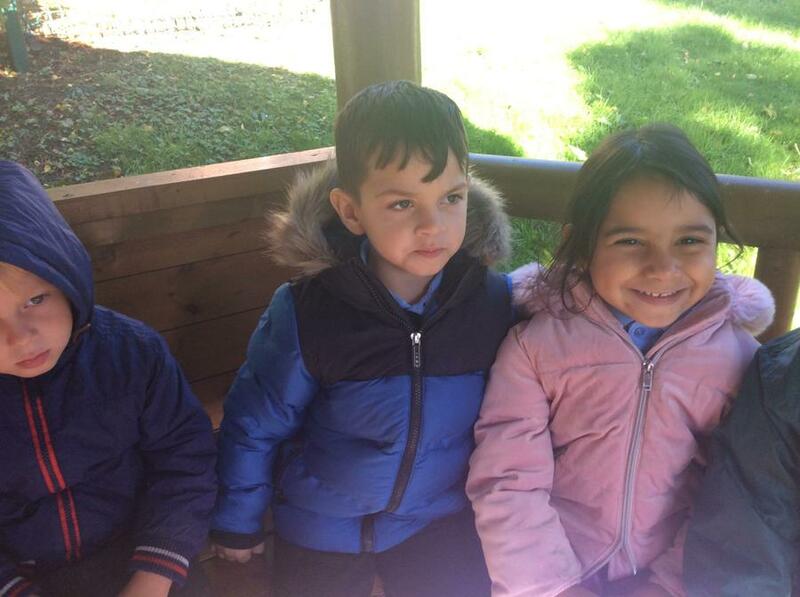 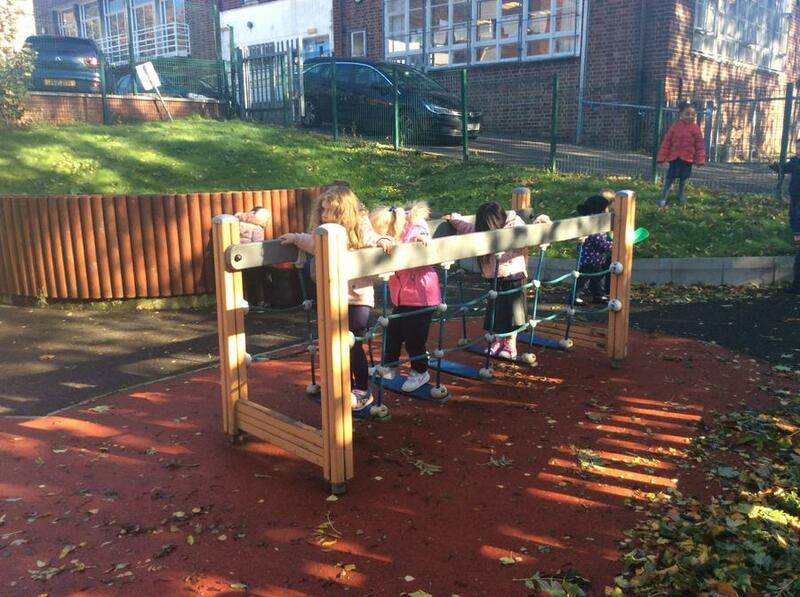 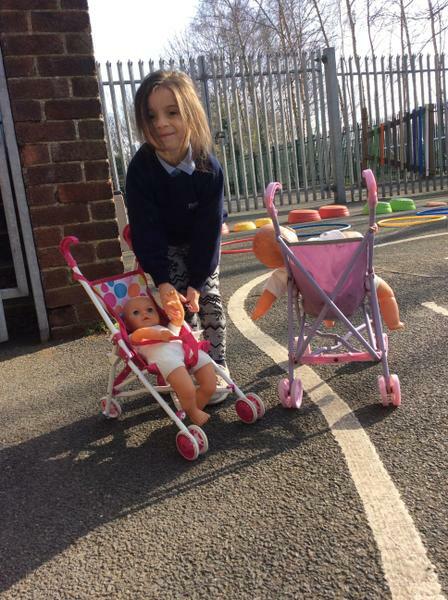 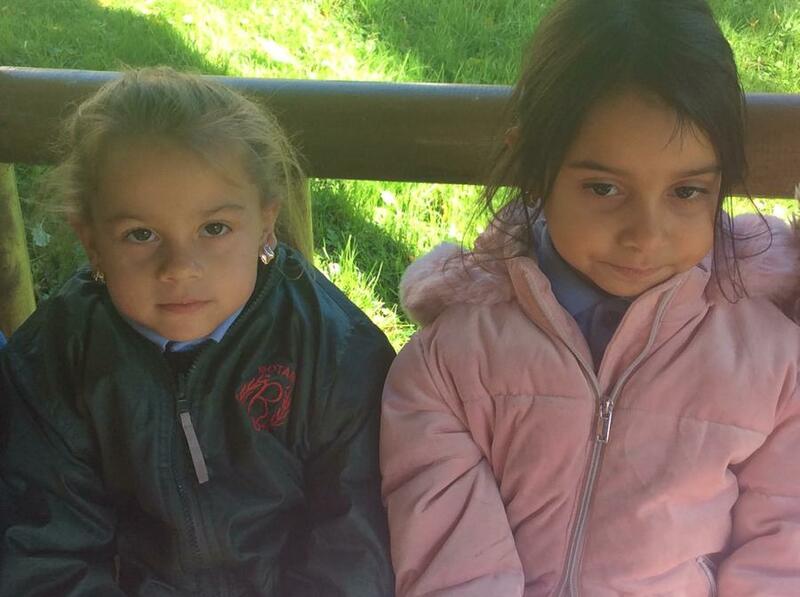 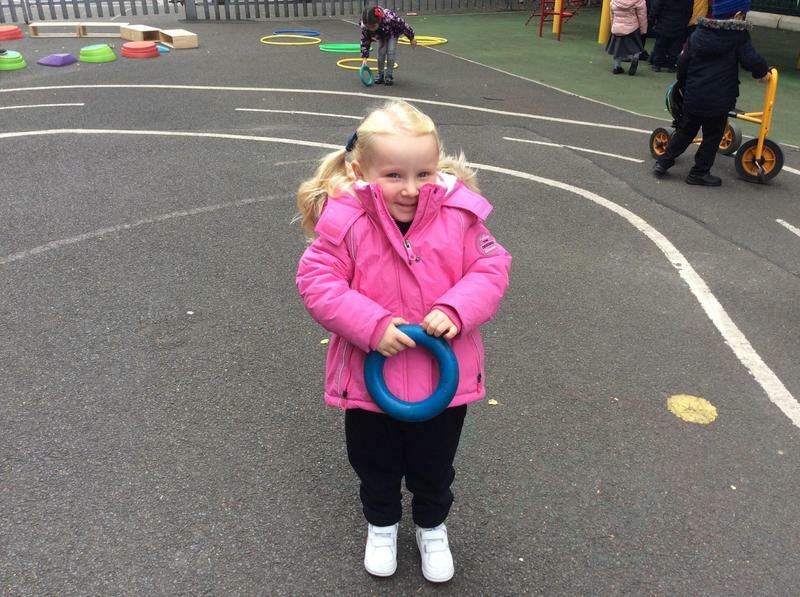 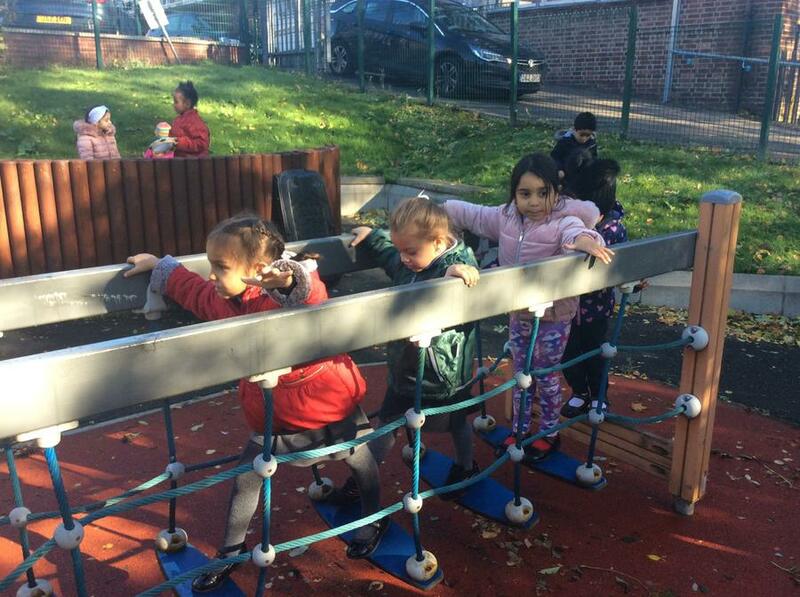 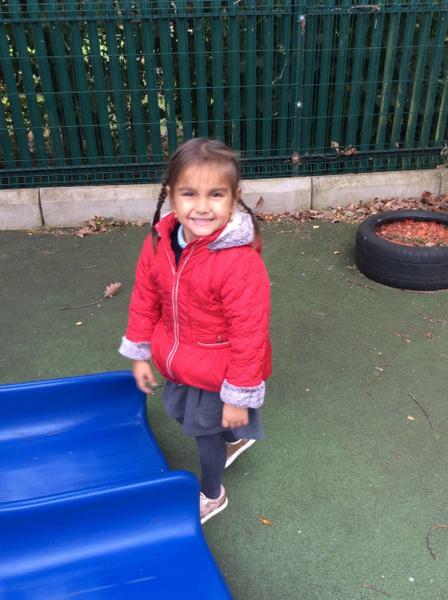 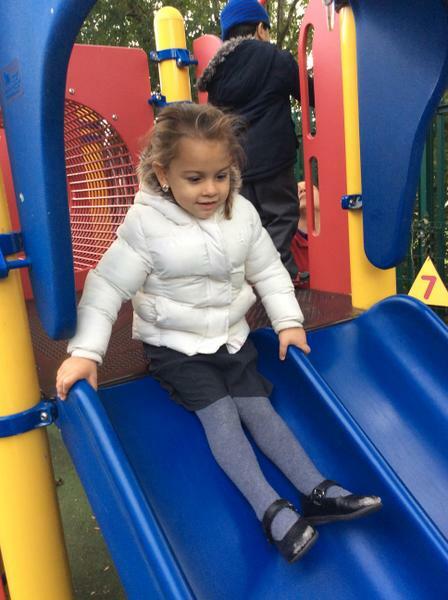 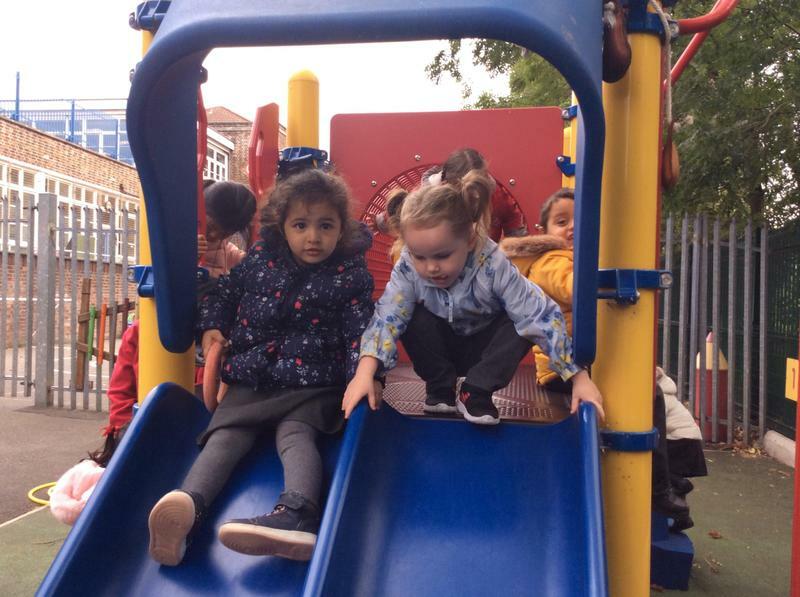 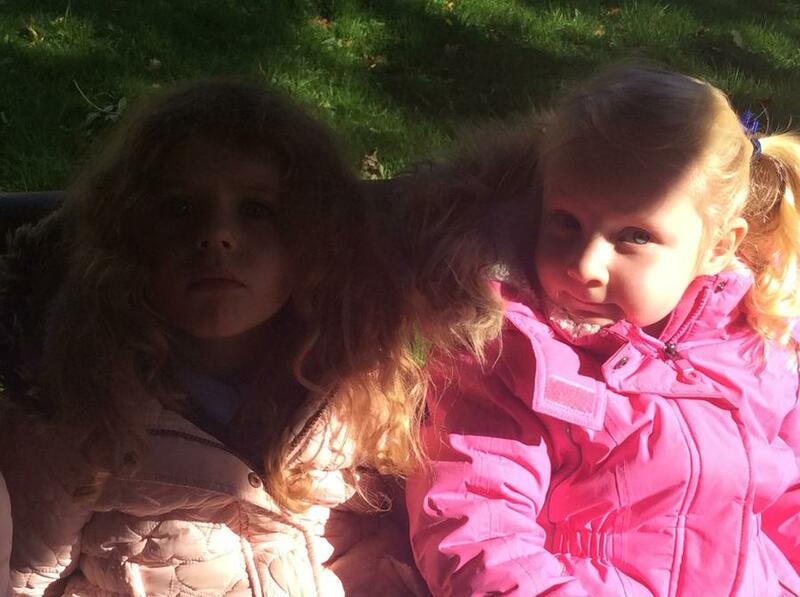 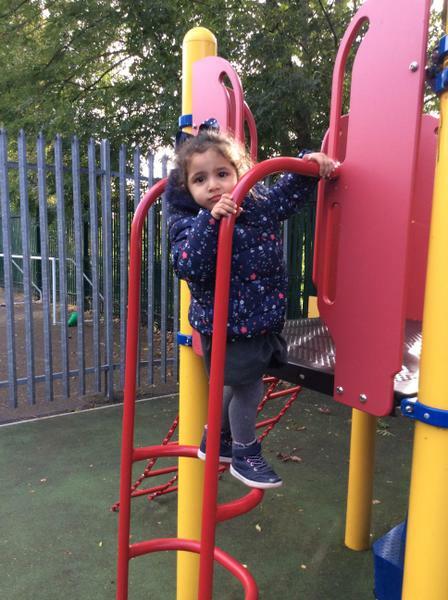 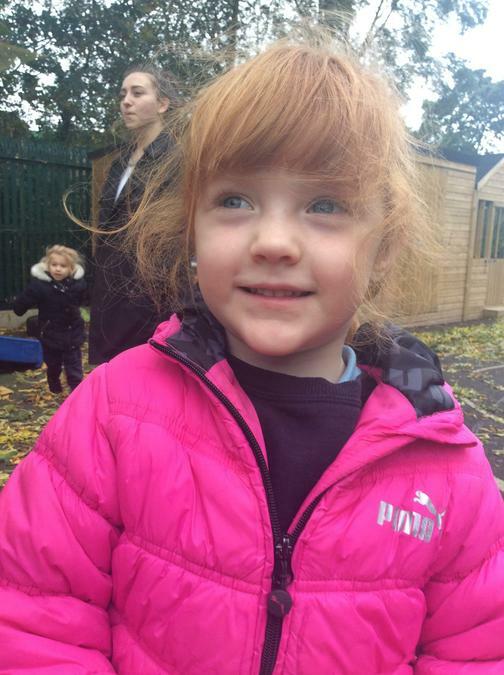 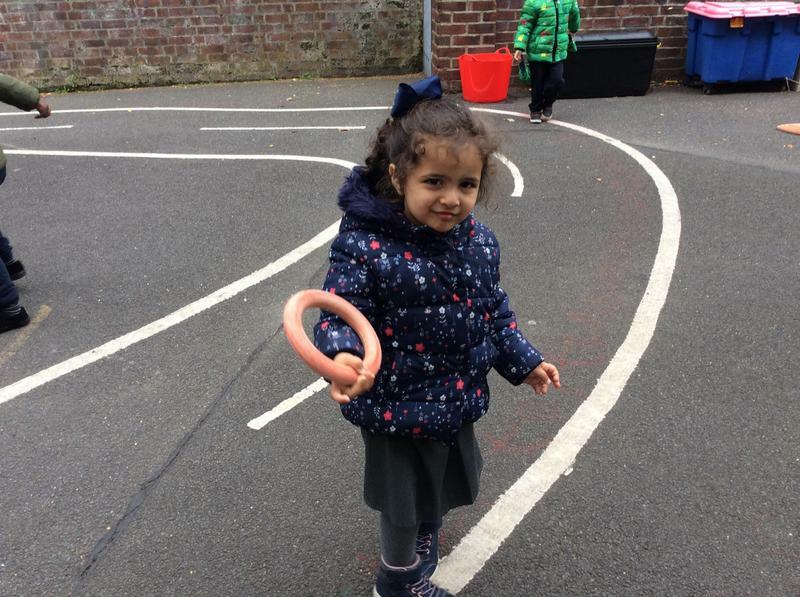 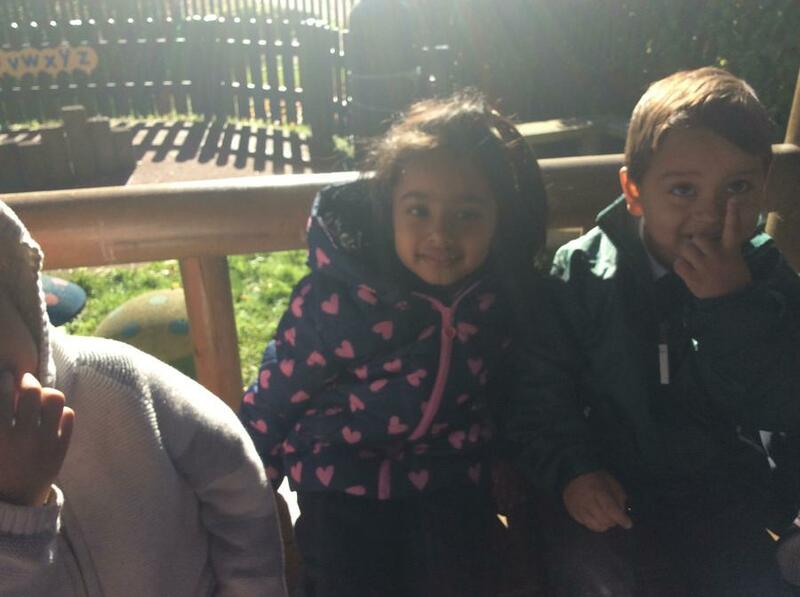 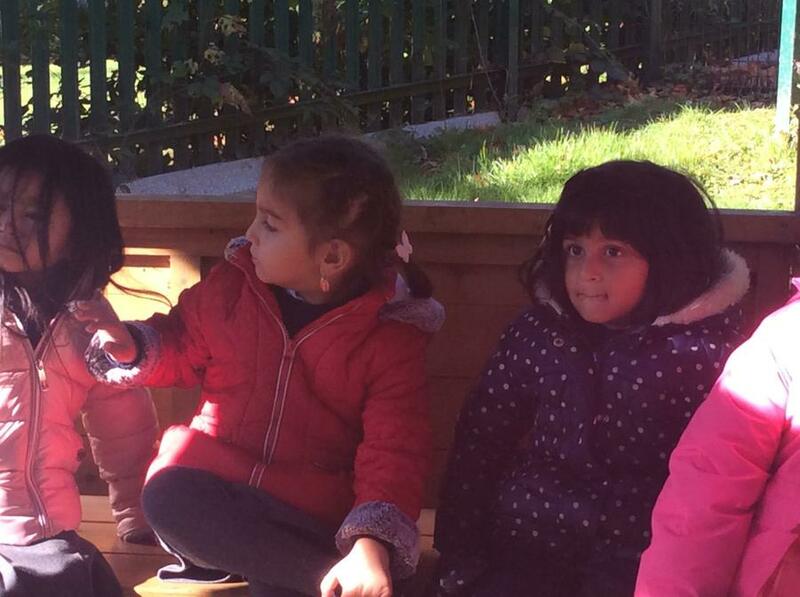 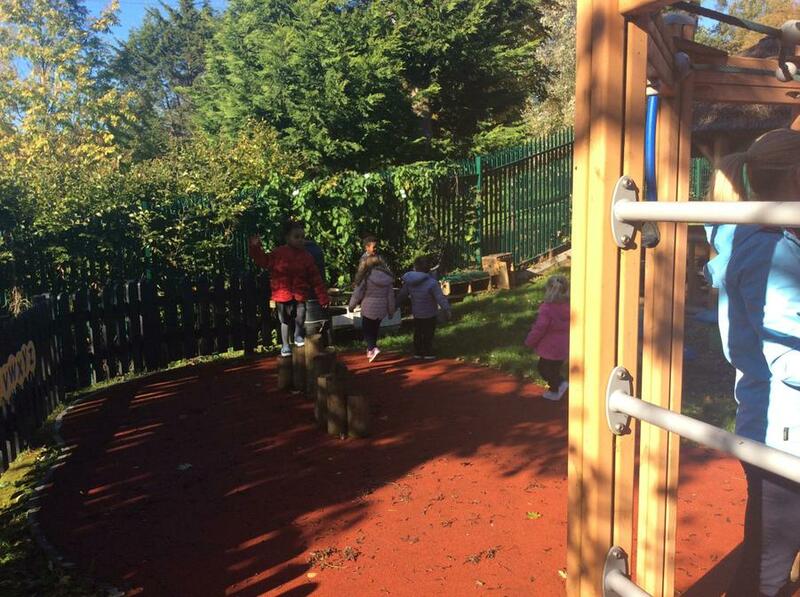 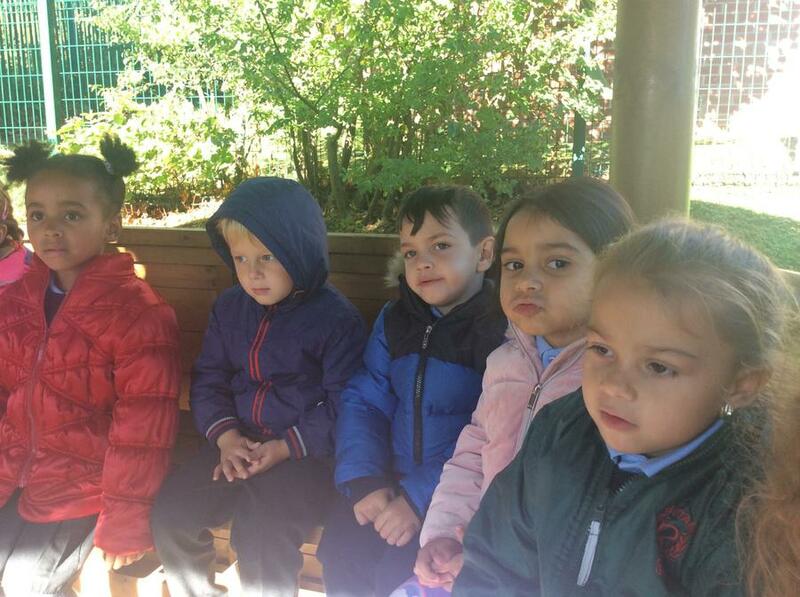 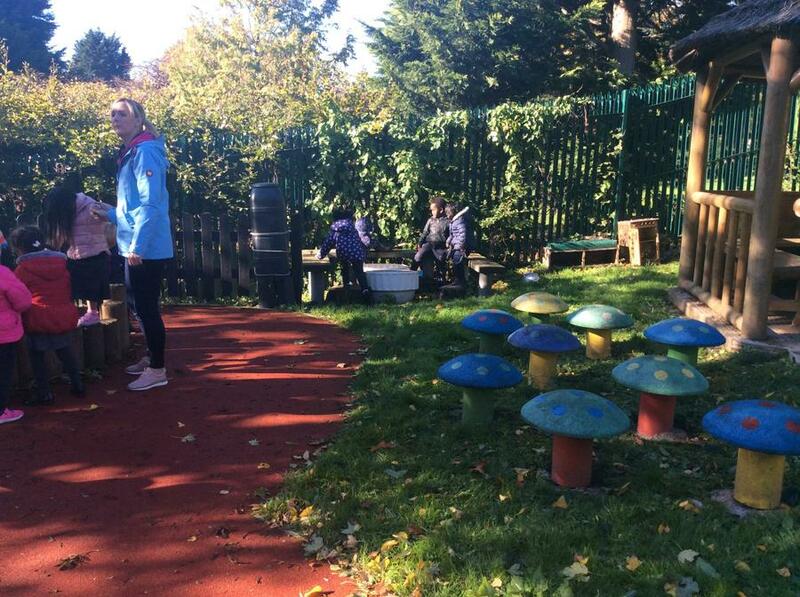 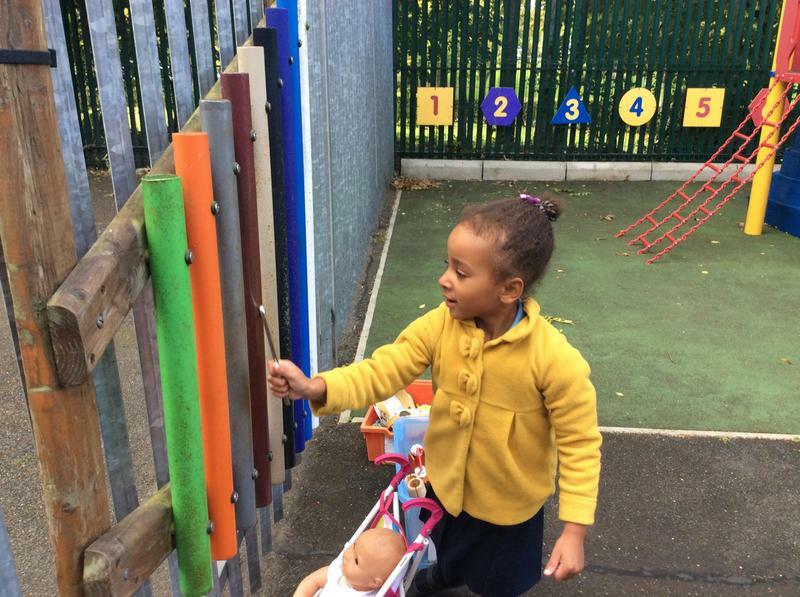 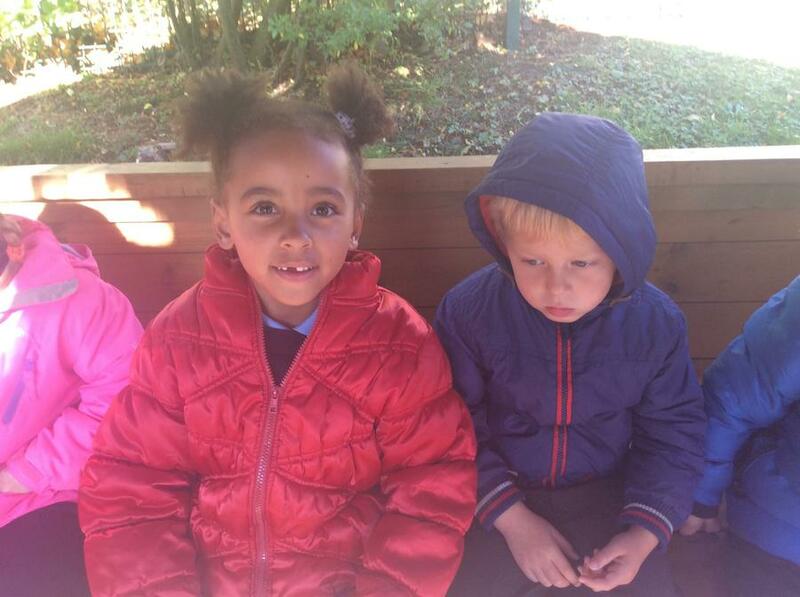 In nursery we love to play outside! 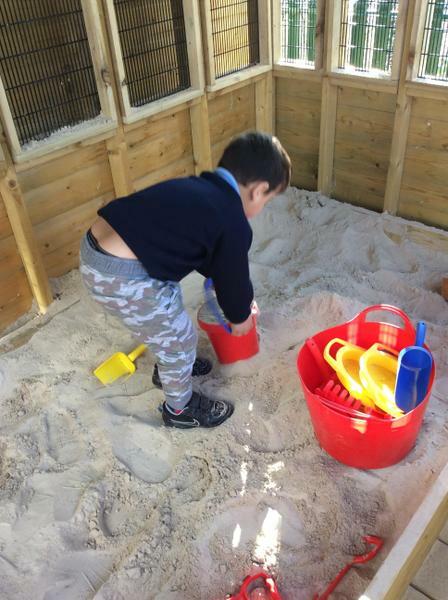 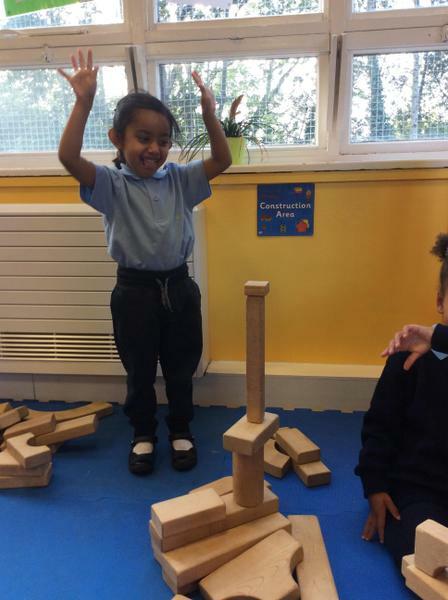 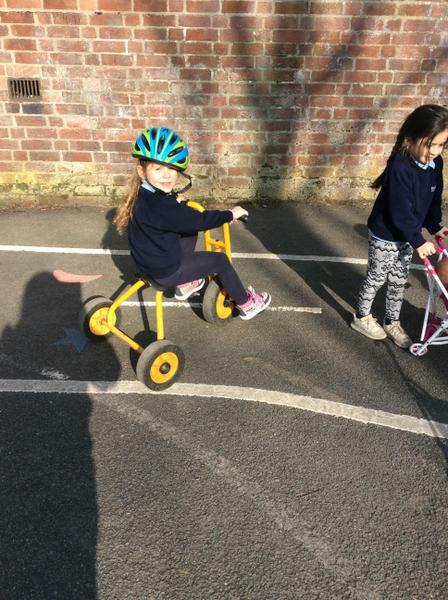 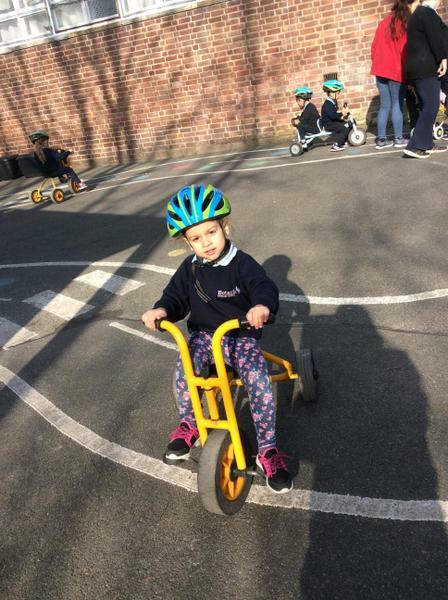 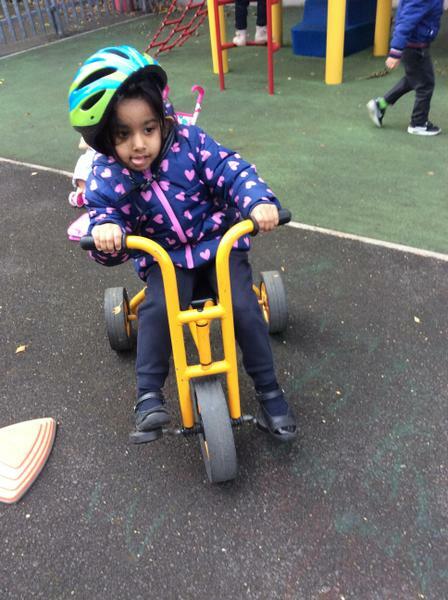 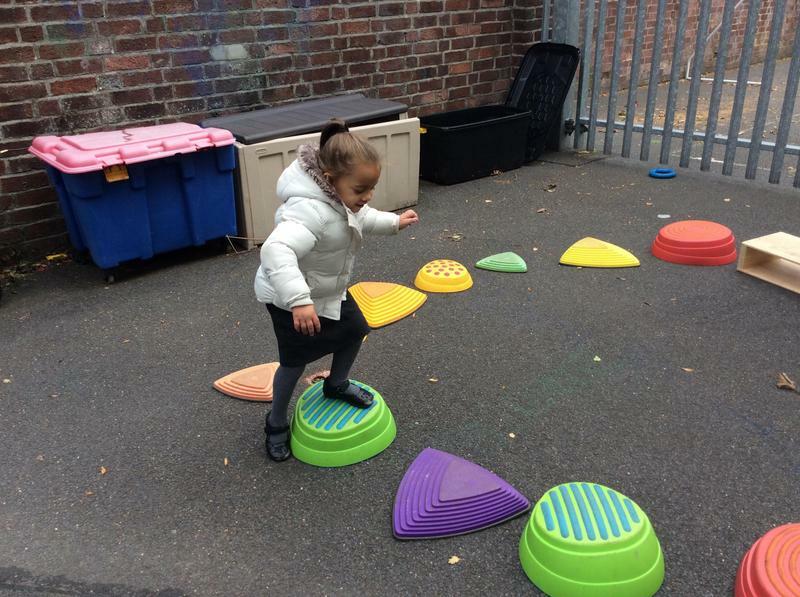 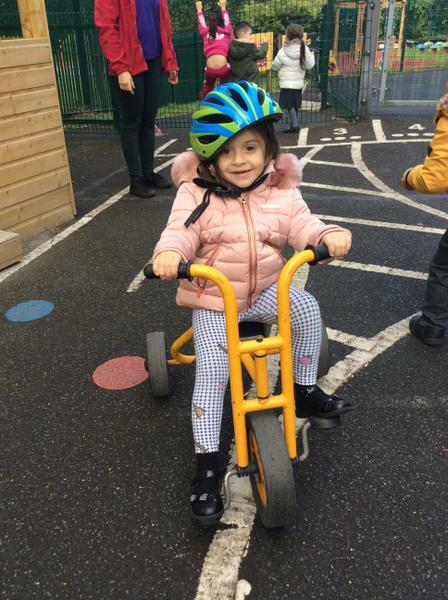 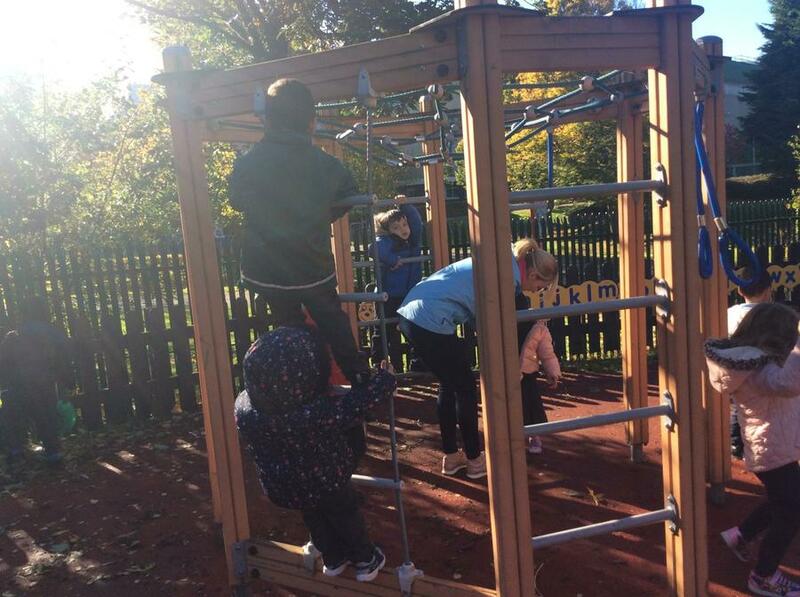 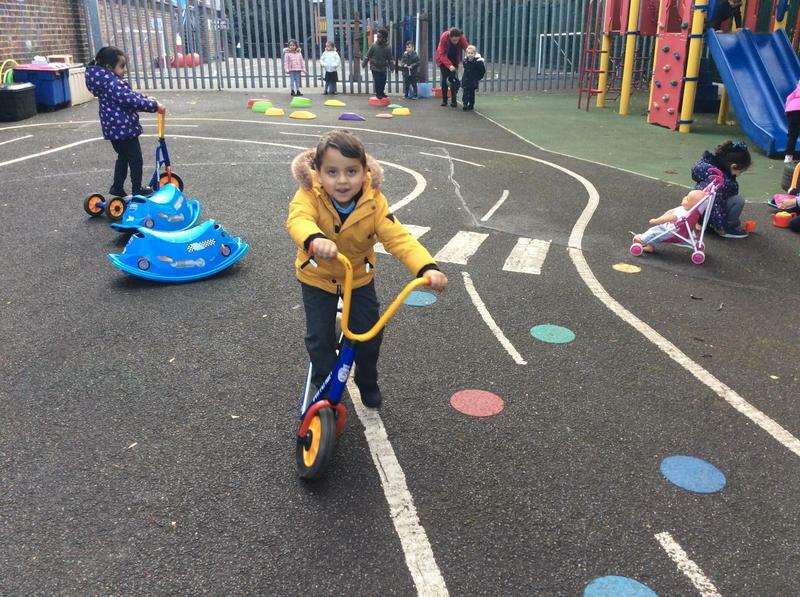 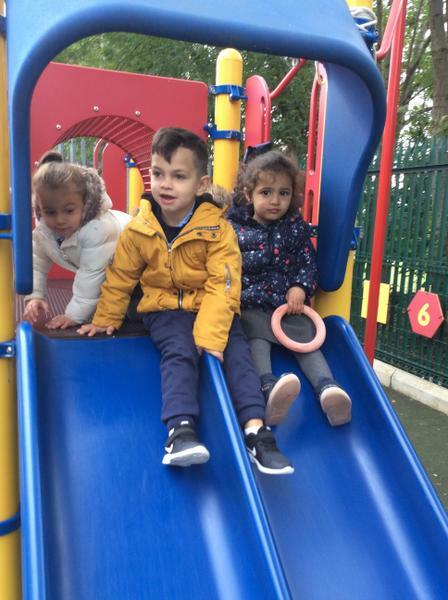 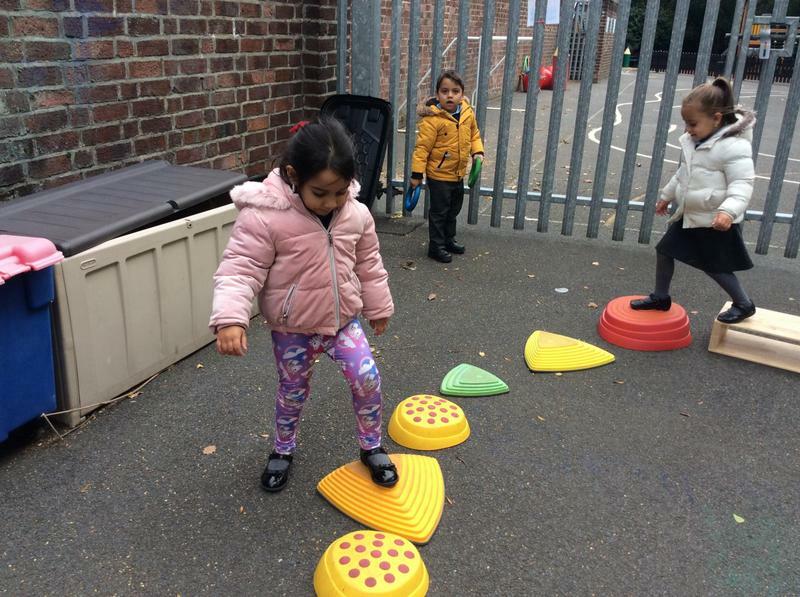 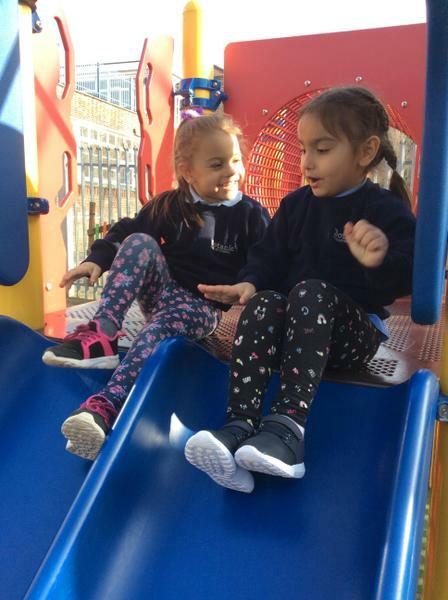 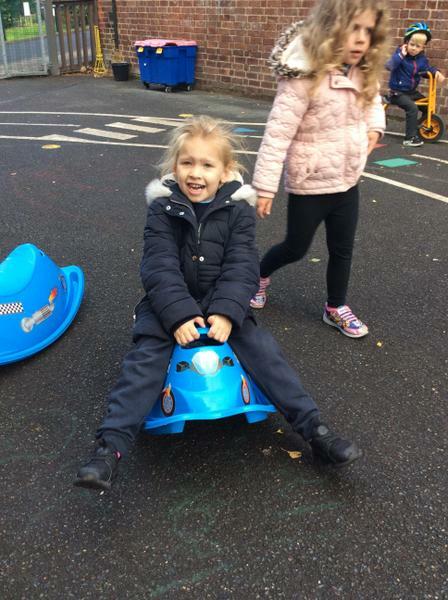 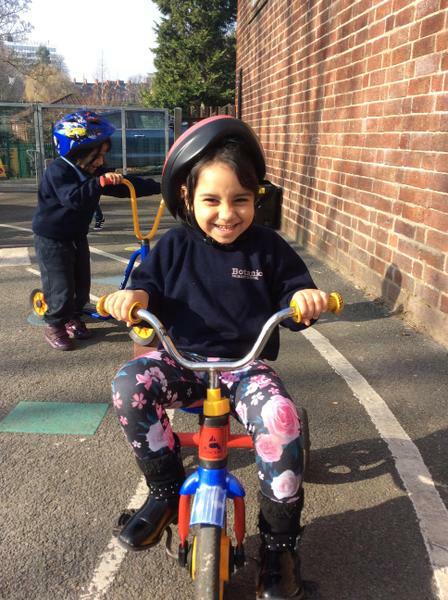 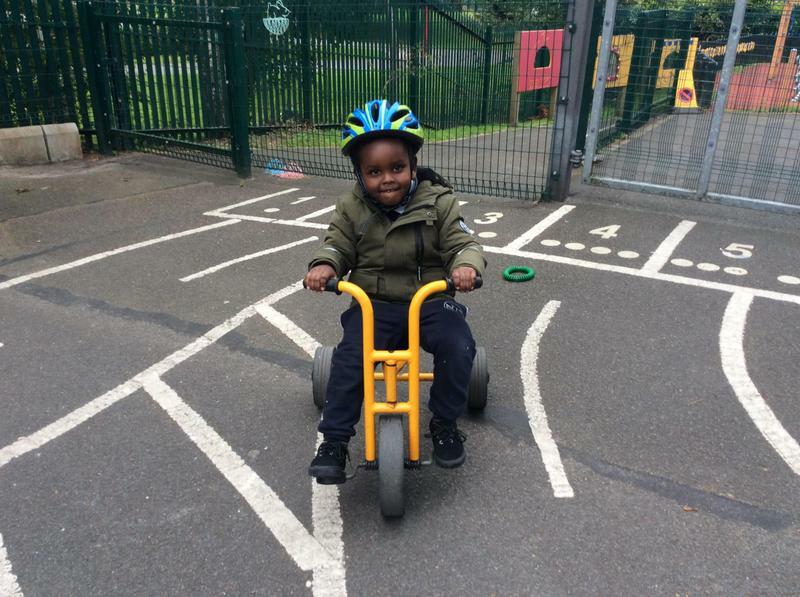 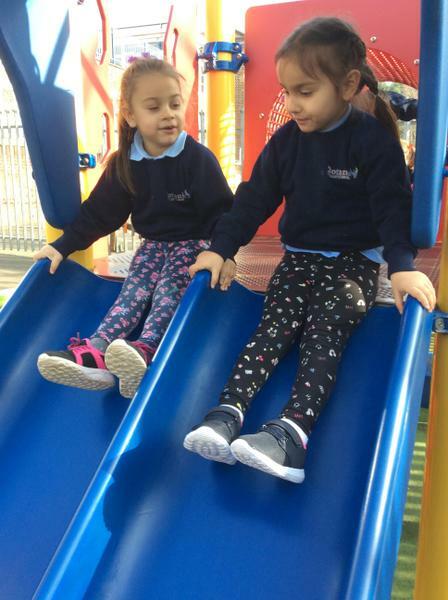 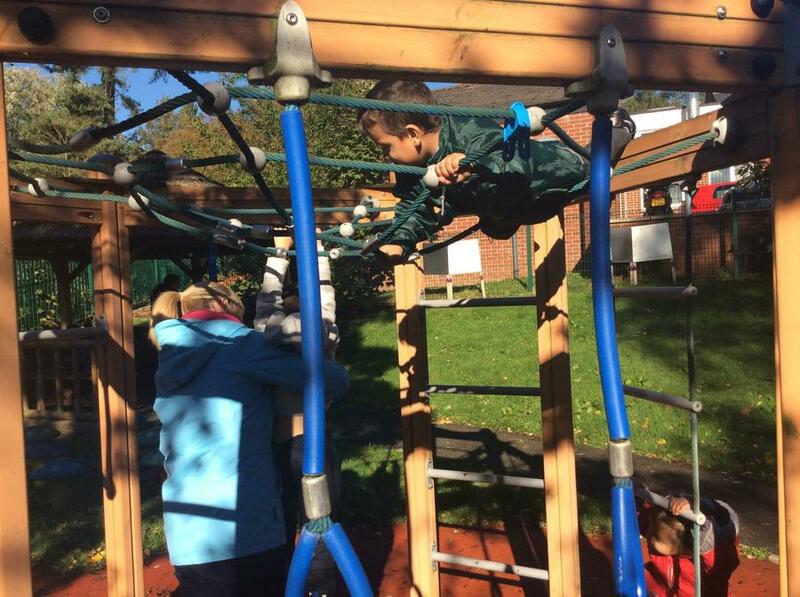 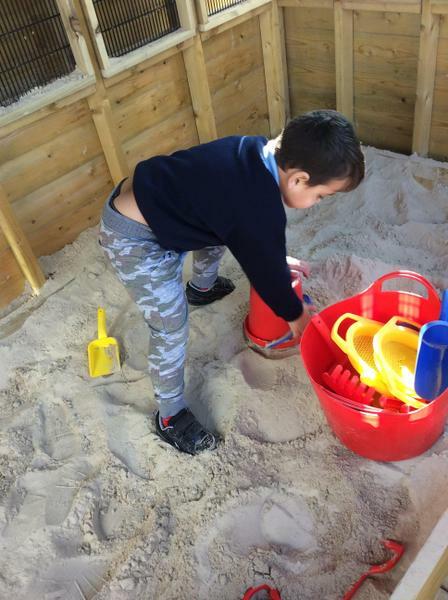 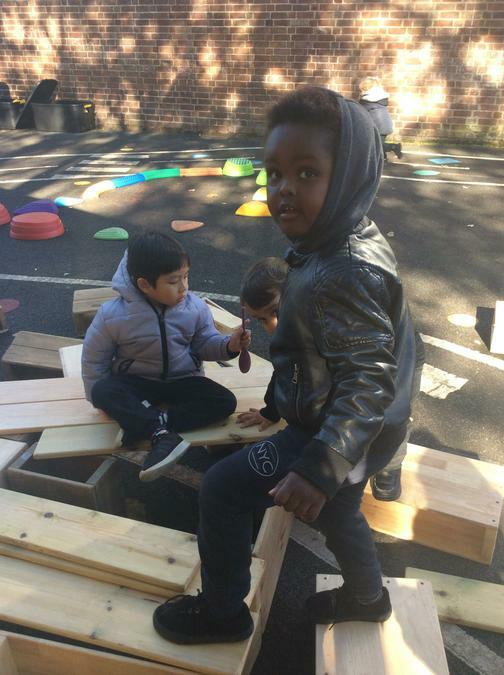 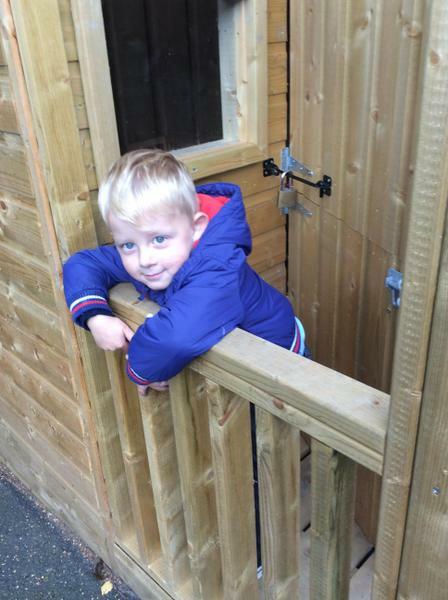 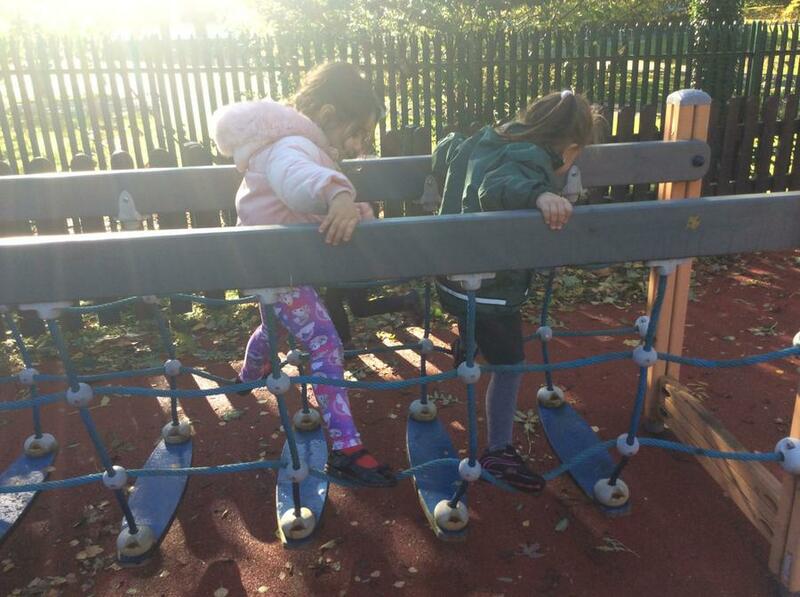 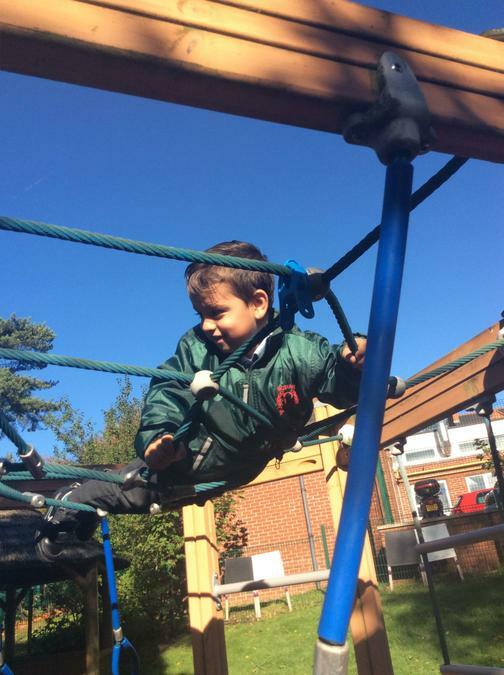 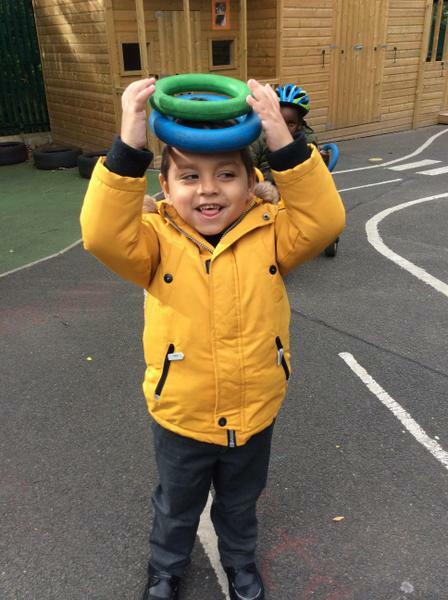 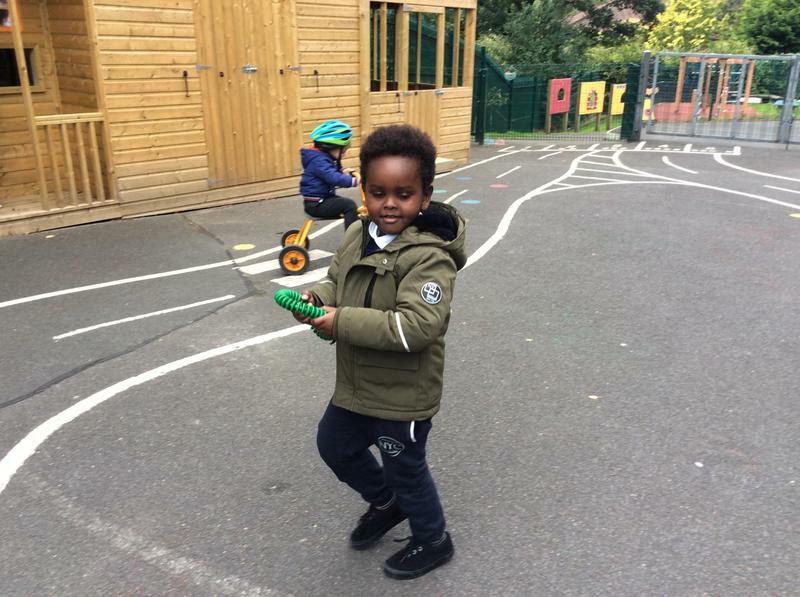 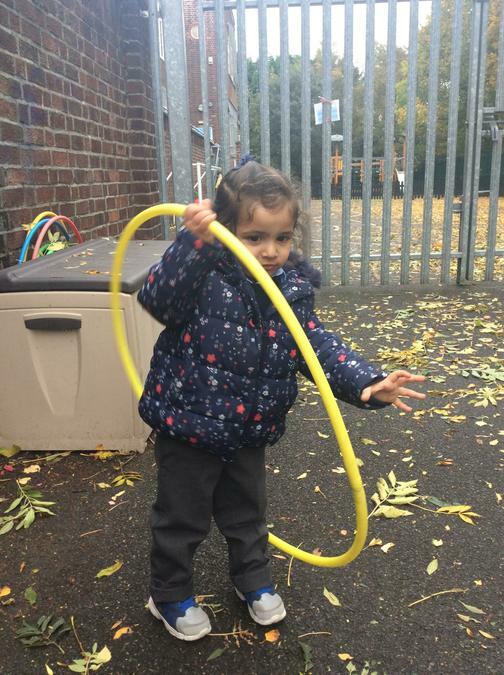 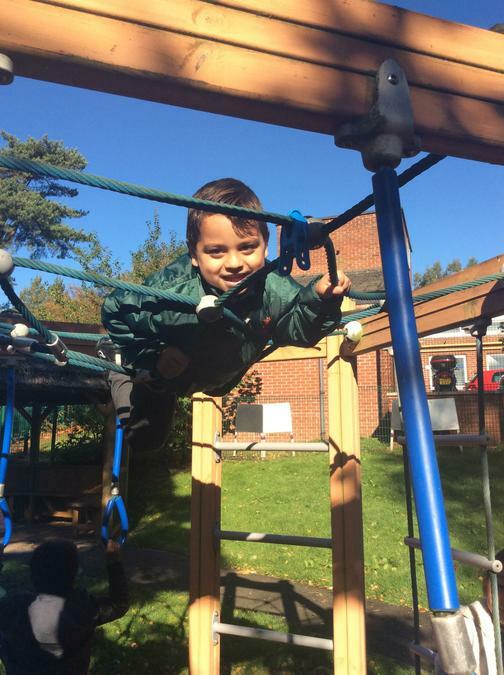 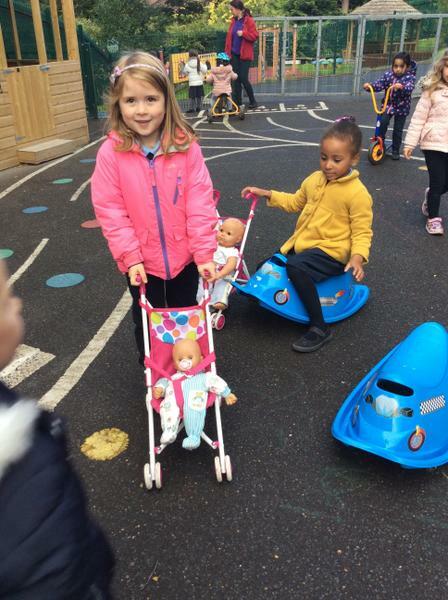 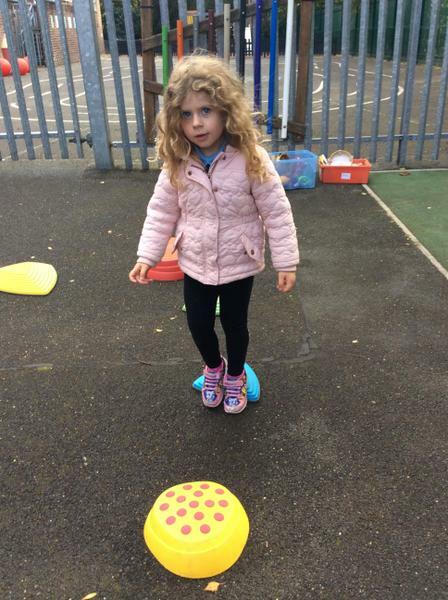 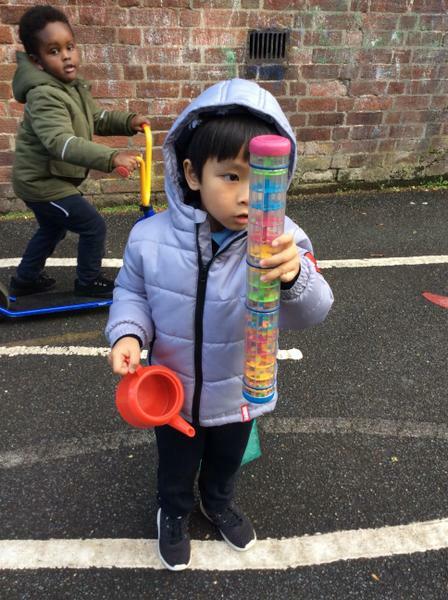 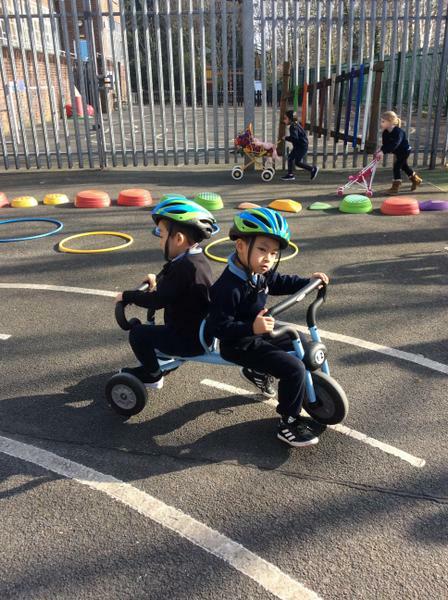 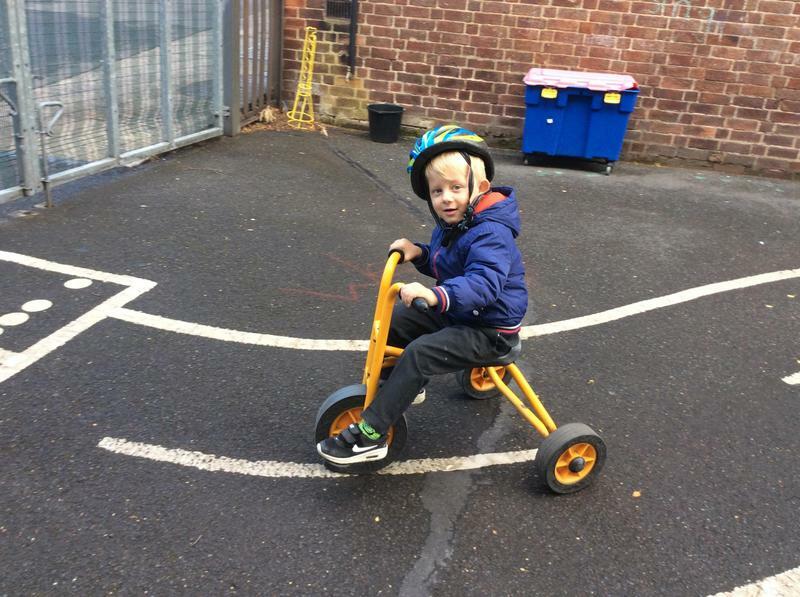 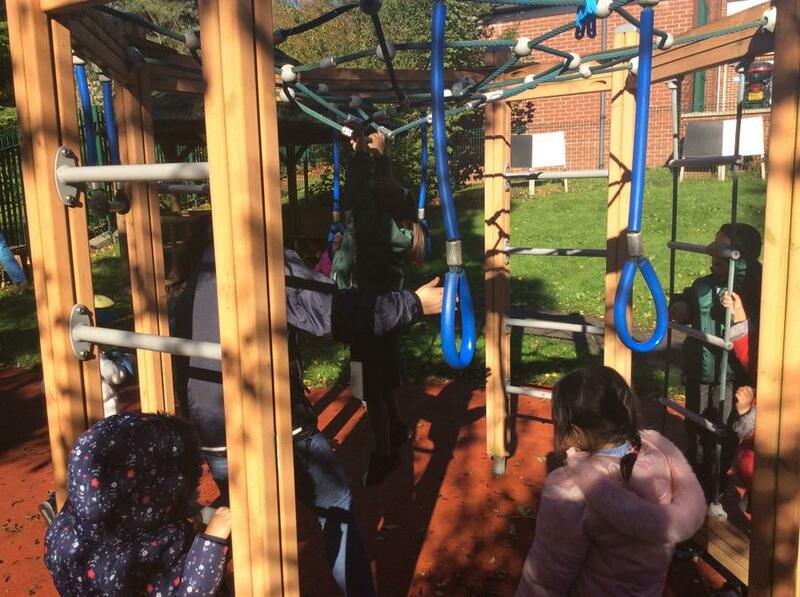 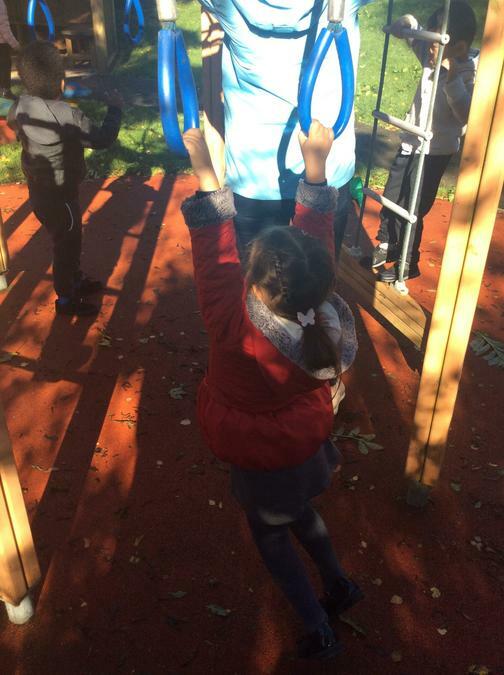 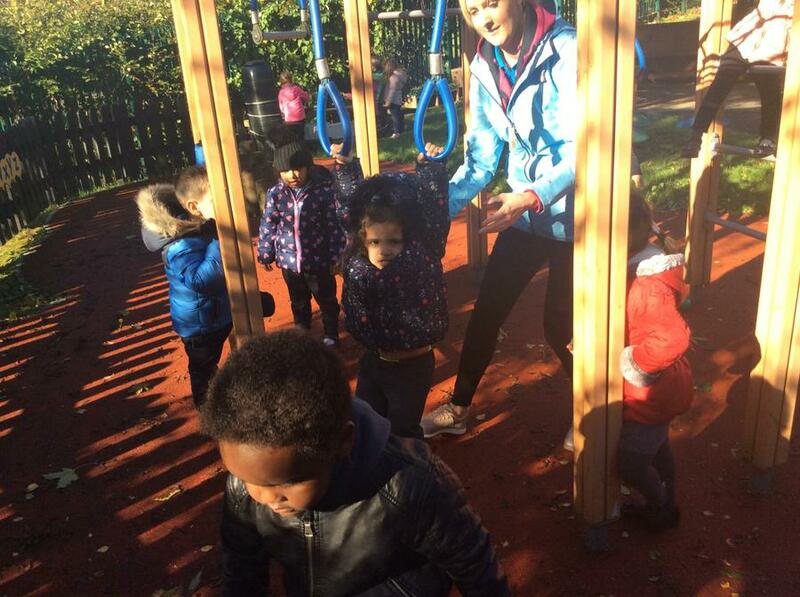 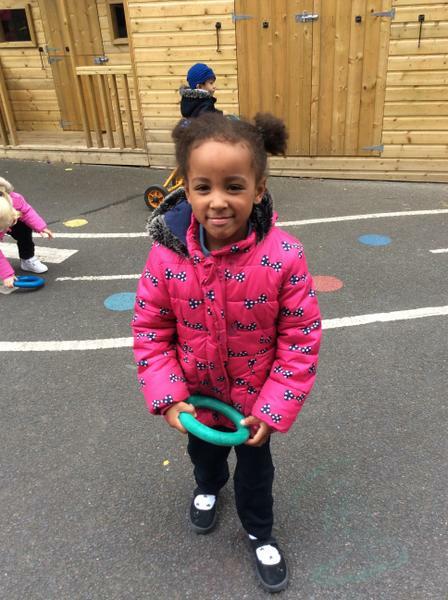 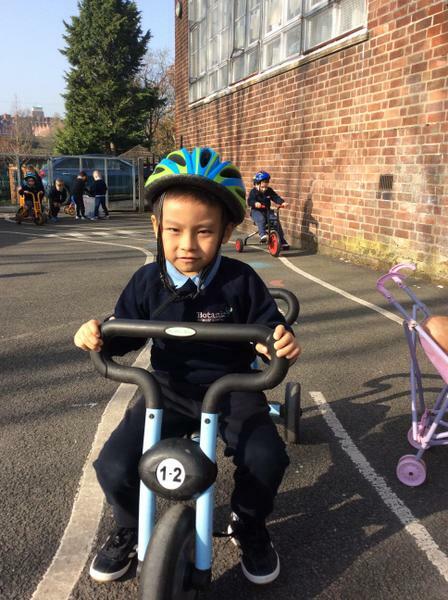 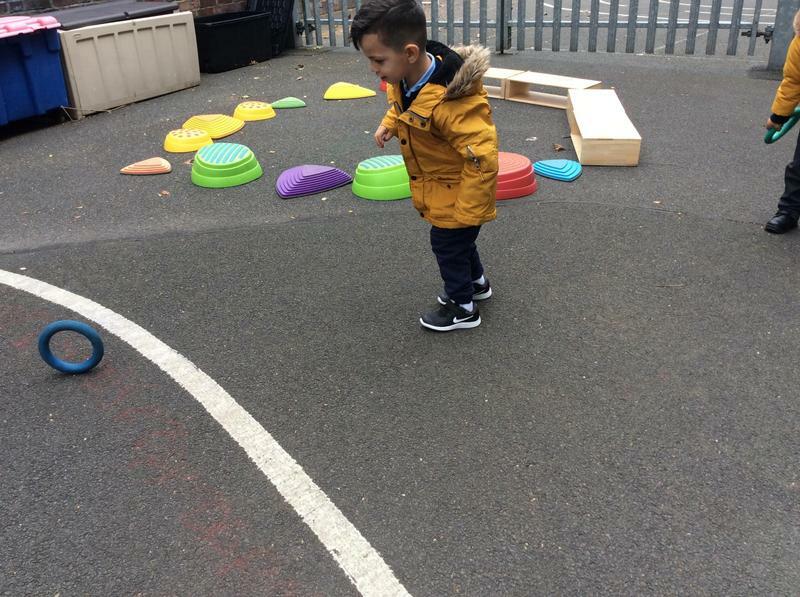 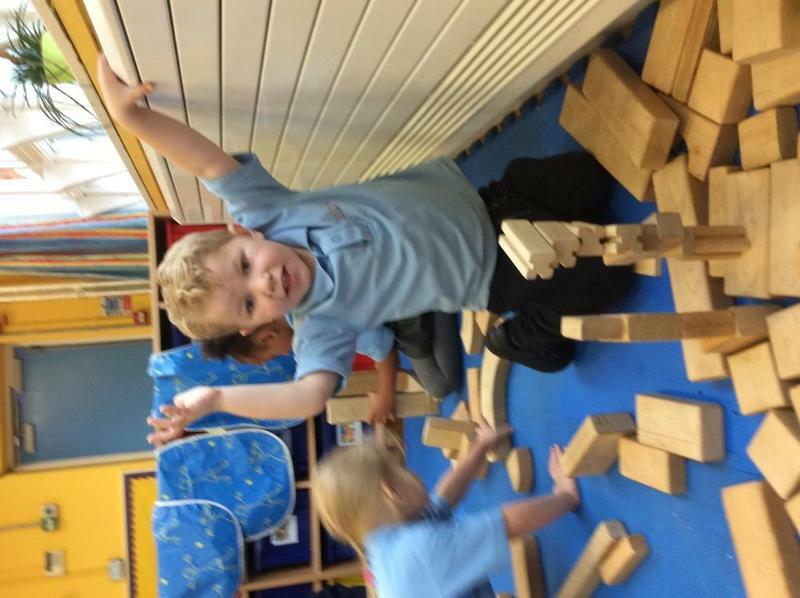 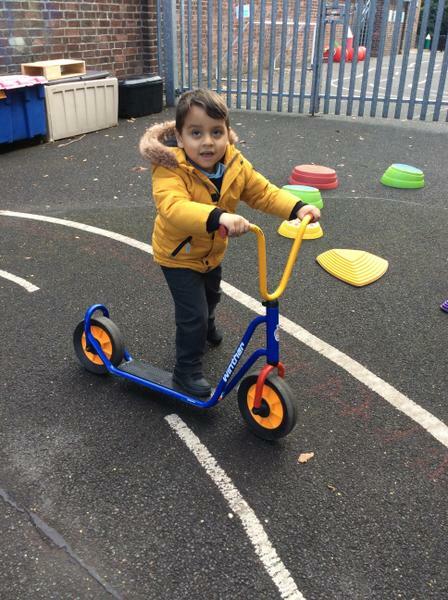 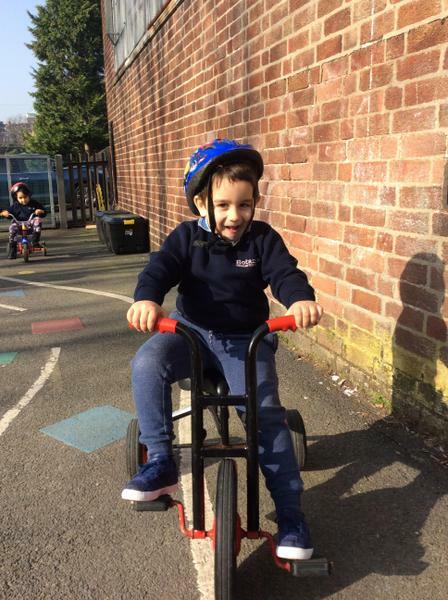 We enjoy cycling and scooting around our track, digging in the sand pit, climbing on the climbing frame, playing in the house, building with the blocks and balancing on the stepping stones. 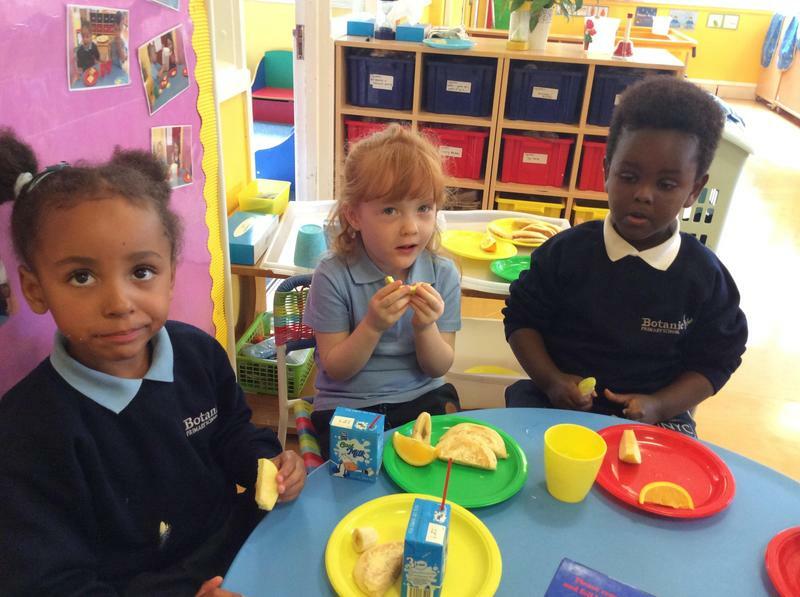 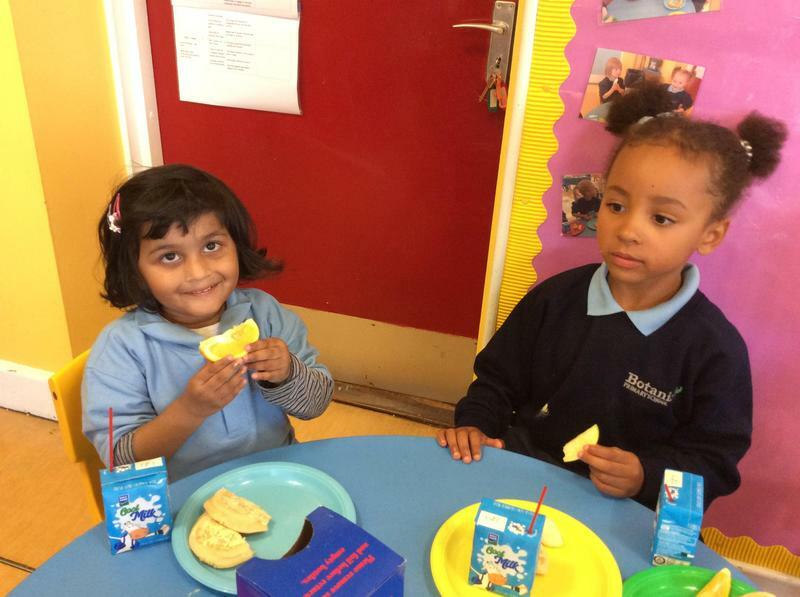 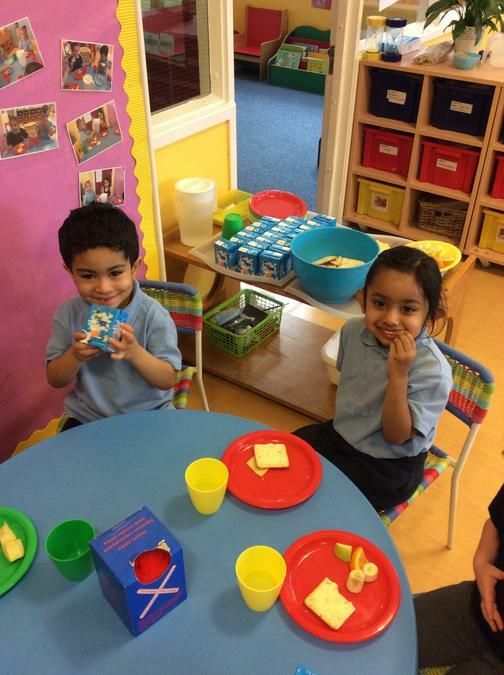 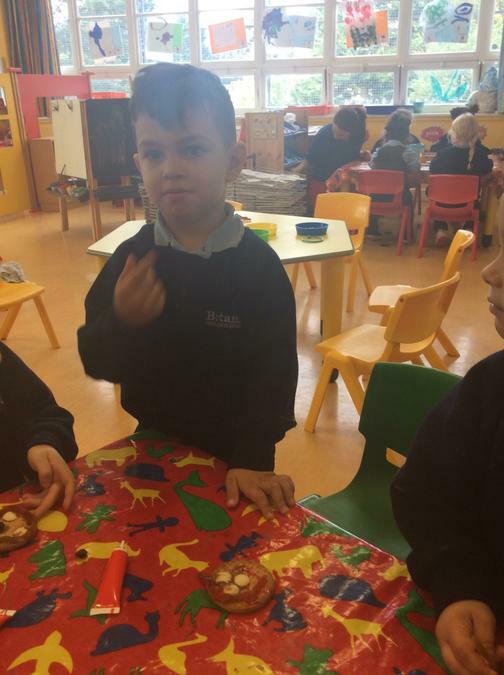 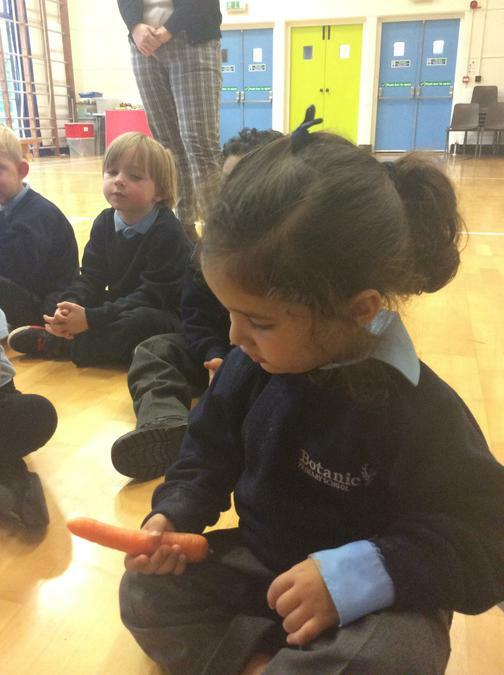 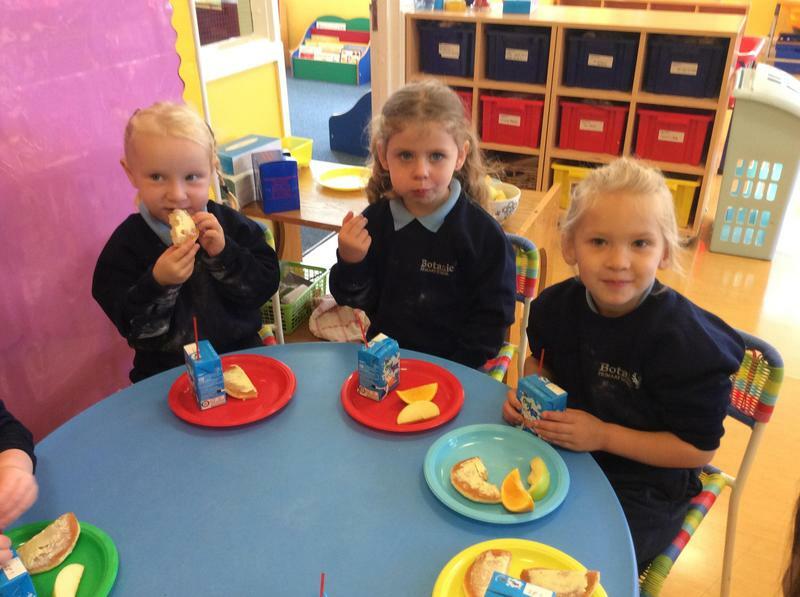 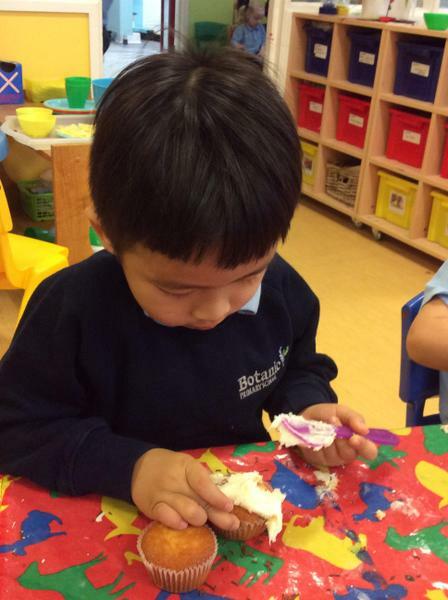 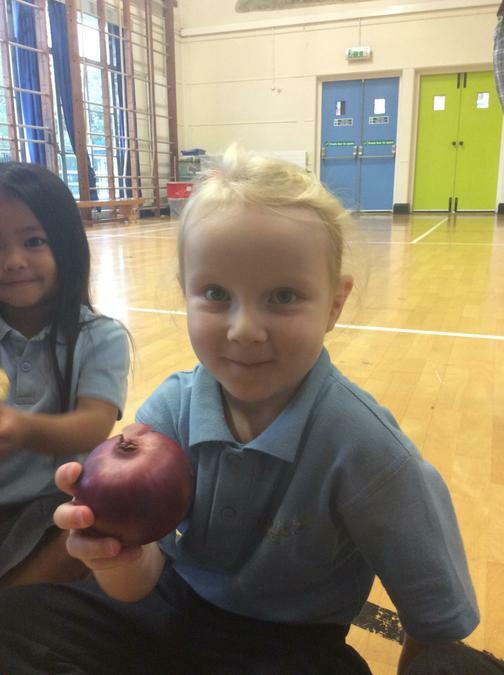 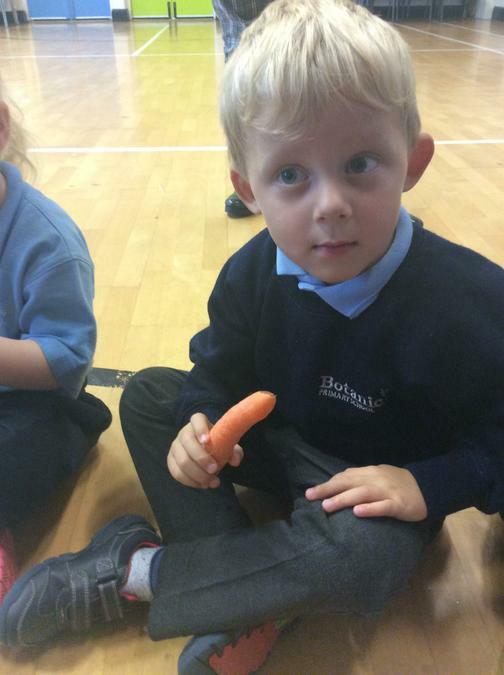 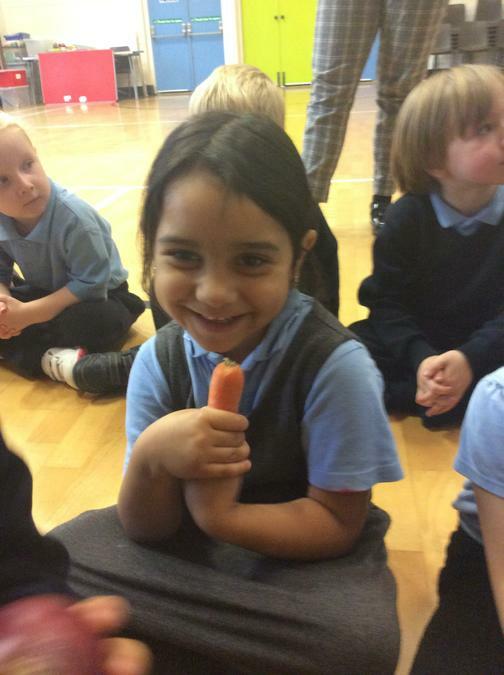 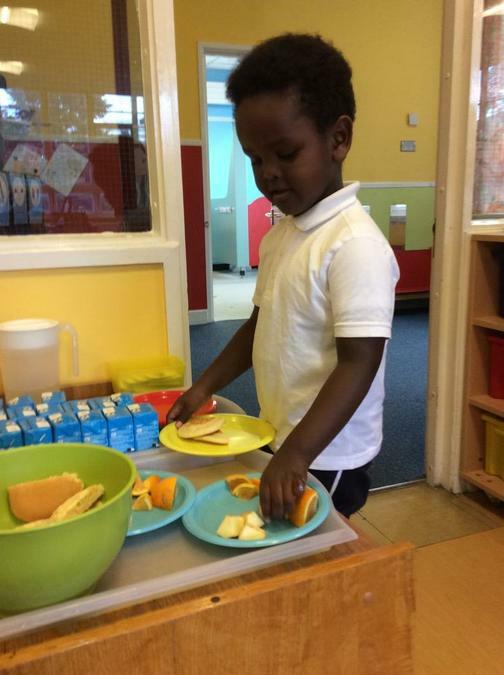 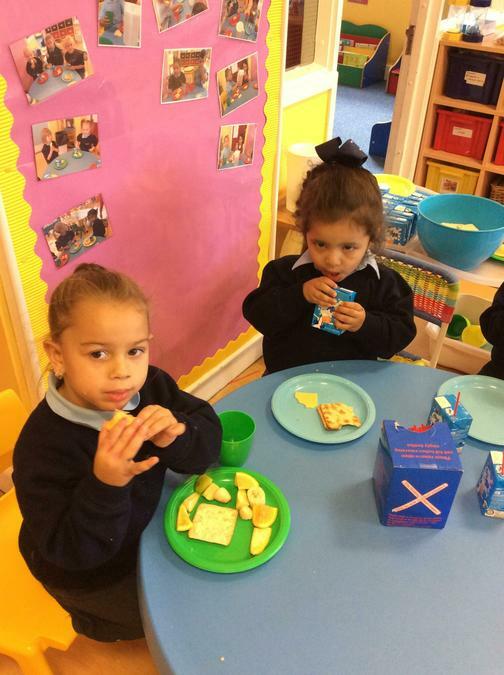 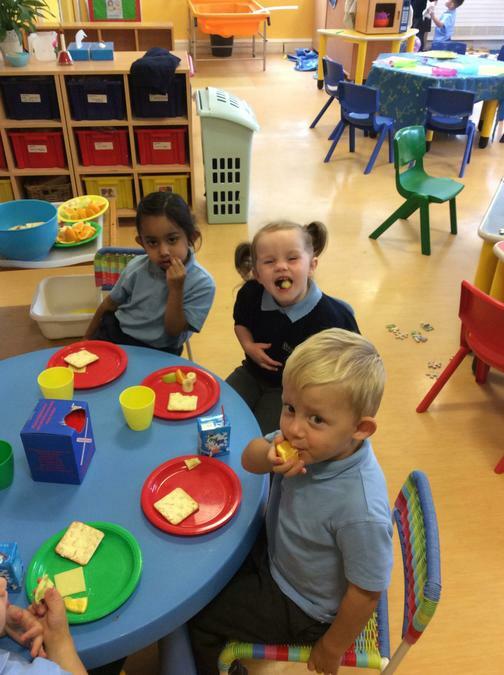 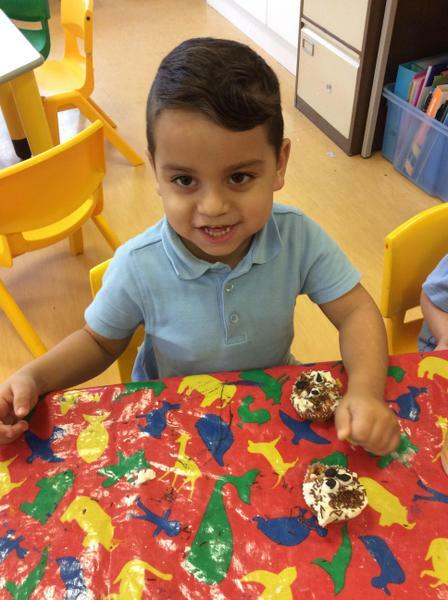 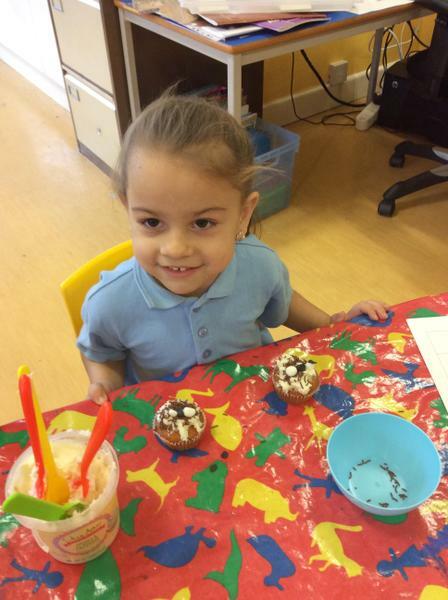 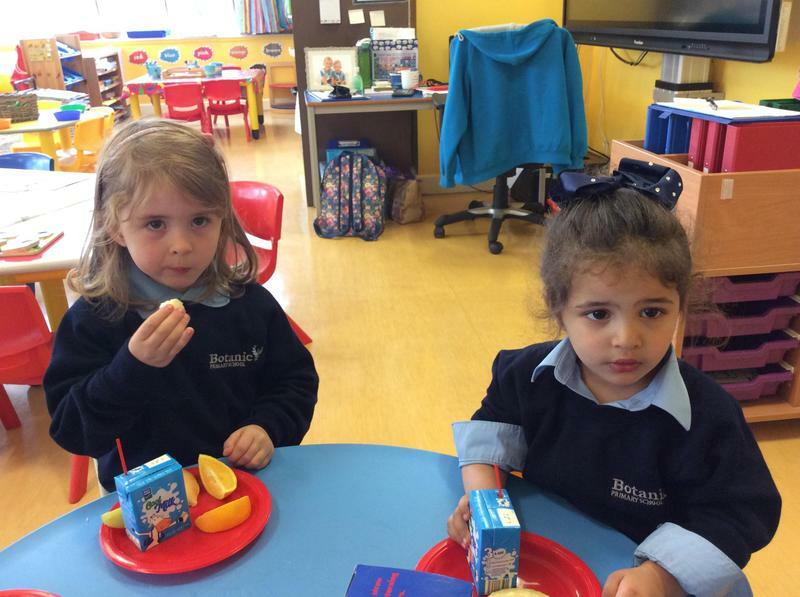 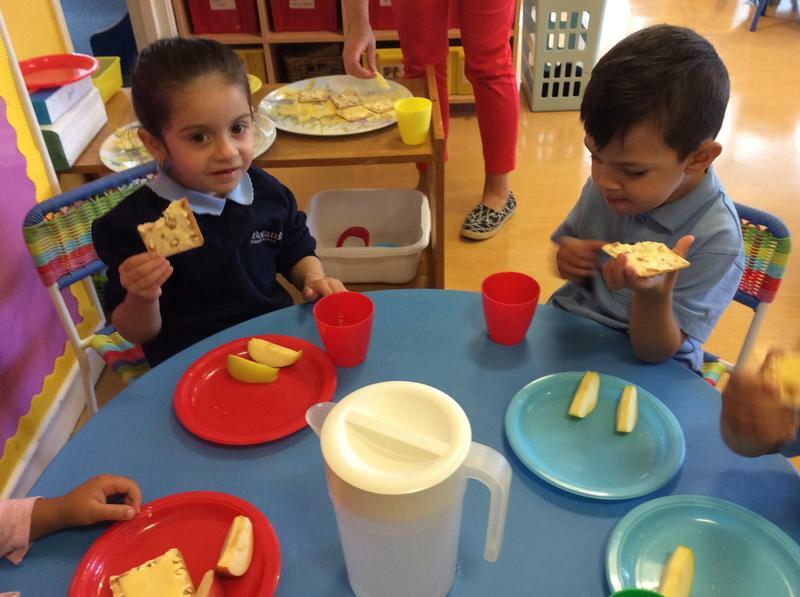 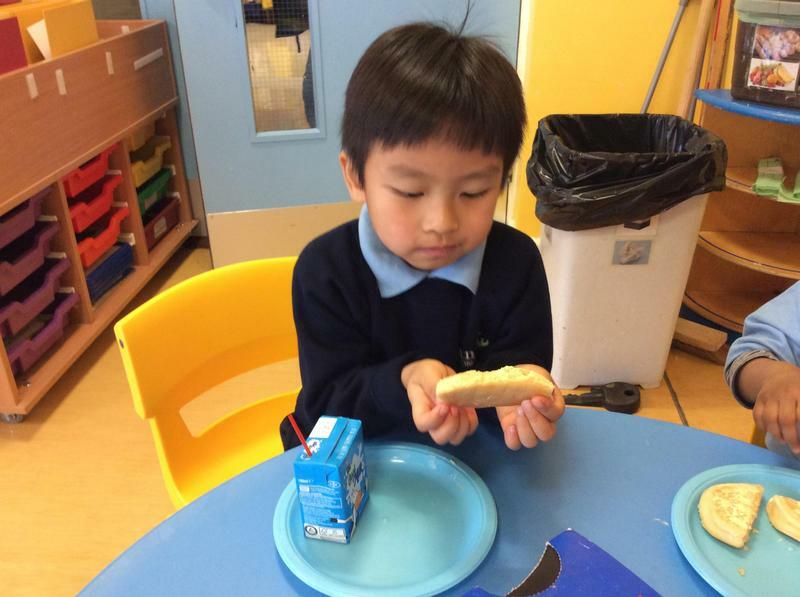 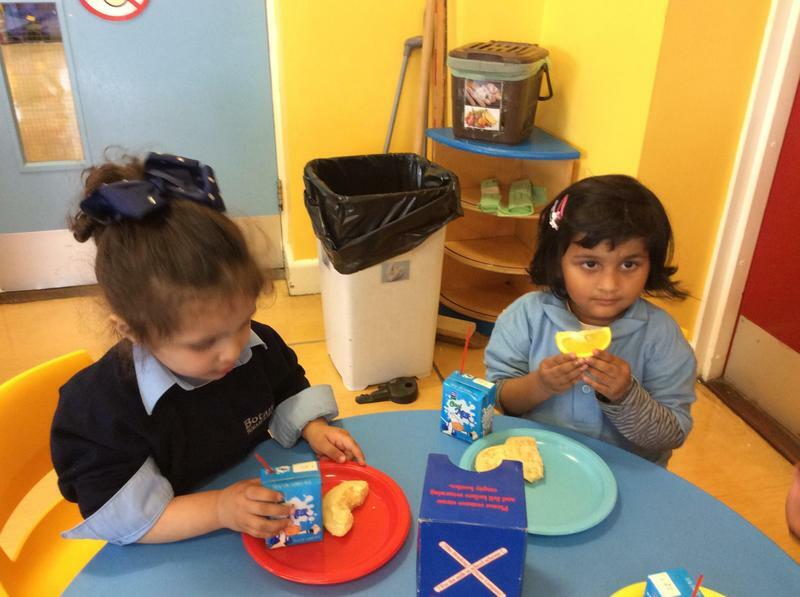 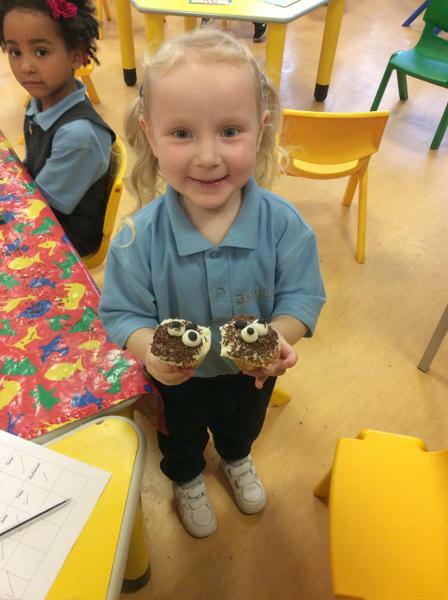 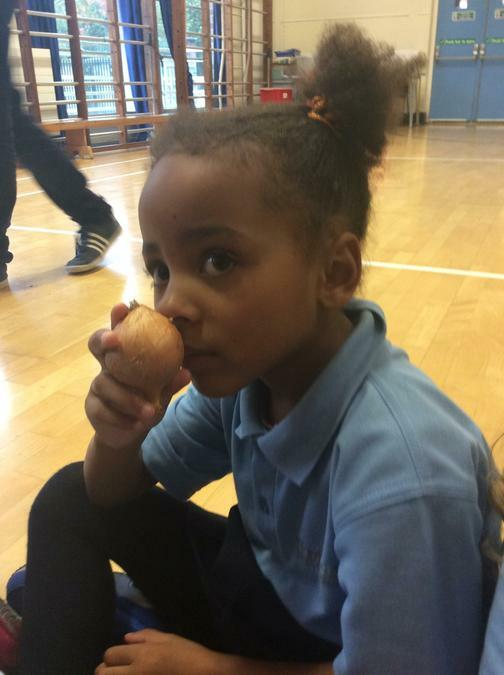 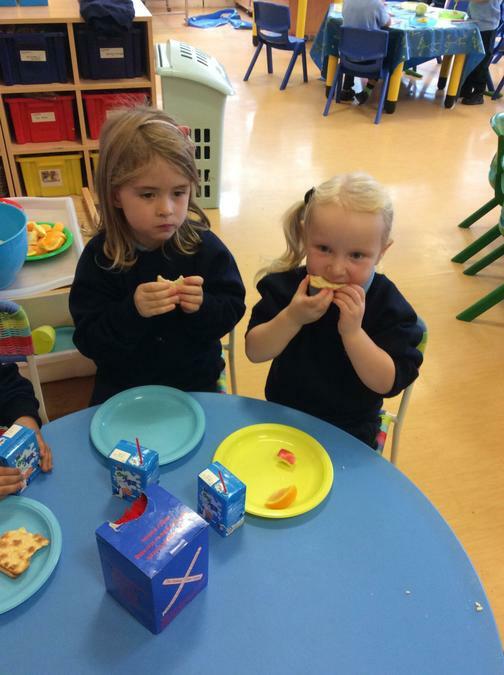 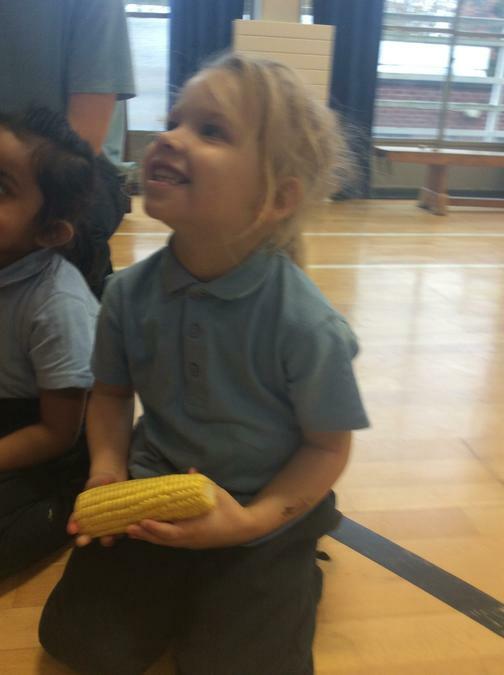 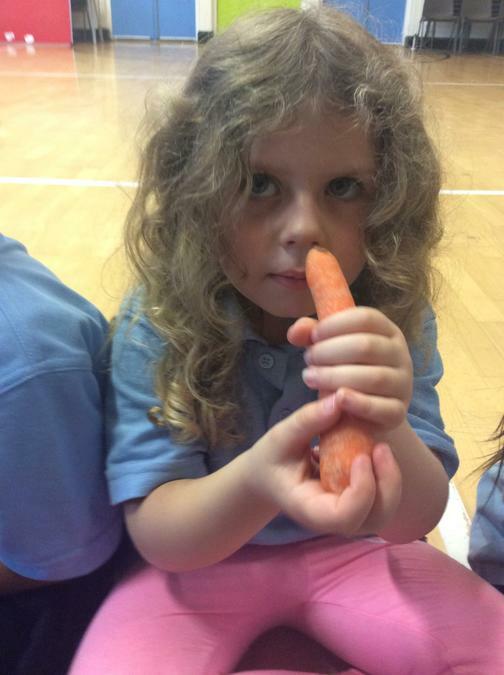 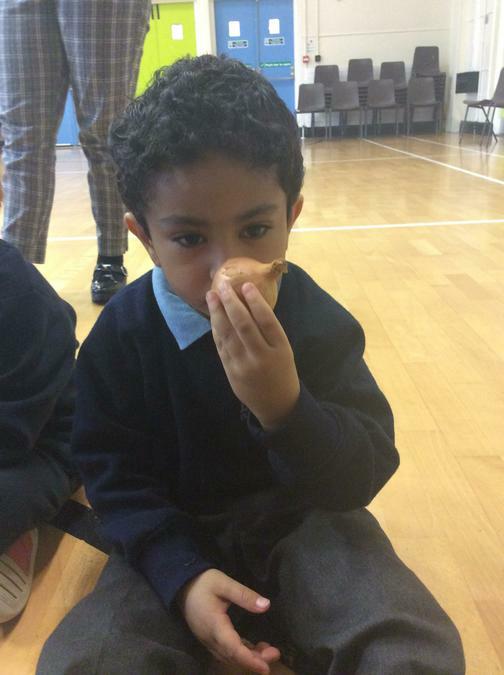 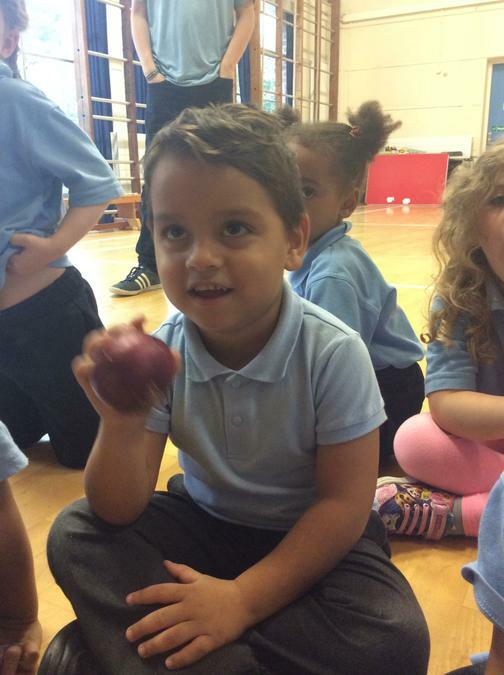 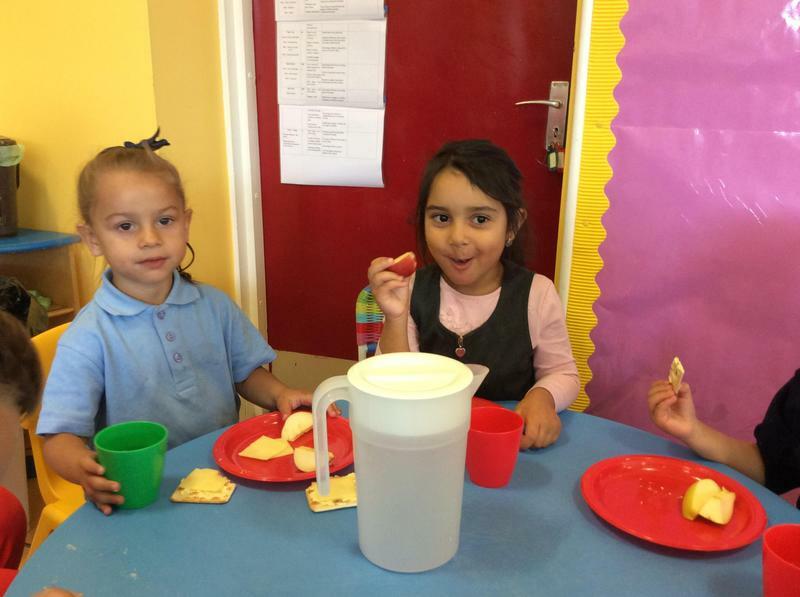 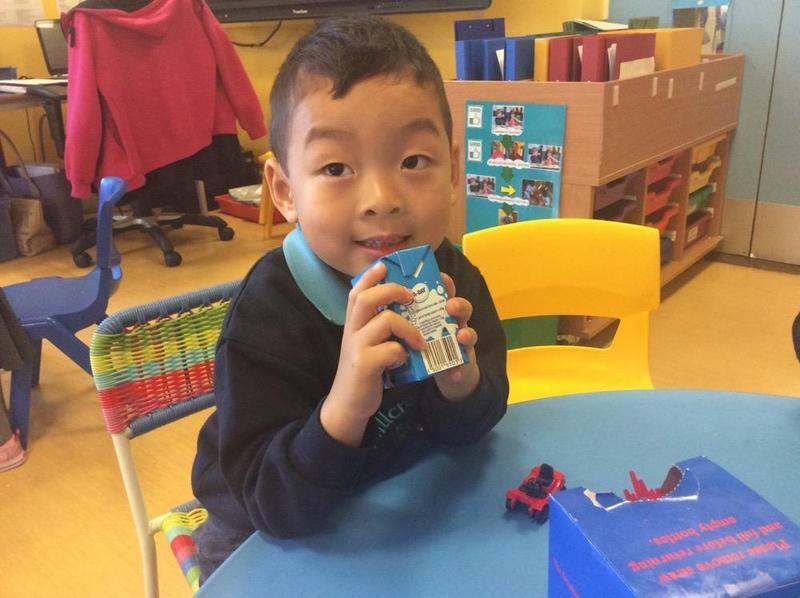 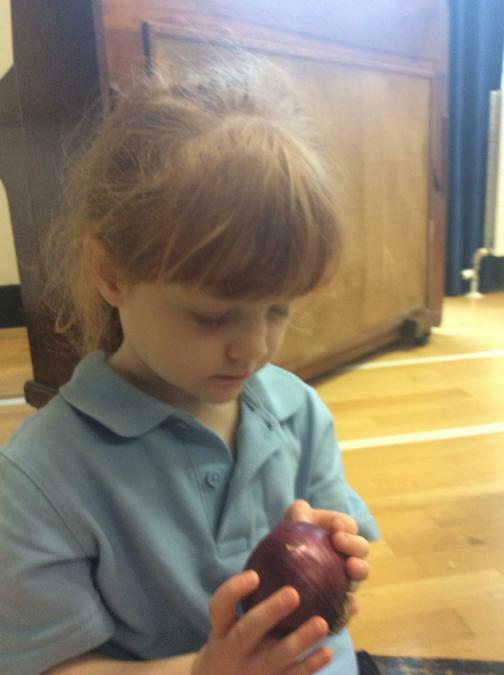 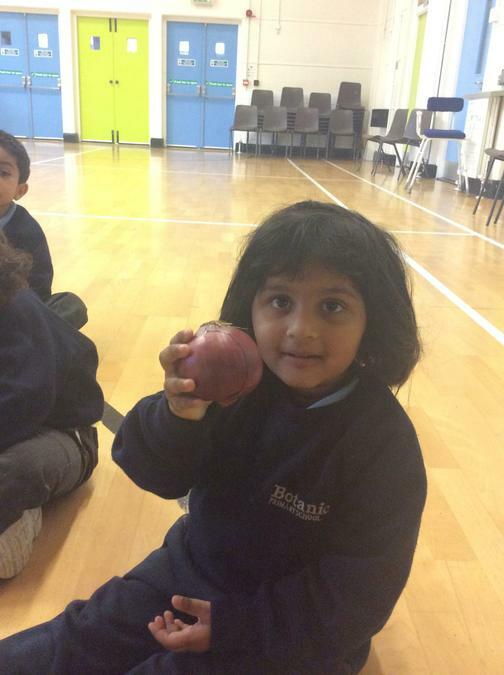 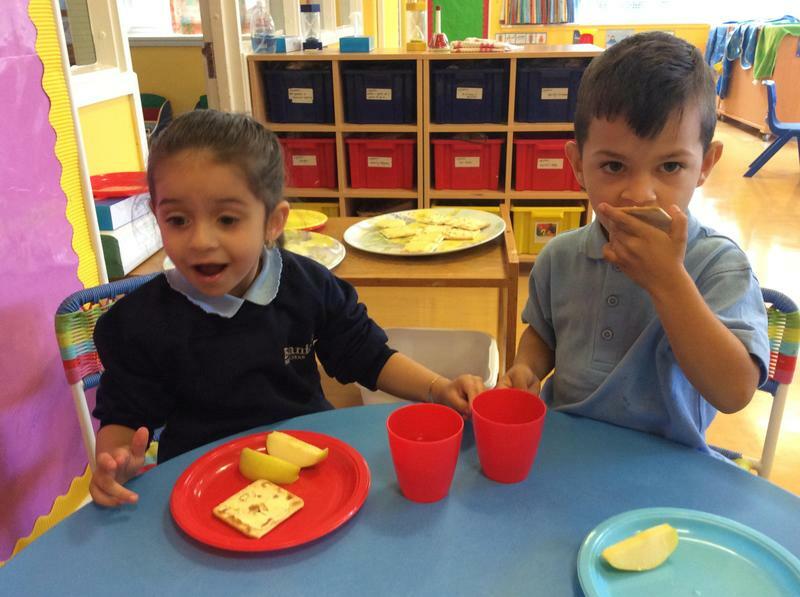 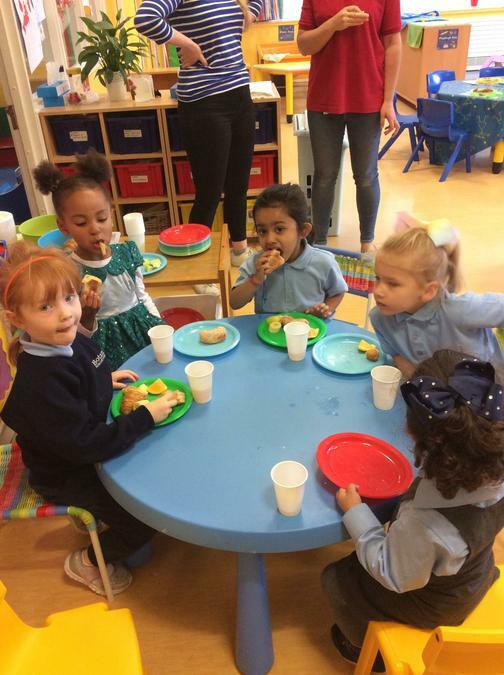 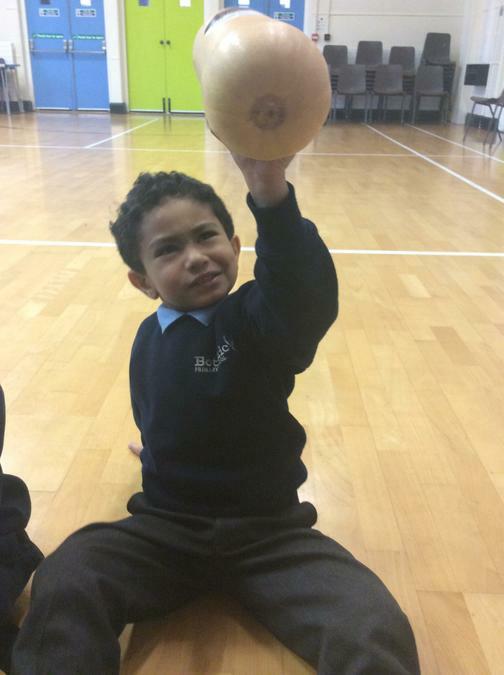 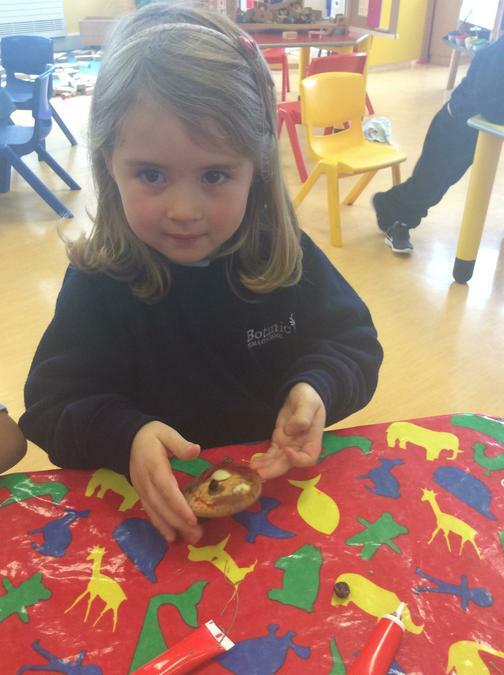 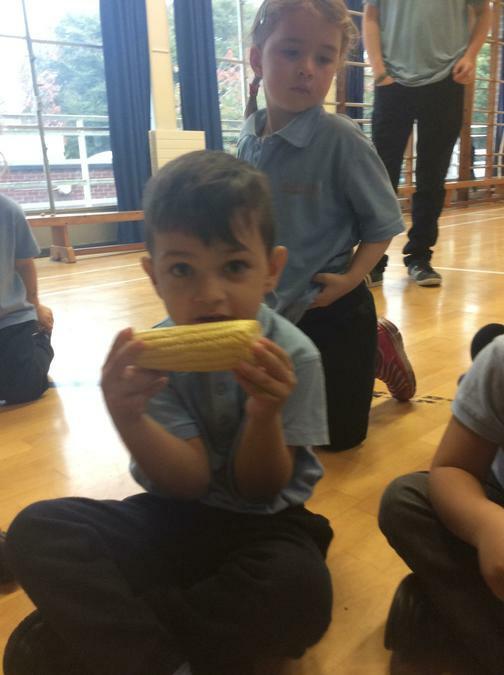 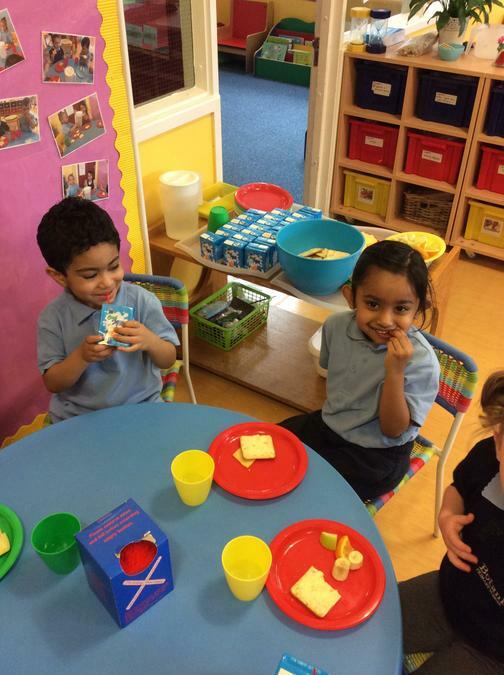 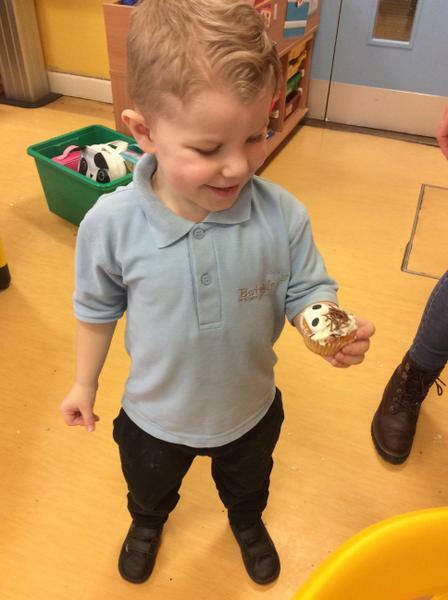 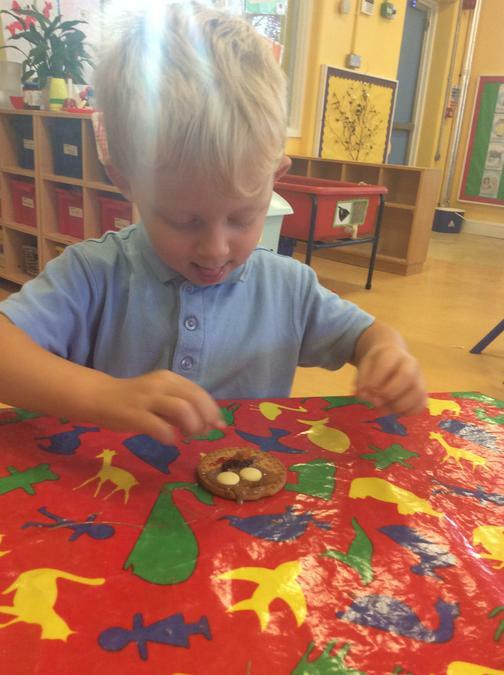 Everyday in nursery we eat a healthy snack. 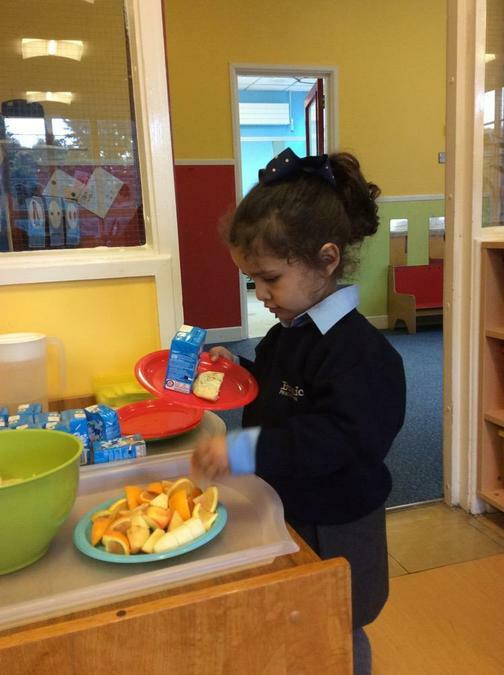 We have fruit, milk and a selection of breads or yoghurts. 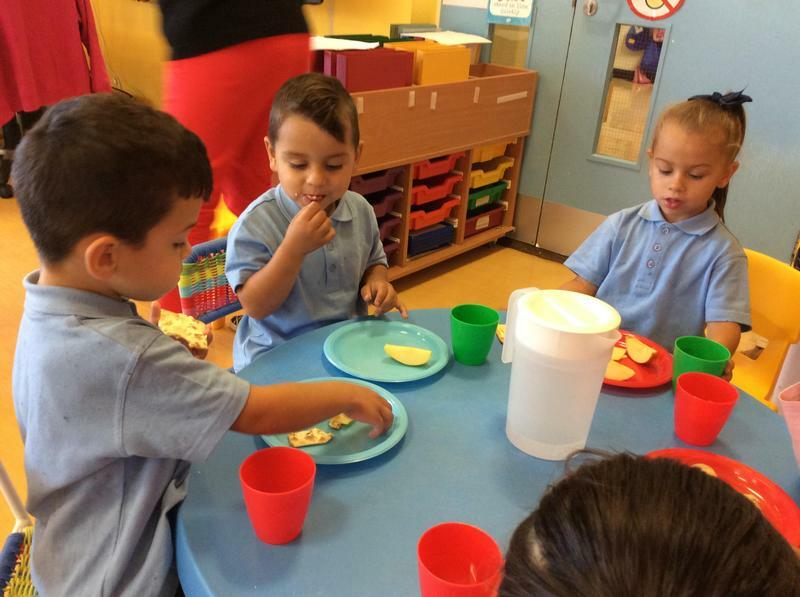 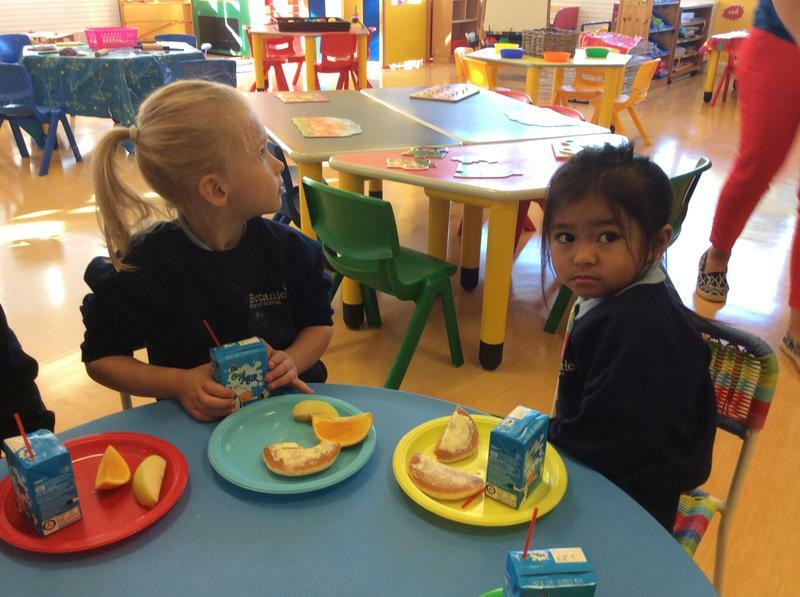 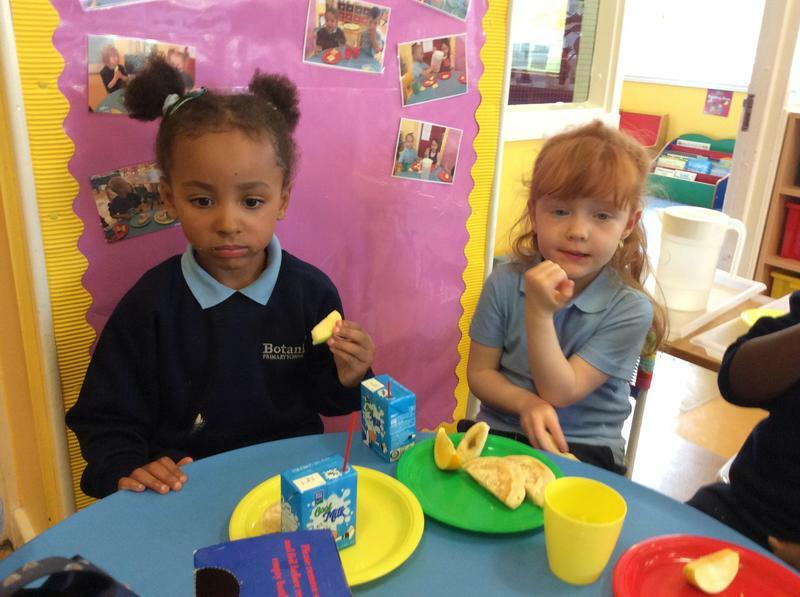 Snack time enables us to make choices and socialise with our peers. 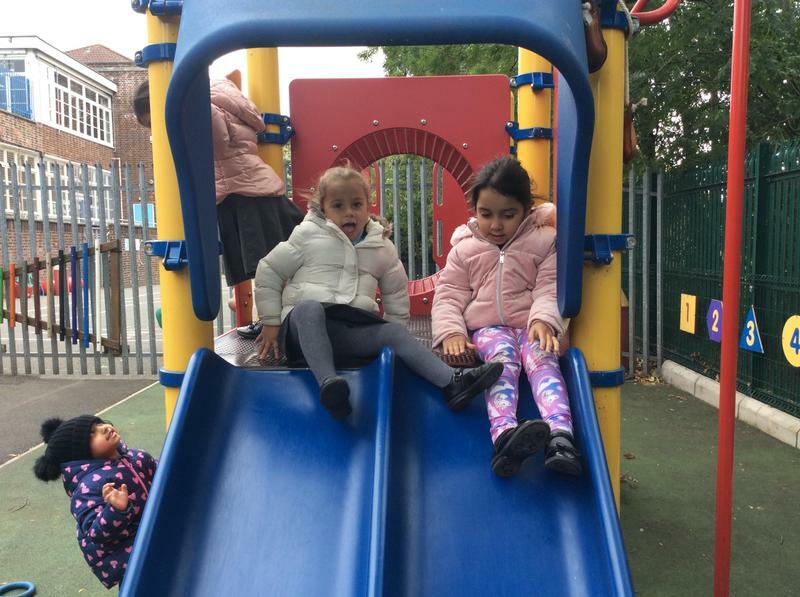 Please do not think that we simply 'play'. 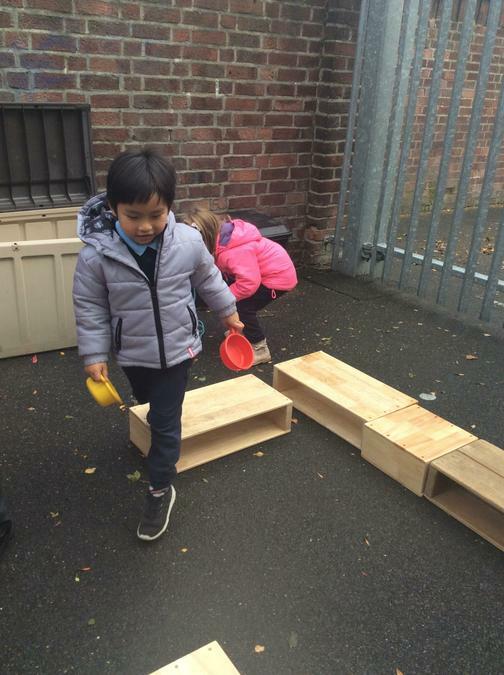 Play is the vehicle on which we learn. 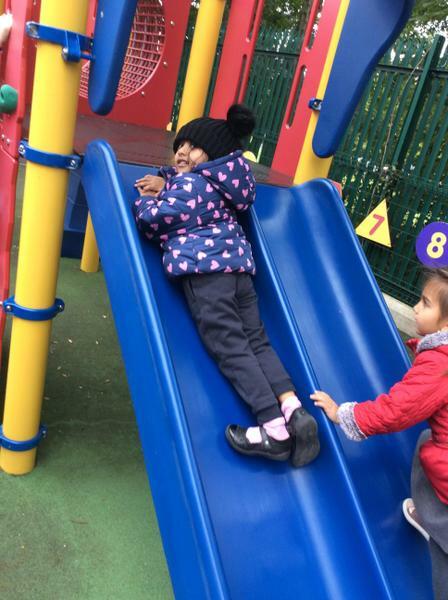 It takes us on an ongoing journey, allowing us to stop off, revisit and move on towards new goals. 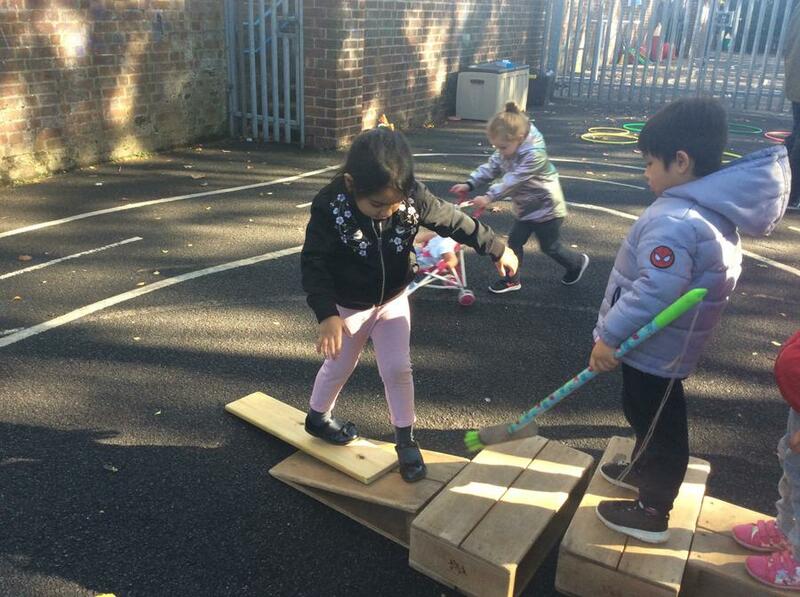 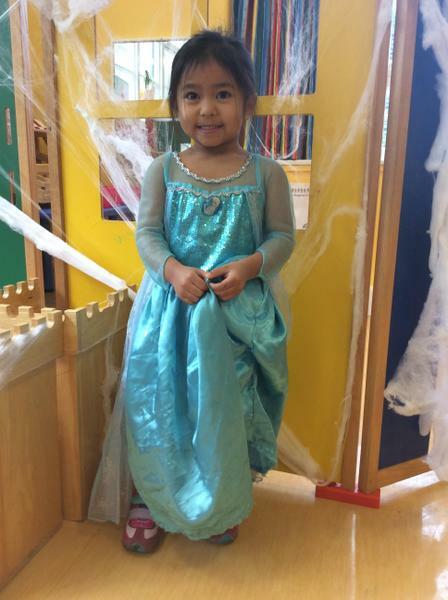 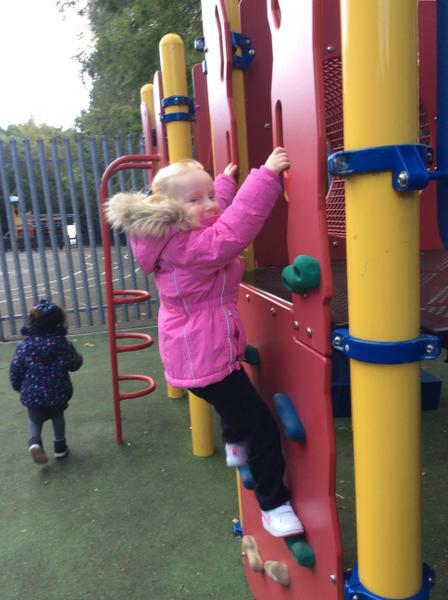 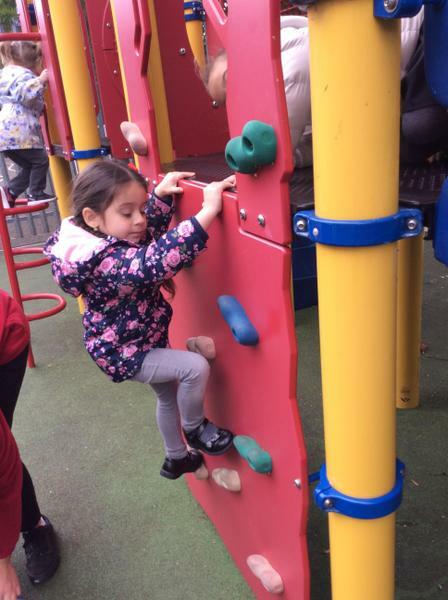 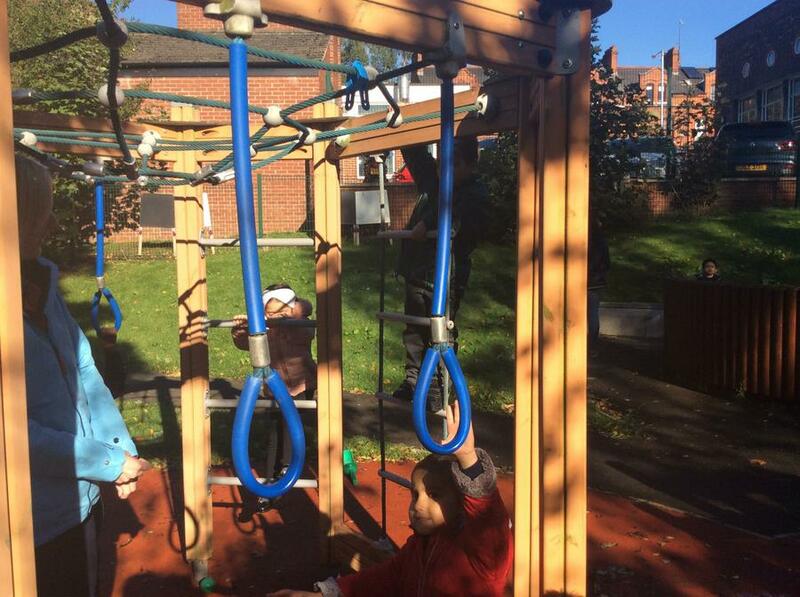 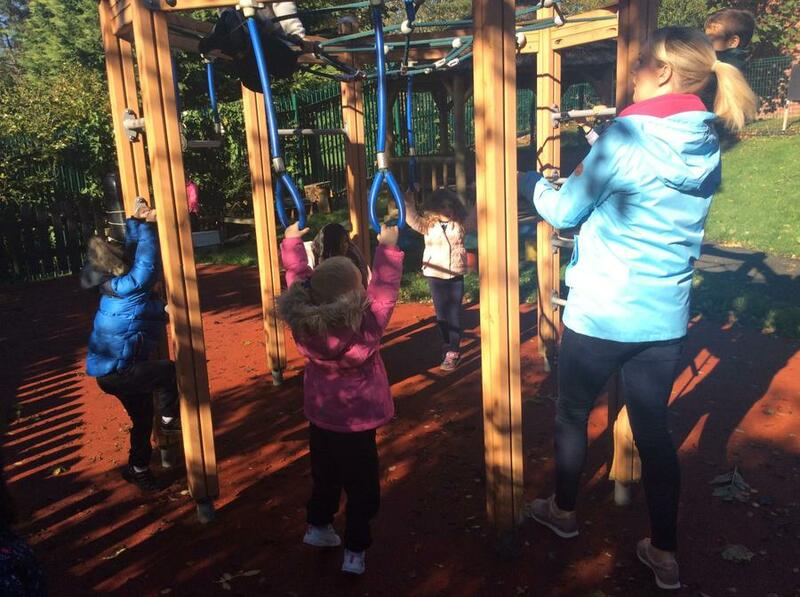 Through play we develop physically, socially and academically. 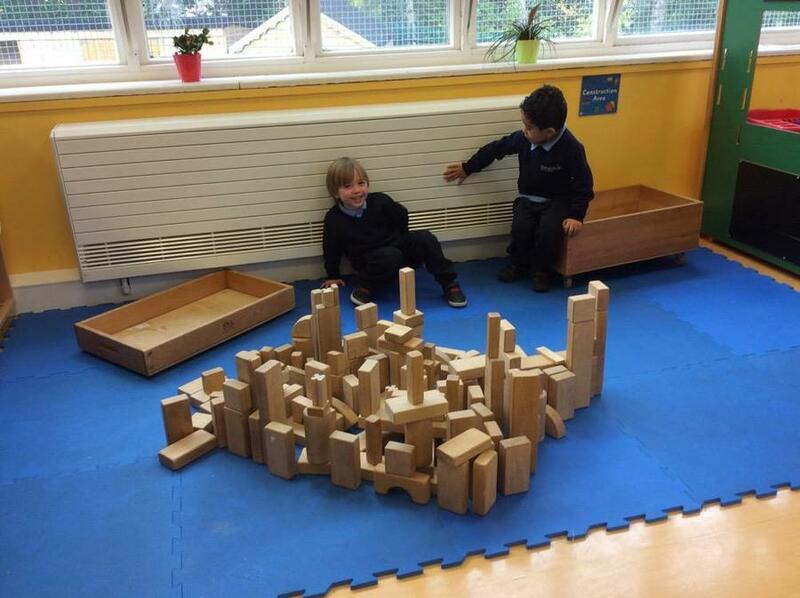 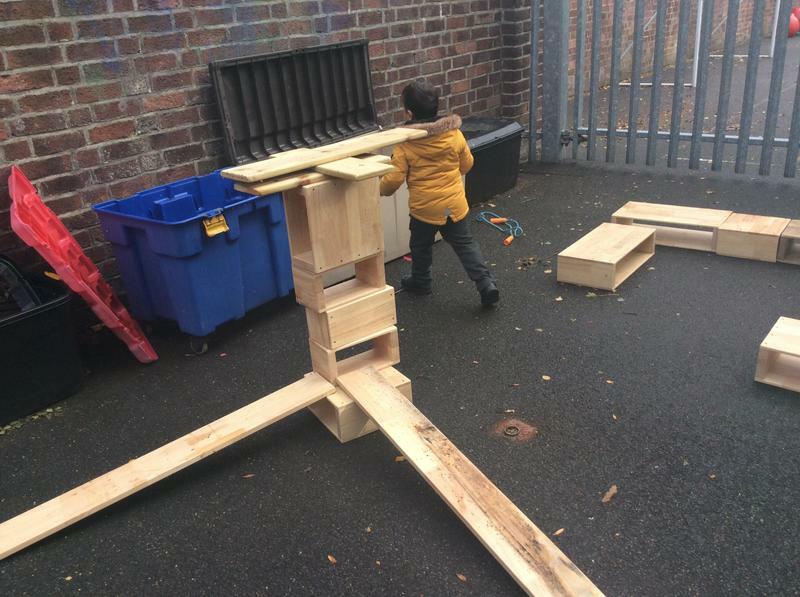 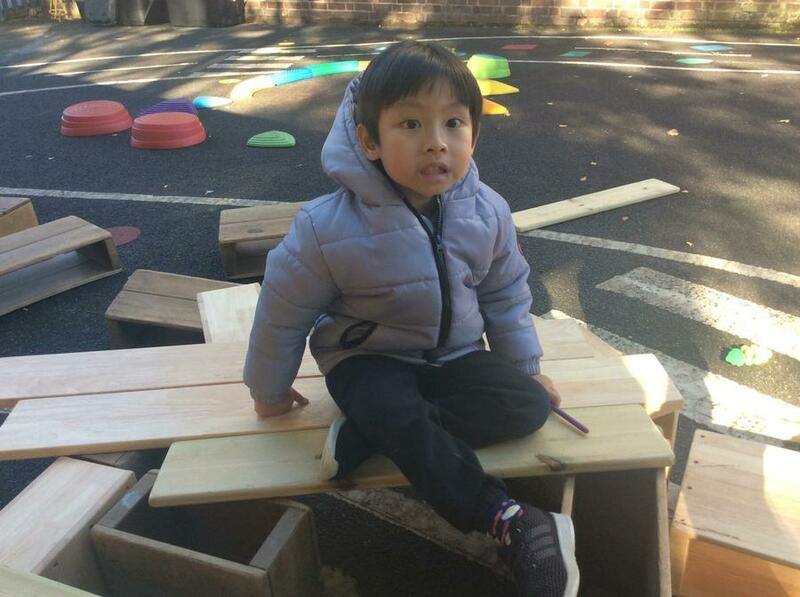 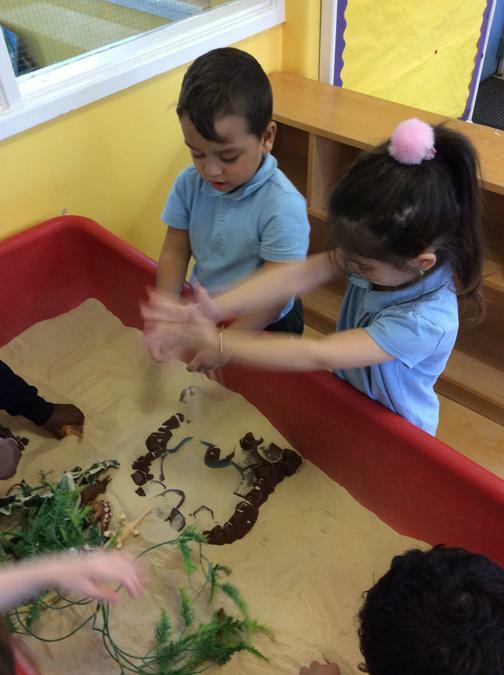 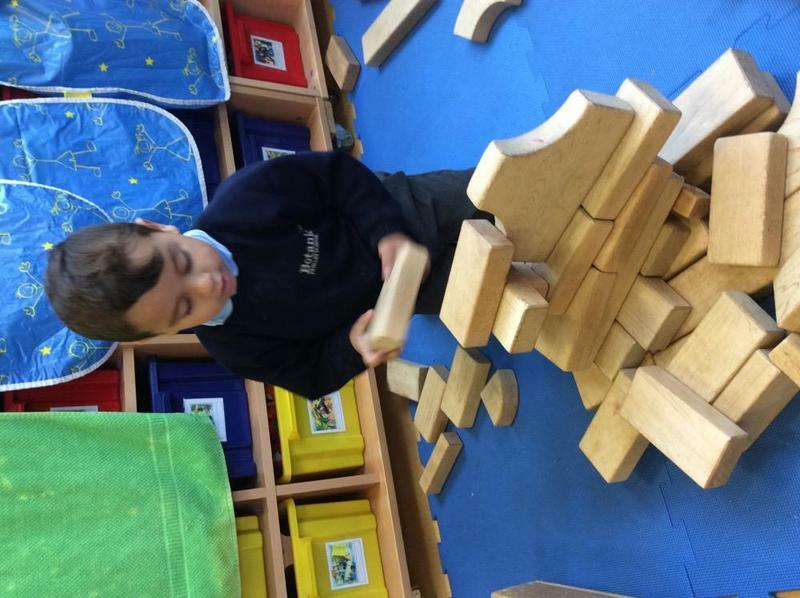 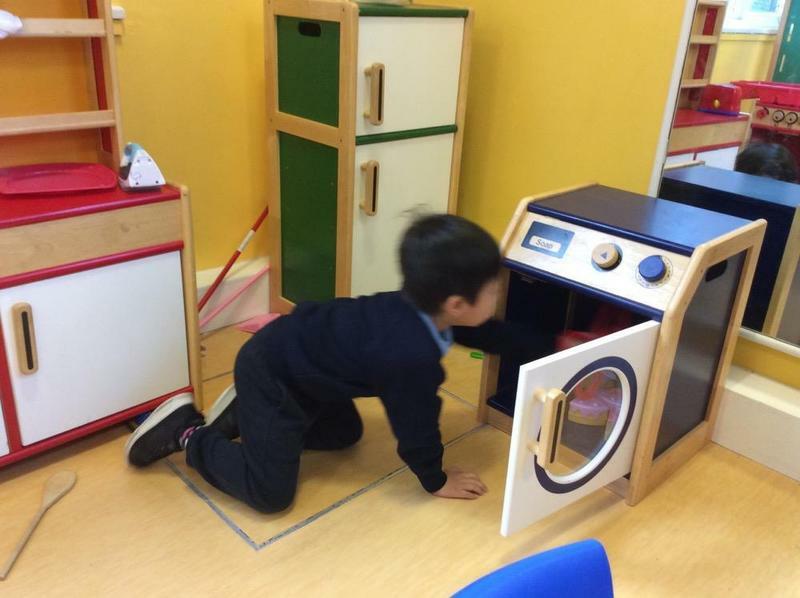 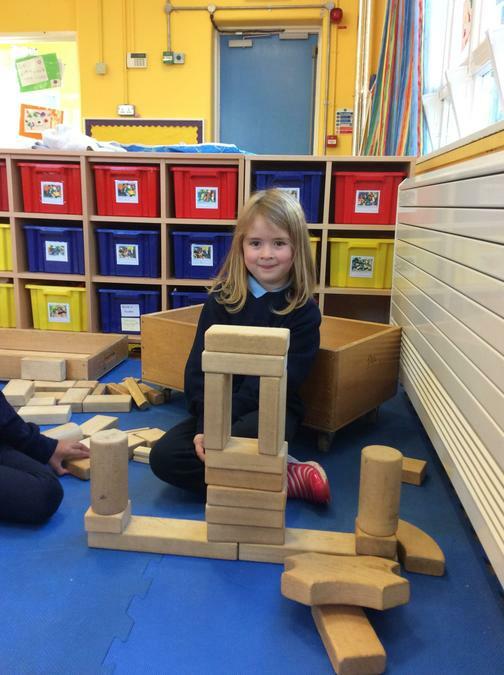 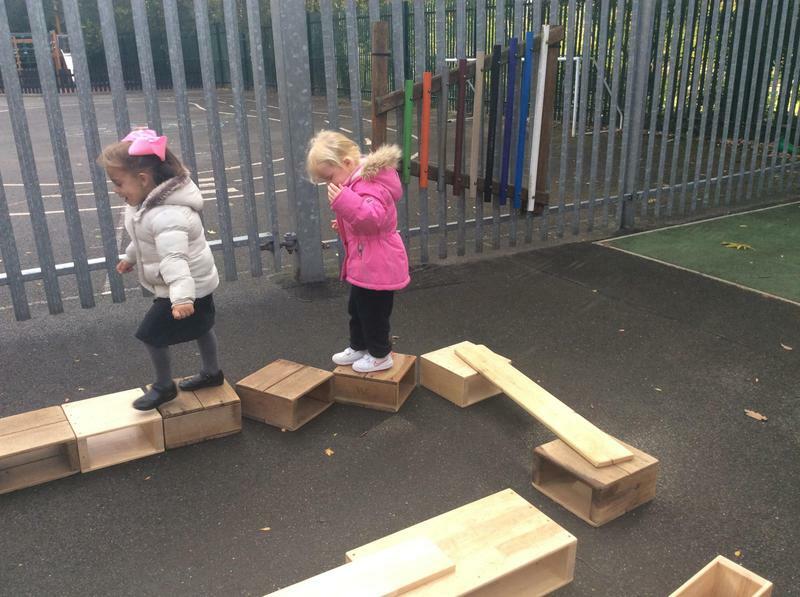 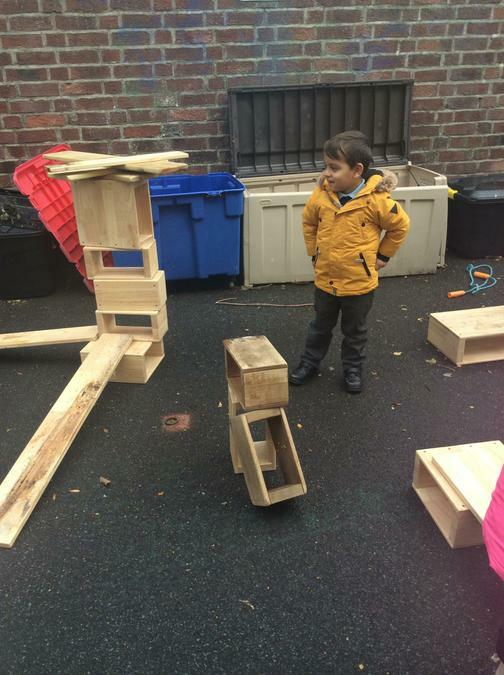 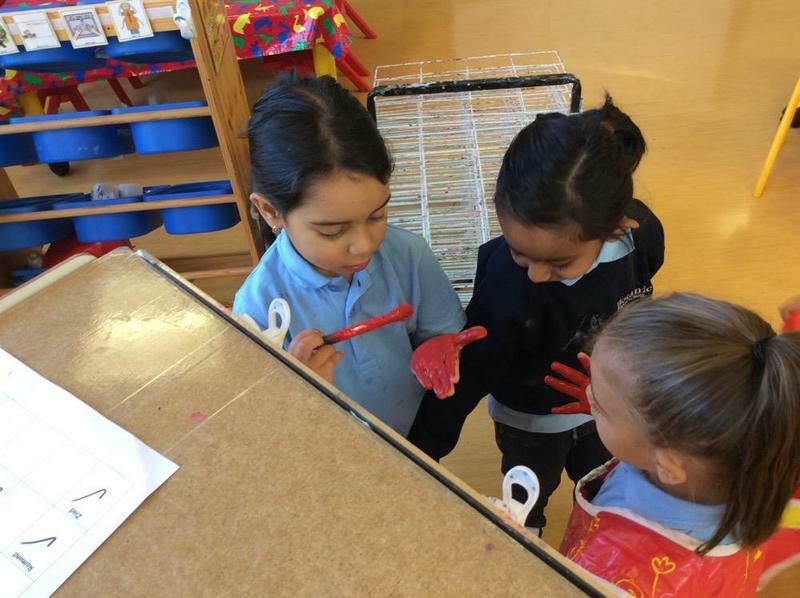 Play enables us to explore, problem solve, predict and test theories. 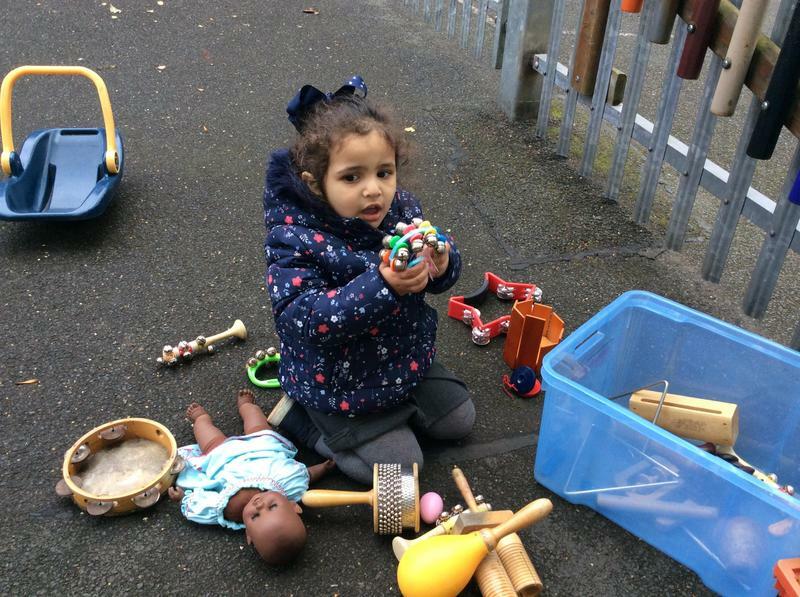 Play provides us with natural opportunities to explore our world around us, discover our talents, to refine our gross and fine motor skills and to develop our early literacy and numeracy skills. 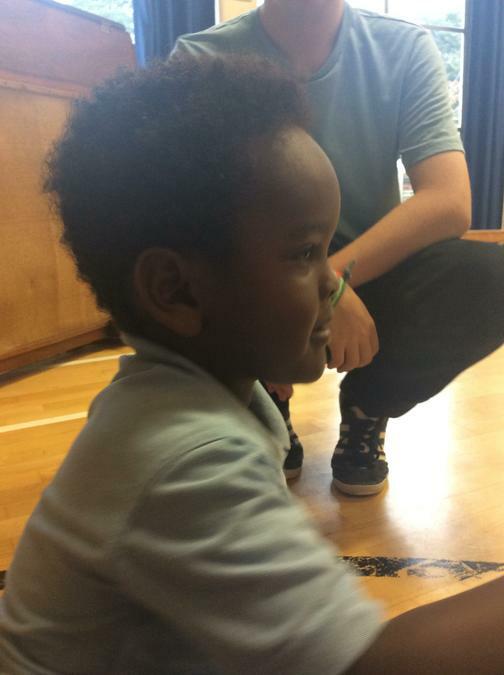 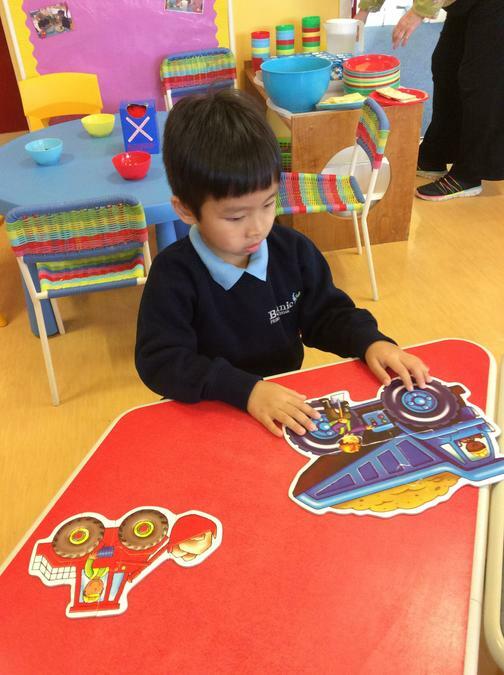 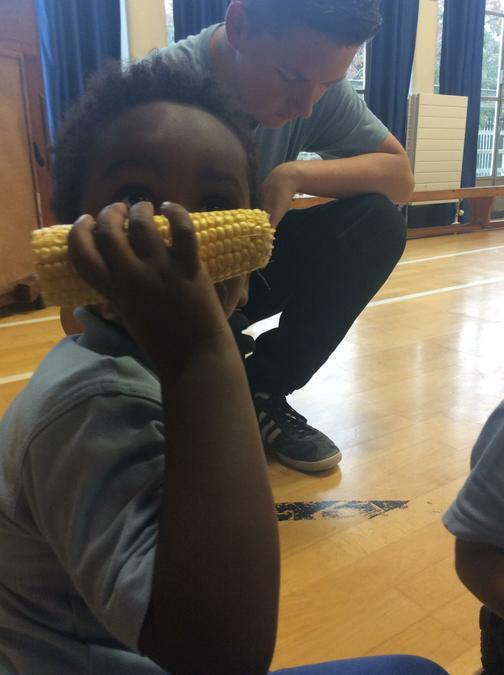 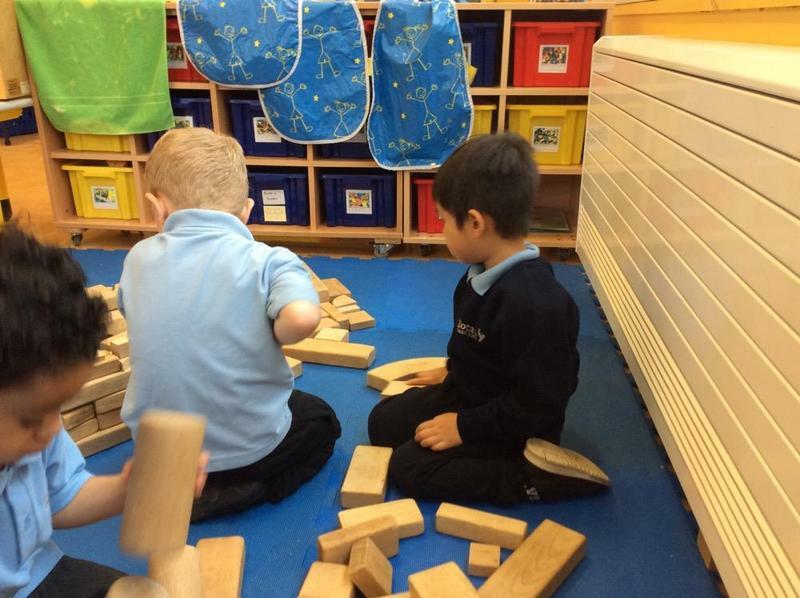 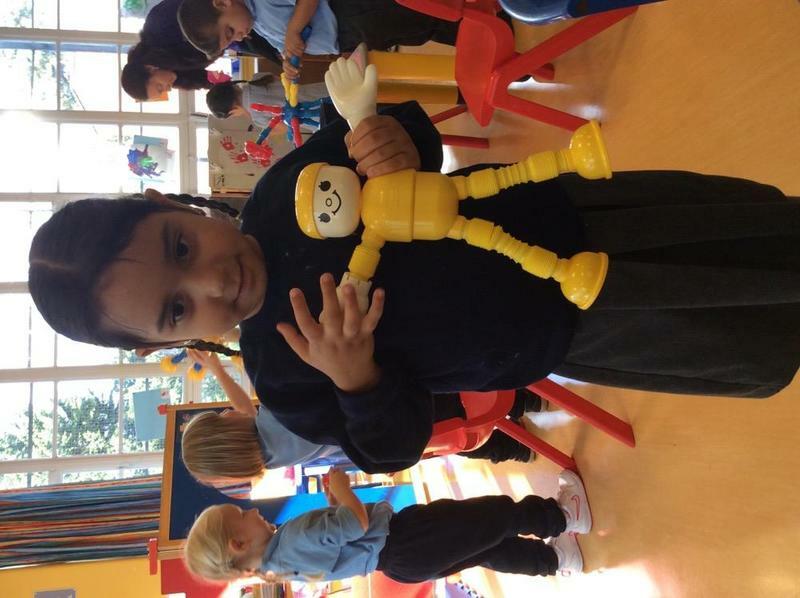 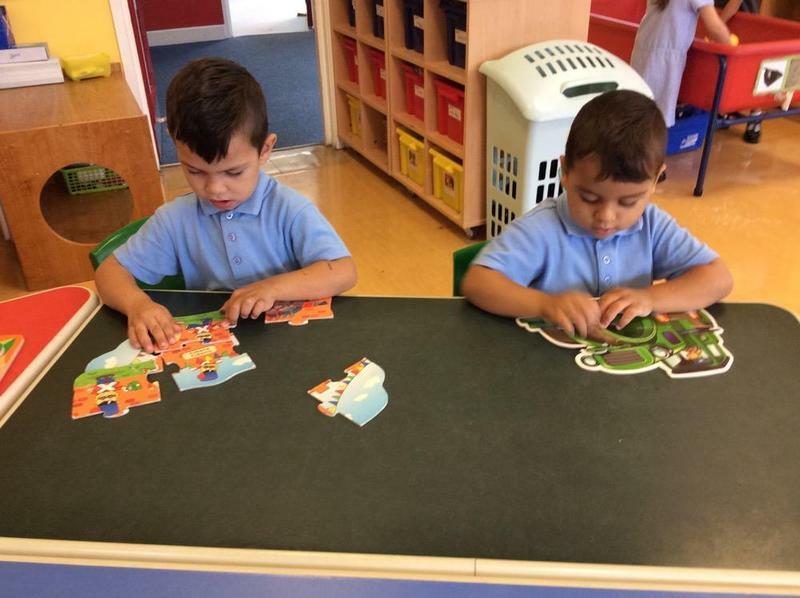 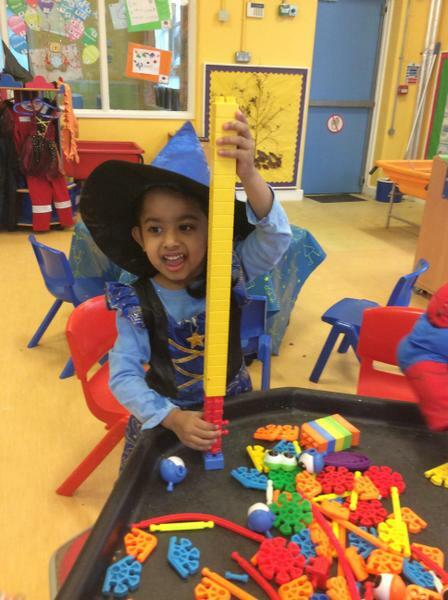 Through play we learn to negotiate and to work in groups, developing our communication and leadership skills. 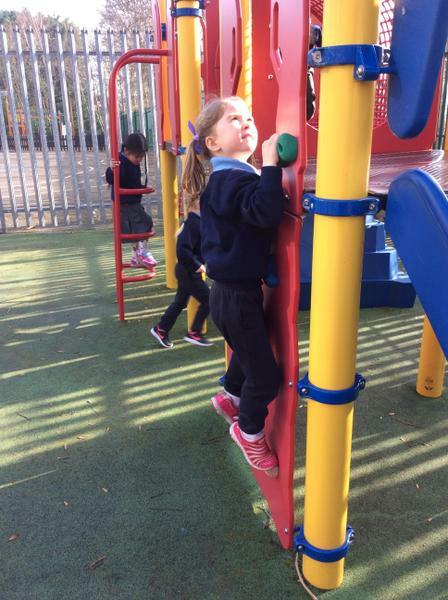 We grow in confidence, independence and self esteem, all while developing a thirst for learning! 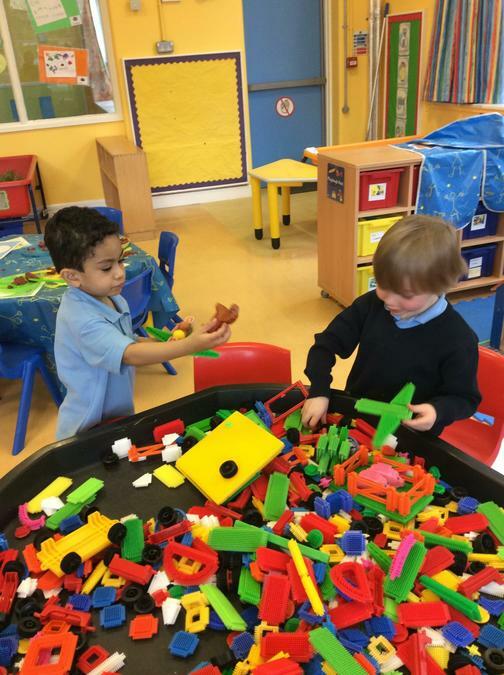 Learning to share our play space and toys. 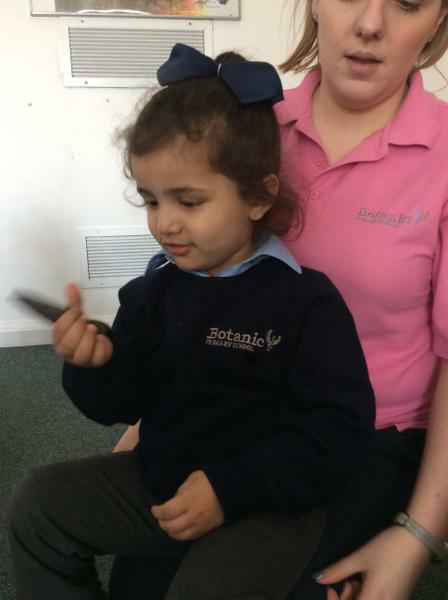 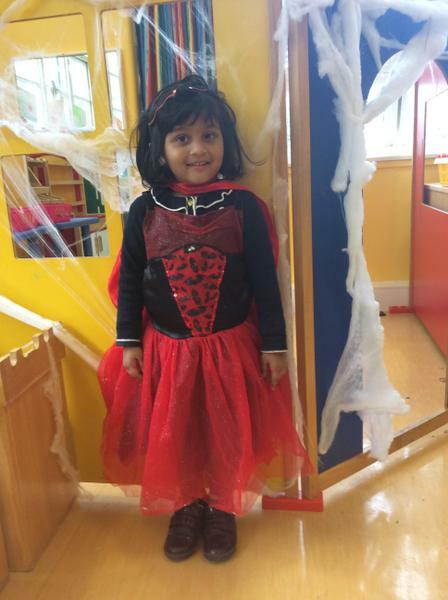 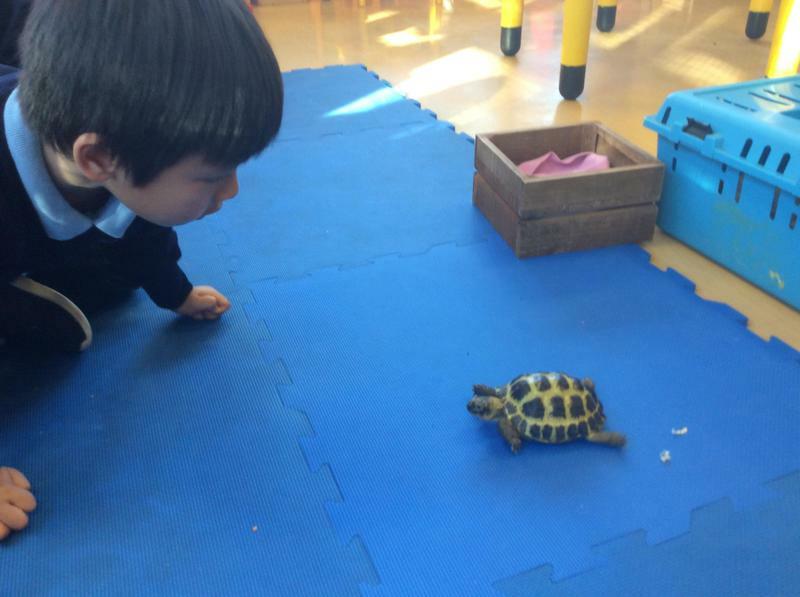 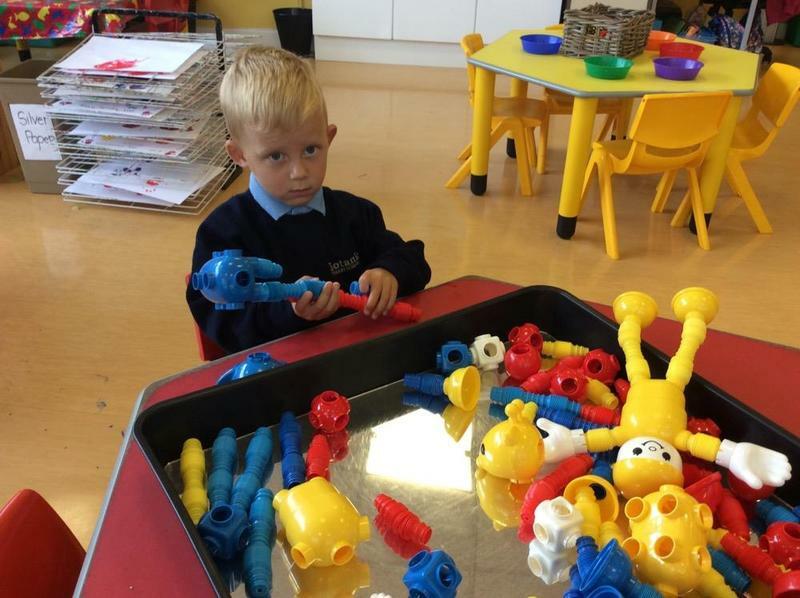 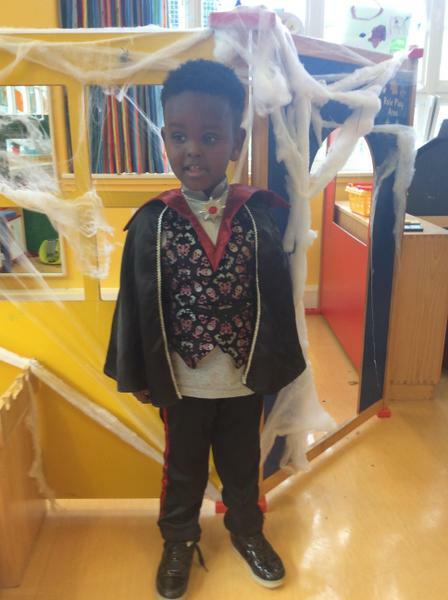 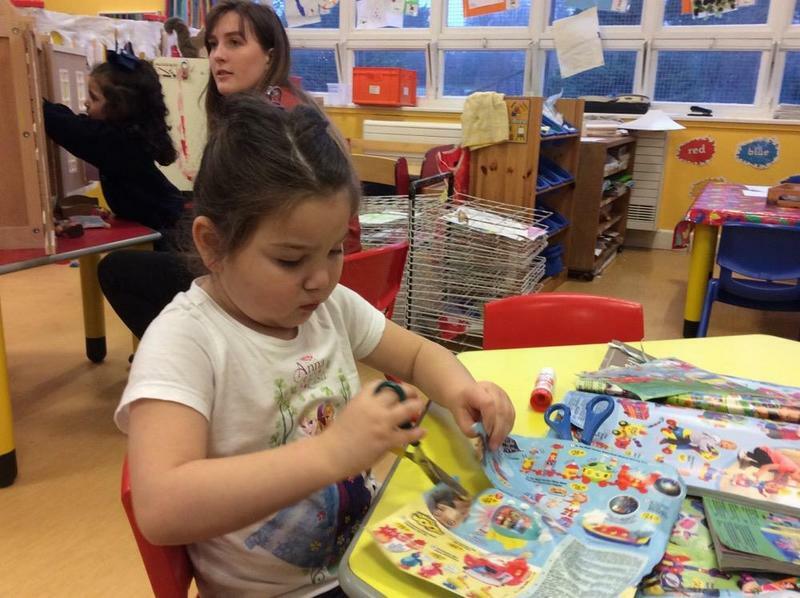 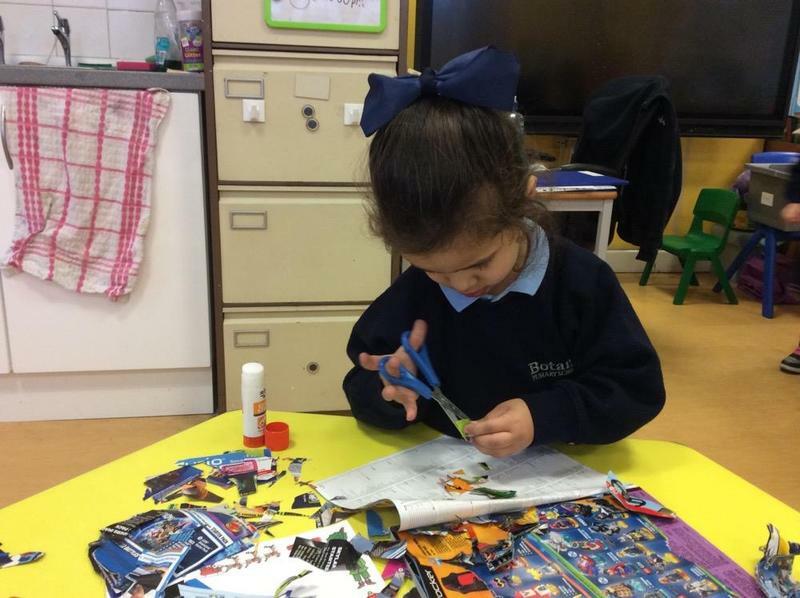 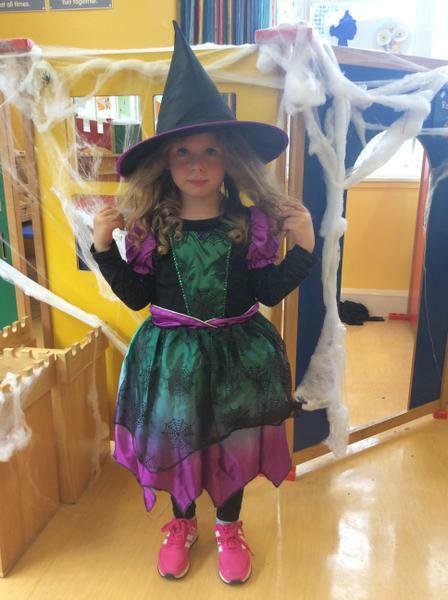 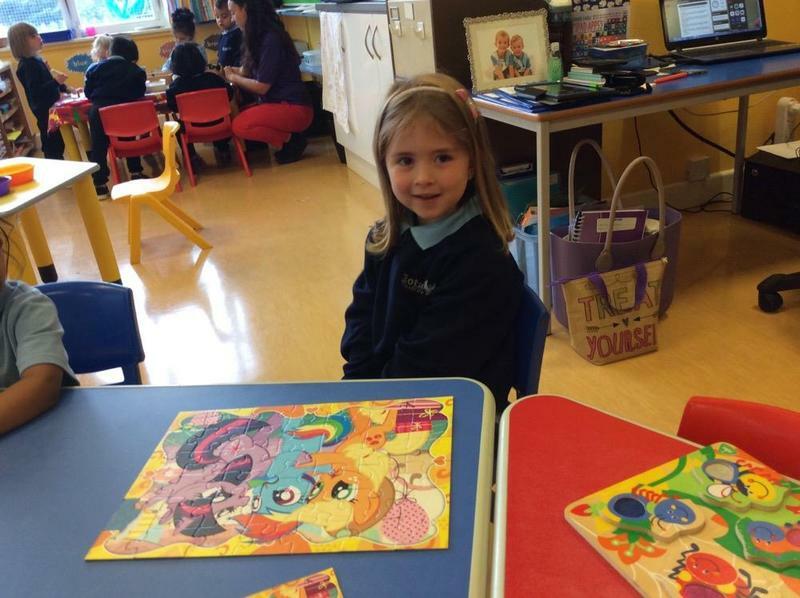 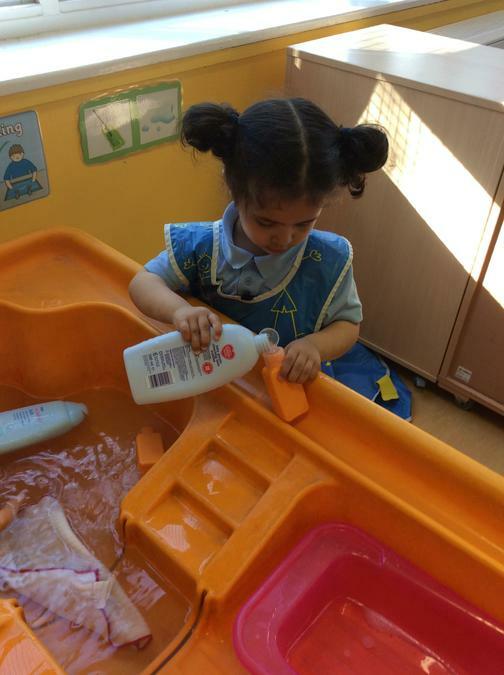 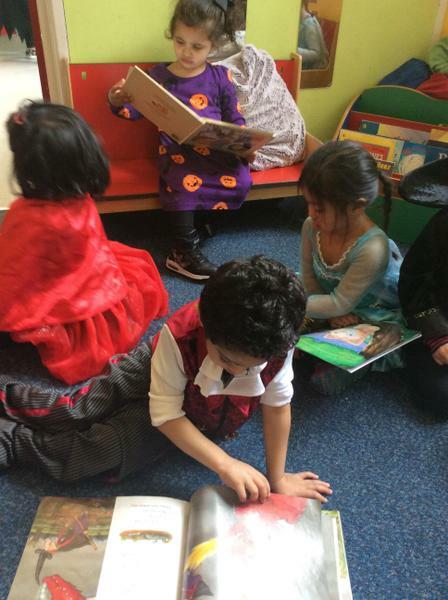 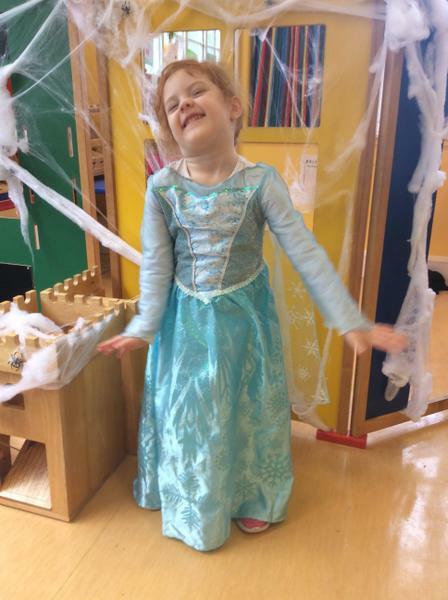 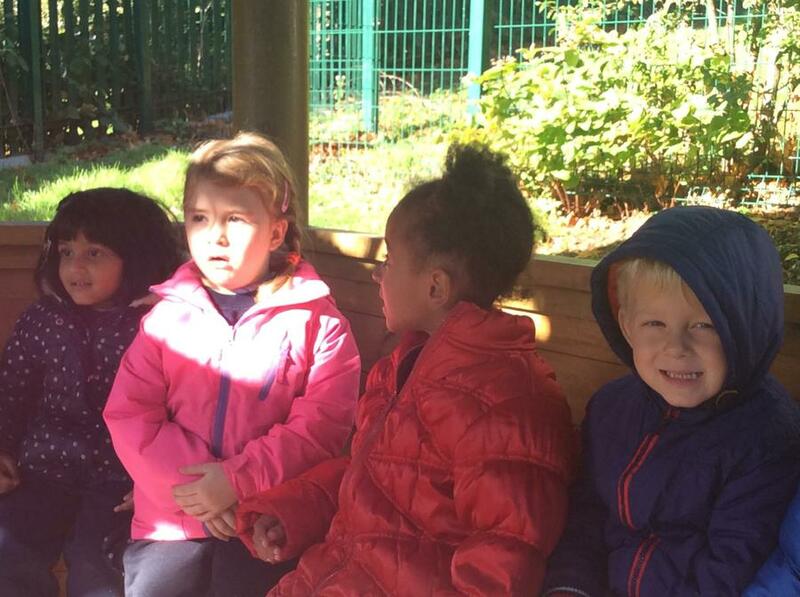 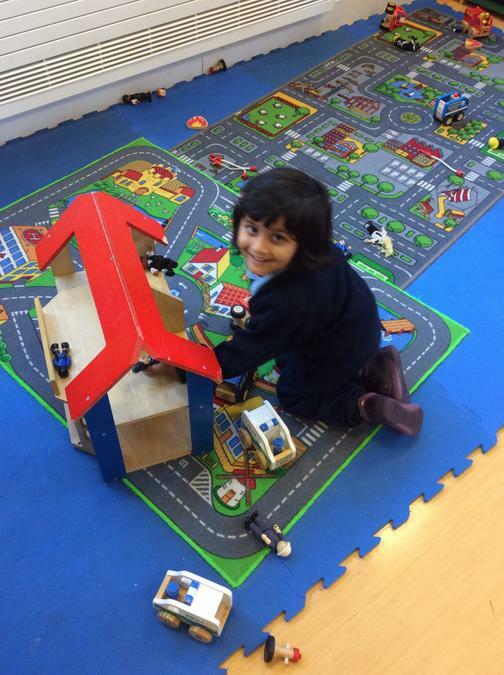 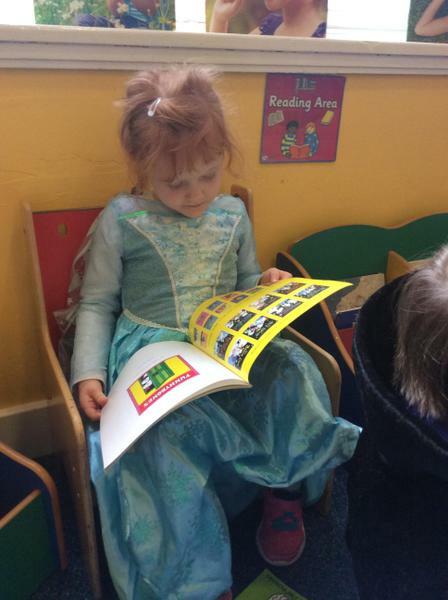 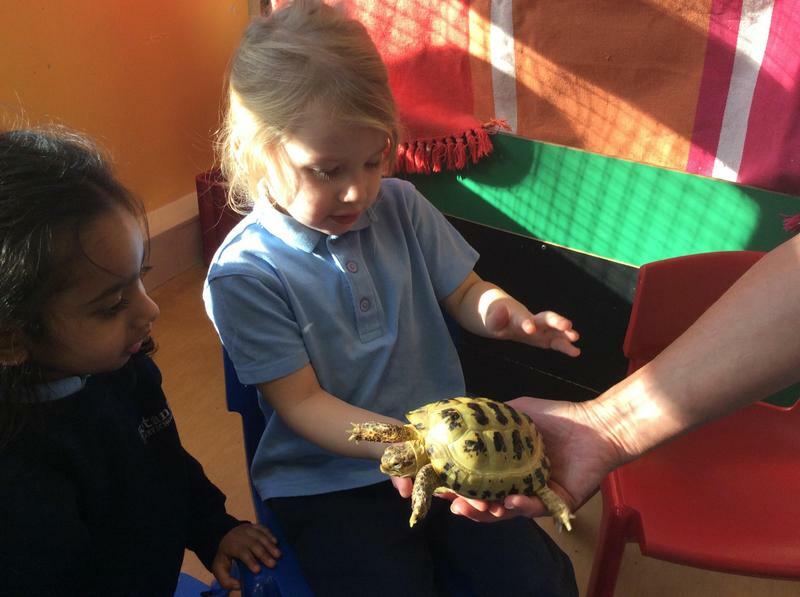 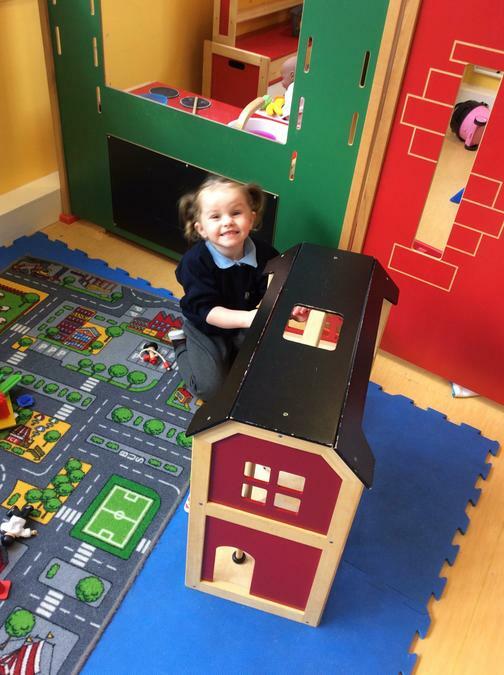 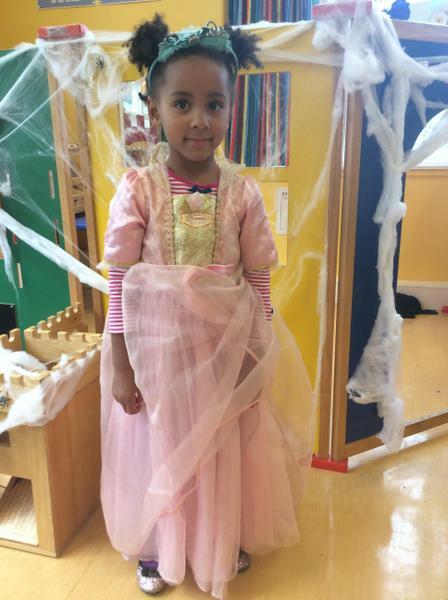 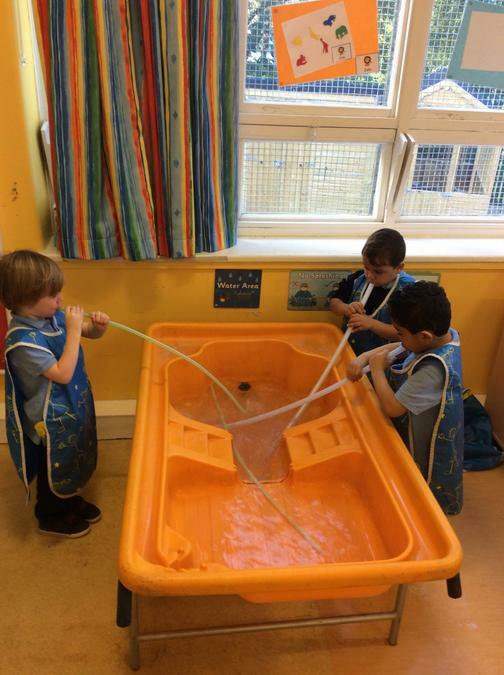 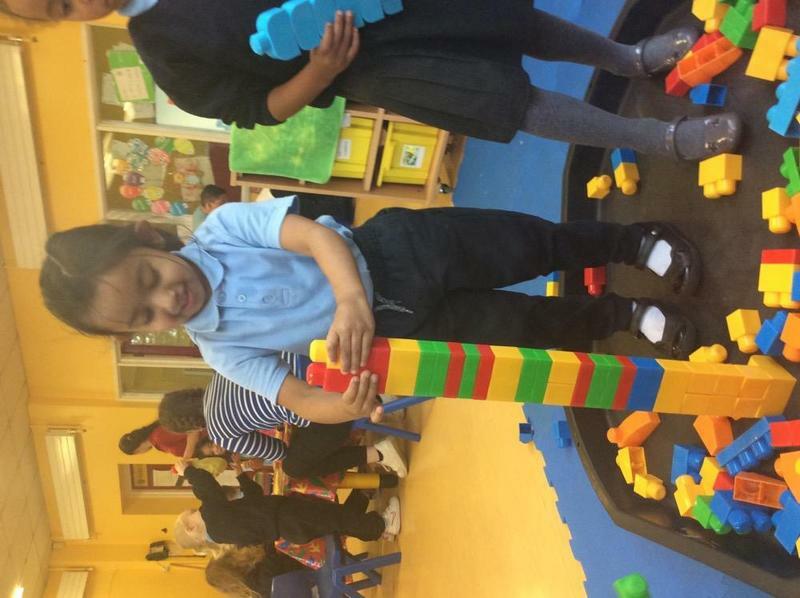 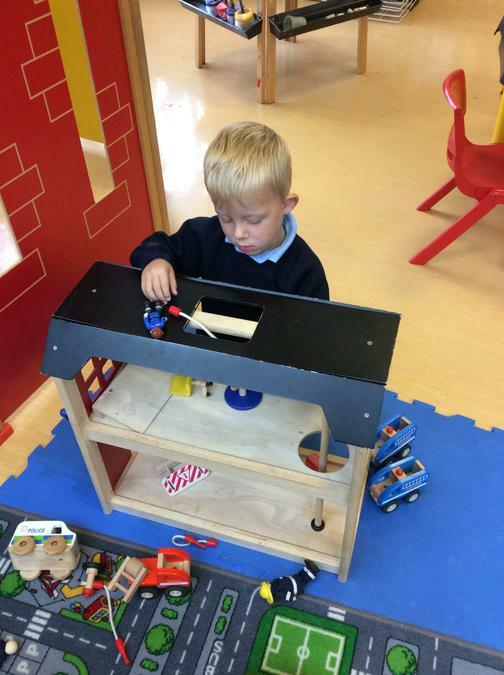 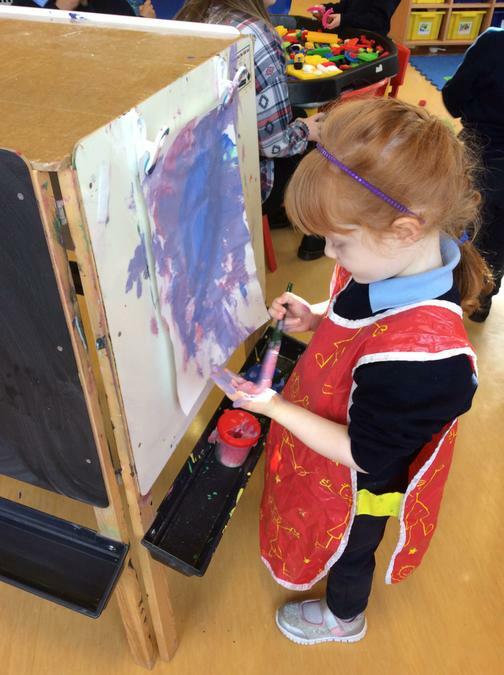 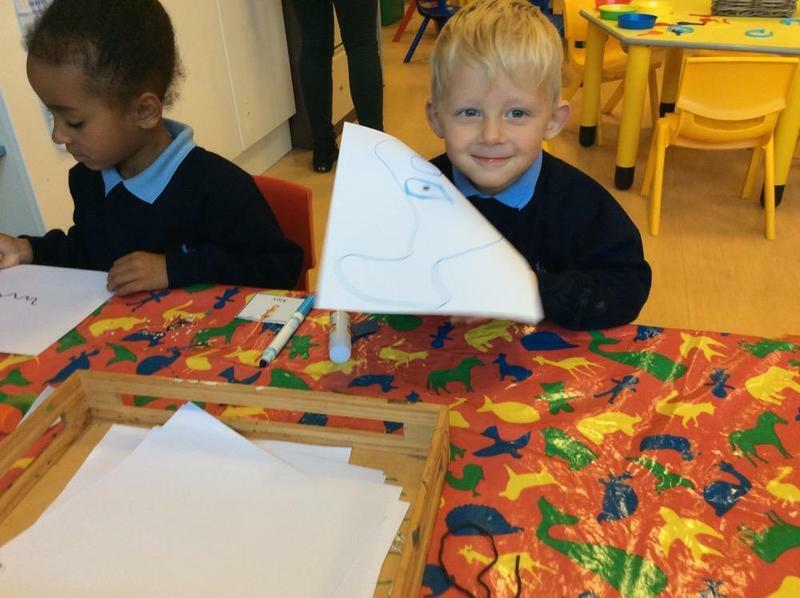 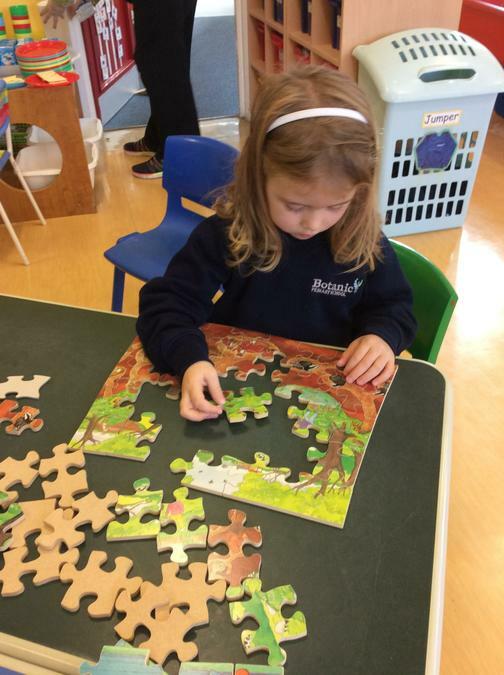 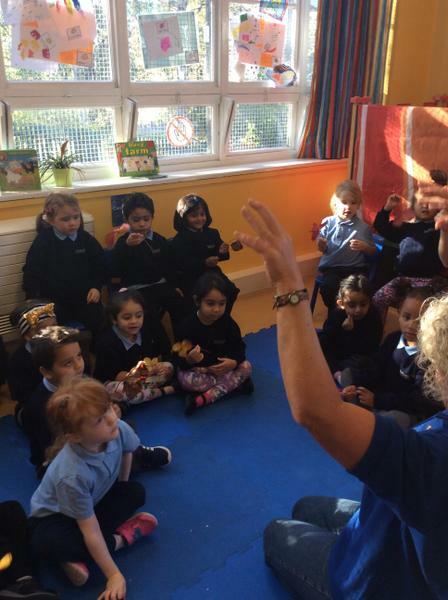 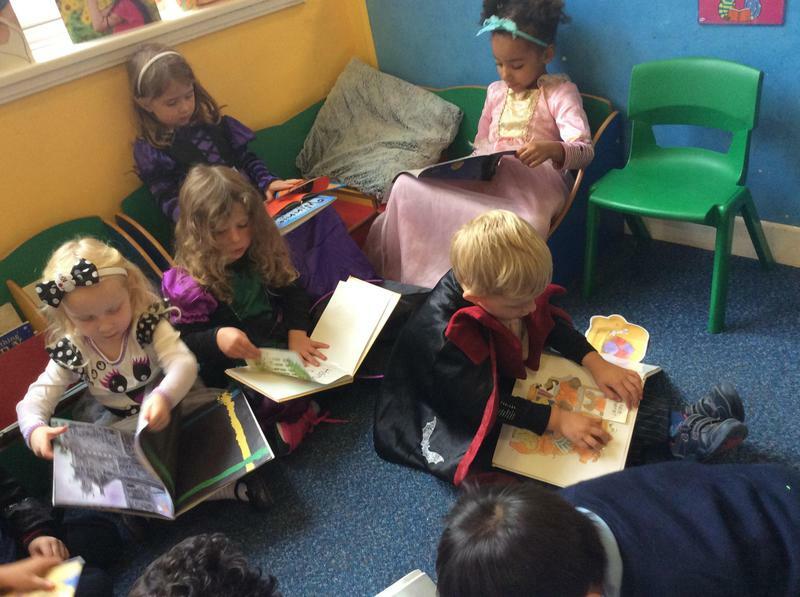 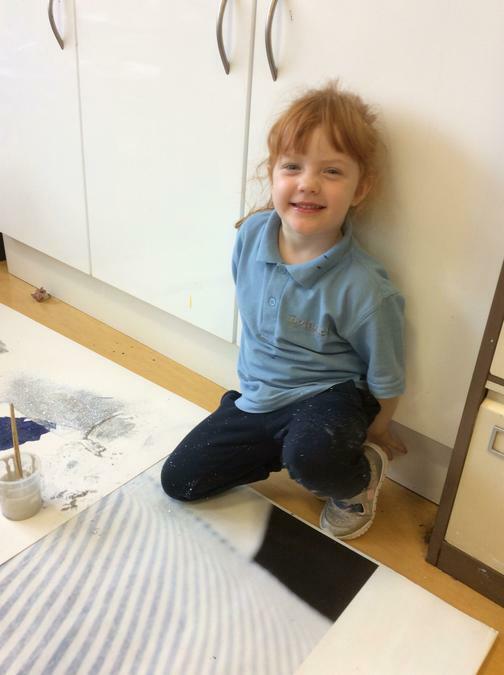 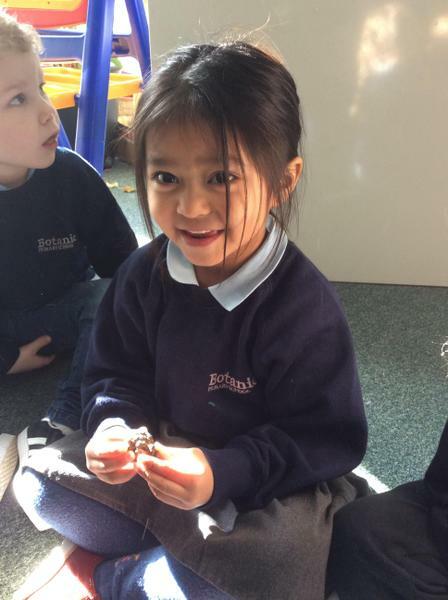 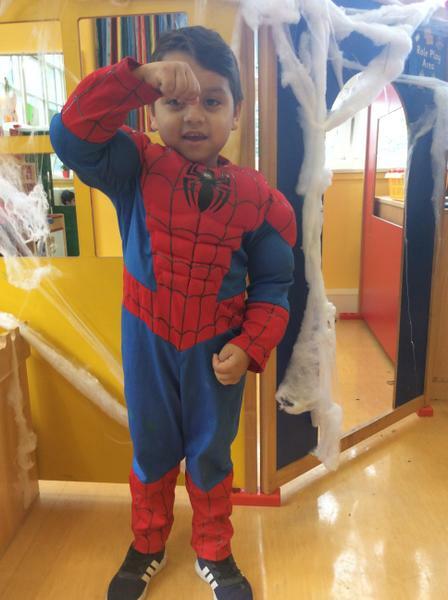 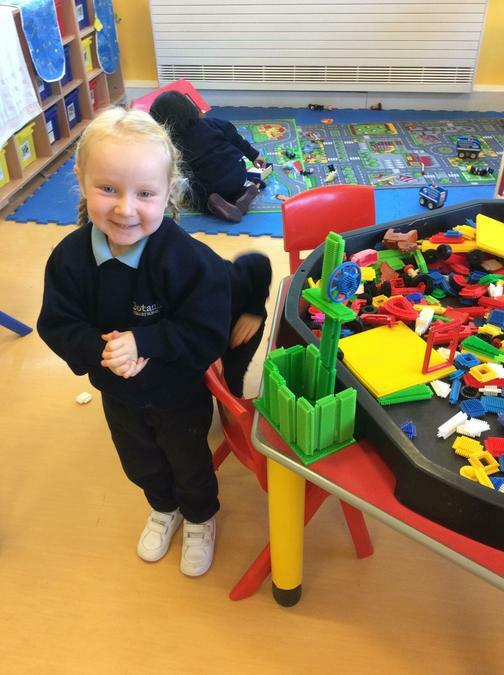 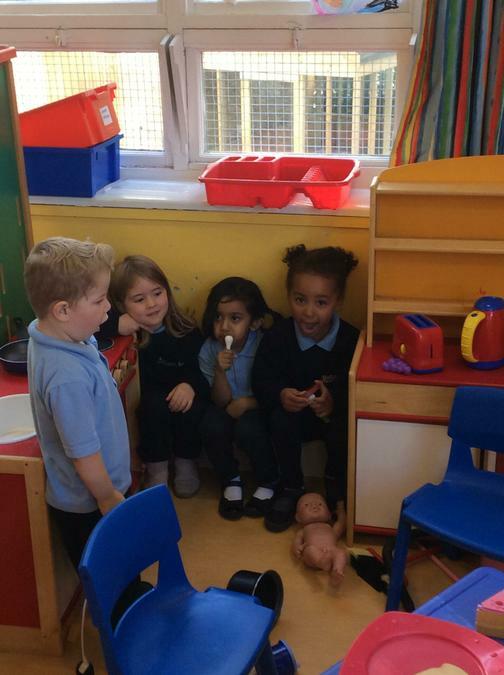 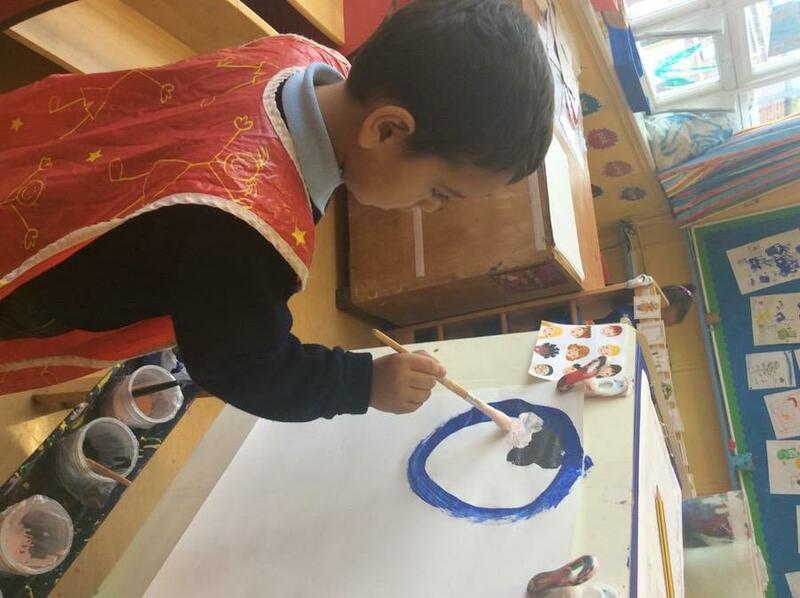 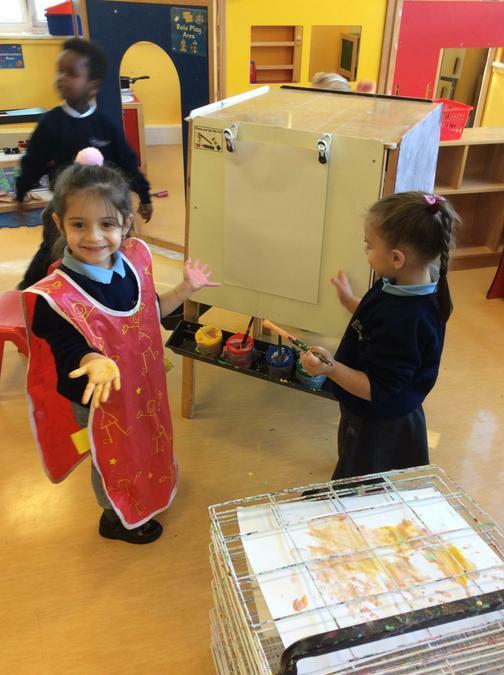 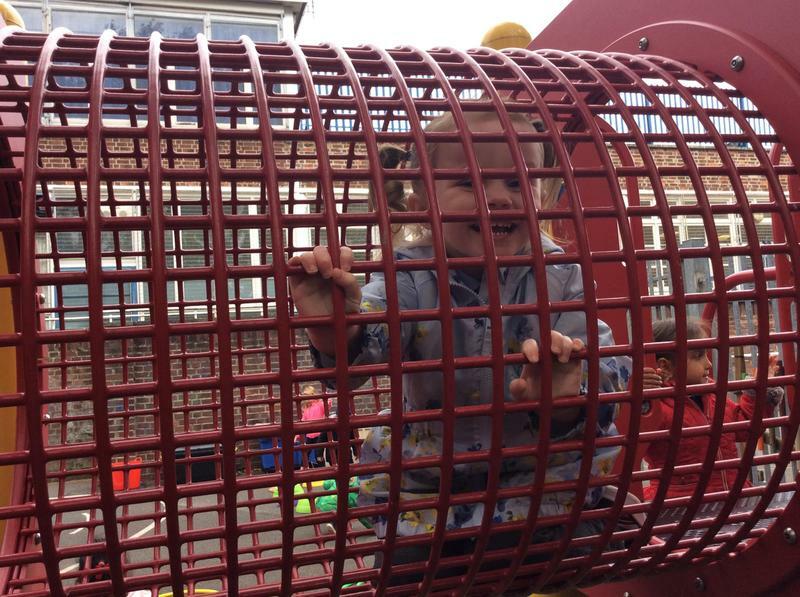 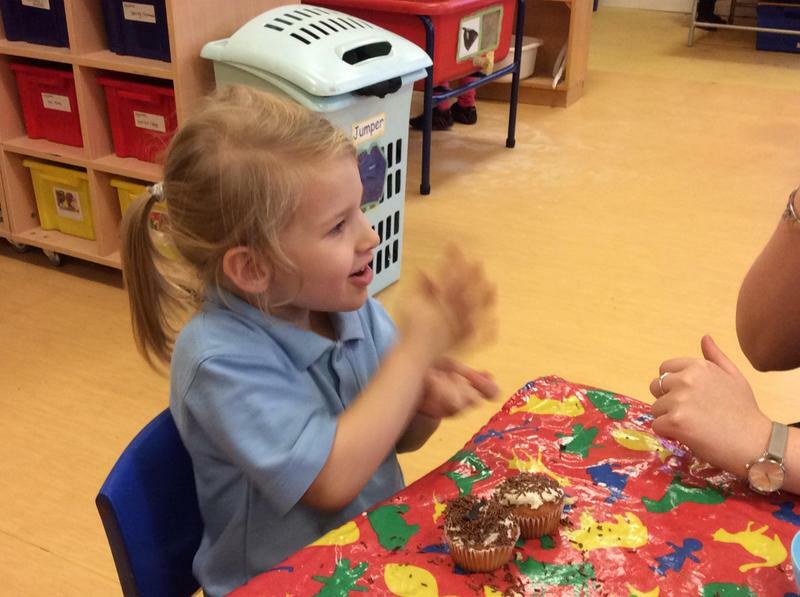 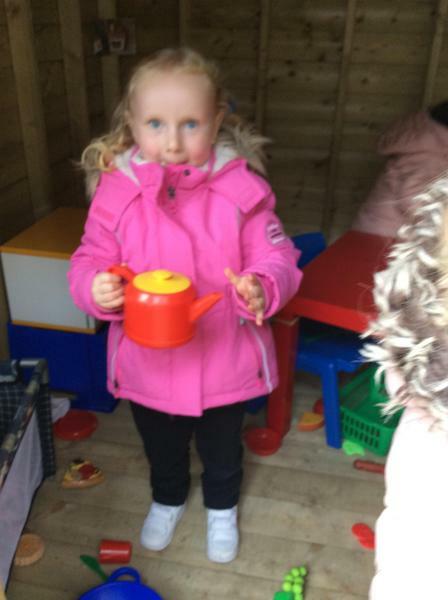 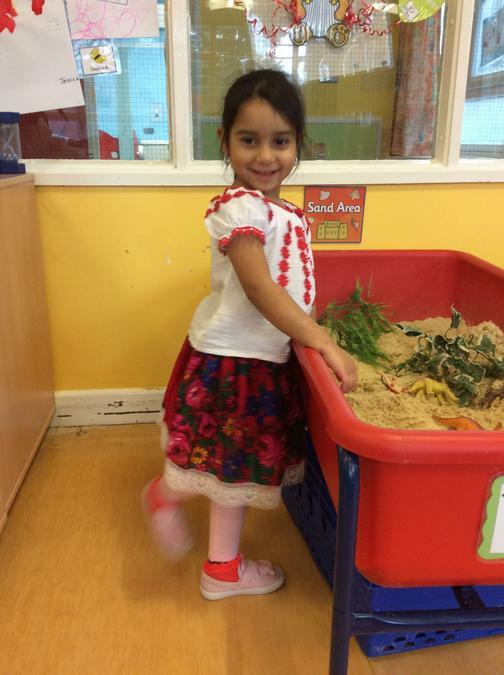 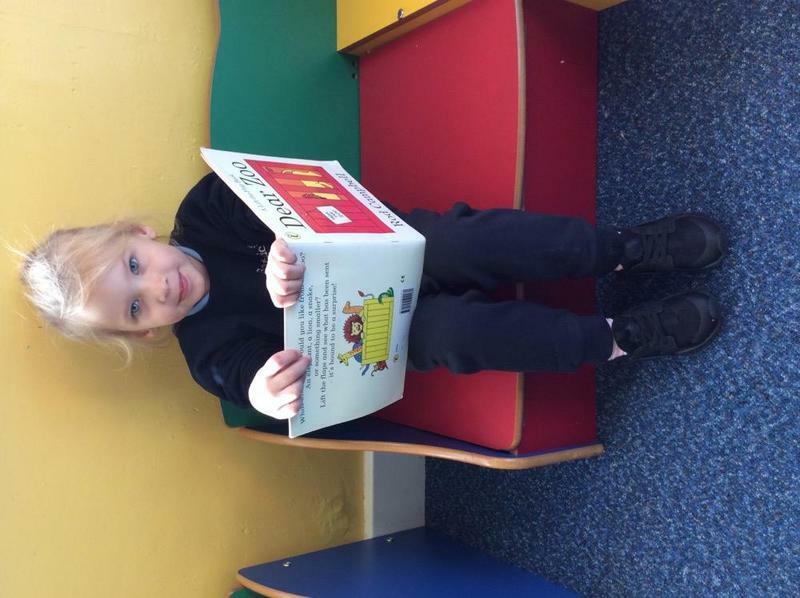 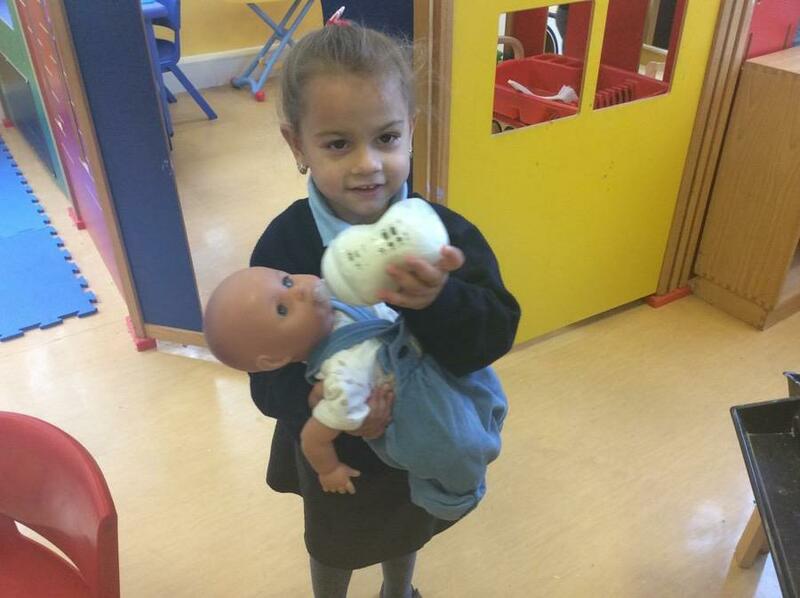 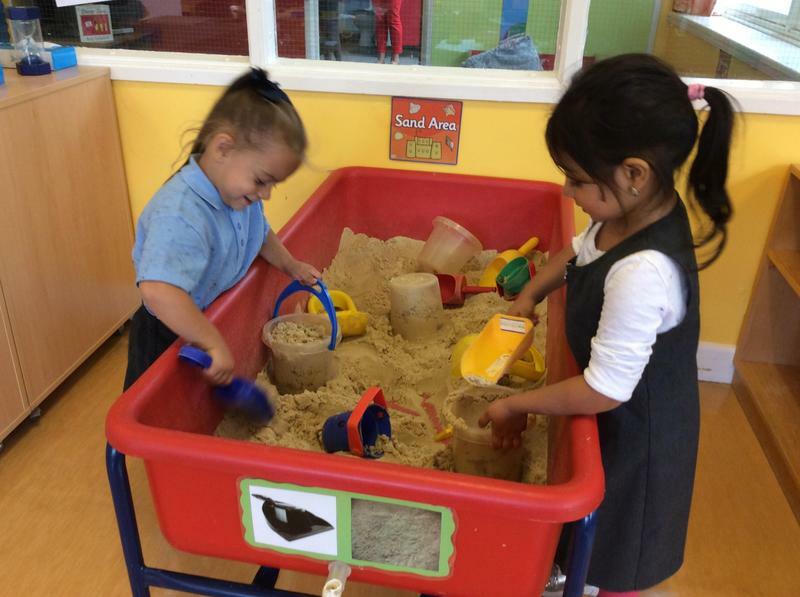 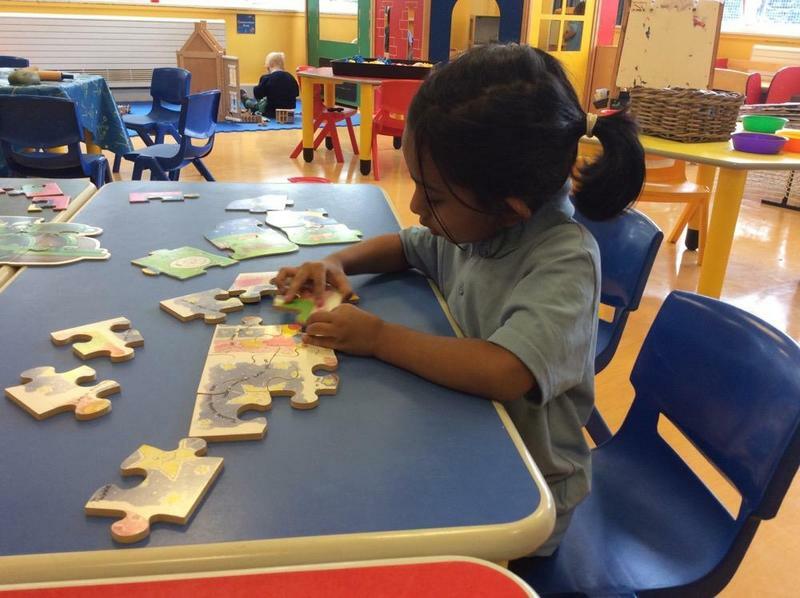 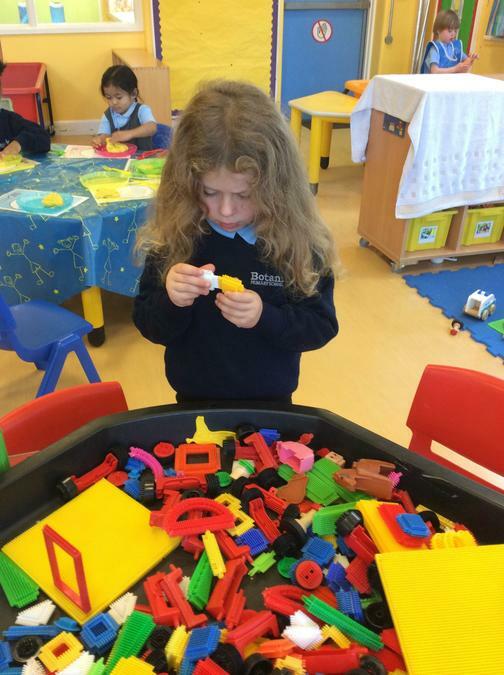 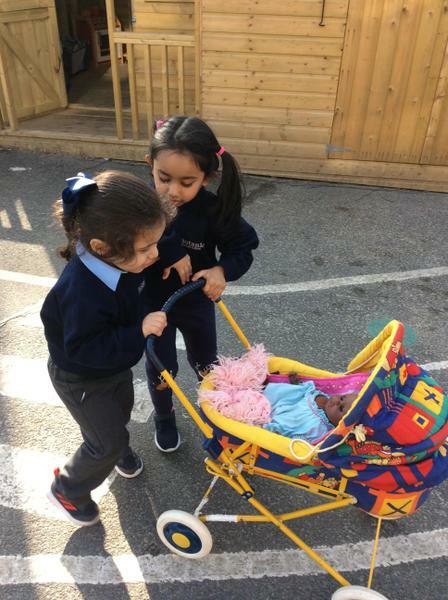 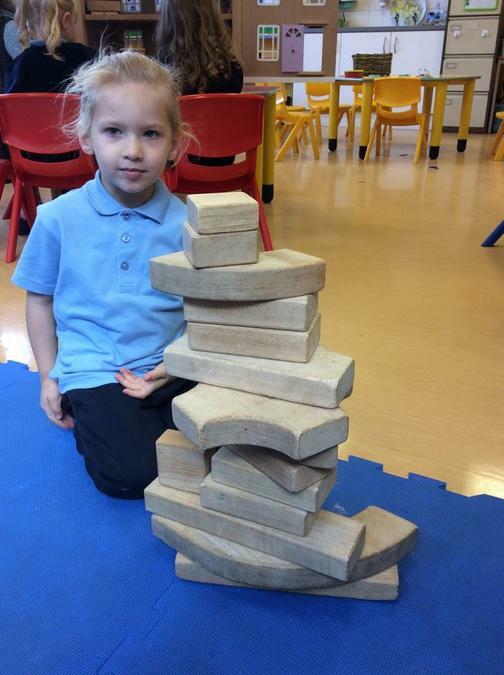 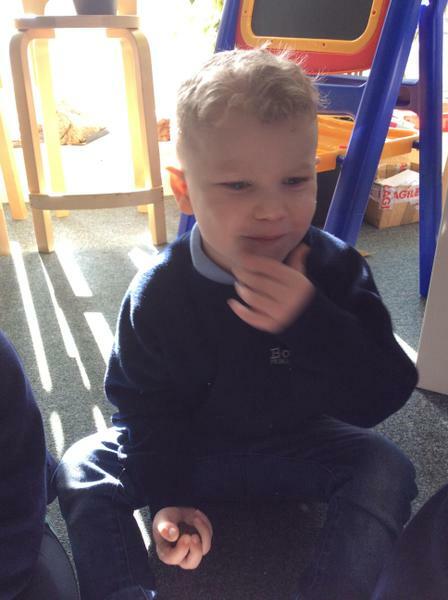 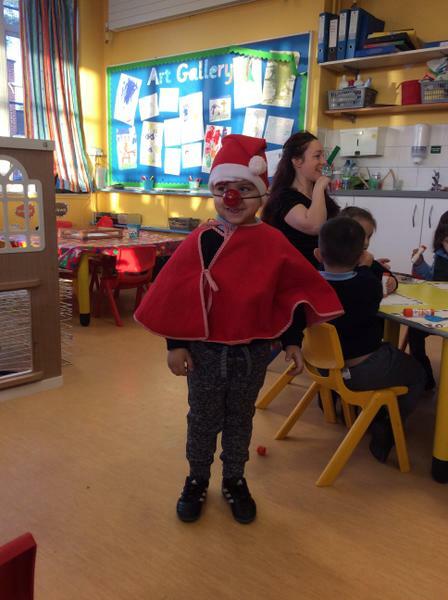 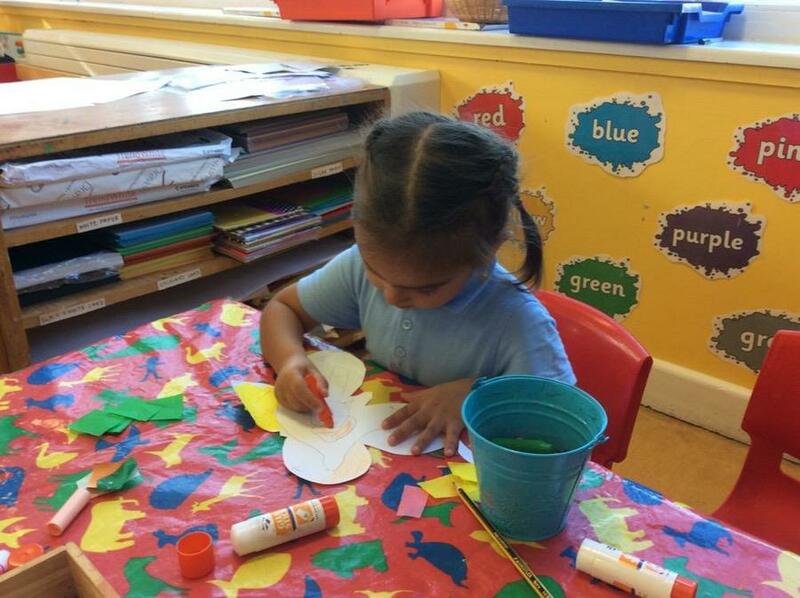 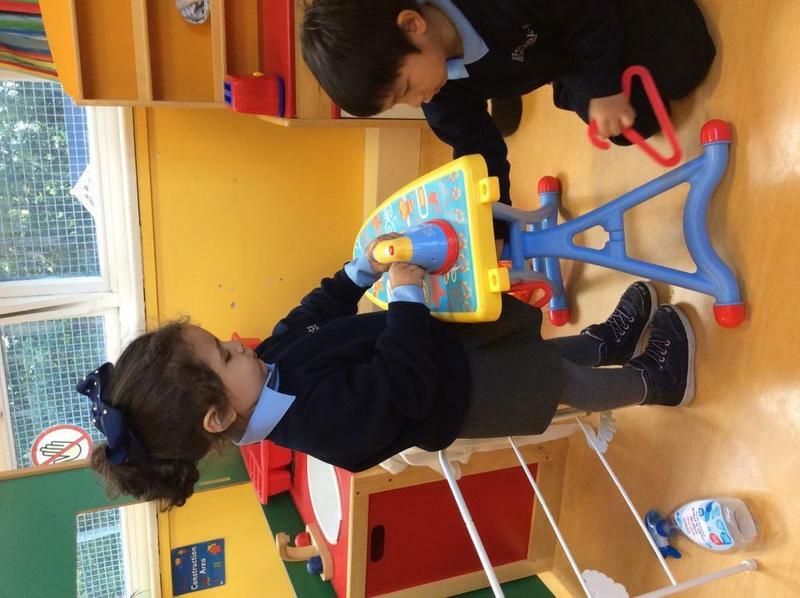 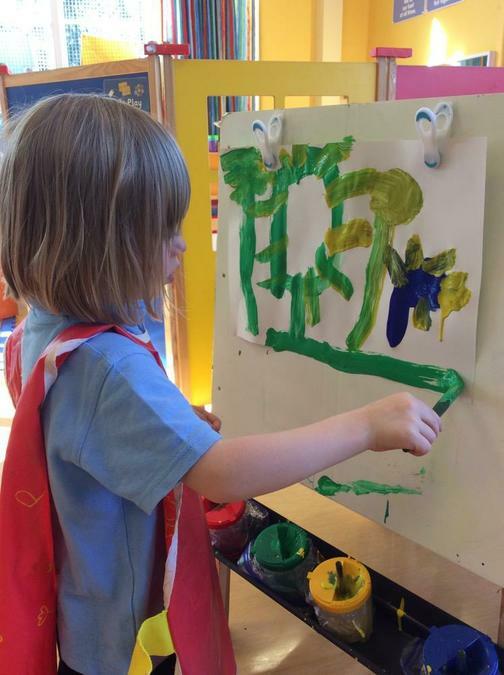 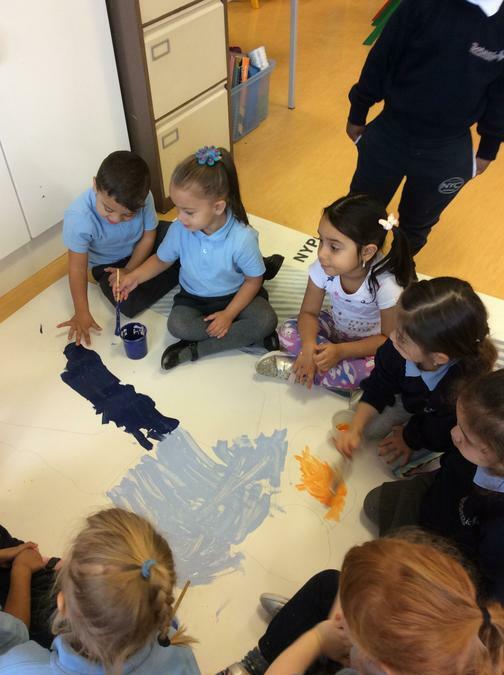 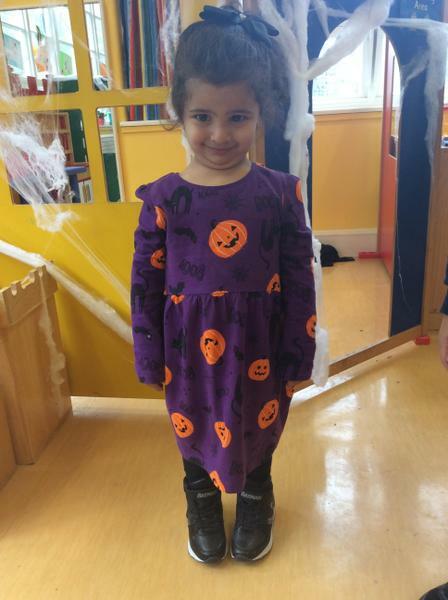 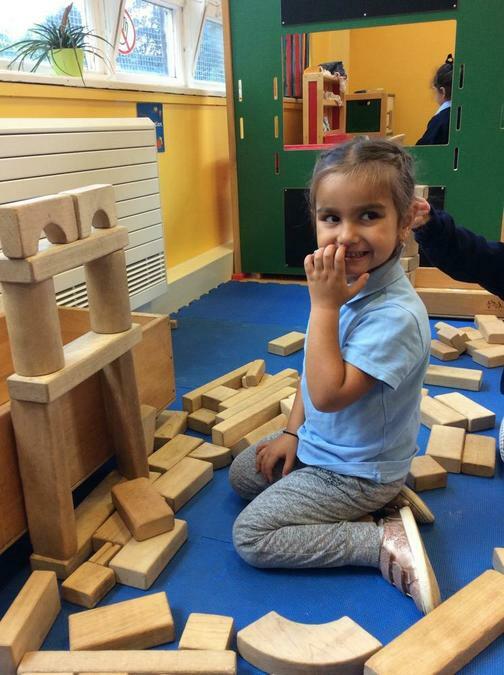 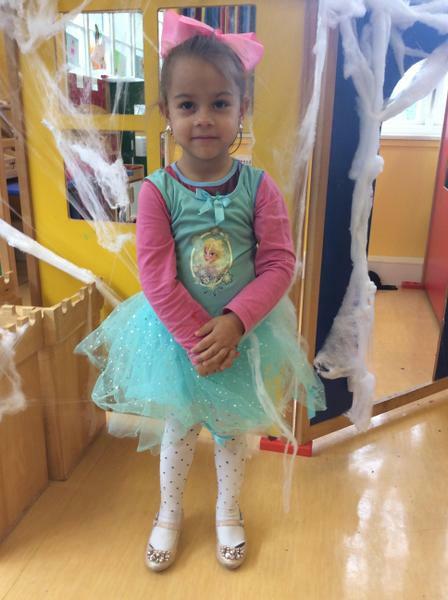 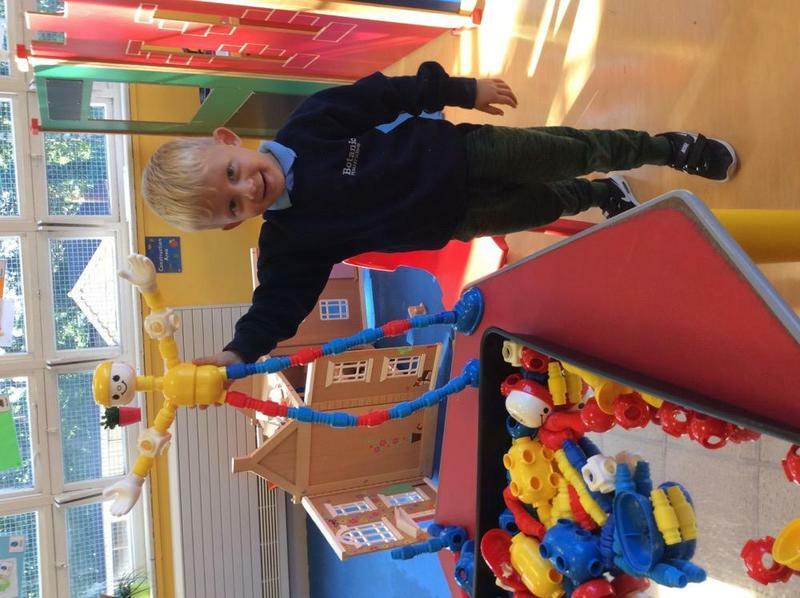 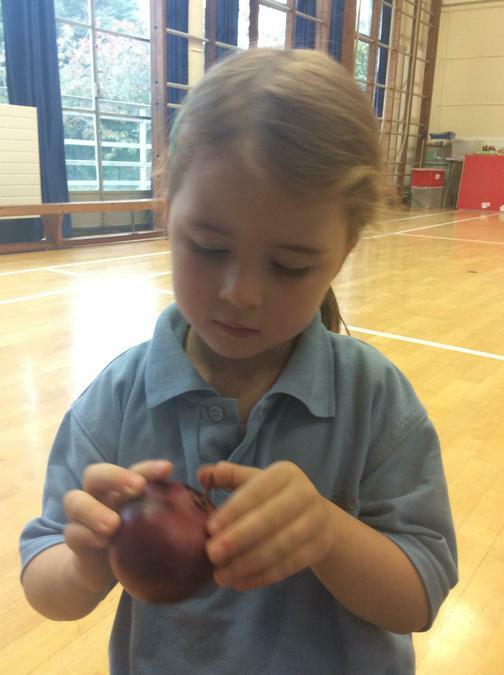 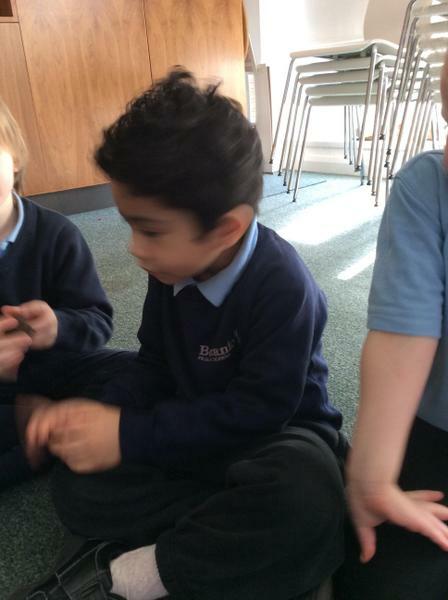 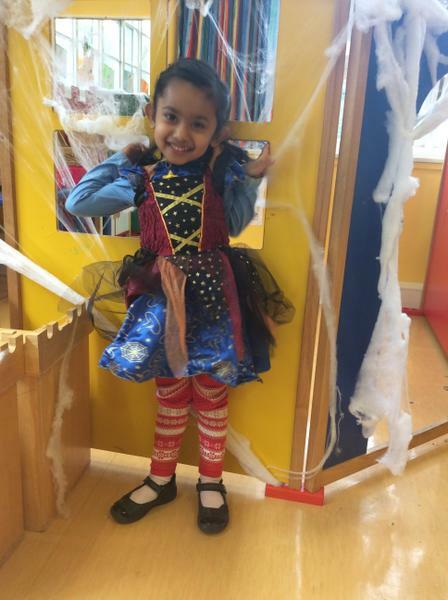 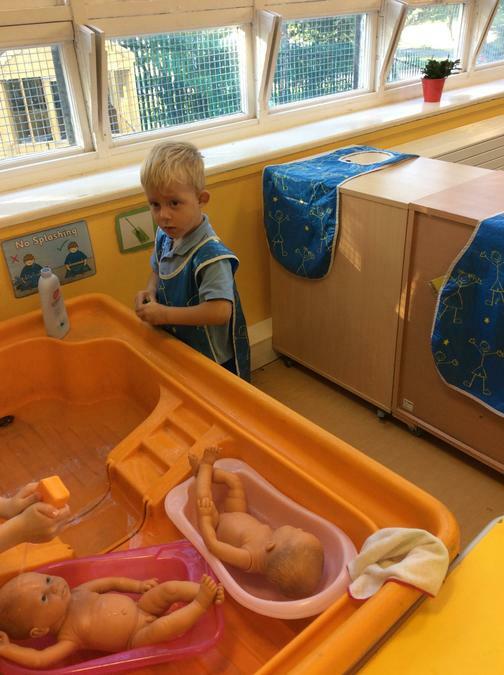 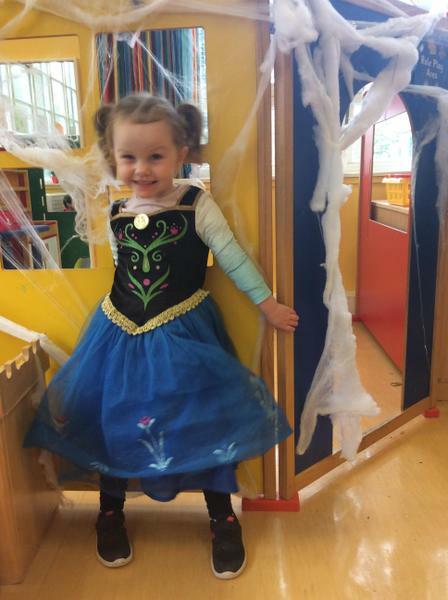 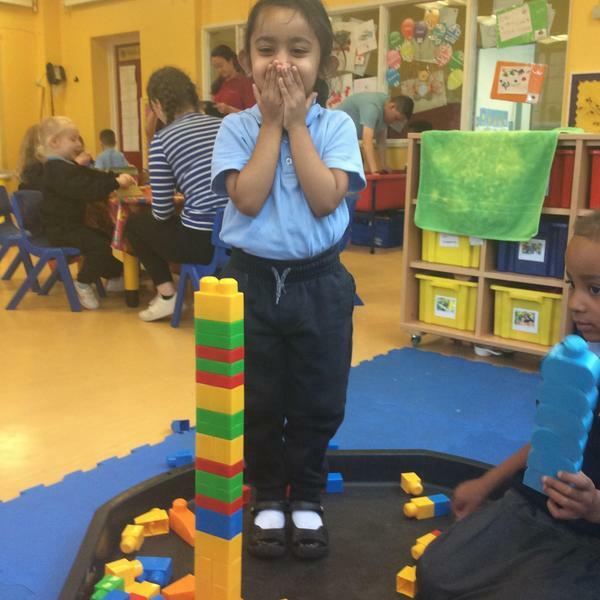 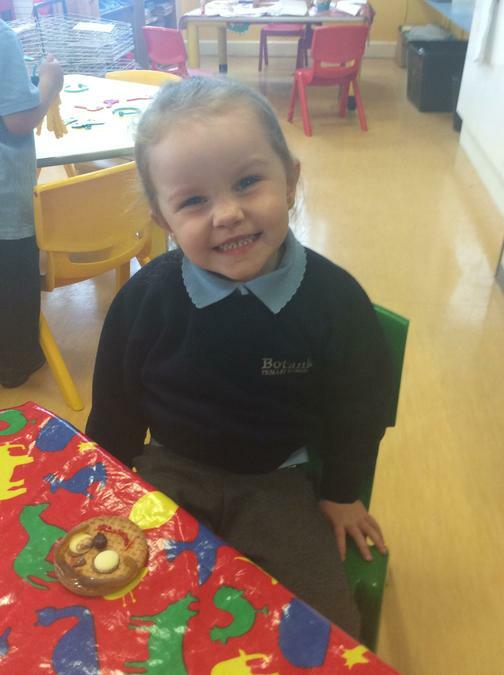 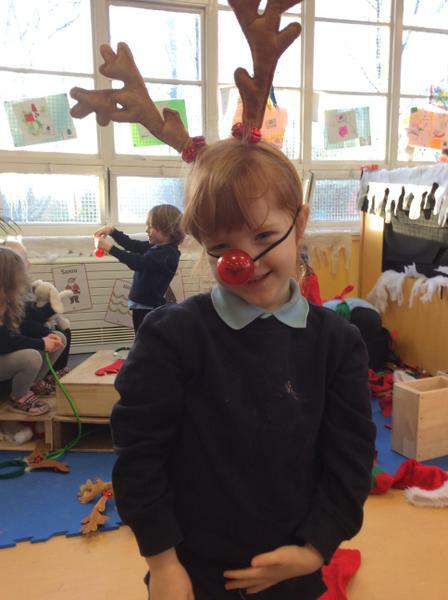 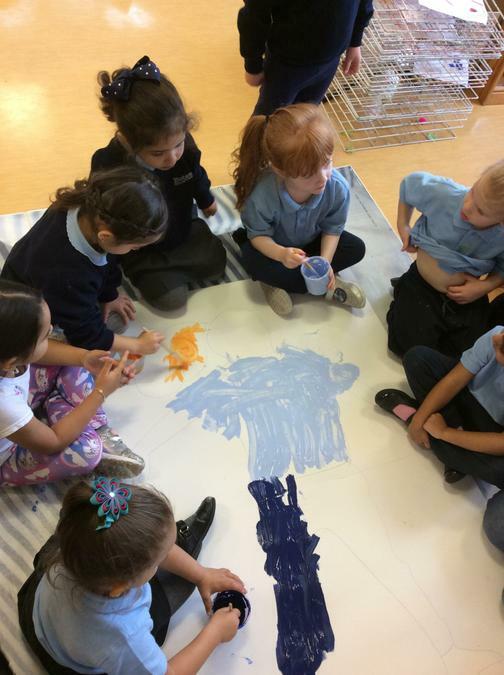 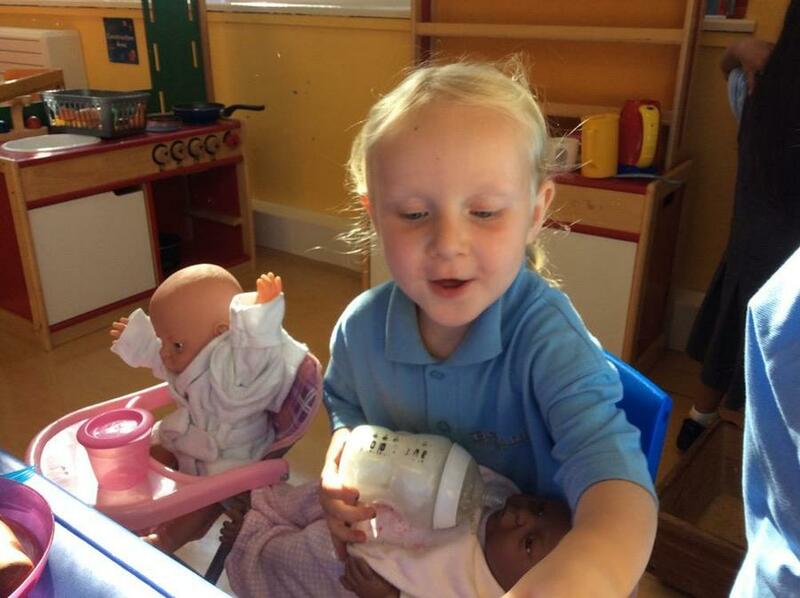 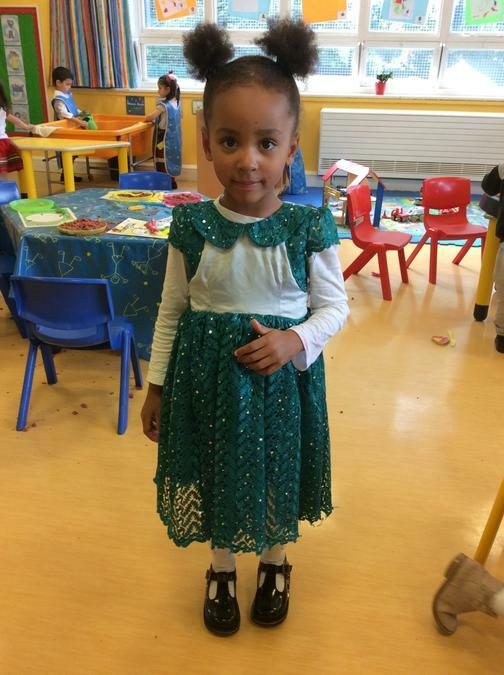 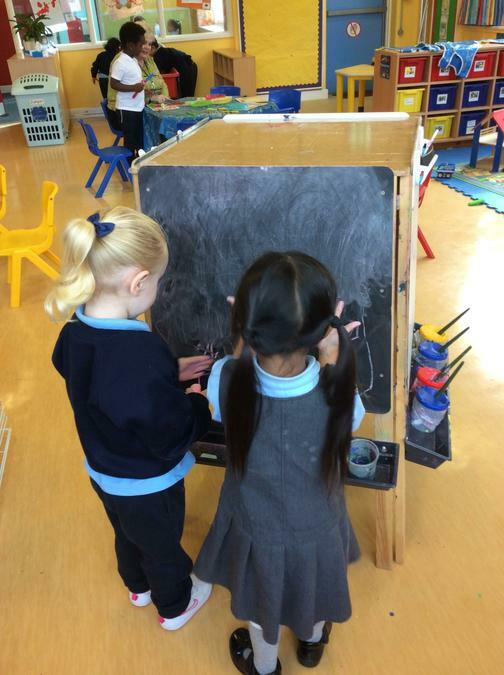 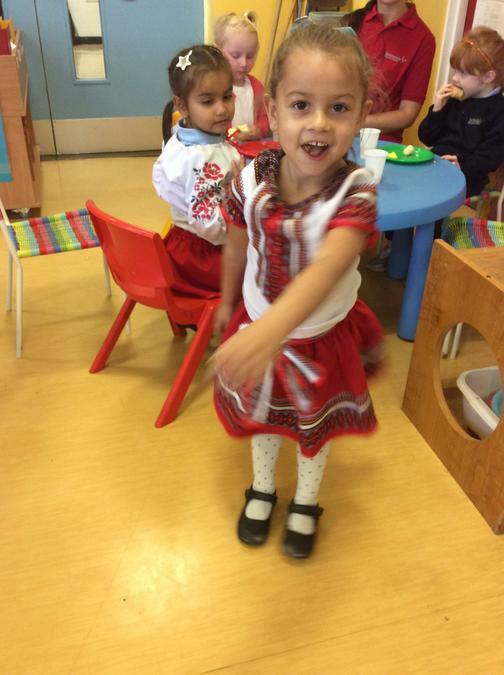 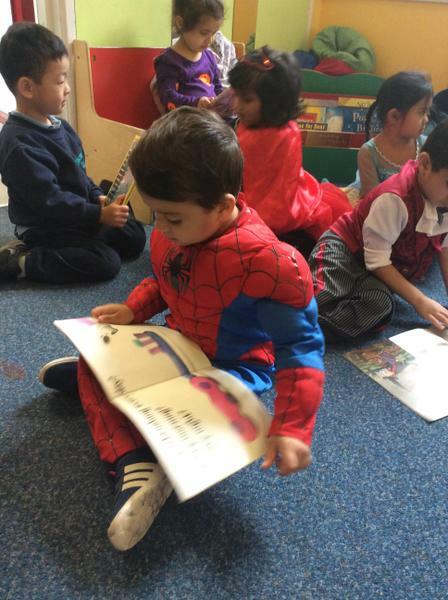 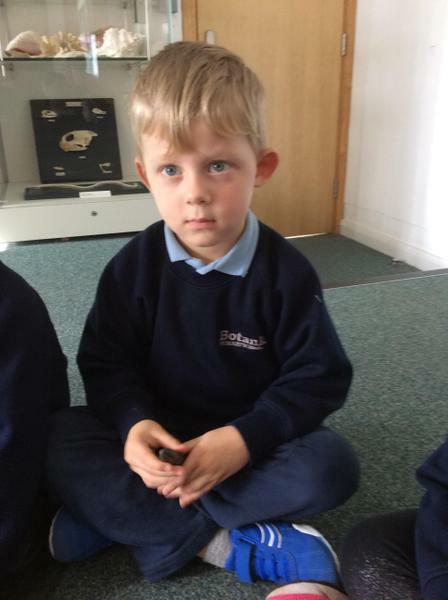 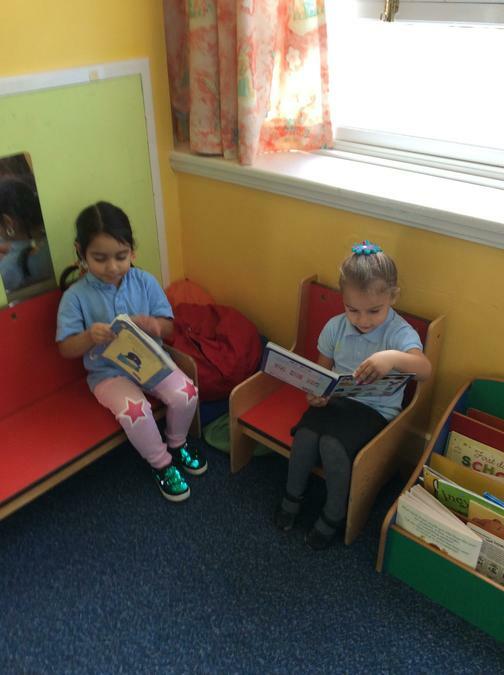 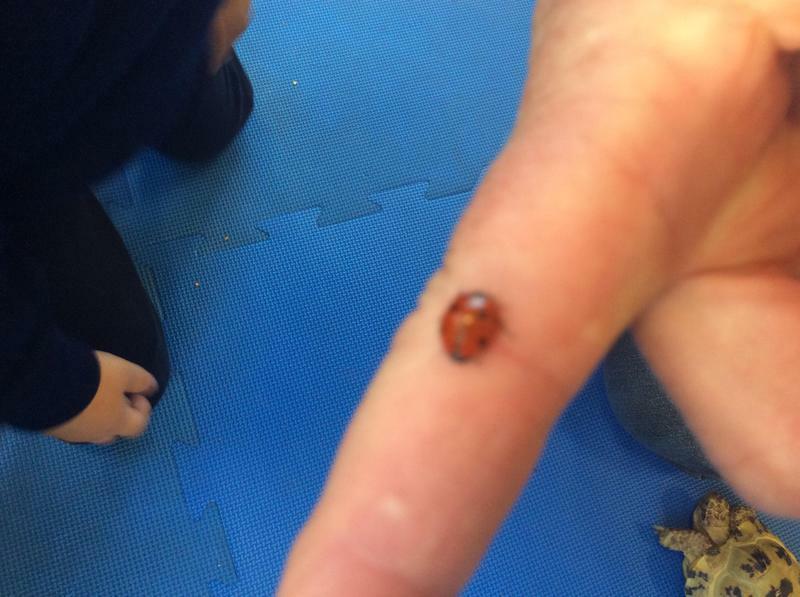 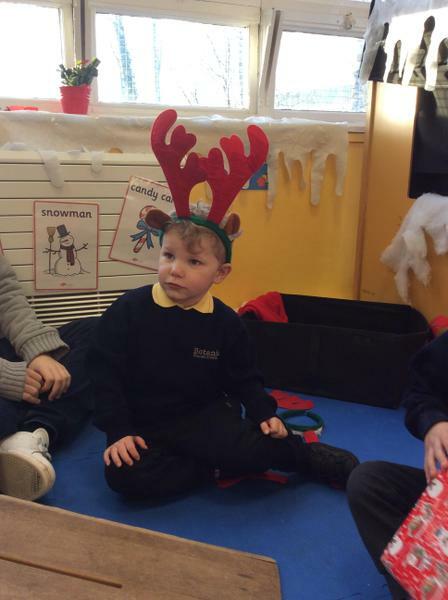 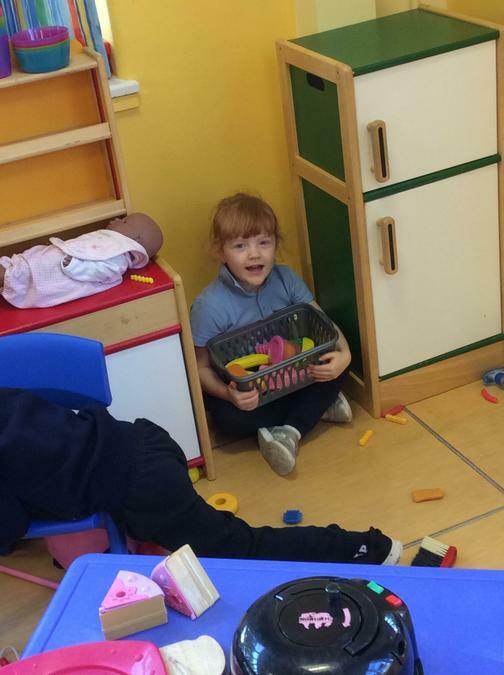 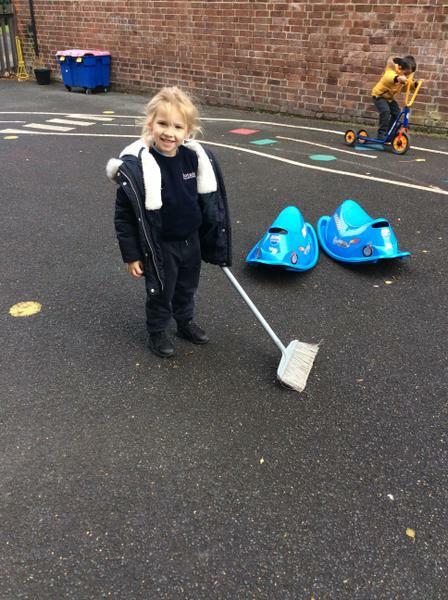 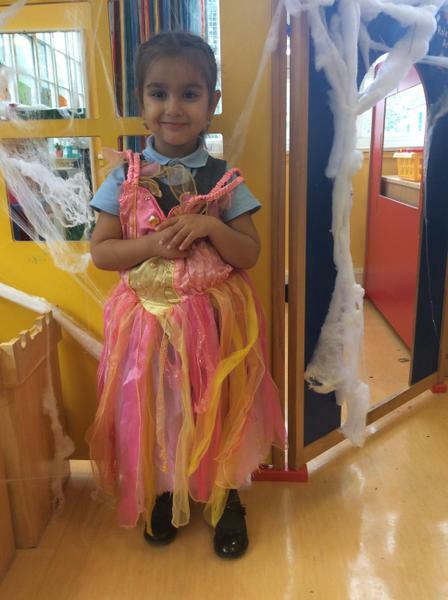 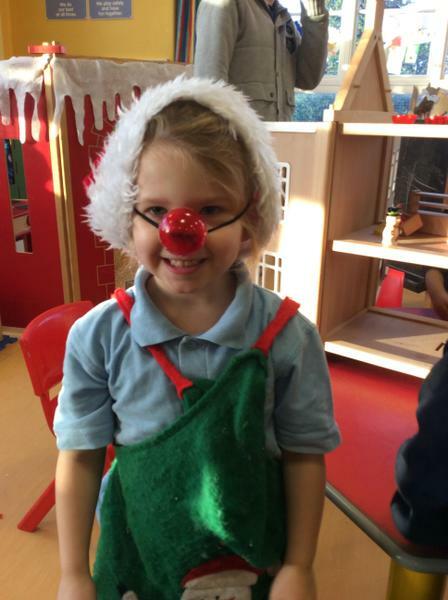 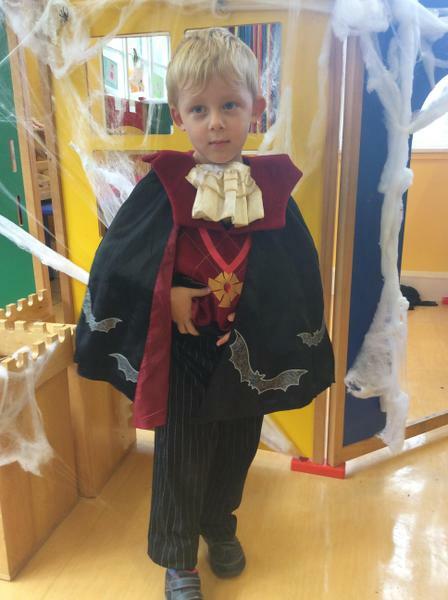 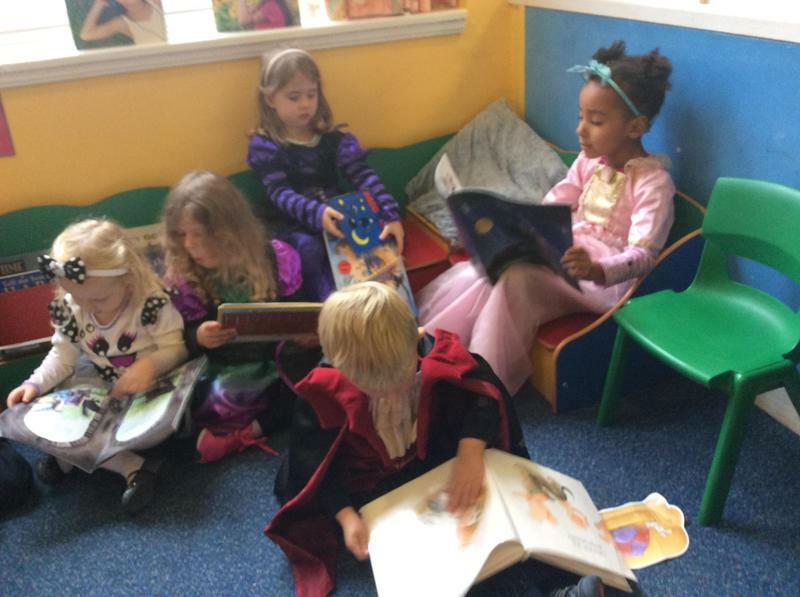 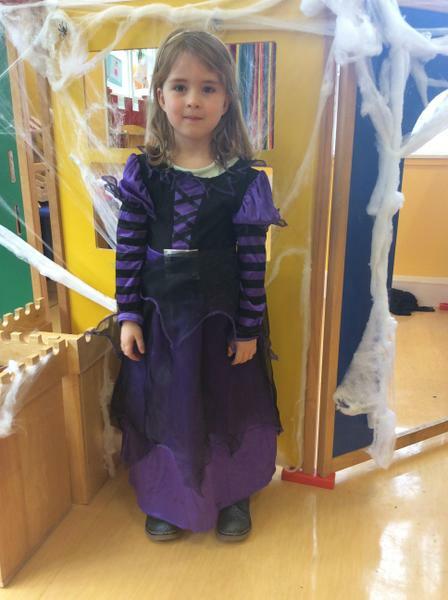 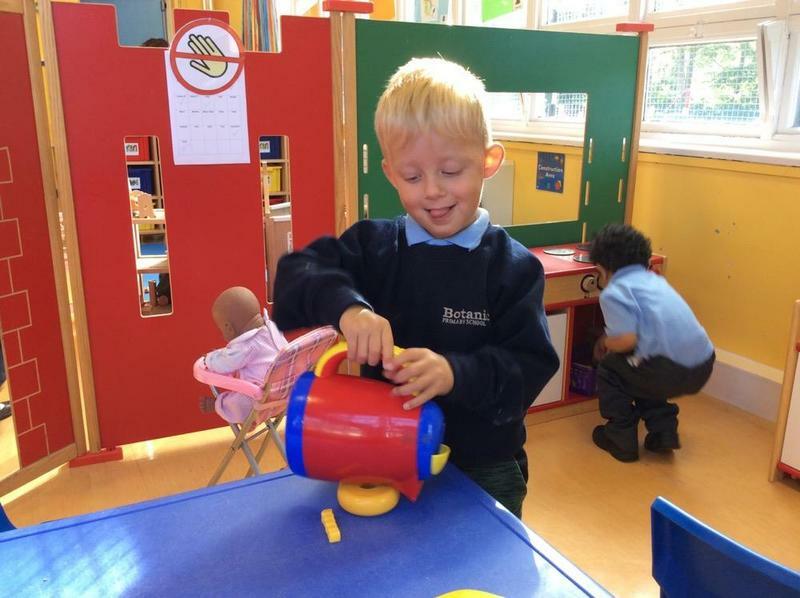 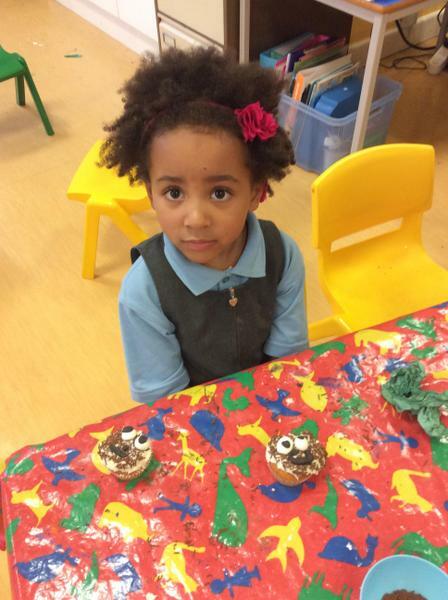 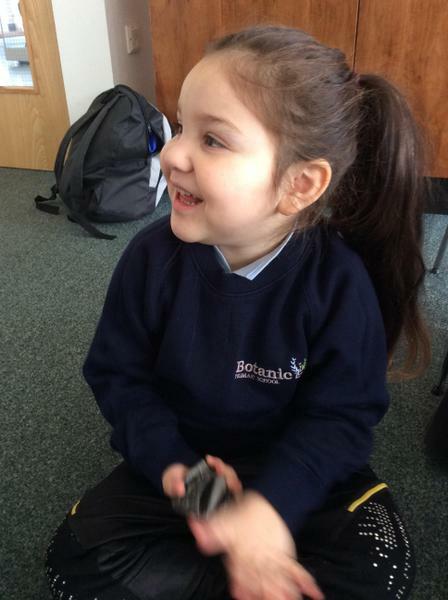 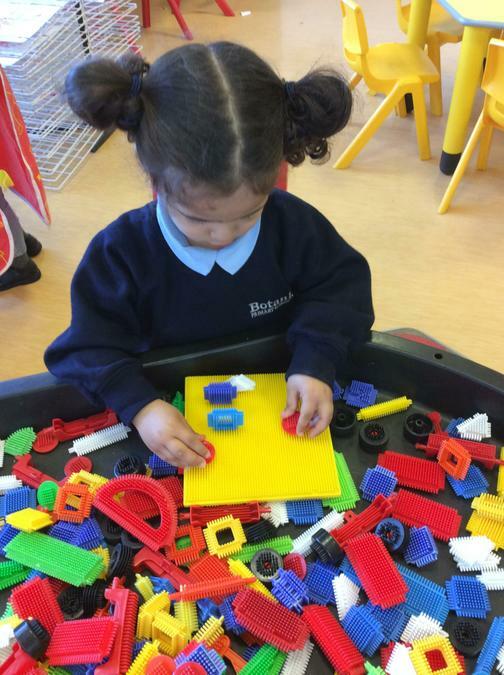 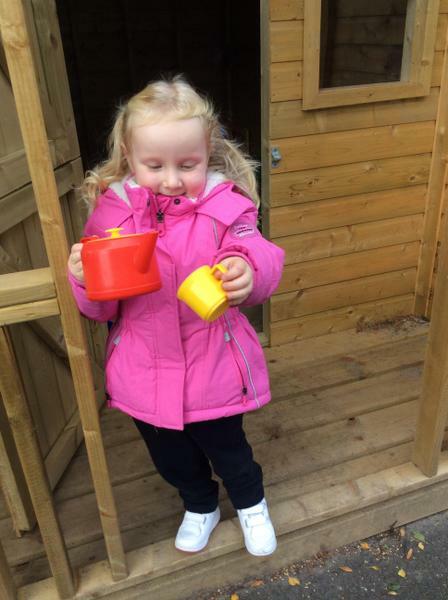 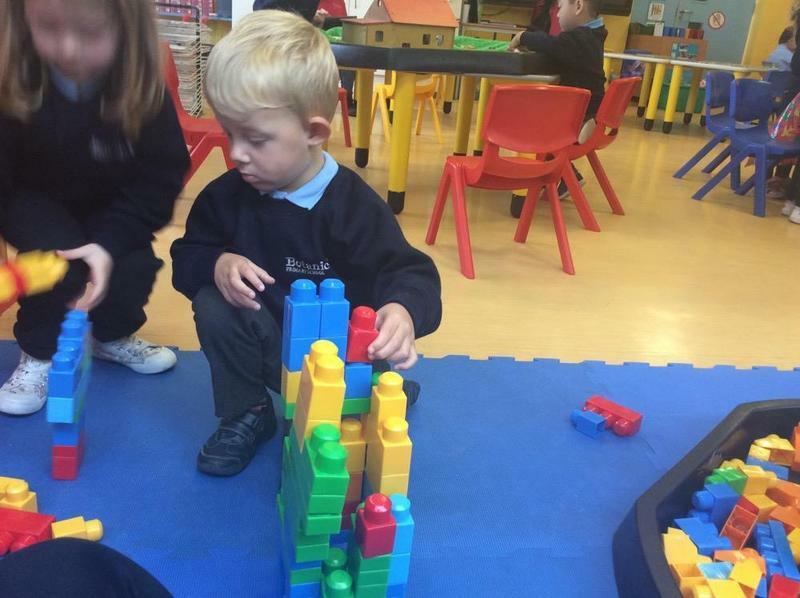 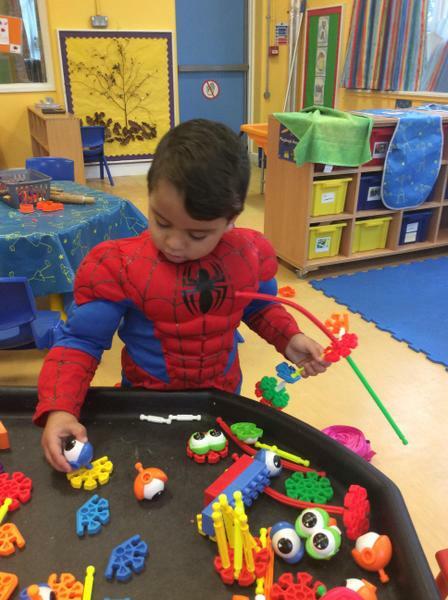 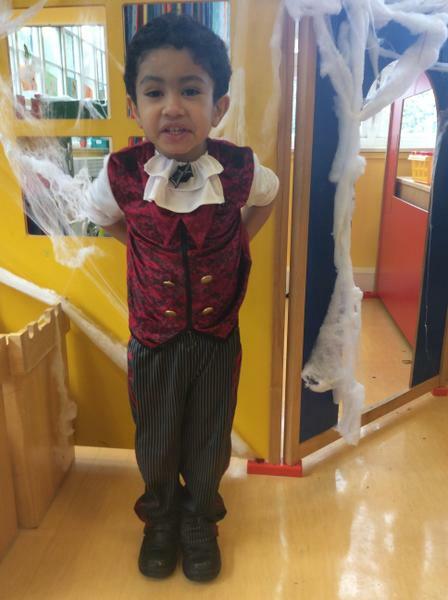 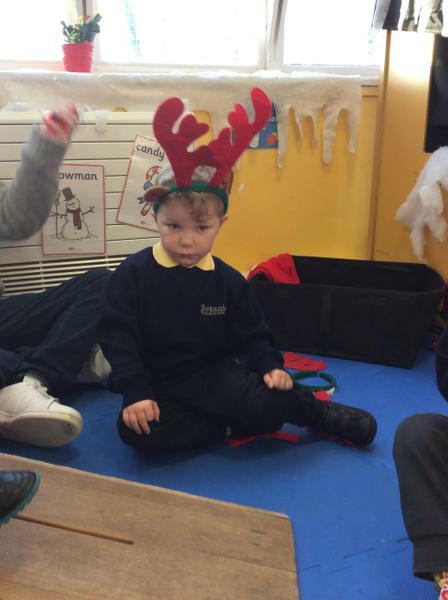 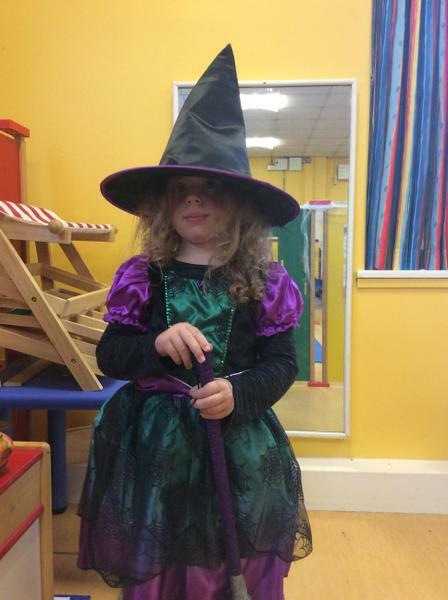 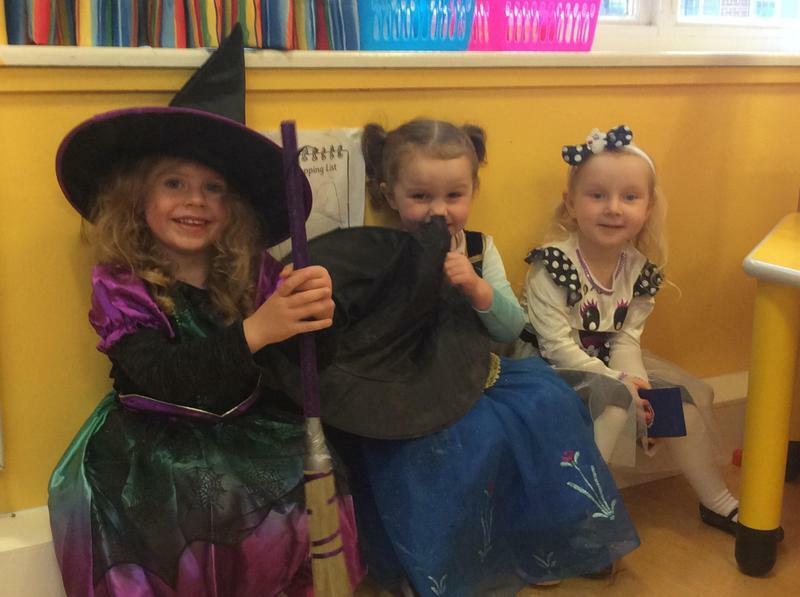 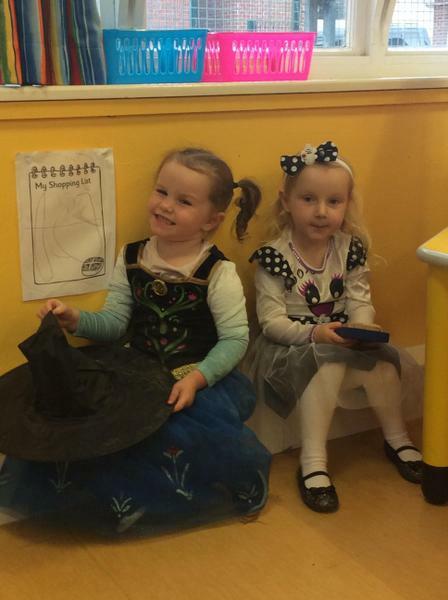 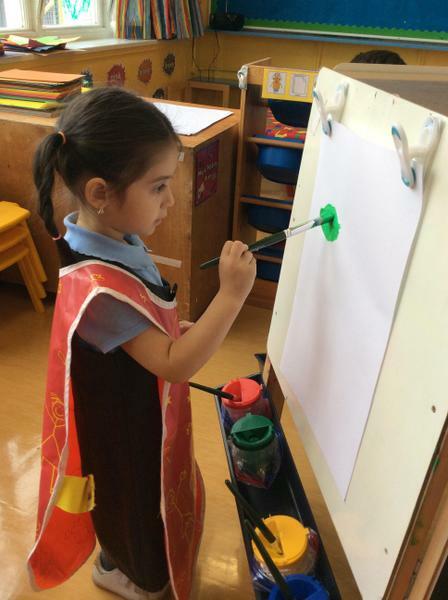 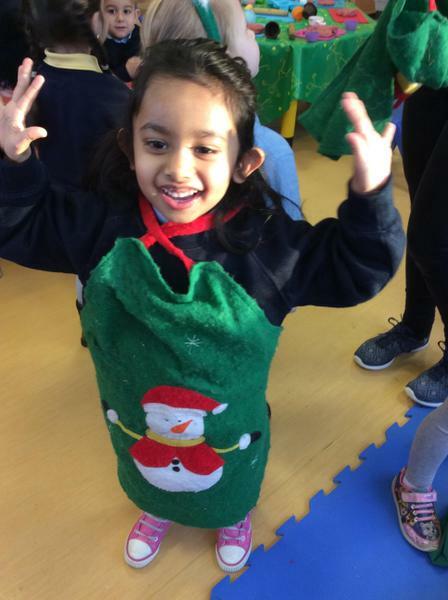 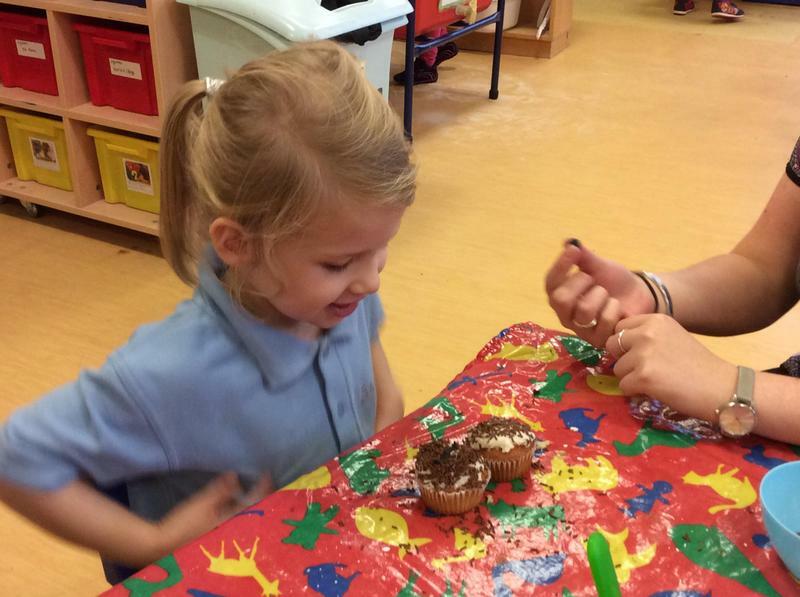 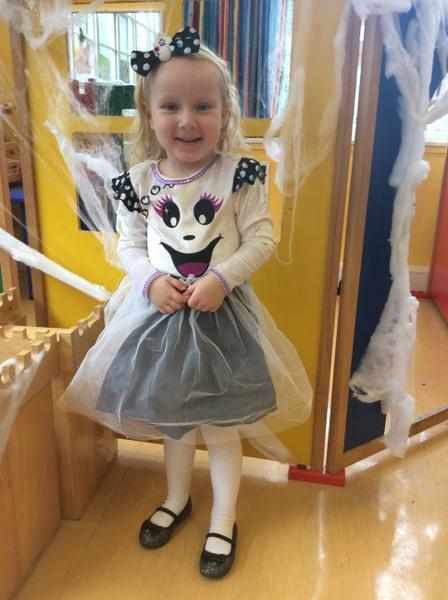 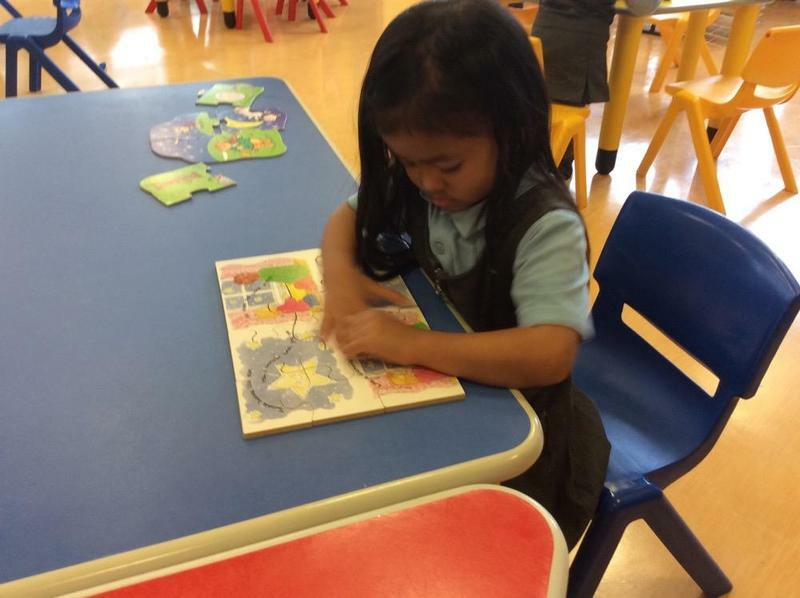 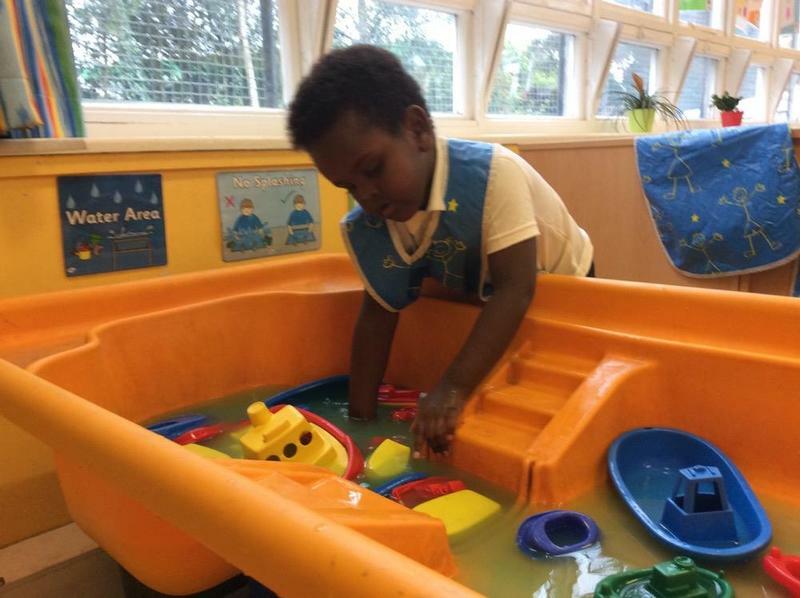 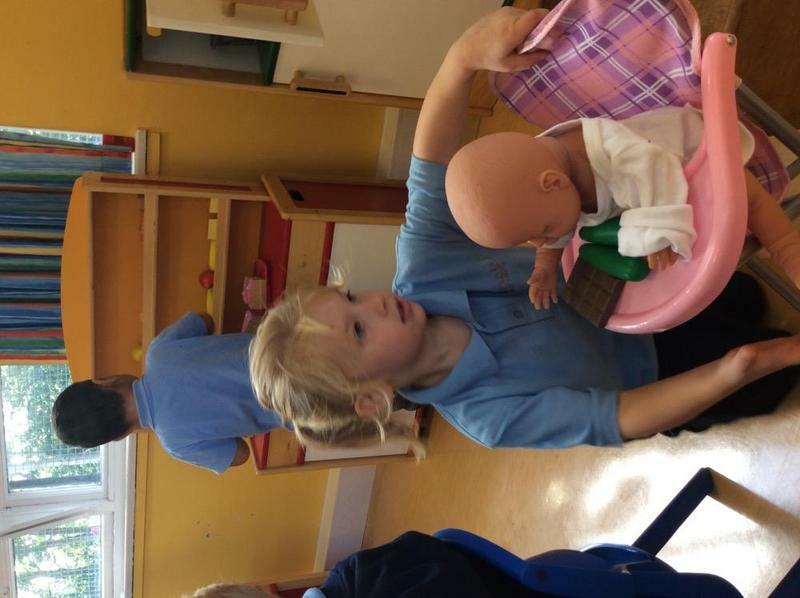 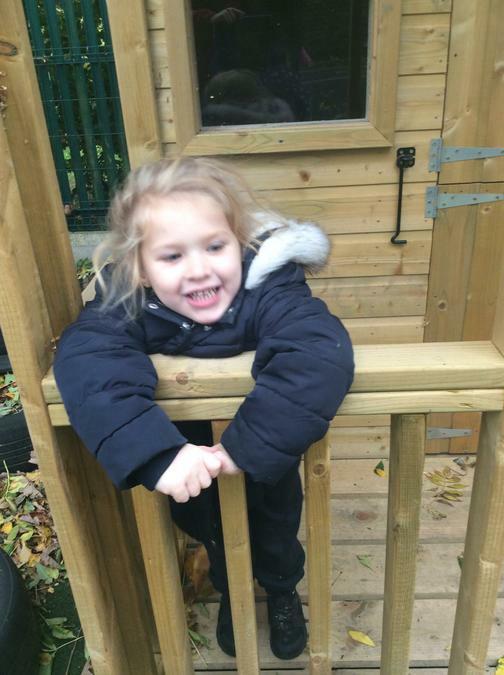 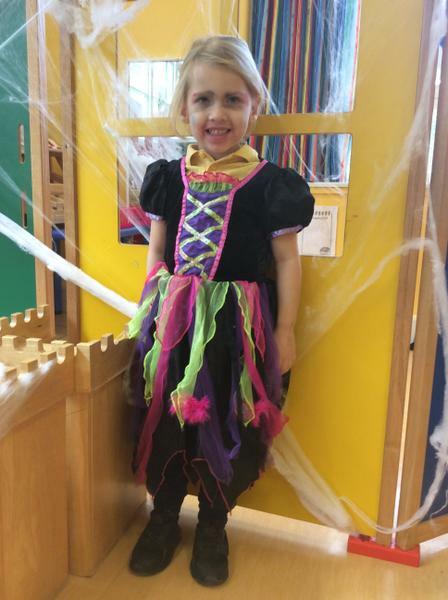 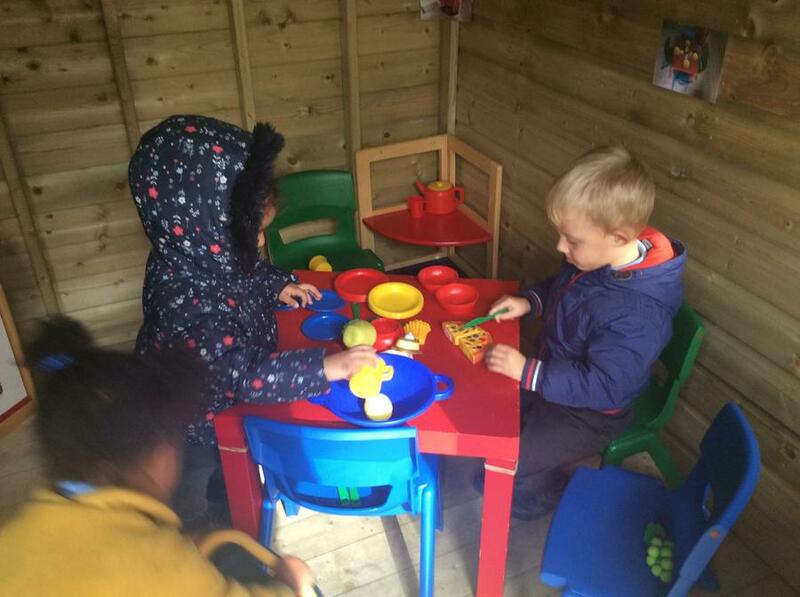 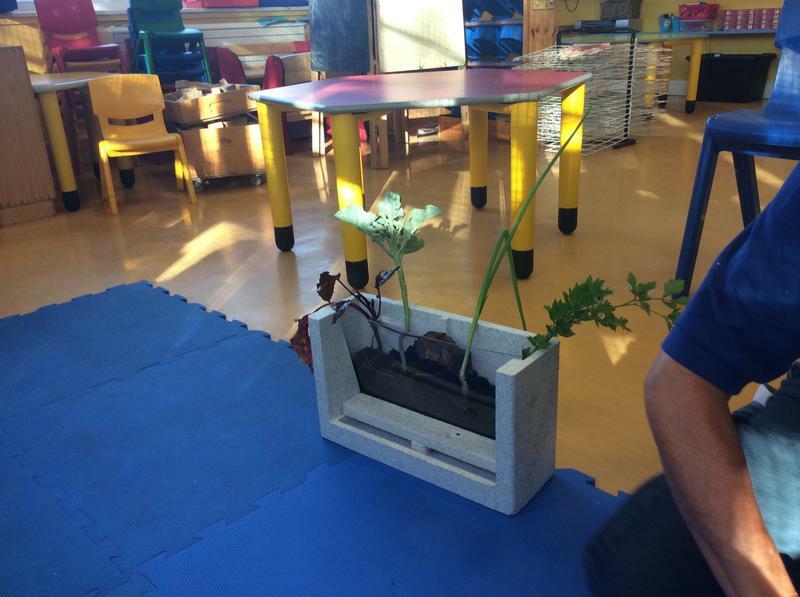 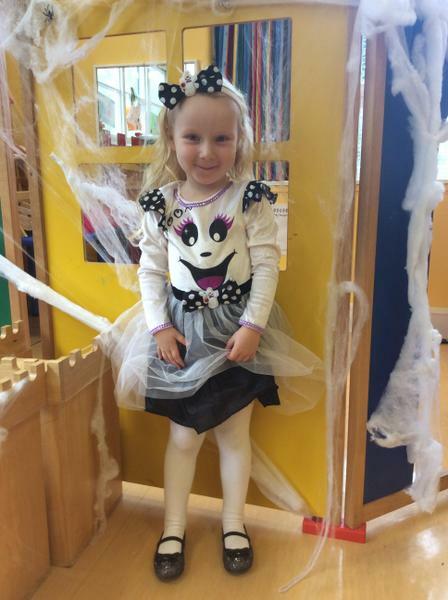 Here is a sneaky peak into nursery life!